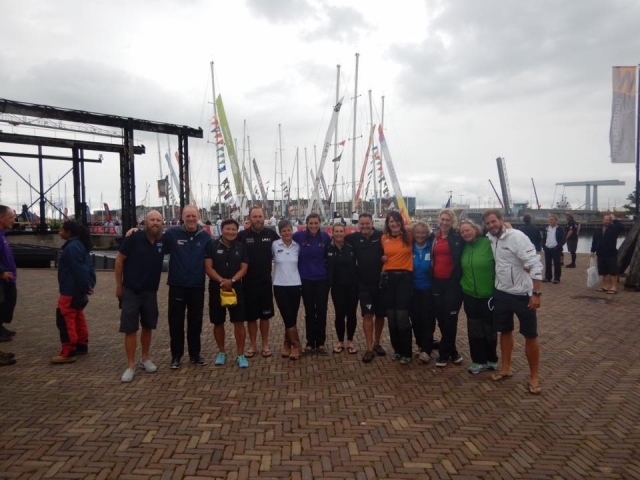 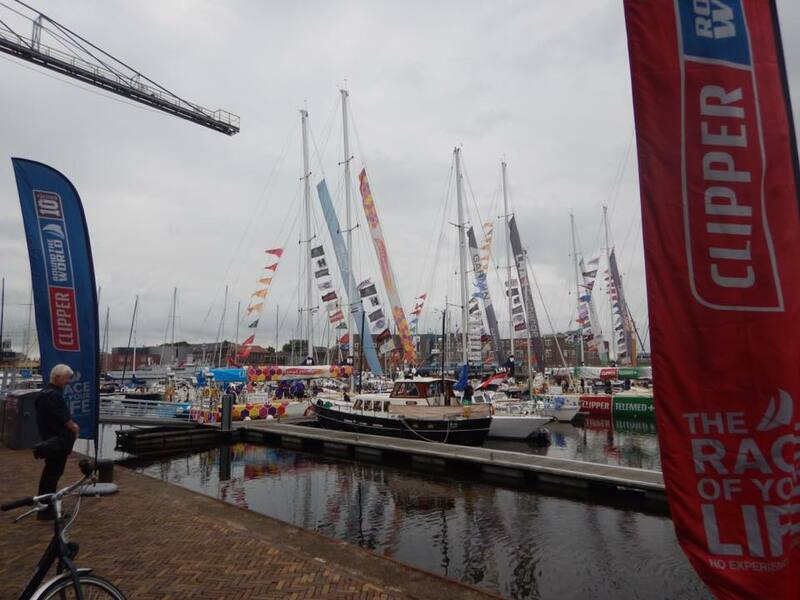 We left a sunny Den Helder with 6 points between us and LMax who were in the overall lead. There was lots of speculation as to whether we could pull back the points needed to catch them or not. 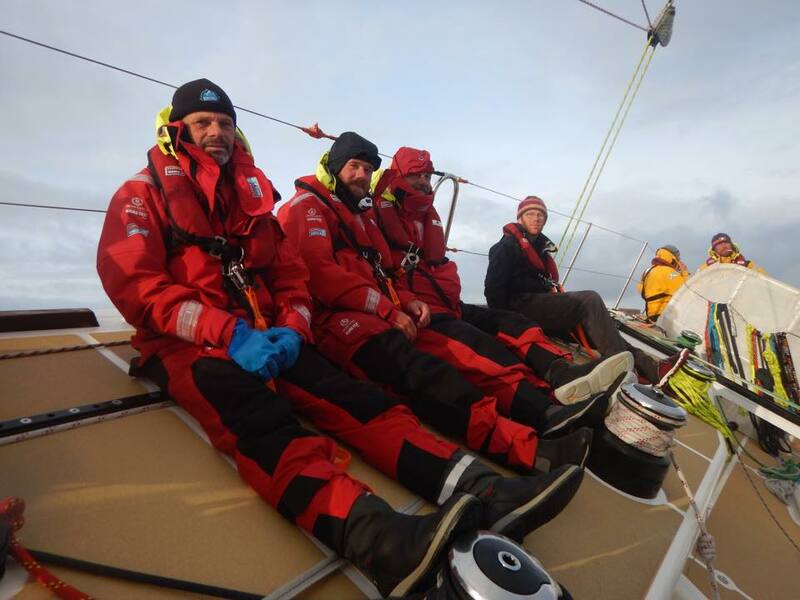 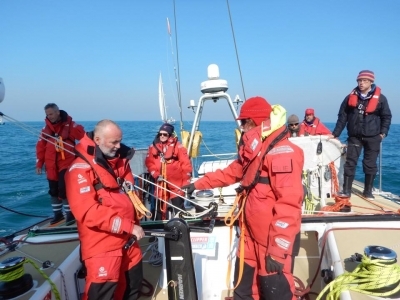 As a team we had decided to push hard for this one last race – it was only 200 odd miles so a new watch system was created to ensure maximum performance (and not much sleep!) . 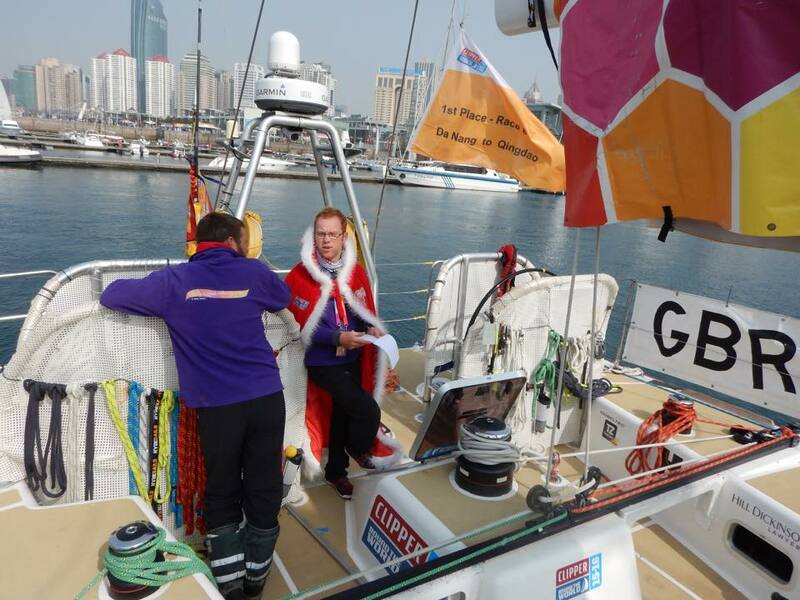 We were also 13 points in front of Great Britain which meant that whatever we did they couldn’t catch us so going all out was all we could do. 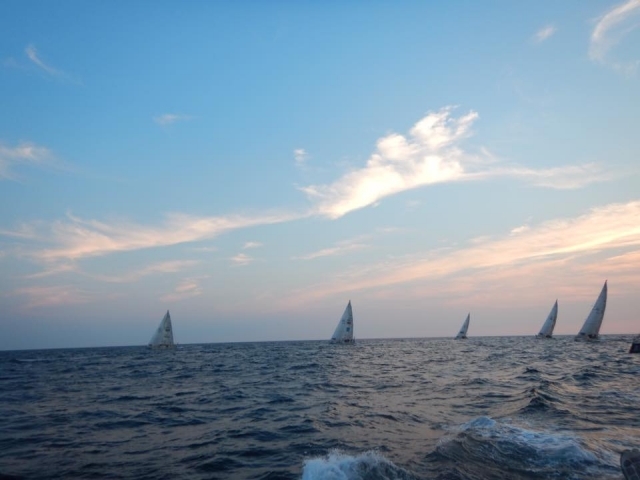 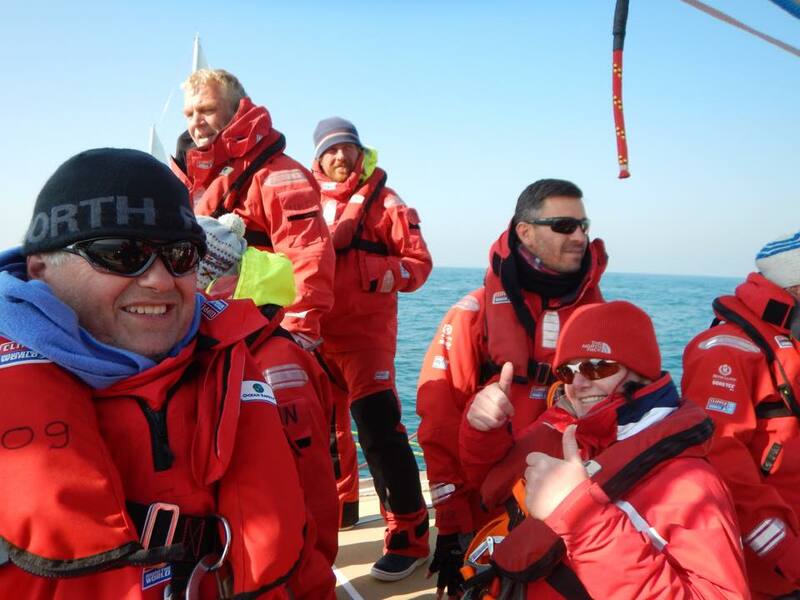 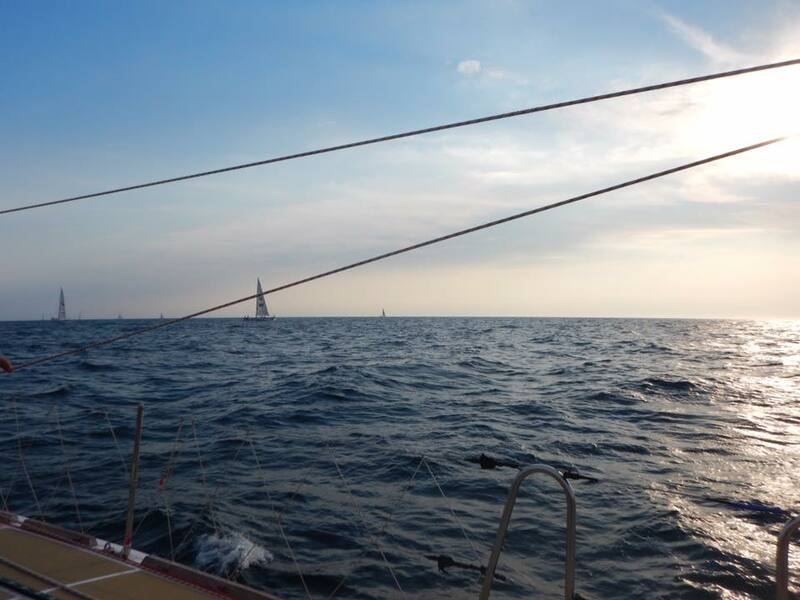 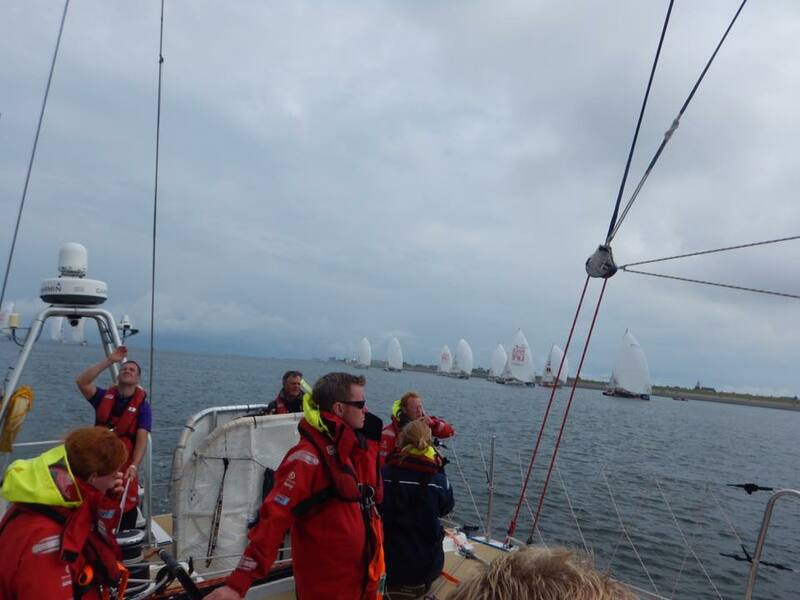 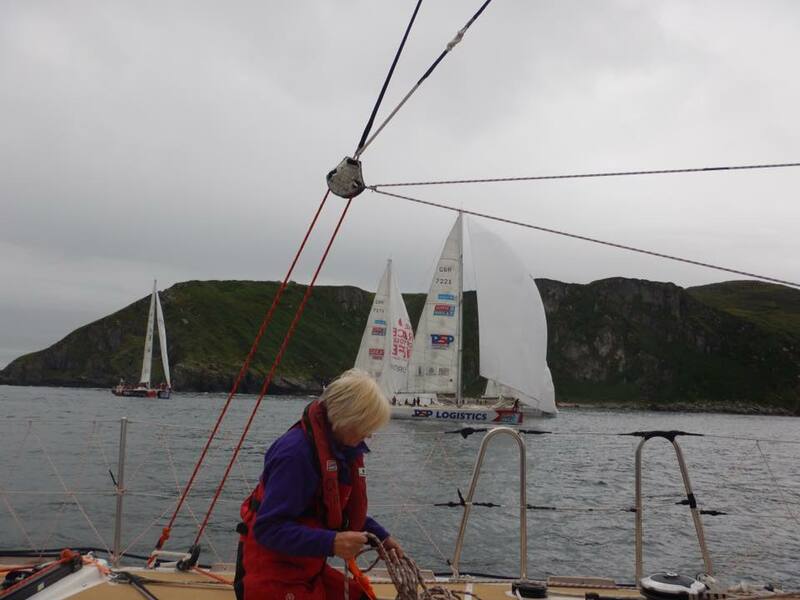 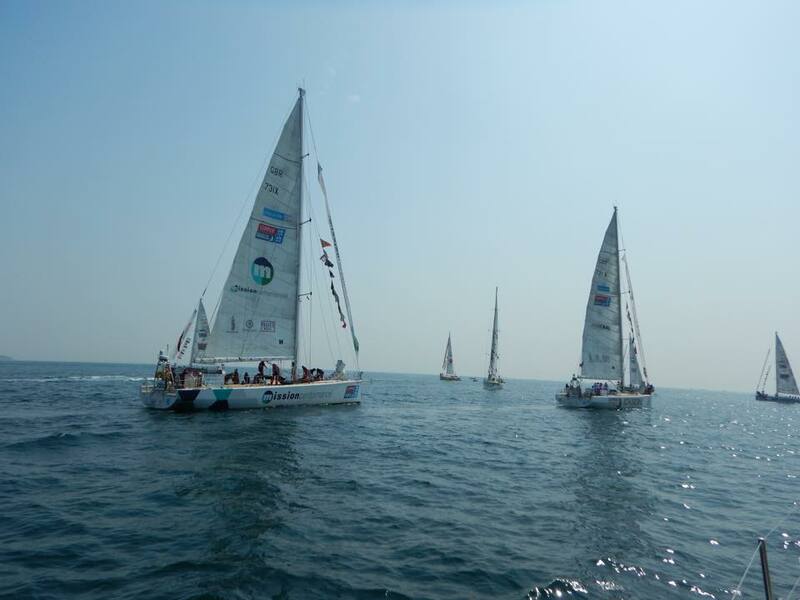 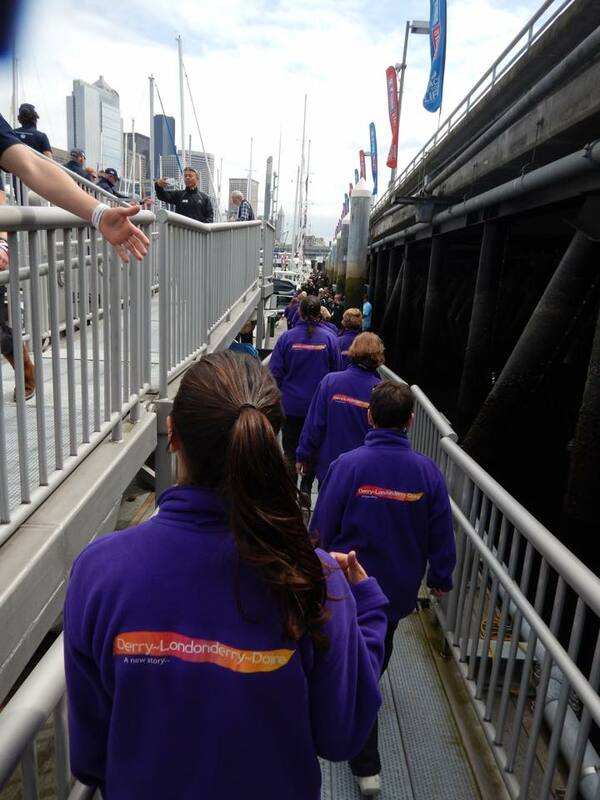 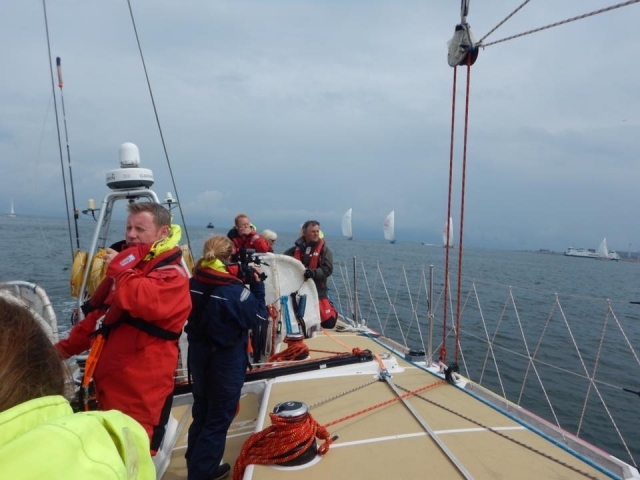 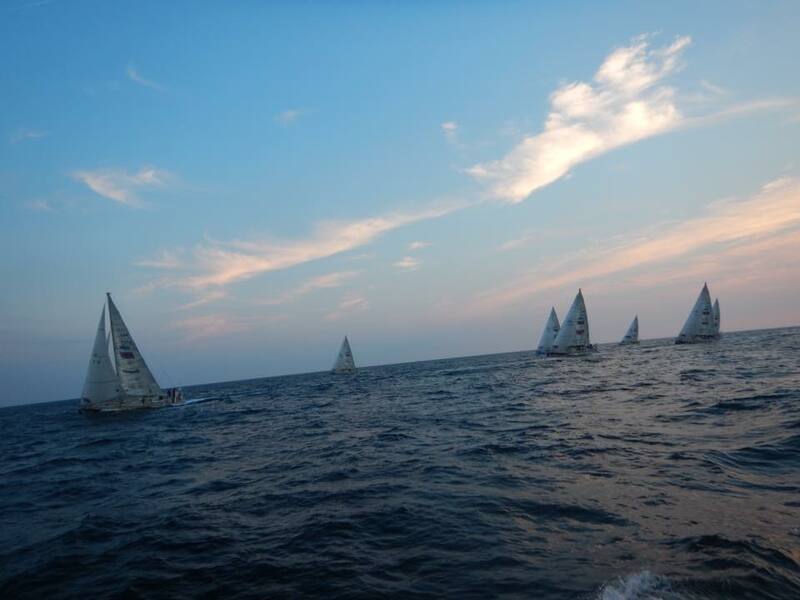 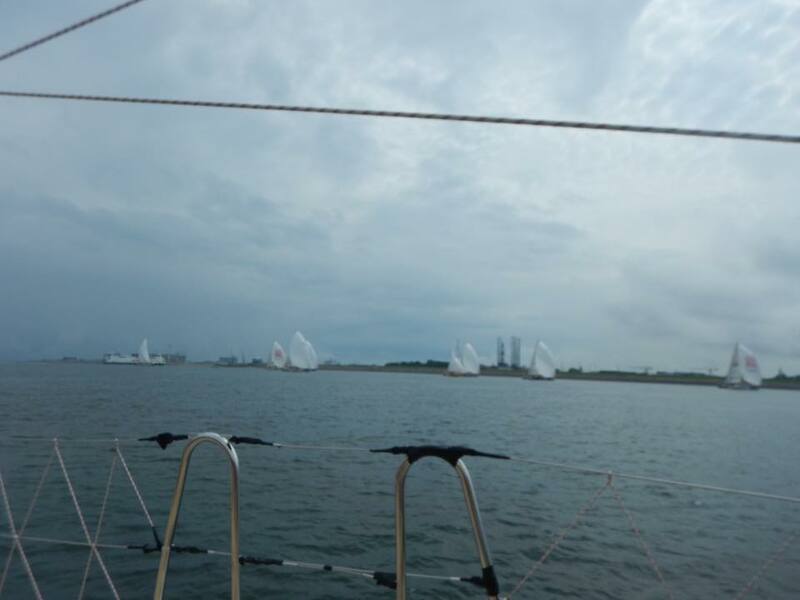 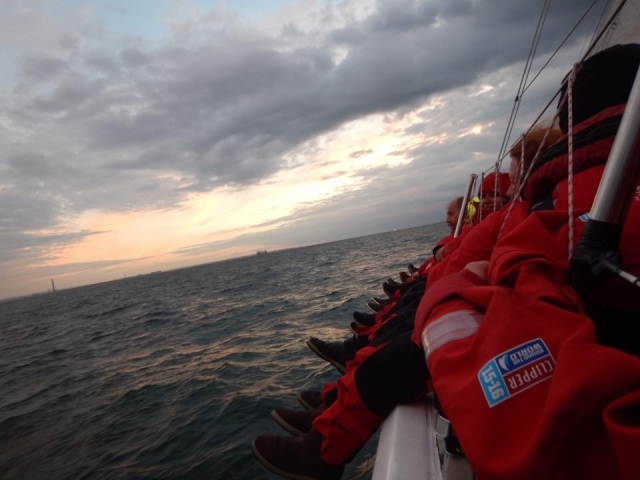 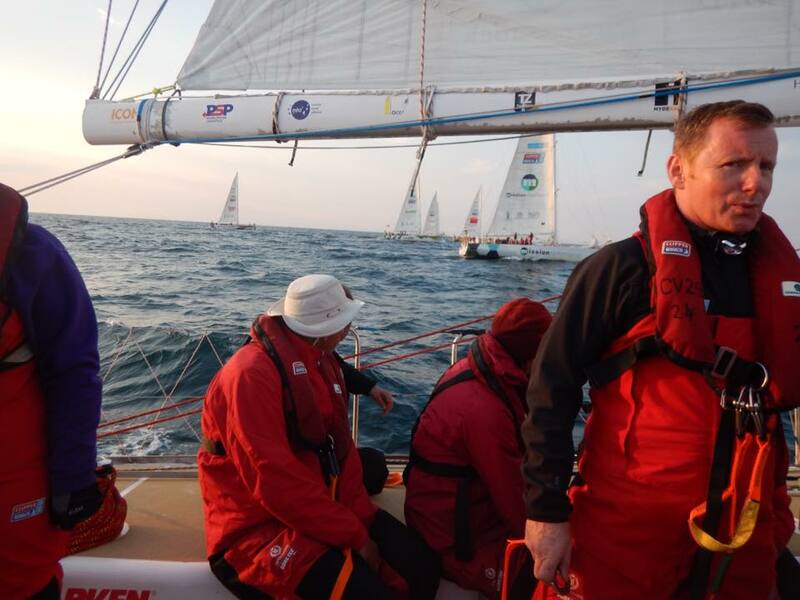 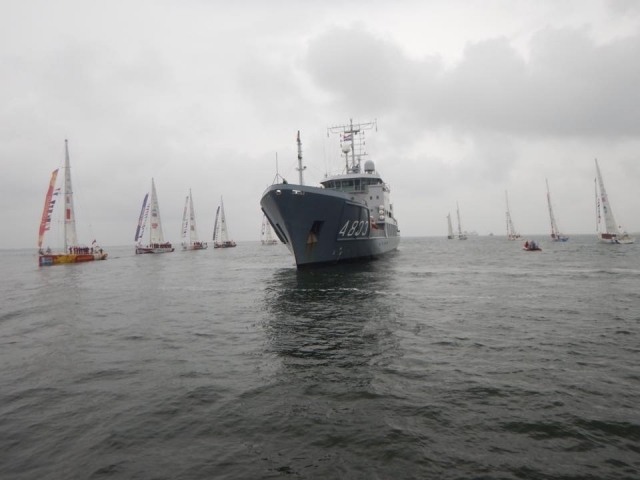 The race started and we had a great line across the start and led the fleet out into the North Sea. 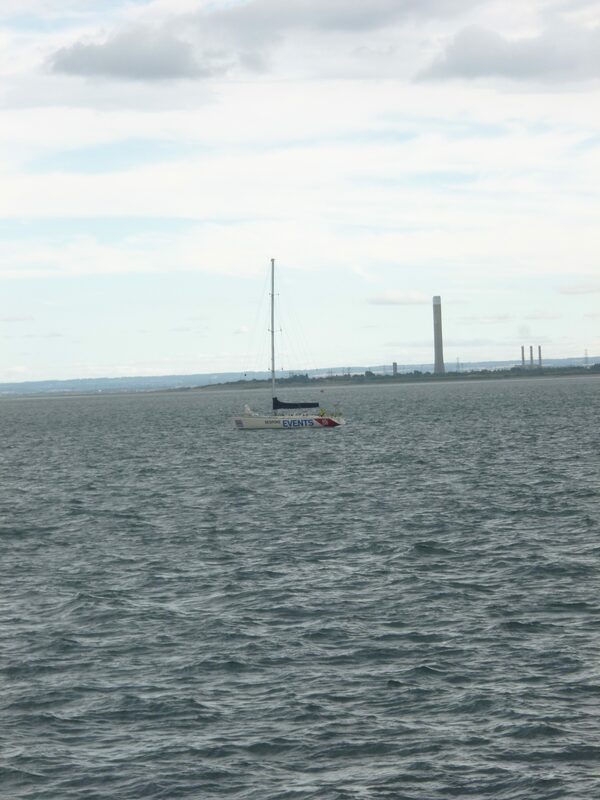 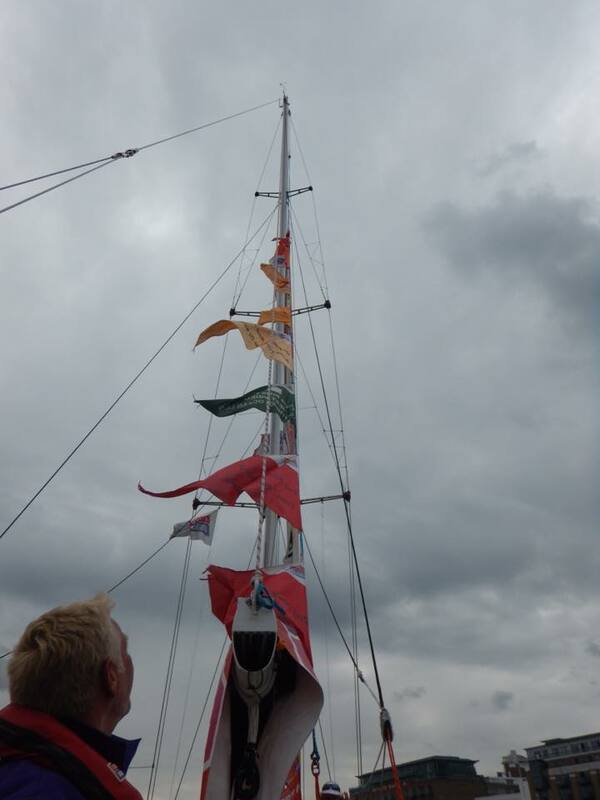 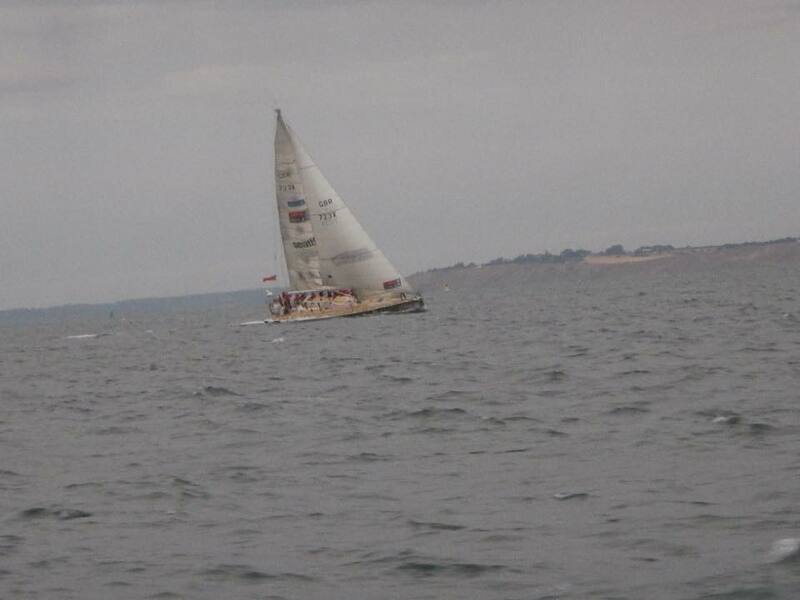 We were going well with spinnaker up when it was suggested we’d gone the wrong side of a marker buoy. 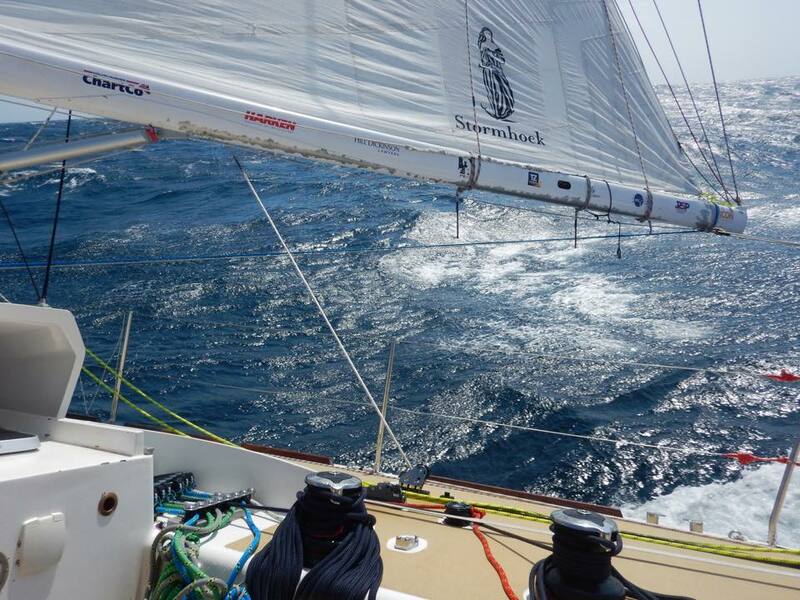 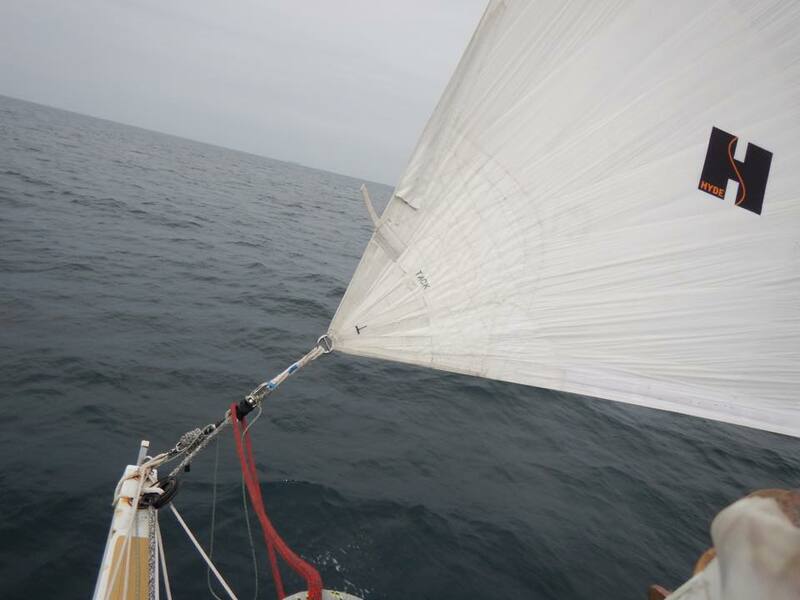 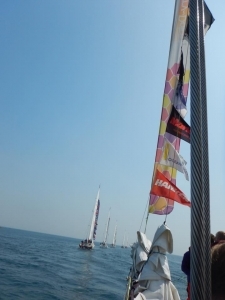 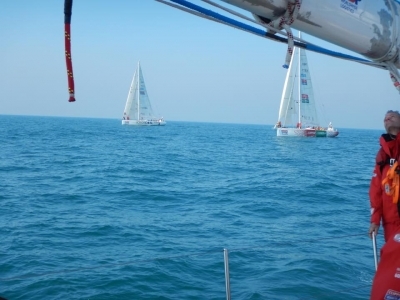 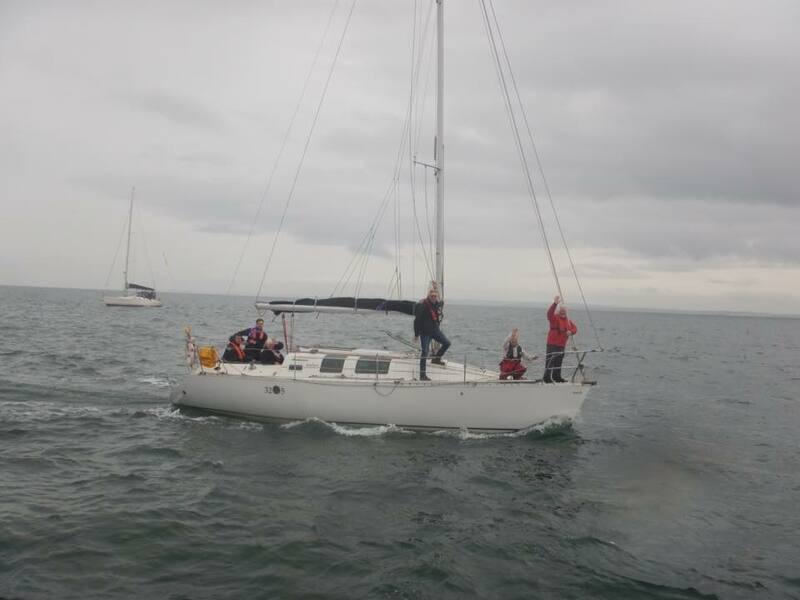 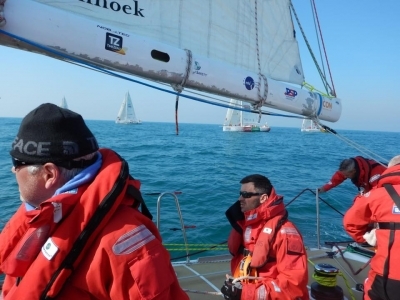 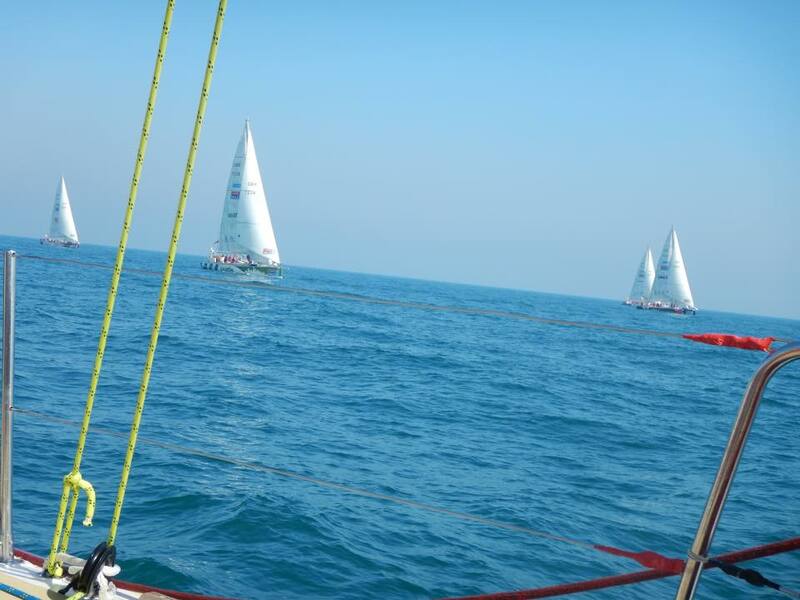 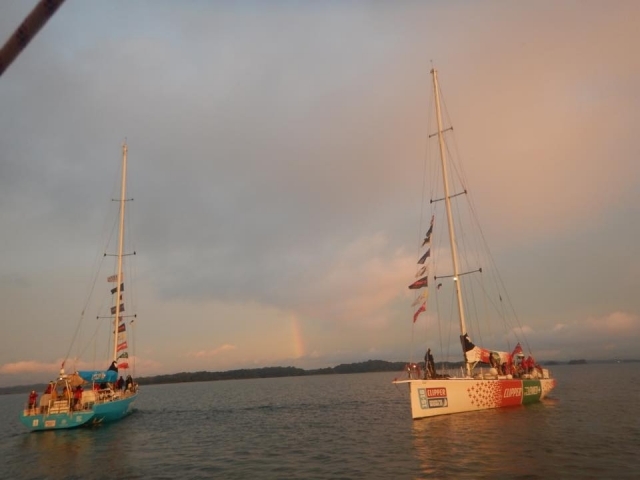 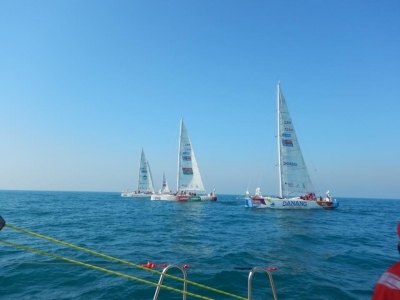 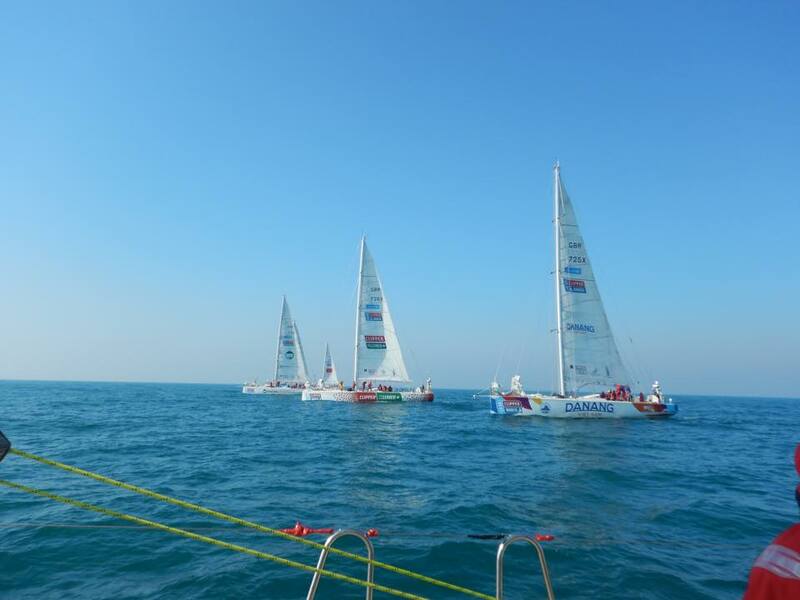 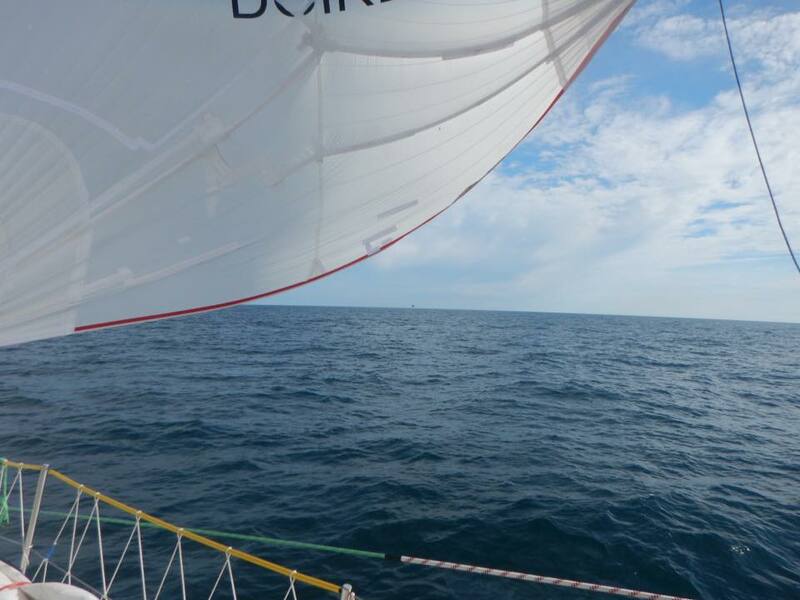 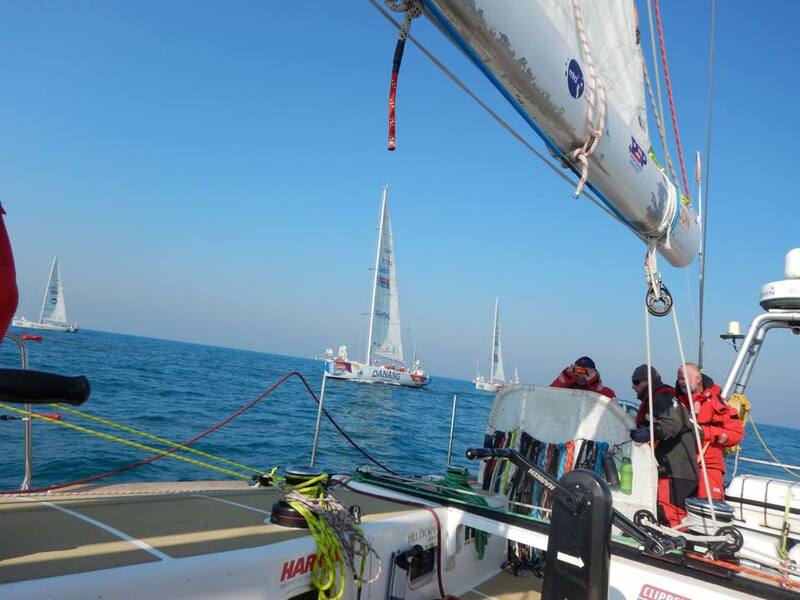 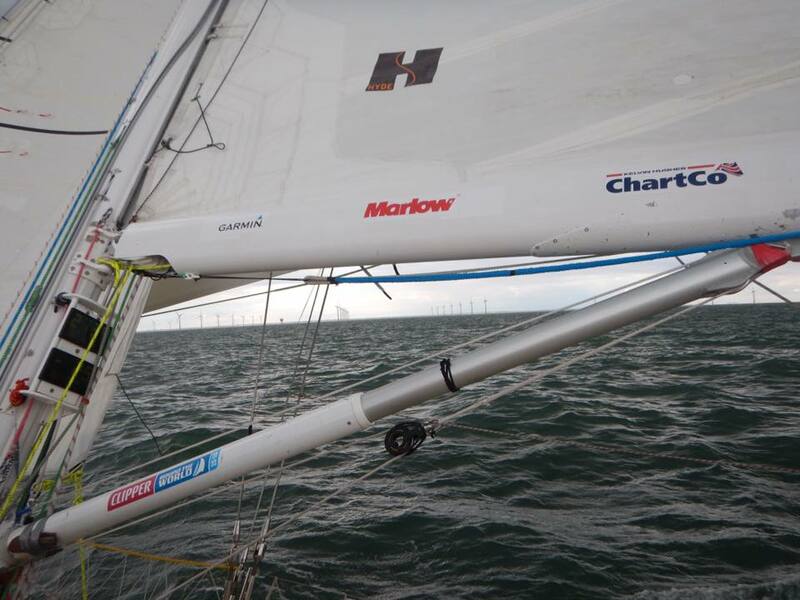 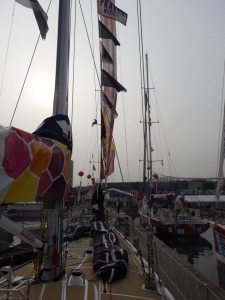 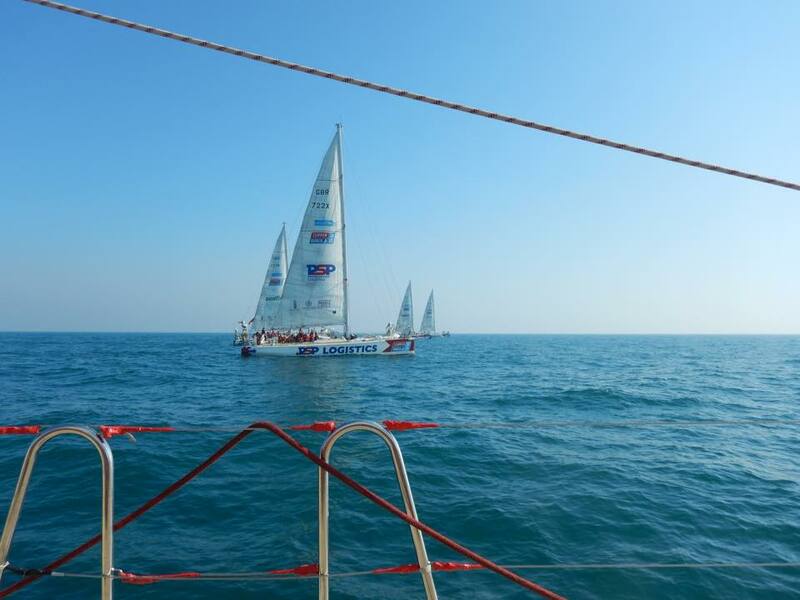 This meant we got the spinnaker down, turned round to re-cross the marker which took us from 1st to 12th. We later found out there had been a confusion and in fact we didn’t need to pass the mark so had been right all along! 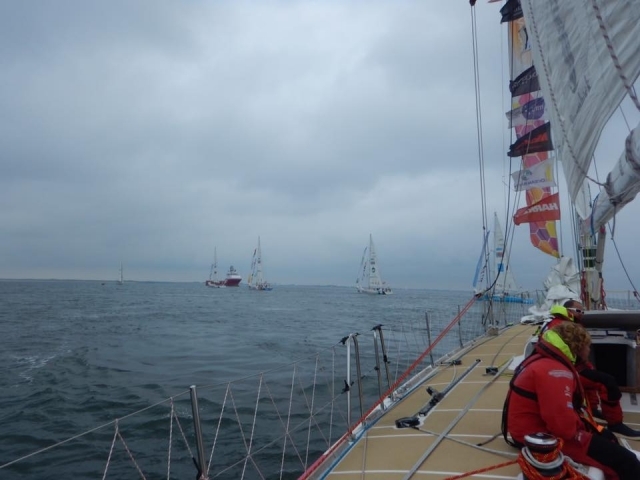 I was filled with dread as I could see all the fleet was ahead and that this was game over. 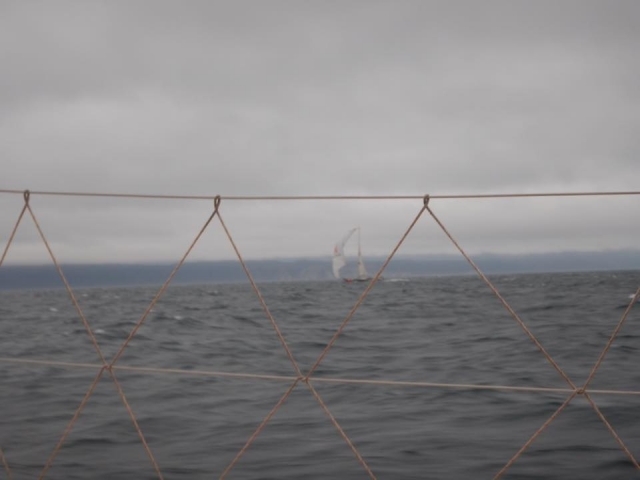 However we began to overtake other yachts and weave our way through the tacking fleet to regain the lead. 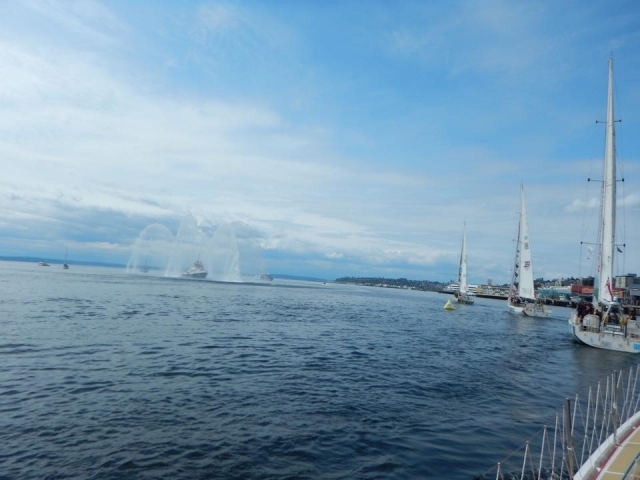 This was probably the most intense race ever. 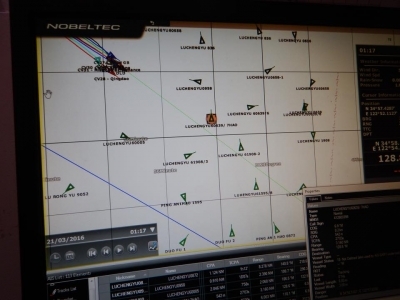 With the short distance it meant the fleet never really spread out that much so we could nearly always see those near to us on AIS if not visually too. 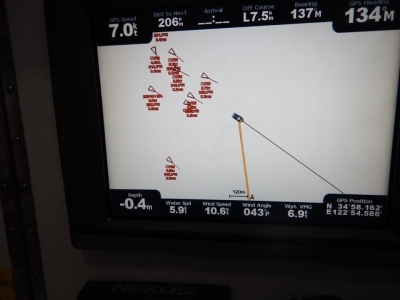 This meant that we were doing as much as we could to keep the boat going fast. We even slept on the floor of the high side to make us go faster along with extended periods sitting on the rail. The final few miles became very tense as Visit Seattle were hot on our heels. 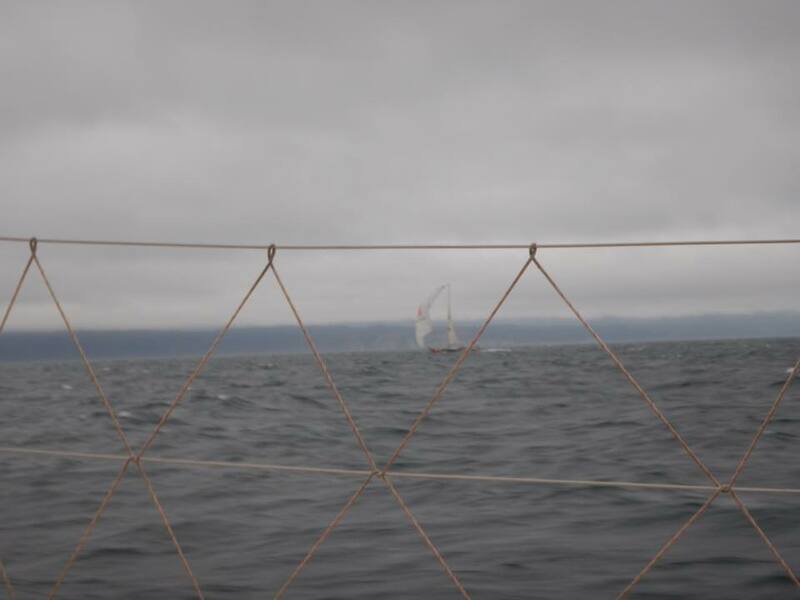 We were almost a silent crew all wanting to win the race but knowing it wasn’t in the bag for certain. 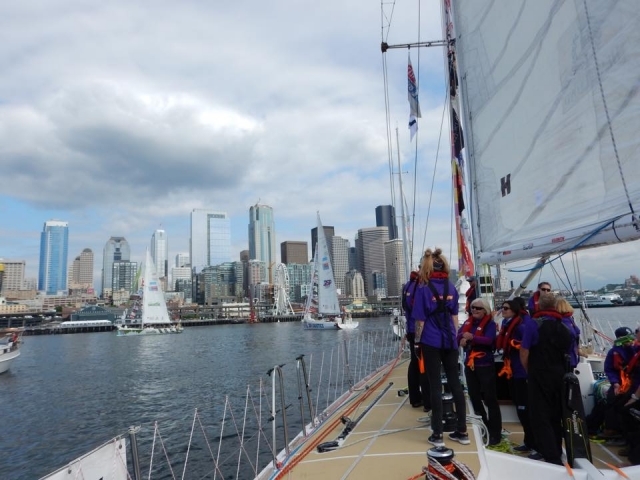 We could see the finish line and we could see the crew of Visit Seattle. 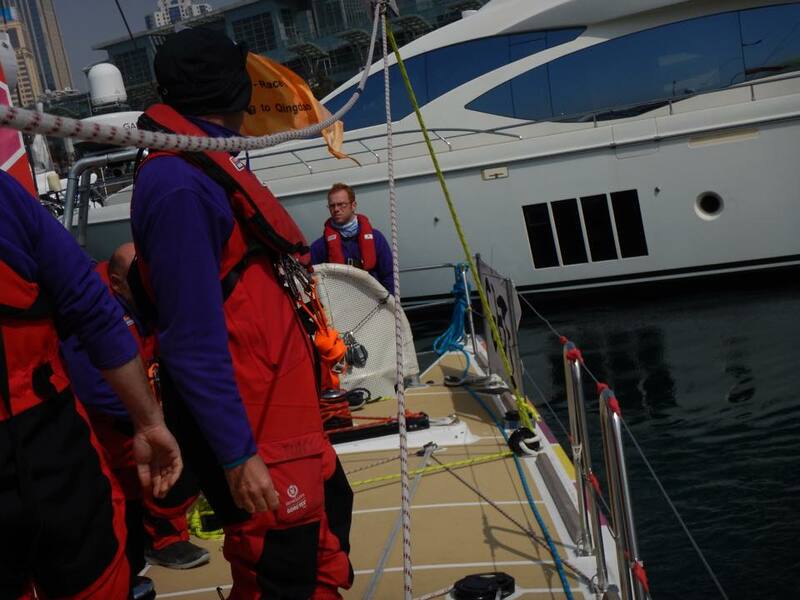 We were all willing us to make it to the line first and luckily all our efforts paid off as we crossed the one for Race 14 in first place, 29 seconds in front of the yacht in second! Suddenly our boat went from silent to ecstatic as we celebrated not only our win but making it back to Southend after the circumnavigation. 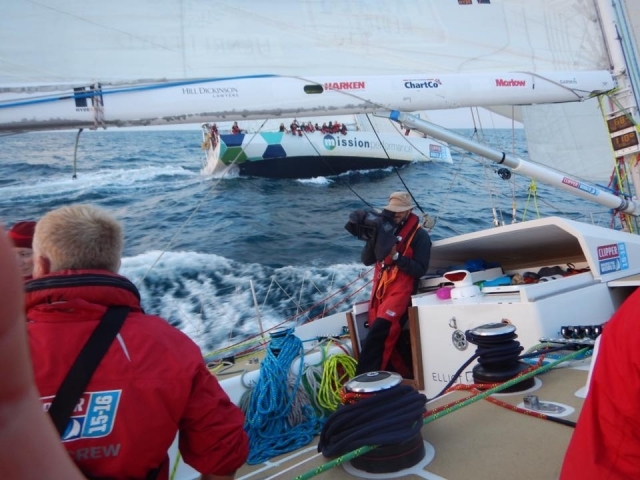 As LMax crossed the line third it meant that they ended up 4 points ahead of us overall. 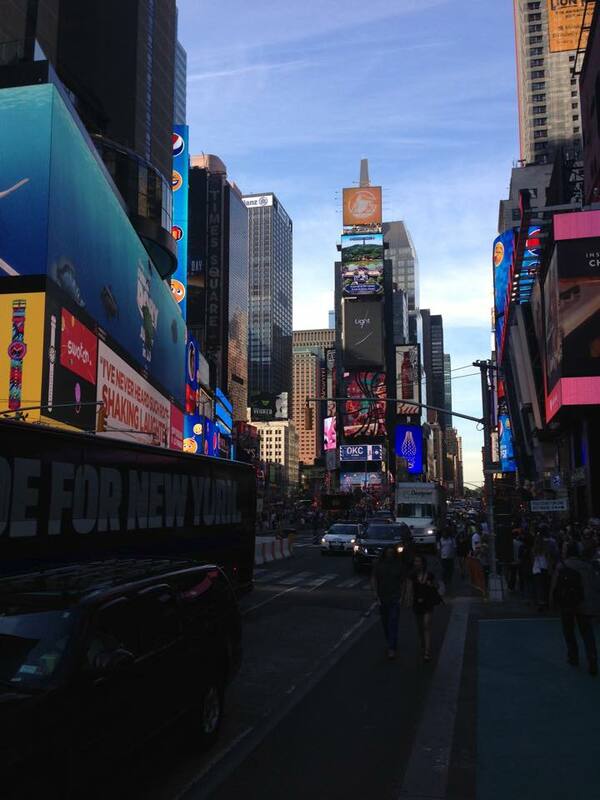 It was an odd feeling coming back to where the race began last year. 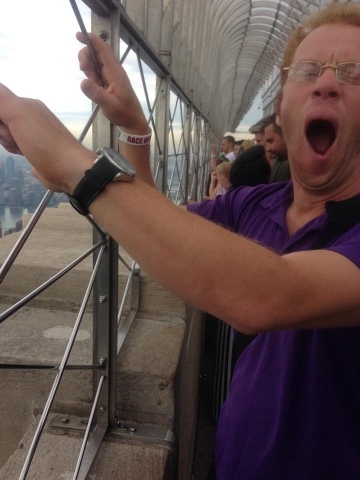 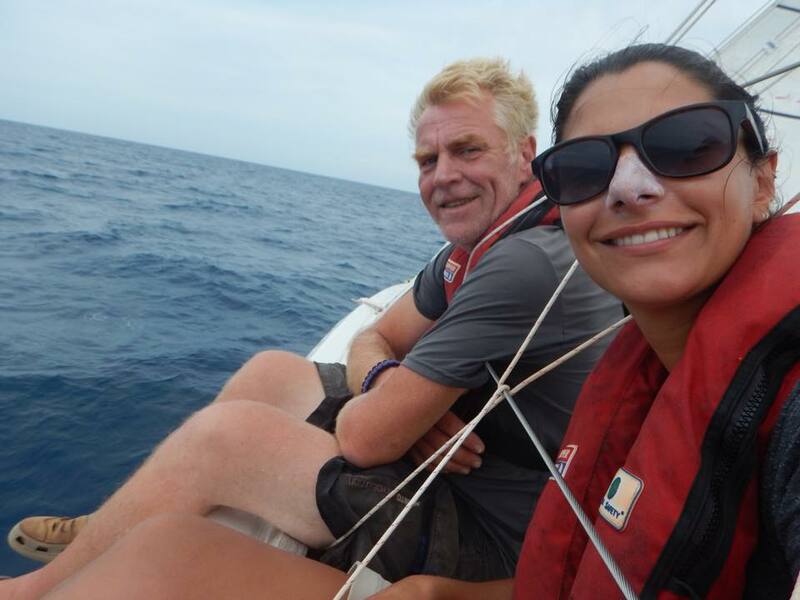 I did feel emotional but also disbelief that I’d actually made it all the way round the world on a yacht. I think it is going to take a while for this fact to fully sink in. 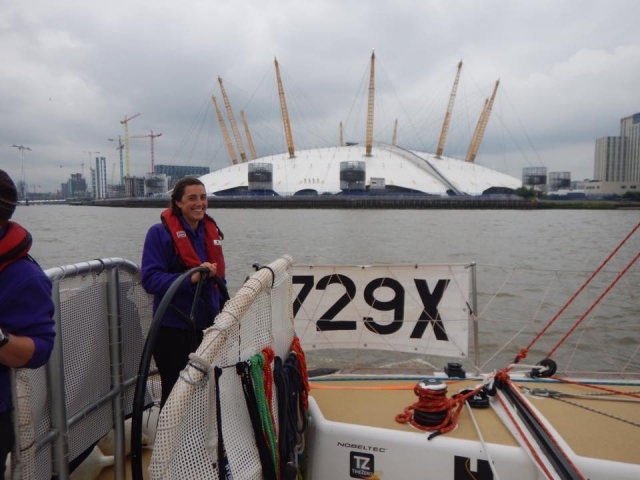 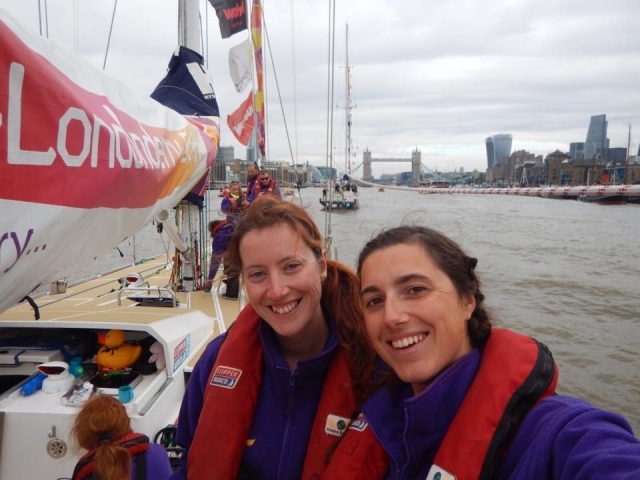 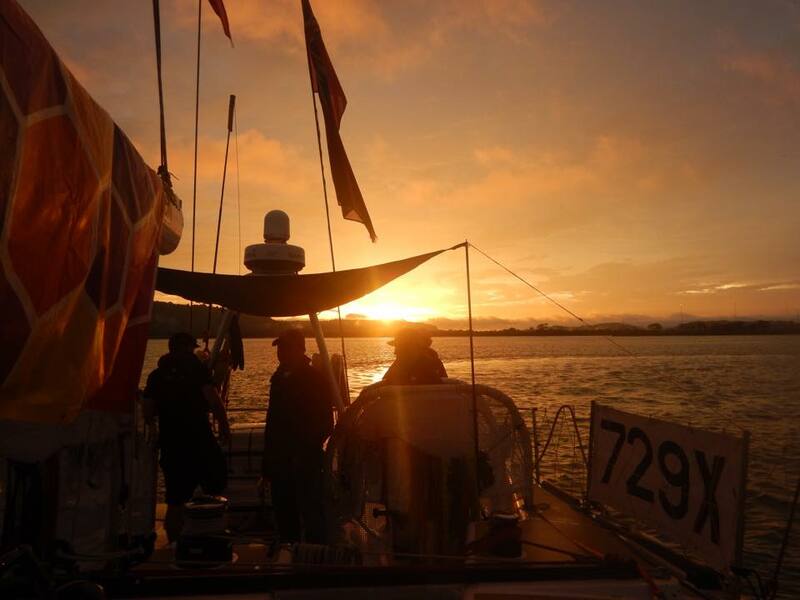 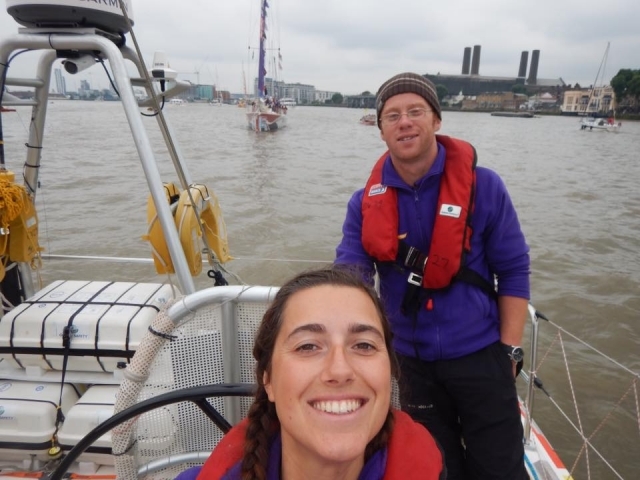 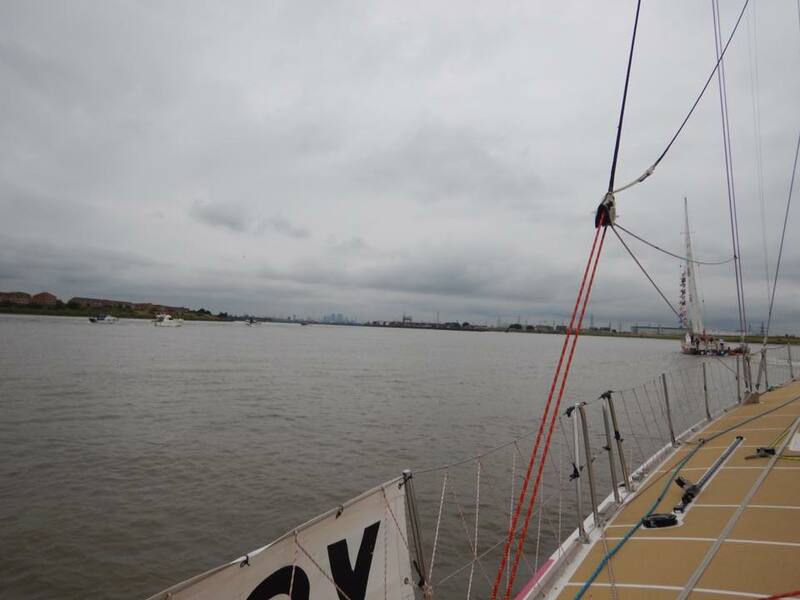 We anchored up for a few hours to get some rest before meeting up with the rest of the fleet to begin the parade of sail up the Thames. 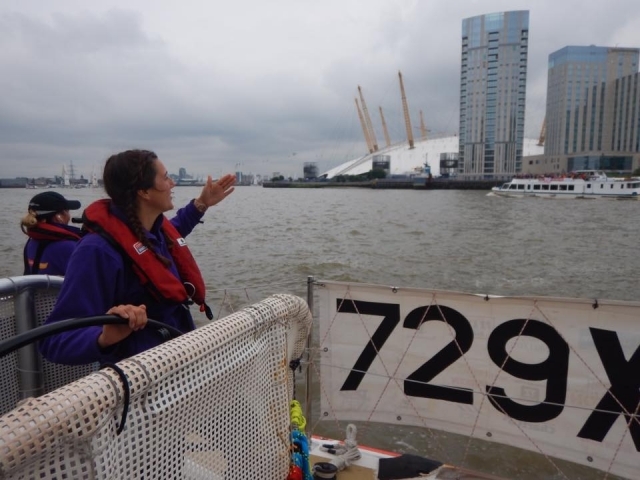 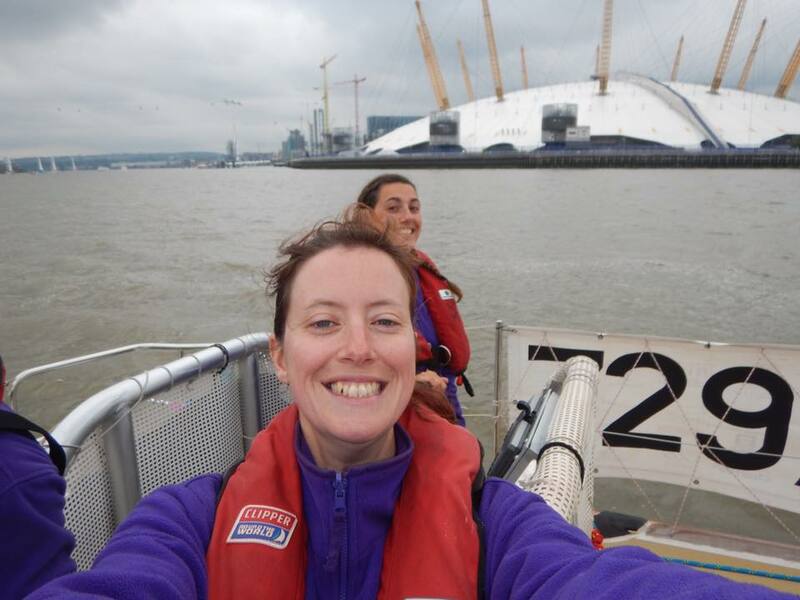 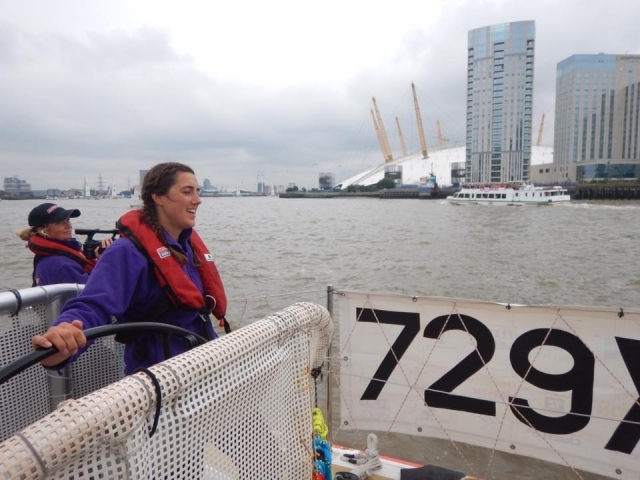 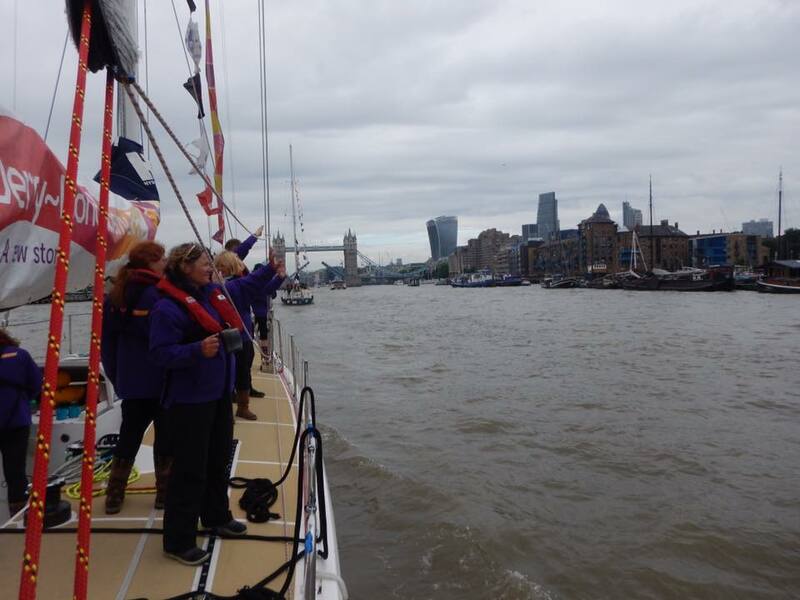 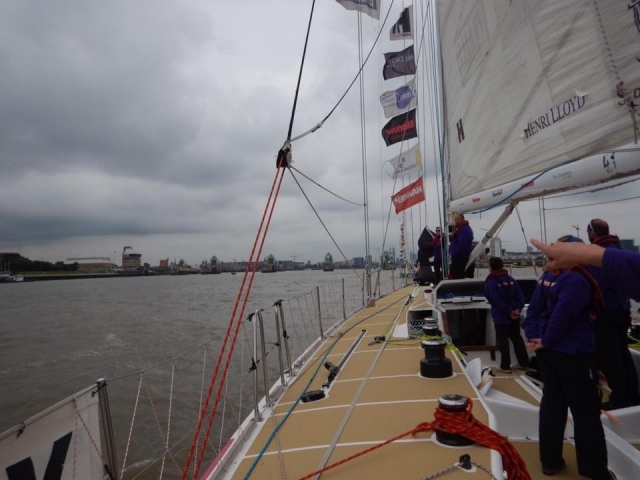 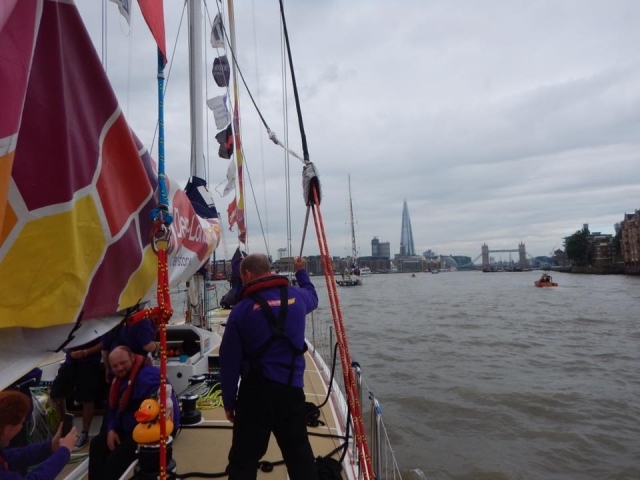 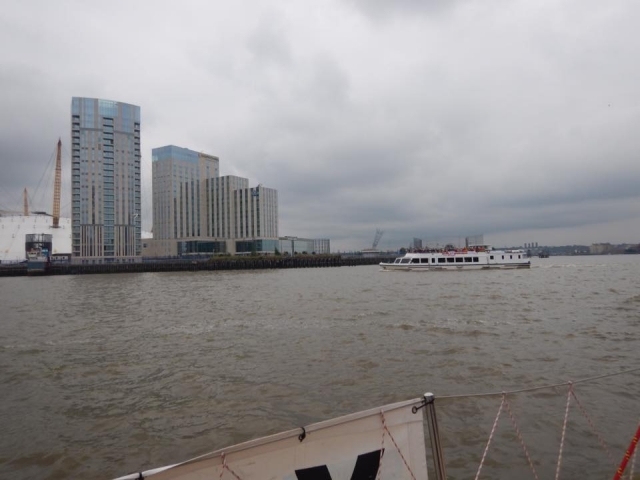 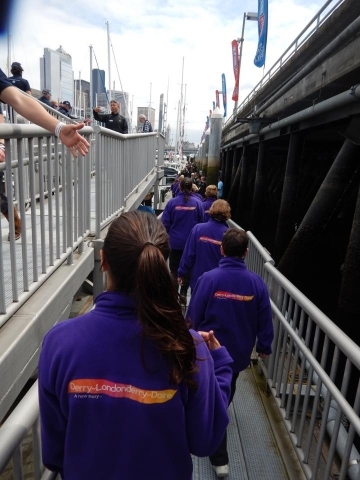 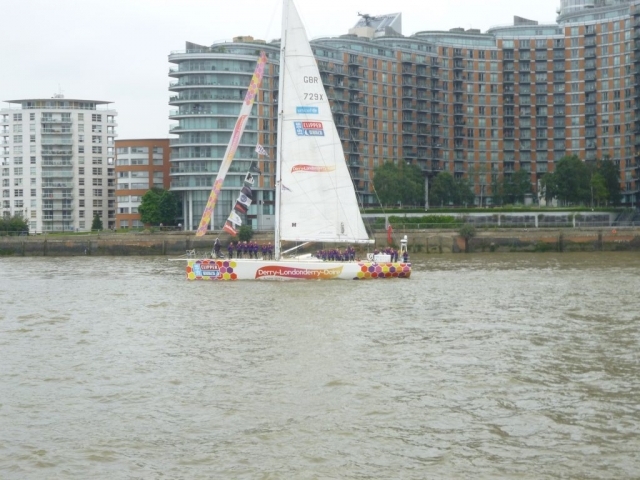 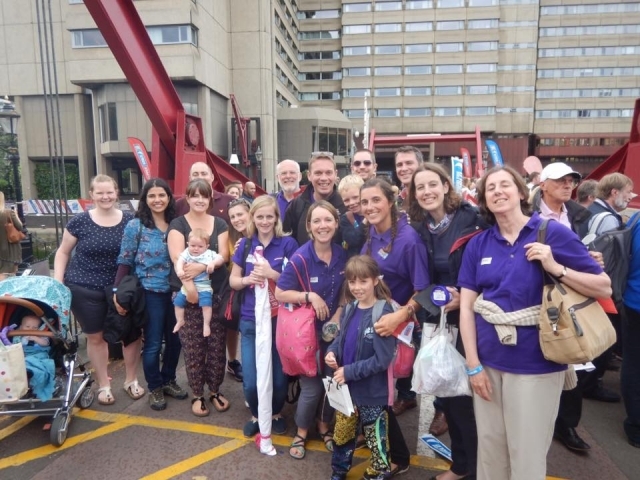 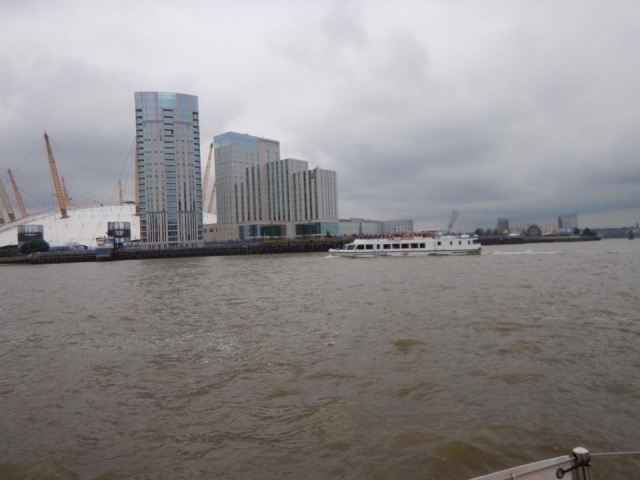 As we approached the Thames Barrier, the first of the supporters’ boats came into view so we all stood by to start the waving. 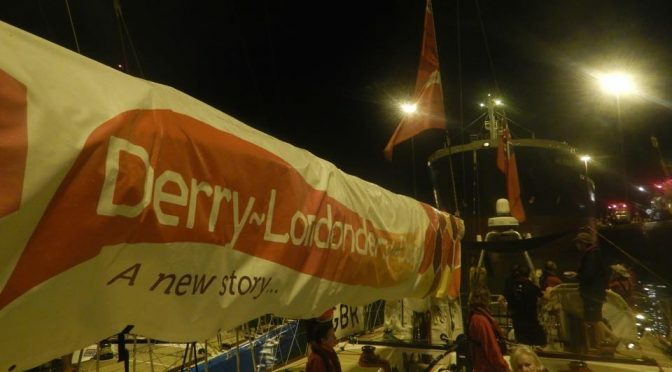 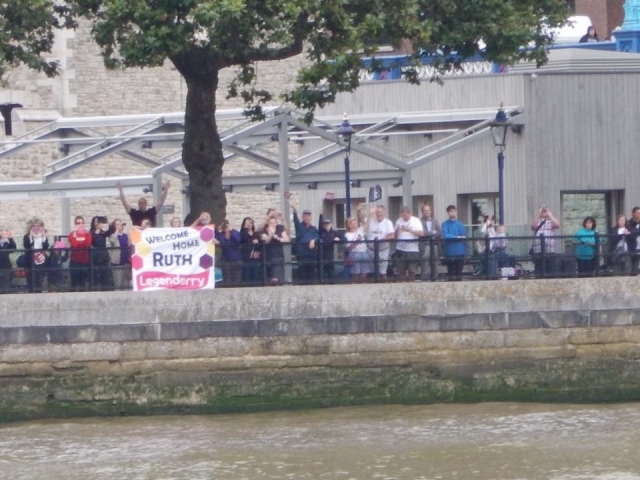 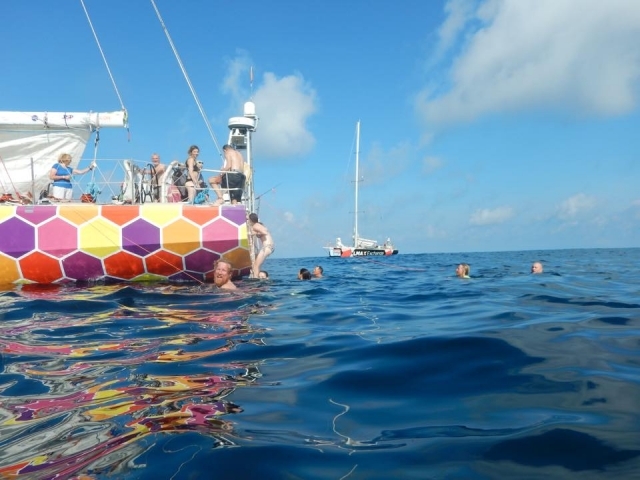 This boat had all my friends and family on it including an awesome banner which my friend Sally made for me. 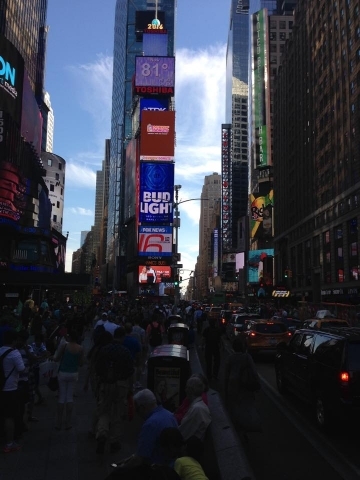 It was wonderful to see everyone. 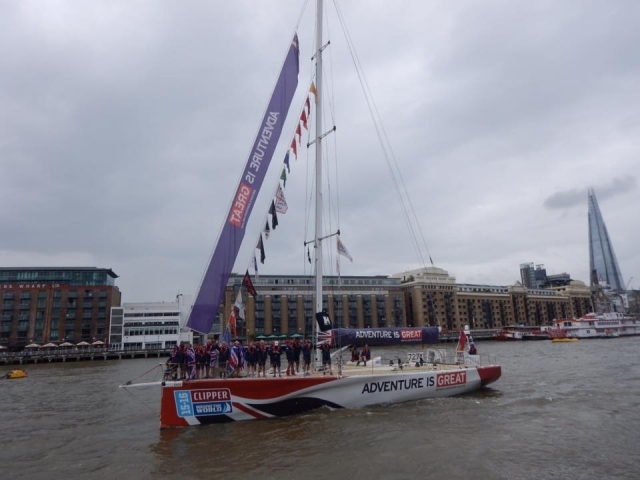 As the morning progressed as we got closer to St Katharine Docks, the more I began to realise that this amazing adventure was soon to be over. 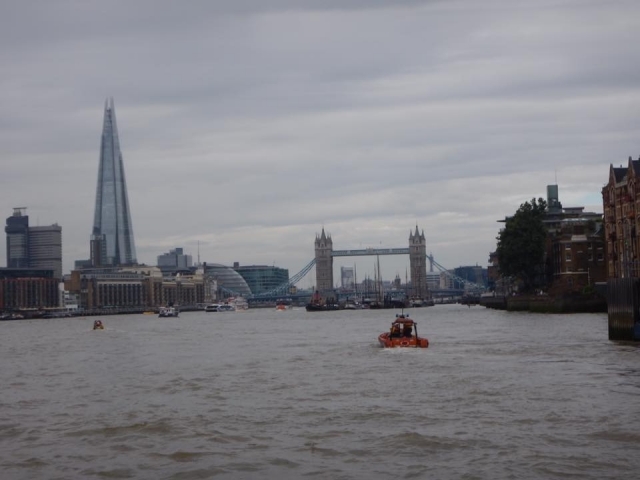 The familiar London skyline came into view and Tower Bridge lifted for us. 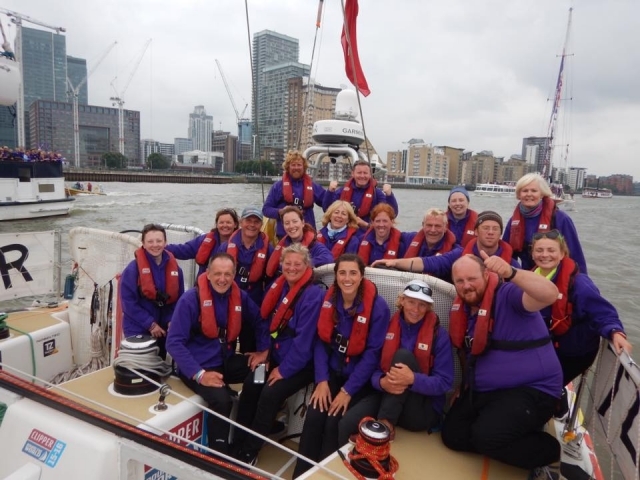 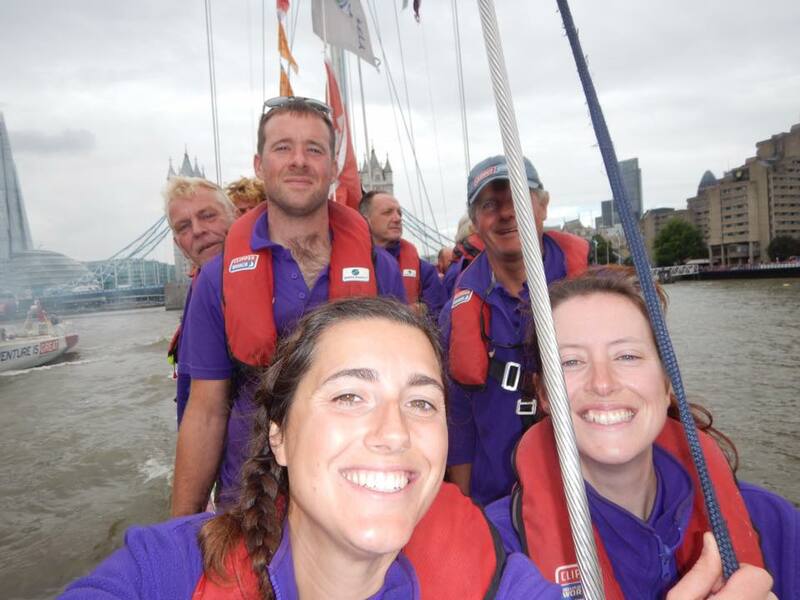 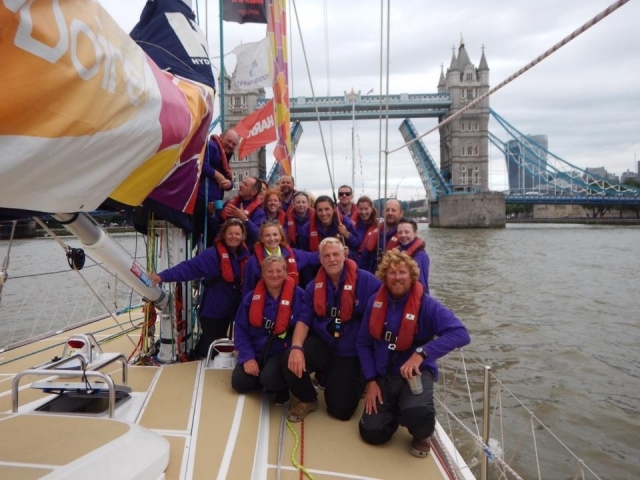 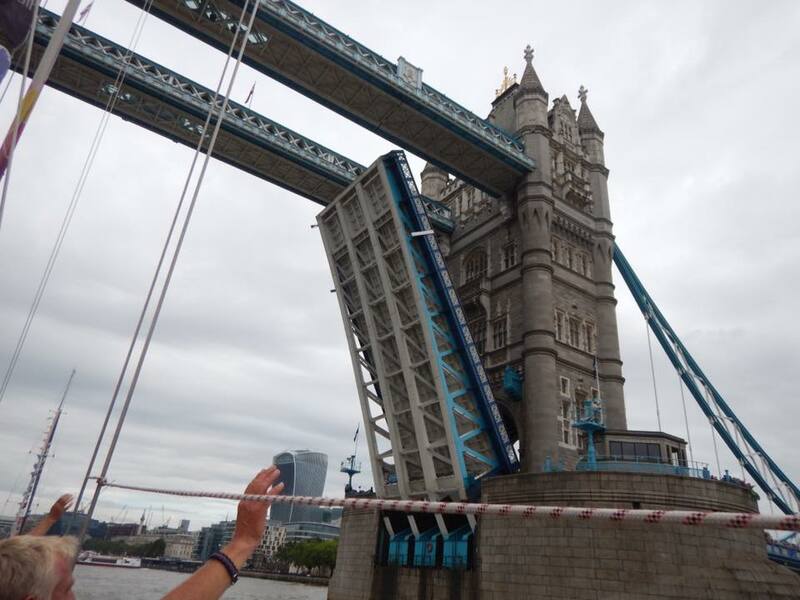 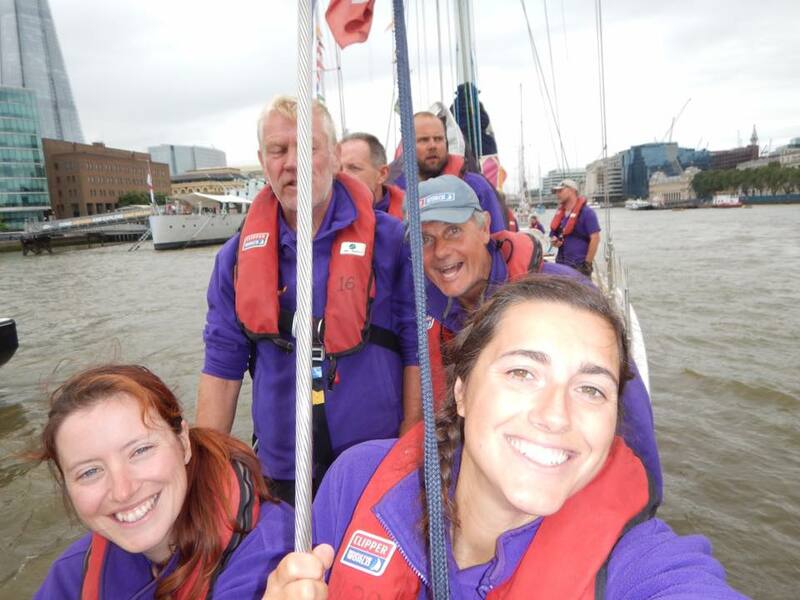 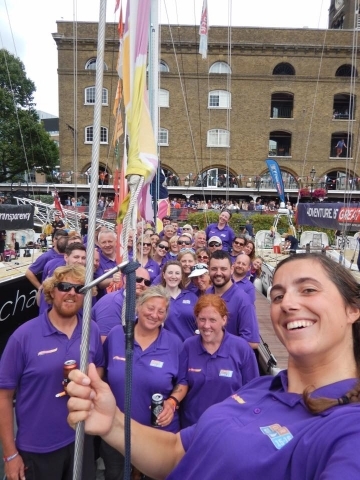 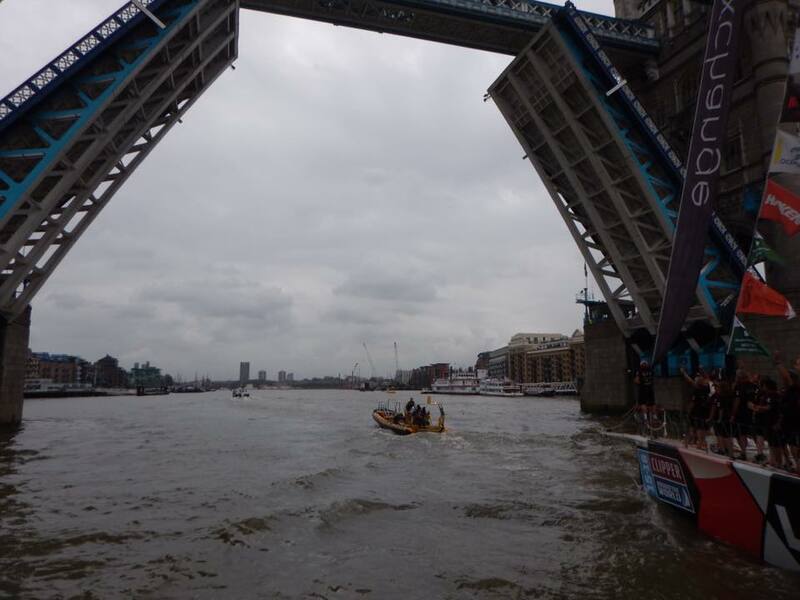 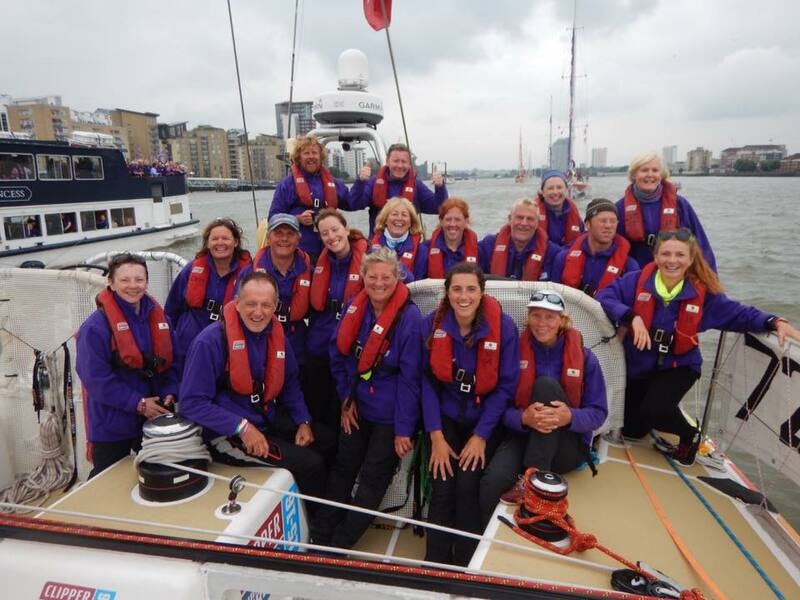 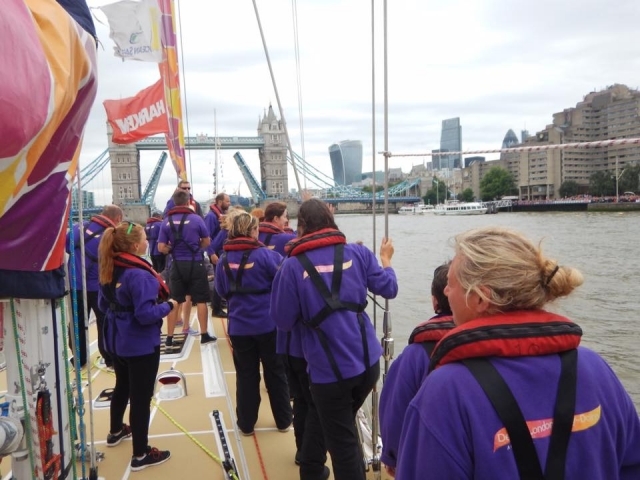 As we had come second overall we lined up with LMax who won and Great Britain who were third overall and came back through Tower Bridge in podium formation. This was exciting and we were all in high spirits on board. 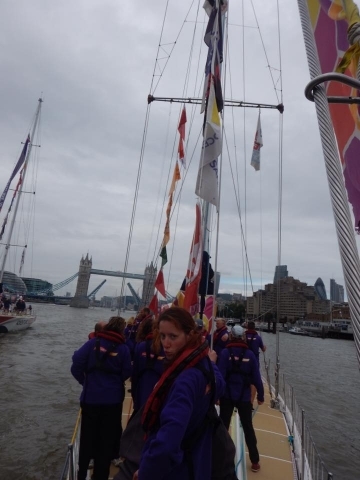 We then had to wait our turn to enter St Katharine Docks and this bit of waiting felt like forever. We locked in and I could see my supporters up close and spotted more people who had come to welcome me home – it was quite overwhelming the number of people who were there for me. 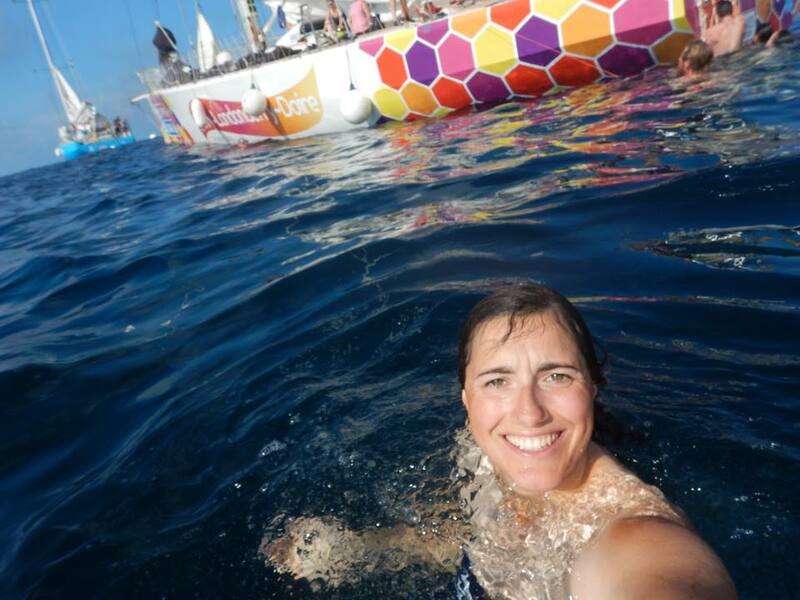 Oddly I didn’t feel emotional, just amazingly happy to be back and I couldn’t stop smiling! 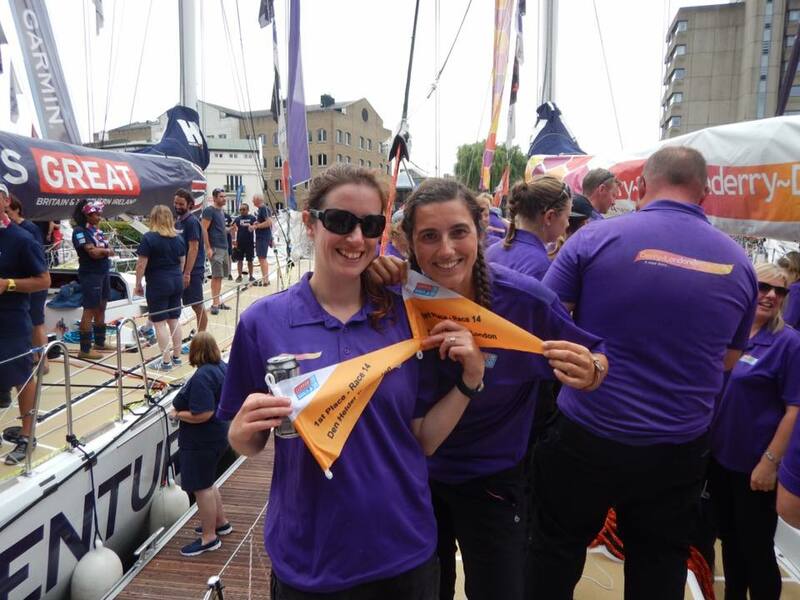 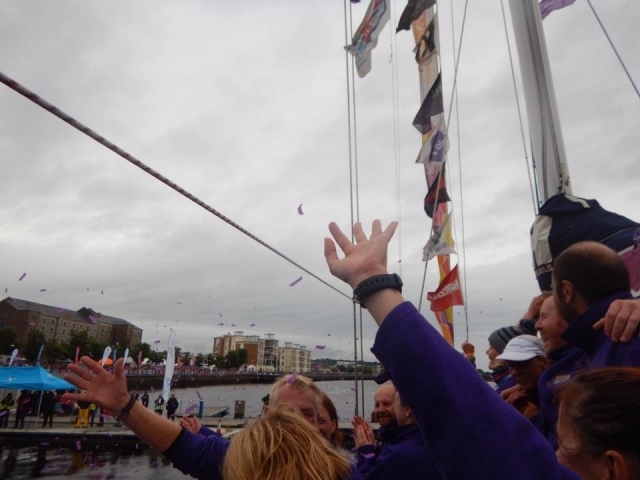 When we got alongside we were presented with our pennant for first place in race 14 and Dan had fun spraying the Champagne which mainly ended up all over me! 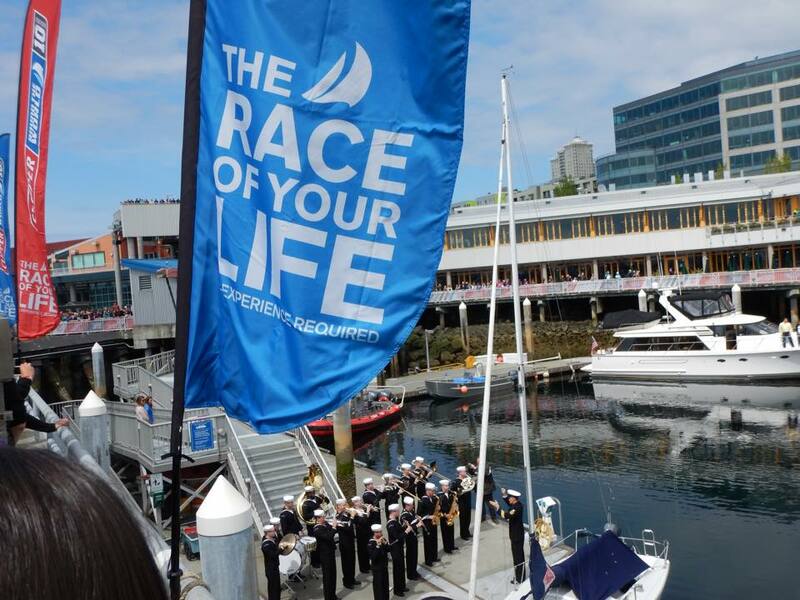 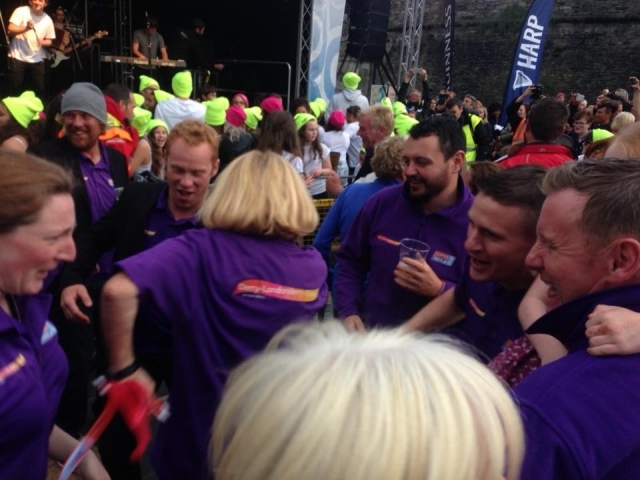 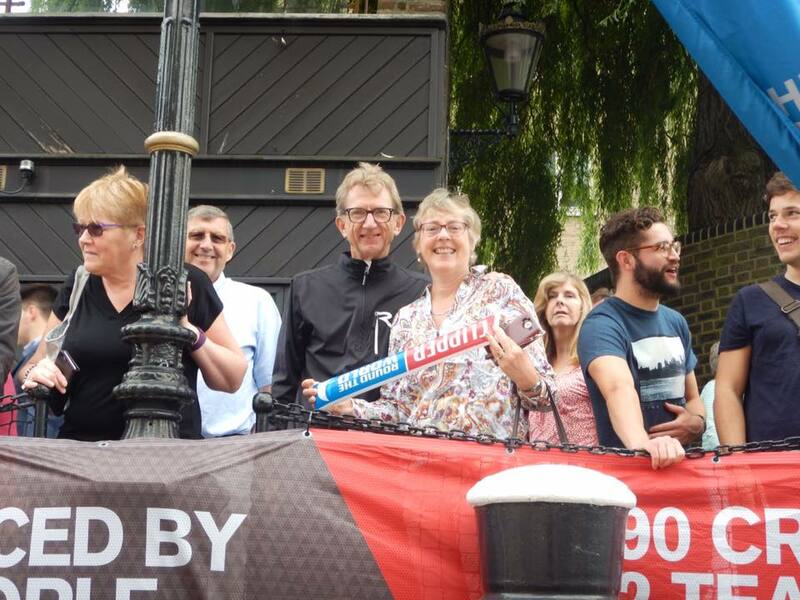 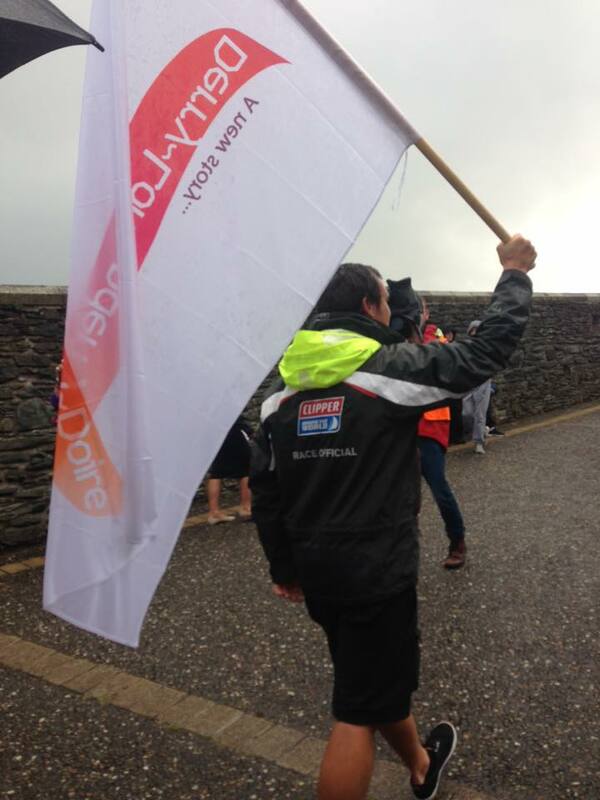 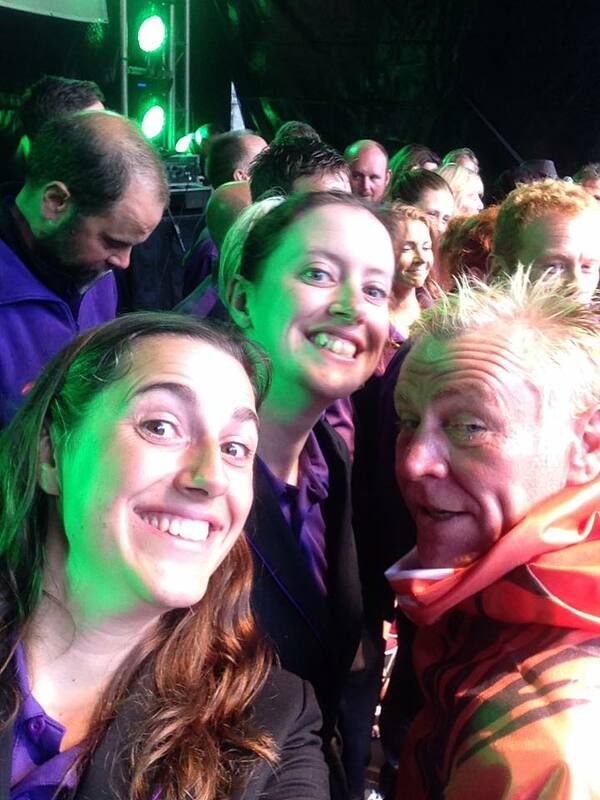 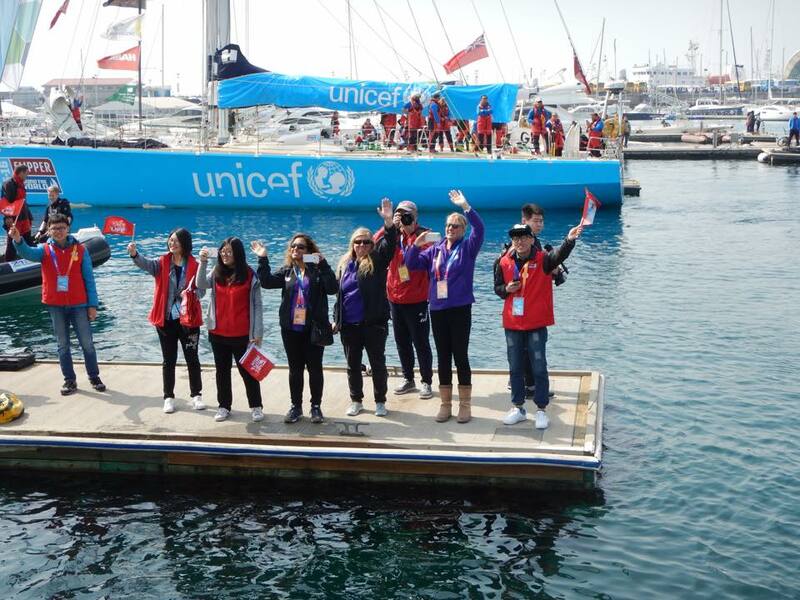 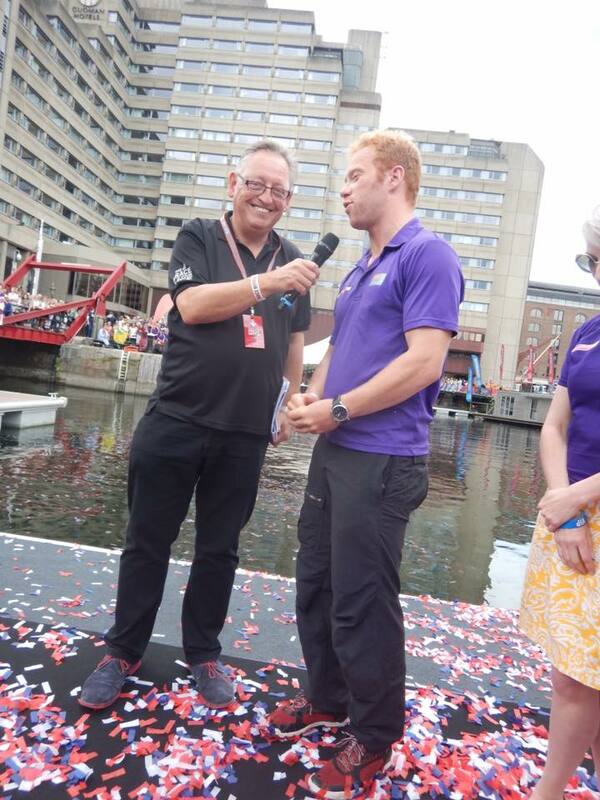 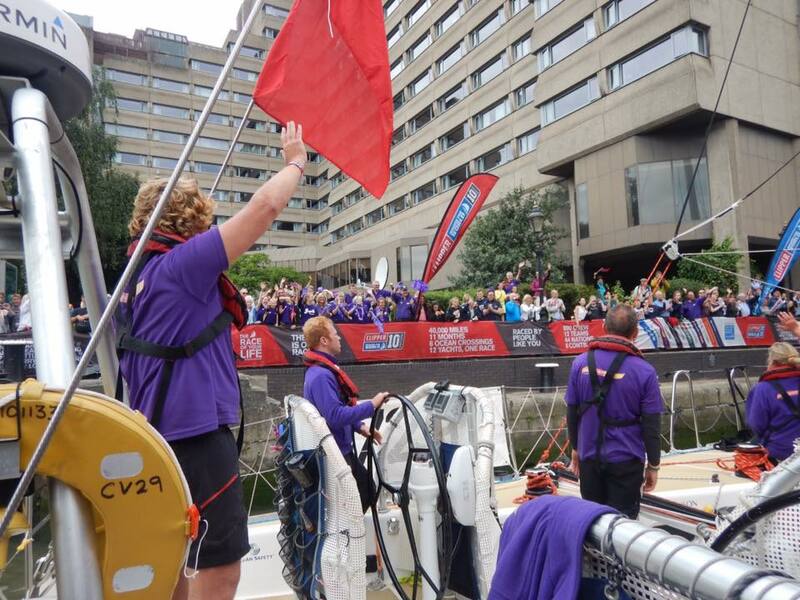 I got to lead our team round the dock to the podium and had great fun waving the massive team flag. 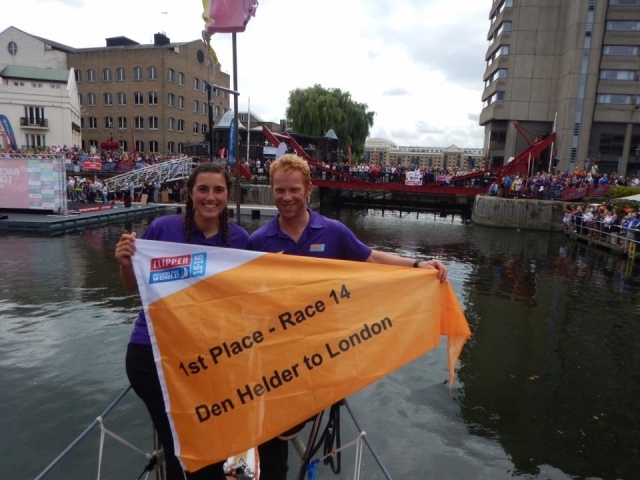 We were presented with our overall second place pennant which I will treasure forever. 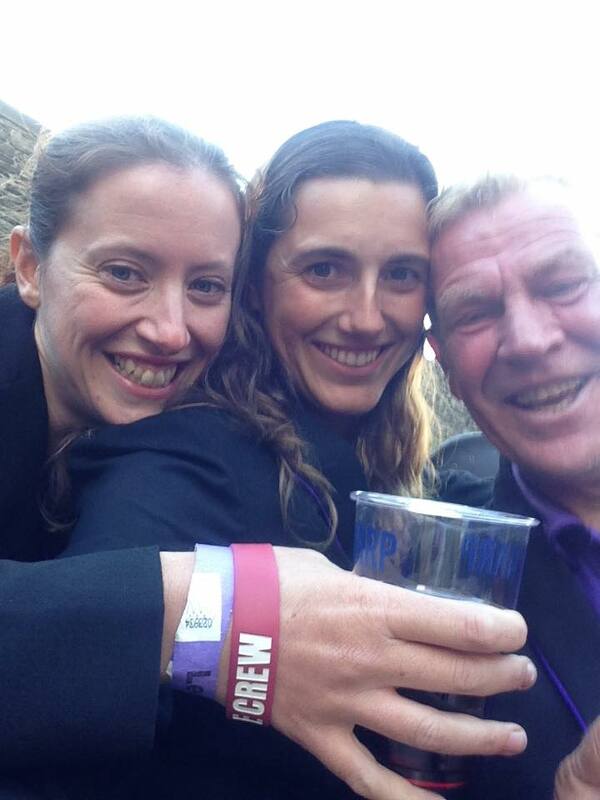 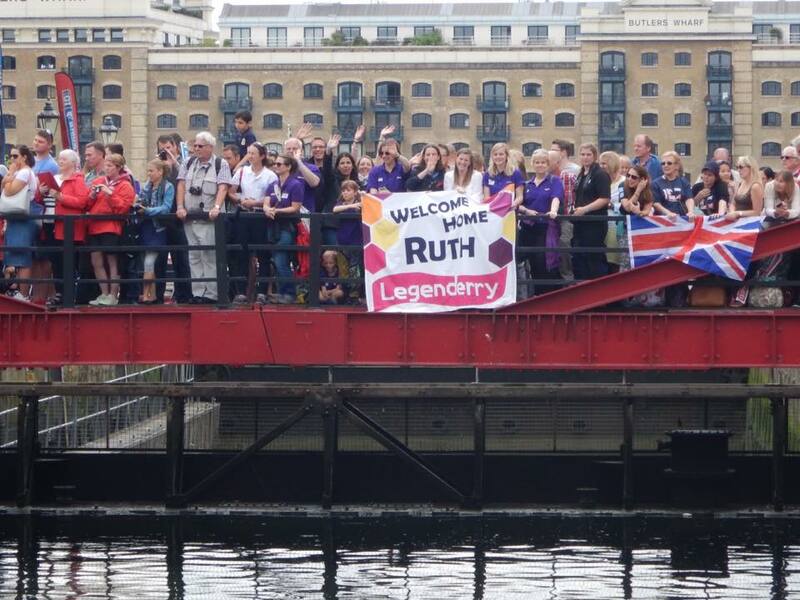 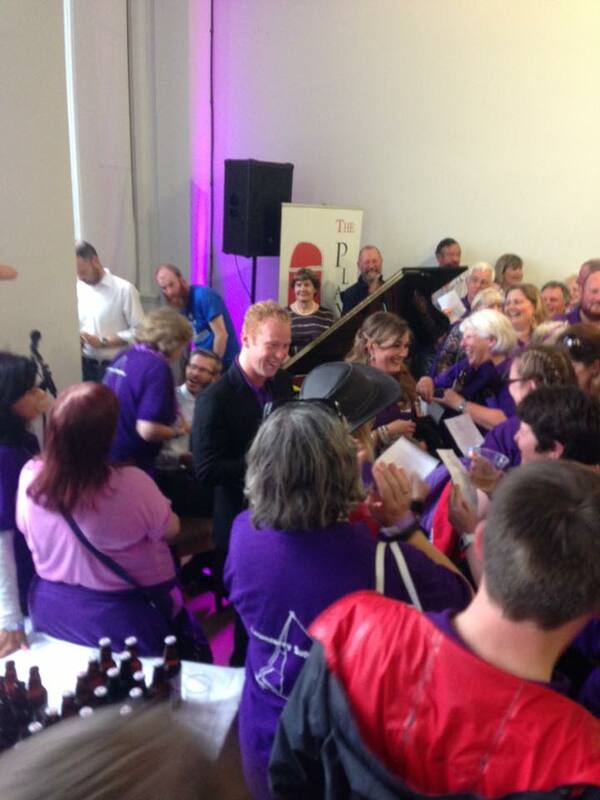 After our podium moment I walked out the dock to the most wonderful welcome from those who had come to support me. I got the most amazing hug from my godson Tom and Emma and got the first cuddles with Isaac and Noah who have both been born while I was away. 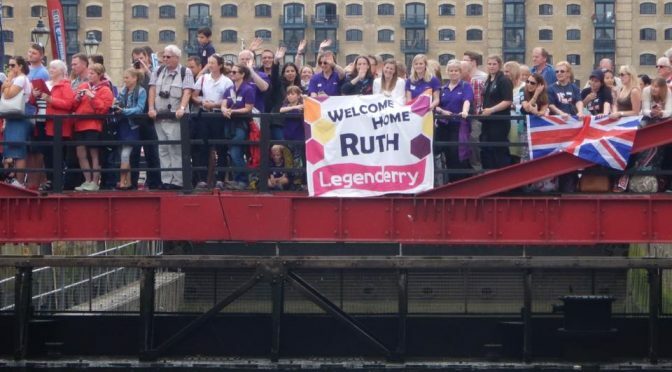 I couldn’t have wished for a better welcome home from everyone so thank you to each and every one of you for your love and support. 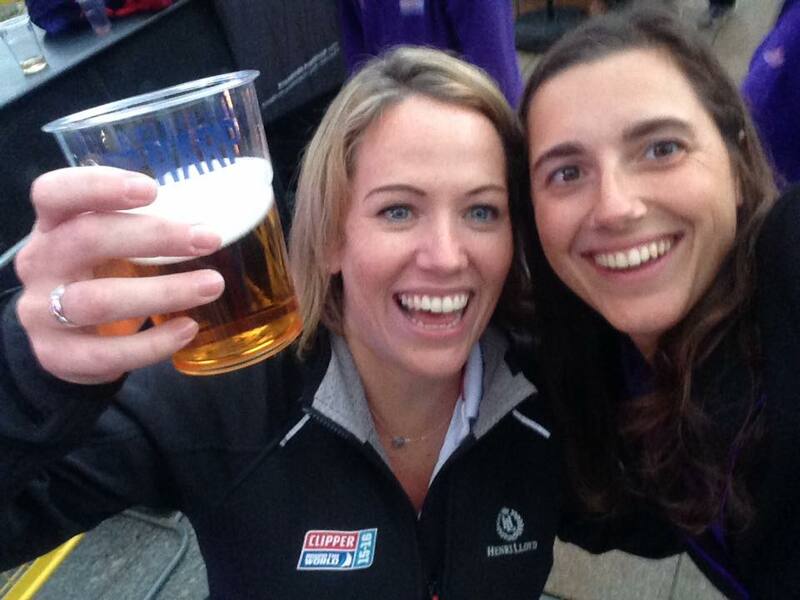 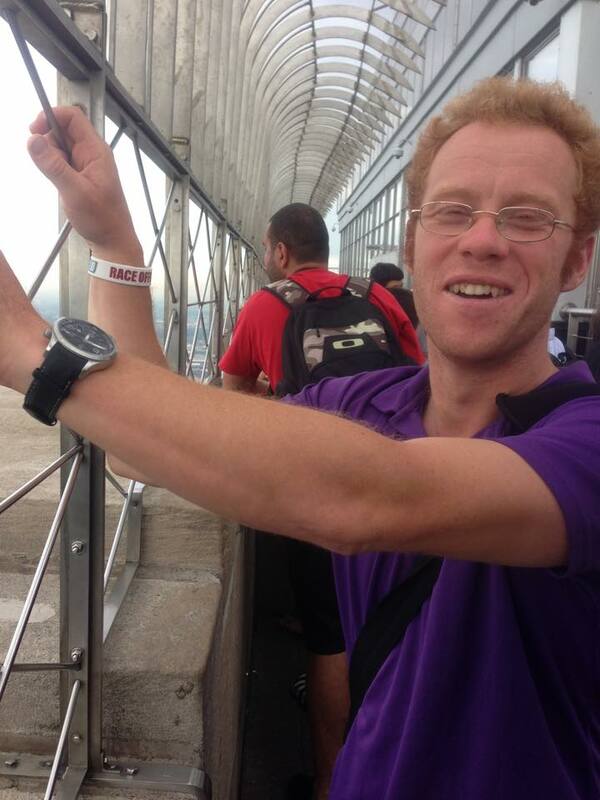 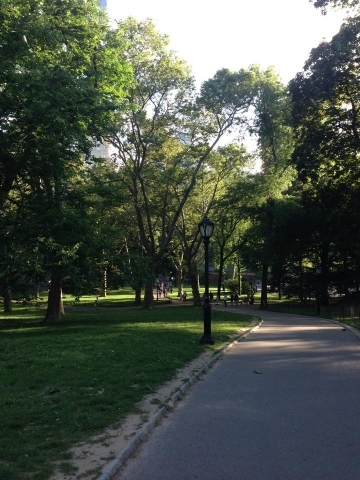 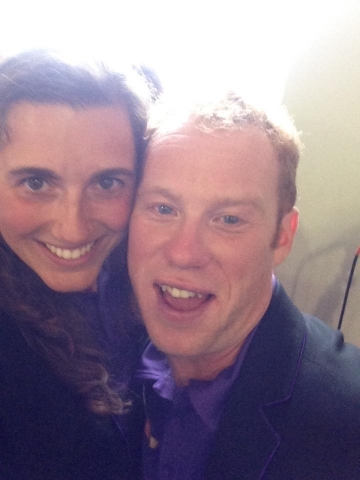 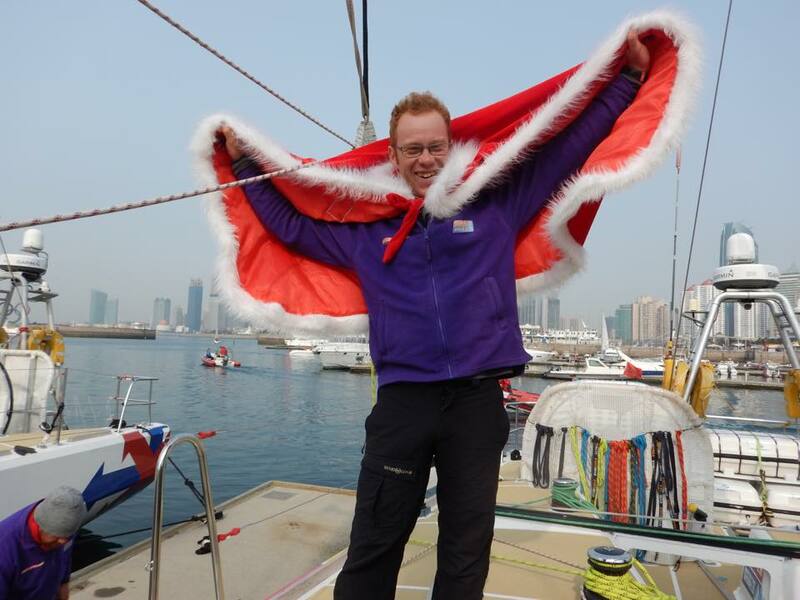 Thank you to everyone who has supported me this year and read these blogs. 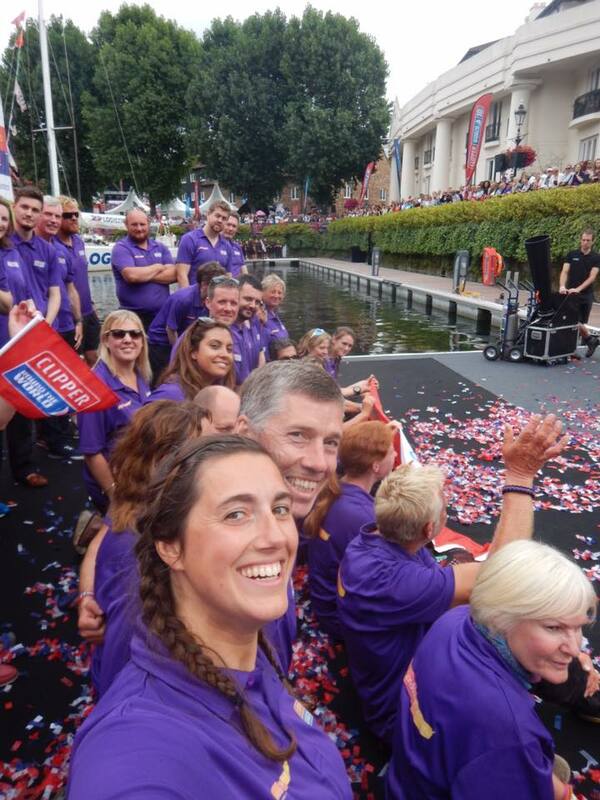 It’s been an incredible adventure and I’m glad to have been able to share it with you all. 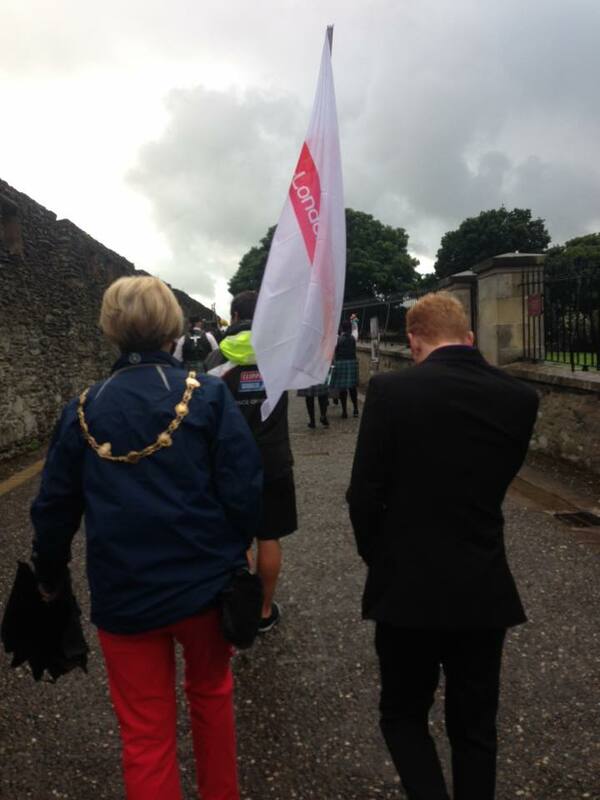 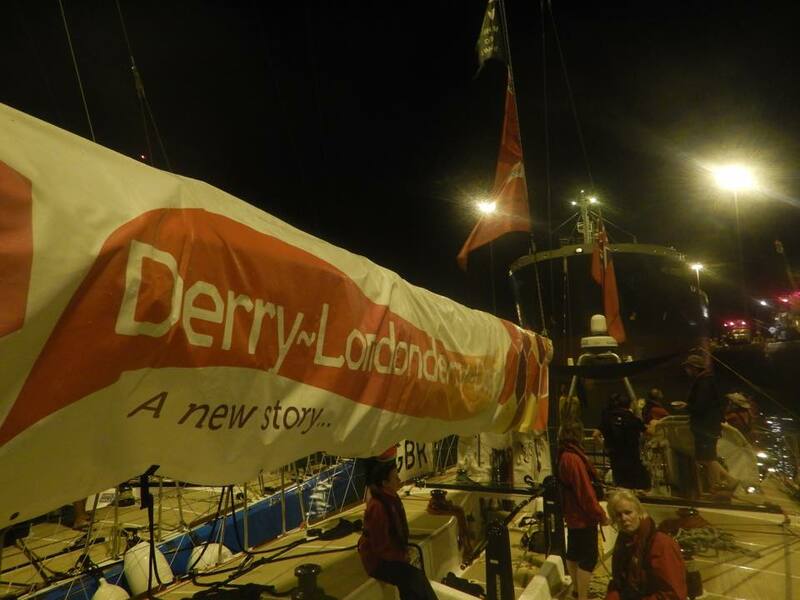 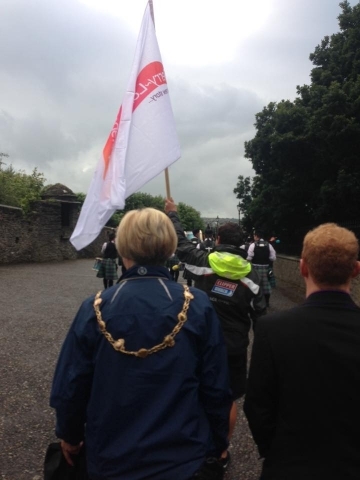 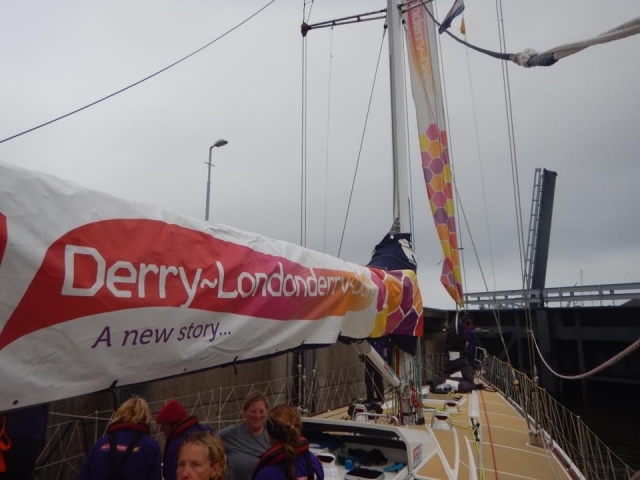 The city of Derry~Londonderry not only gave us an amazing welcome when we arrived but were out in force to wish us well on our departure. 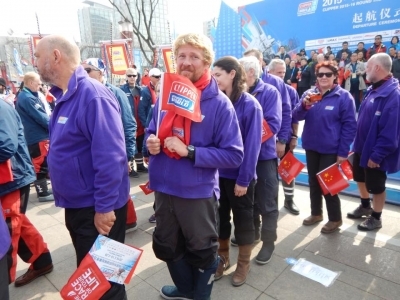 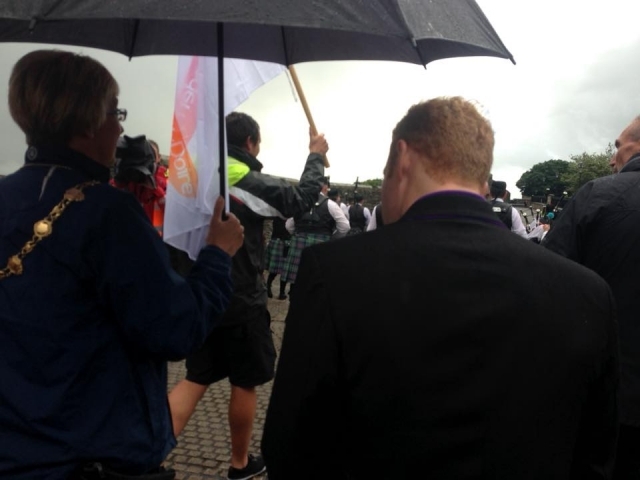 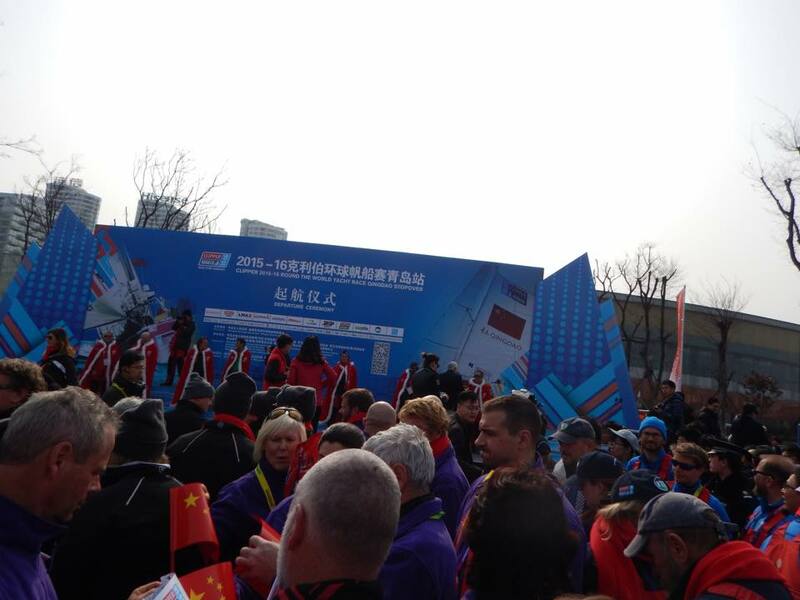 The banks were lined with people cheering and at times applauding us (which we returned to them for their support). 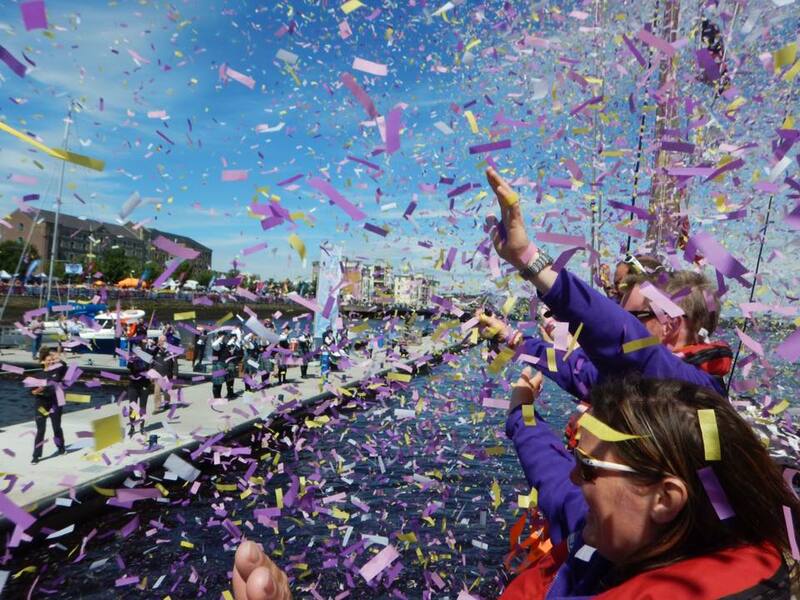 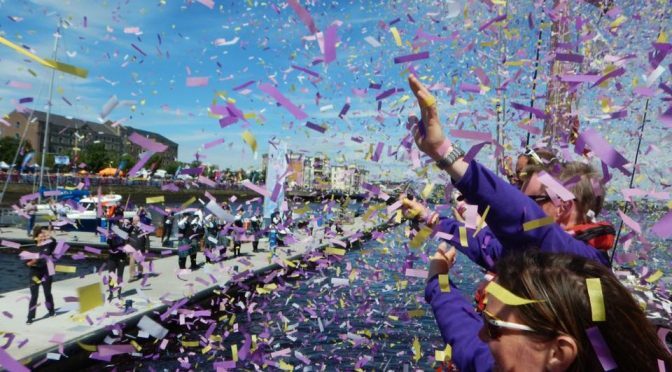 As the home team we did two laps in the river parade and were again covered in confetti which was a special moment. Race start was at Greencastle where again the supporters were out in force to watch, which was back to being a line start. 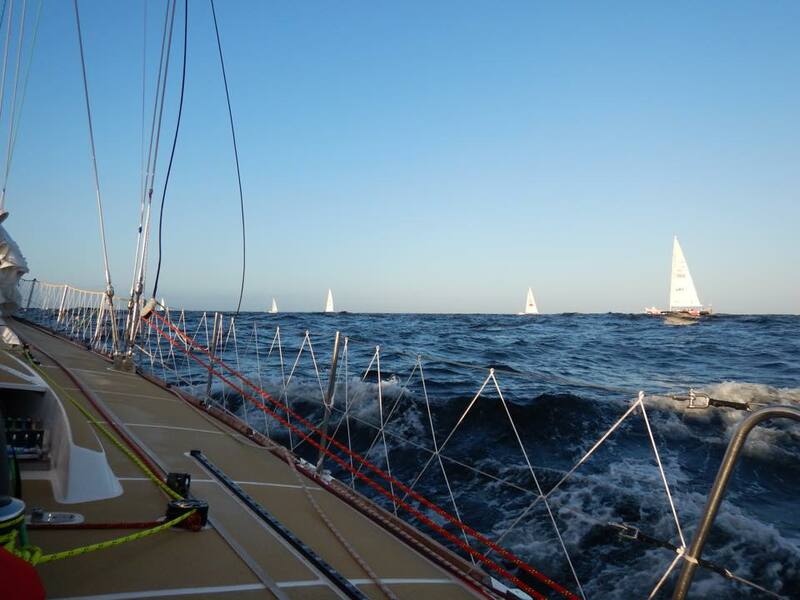 We haven’t had a line start since Hobart so it came with my usual apprehension for 12 yachts fighting for the perfect line. Although line starts can be exciting, I always have this fear we are going to get rammed by someone and generally there can be a lot of shouting between boats as each helm tries to get the perfect line. 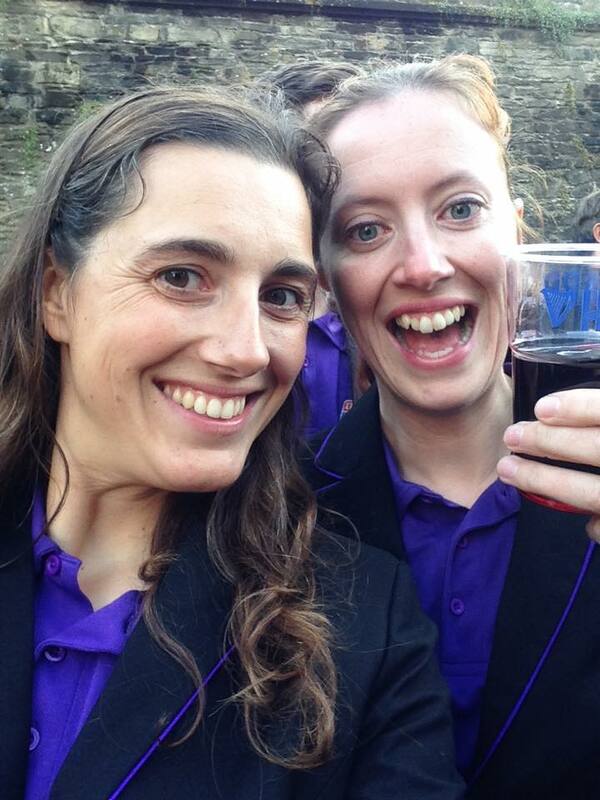 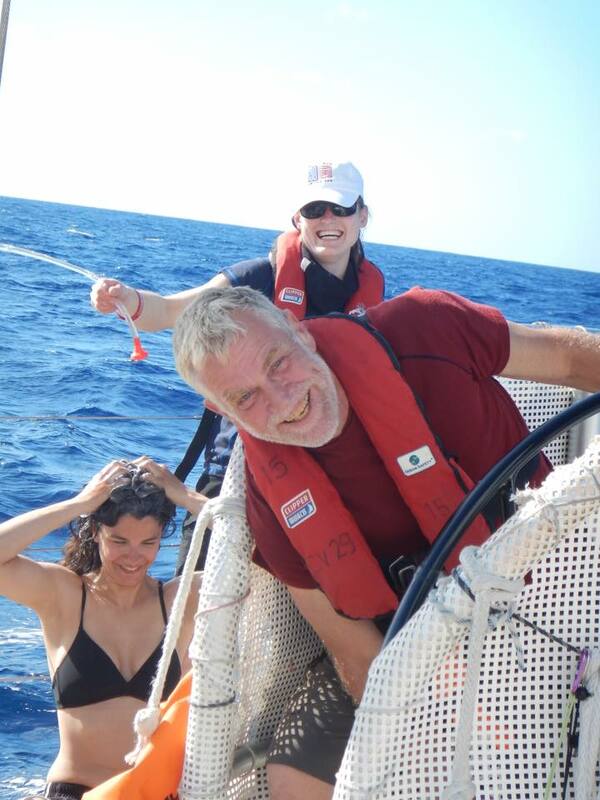 I can happily report that there were no incidents and I do of course trust our helms and skipper completely! 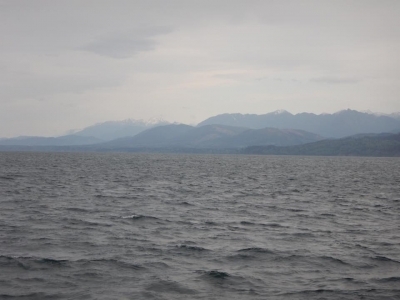 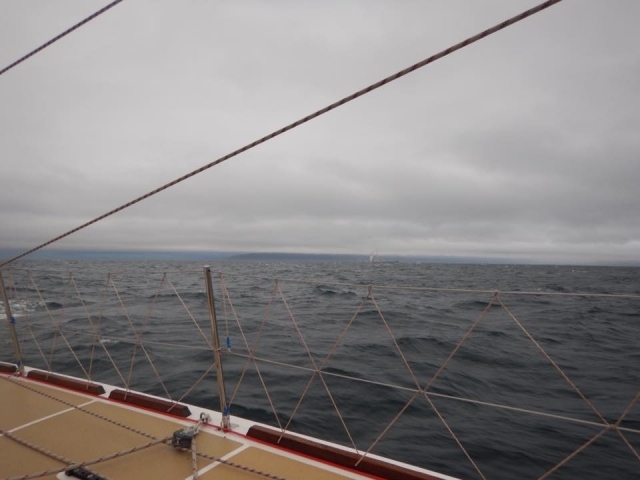 Although we were nearer to land than we have been in a long while, we sadly didn’t get to see much of the spectacular Scottish coastline as the first day or so was misty. 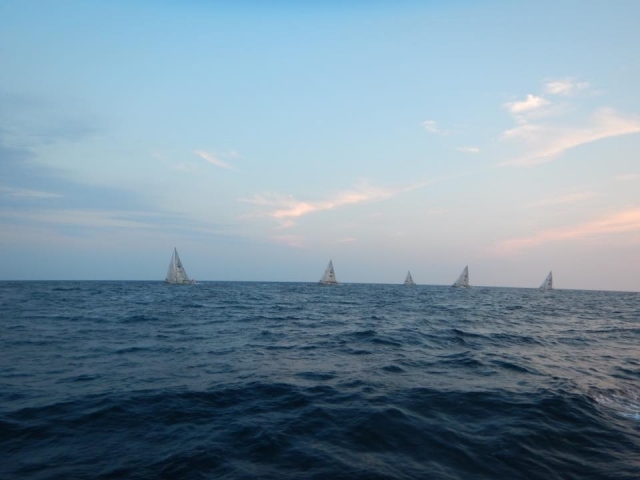 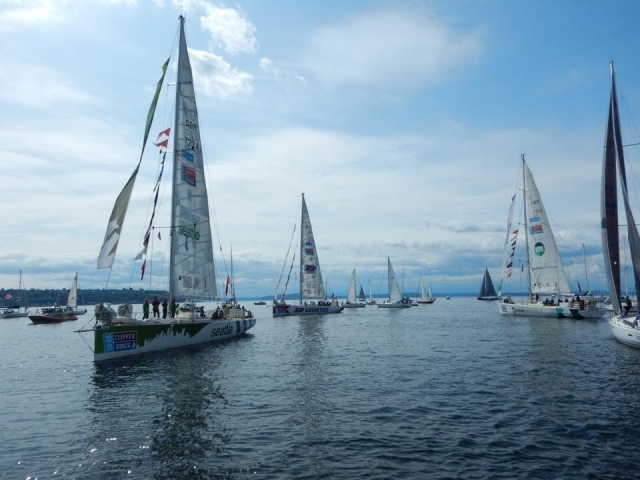 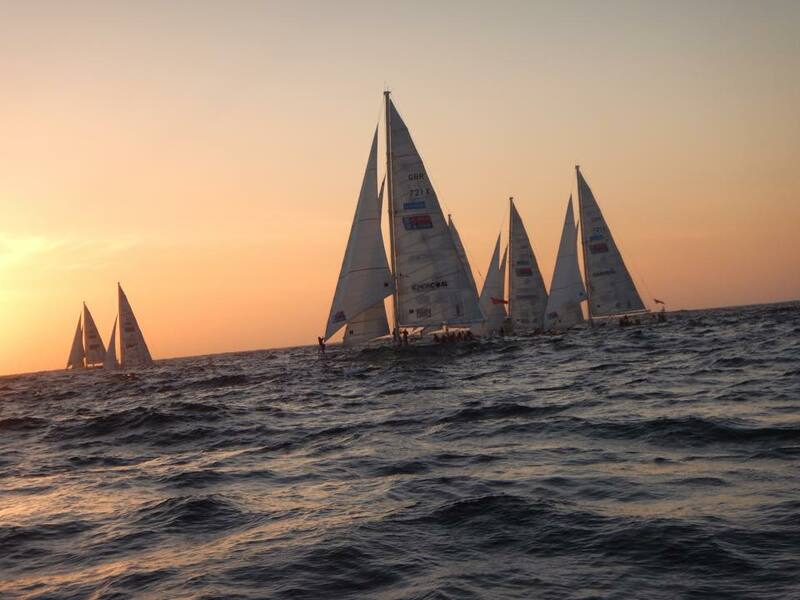 We could see some of the fleet and I always knew this shorter race could end up with a close fleet throughout. 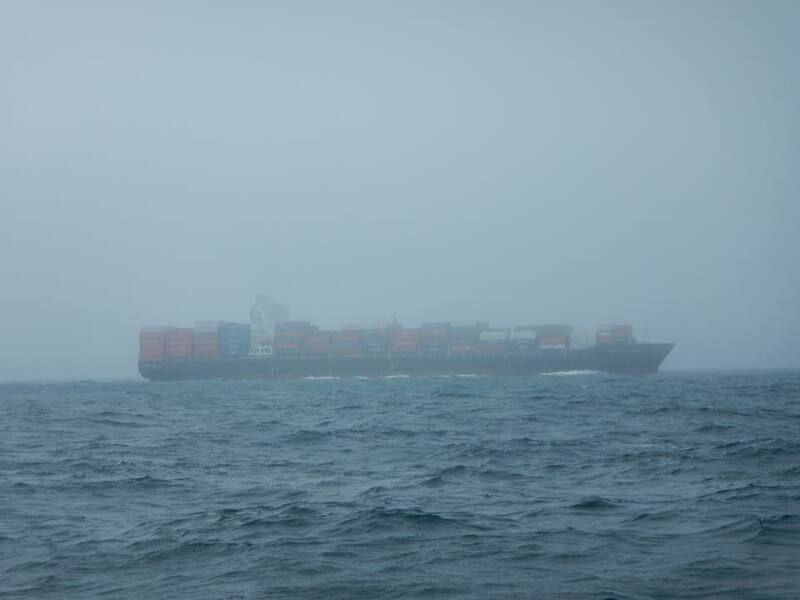 With the mist came the cold so I was glad I kept my layers rather then sending too much home with Mum and Dad when they visited. 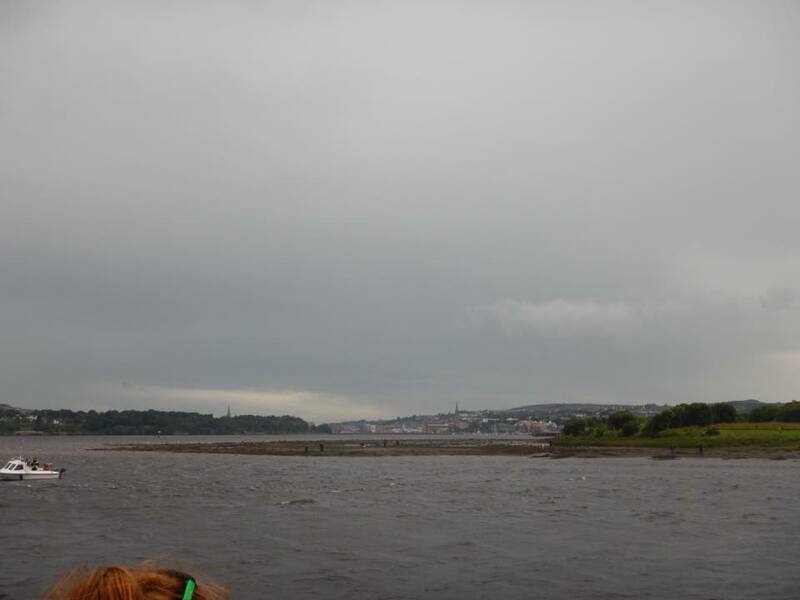 I’ve had many ‘firsts’ this year and the latest one was being the furthest North I’ve ever been. 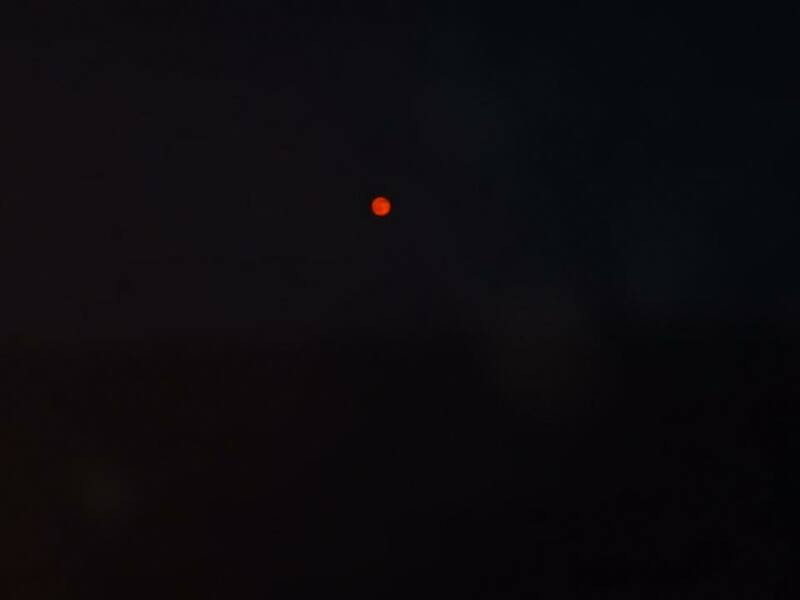 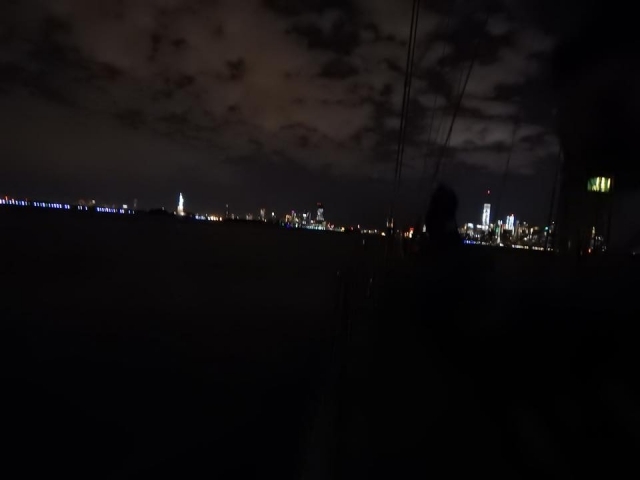 This also came with long daylight hours and so darkness came for only about 3 hours and even then it wasn’t fully dark. 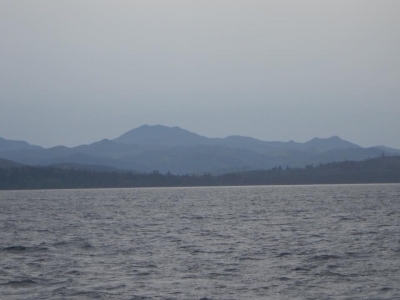 I took some photos as we came across the top of Scotland, we could see LMax near us and these photos were taken at about 10pm! As we headed east we came to the tide at Pentland Firth. 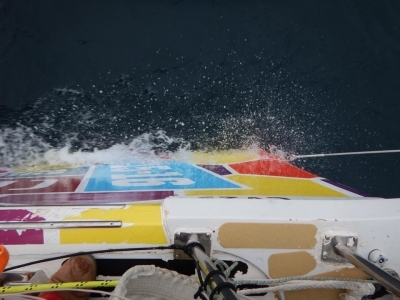 This tide was going to have a big impact on the fleet. If you ended up with the tide against you then progress East would be slow going. 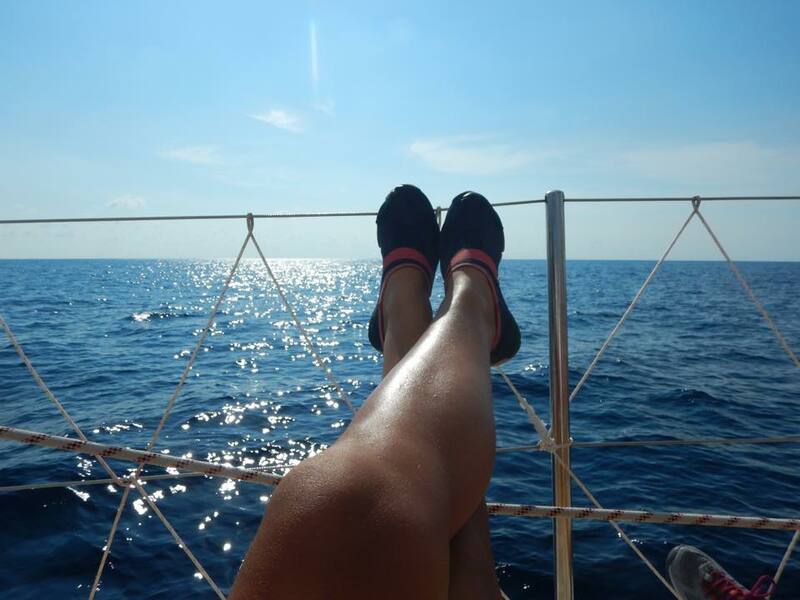 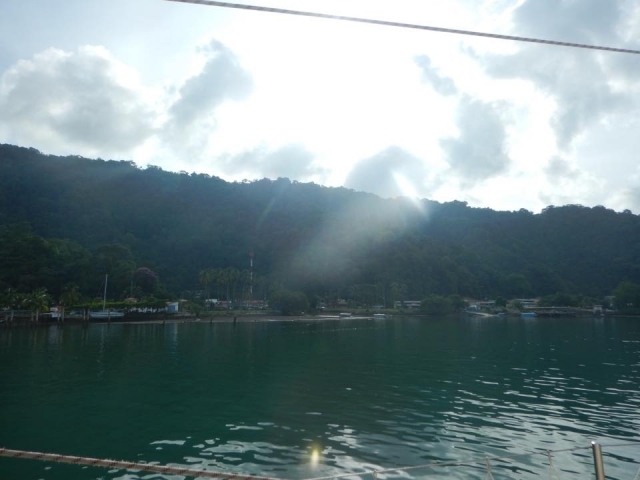 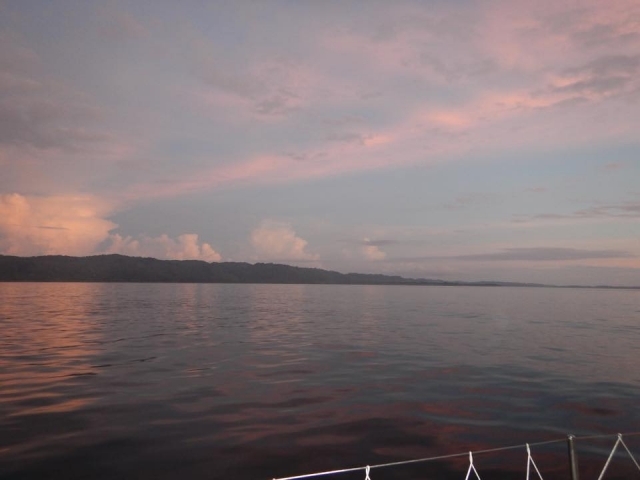 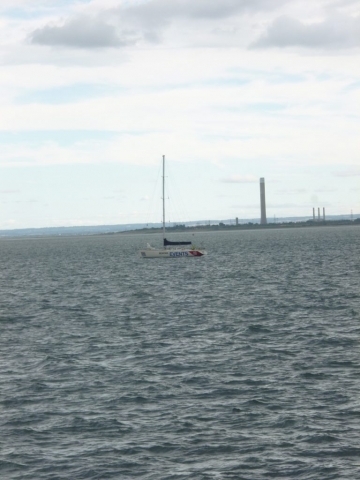 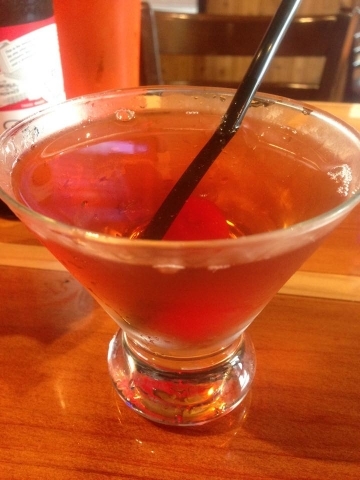 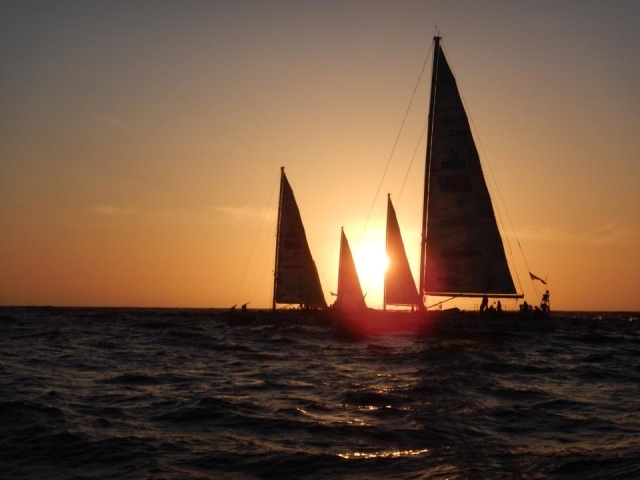 In any normal sailing situation you would time it perfectly so as to have the tide with you. 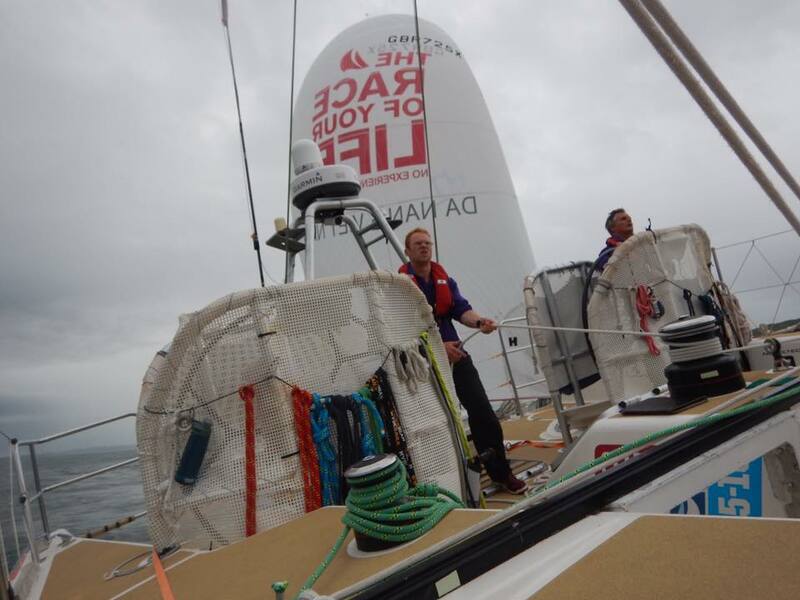 Being in a race we couldn’t do any more than get there and hope for the best. 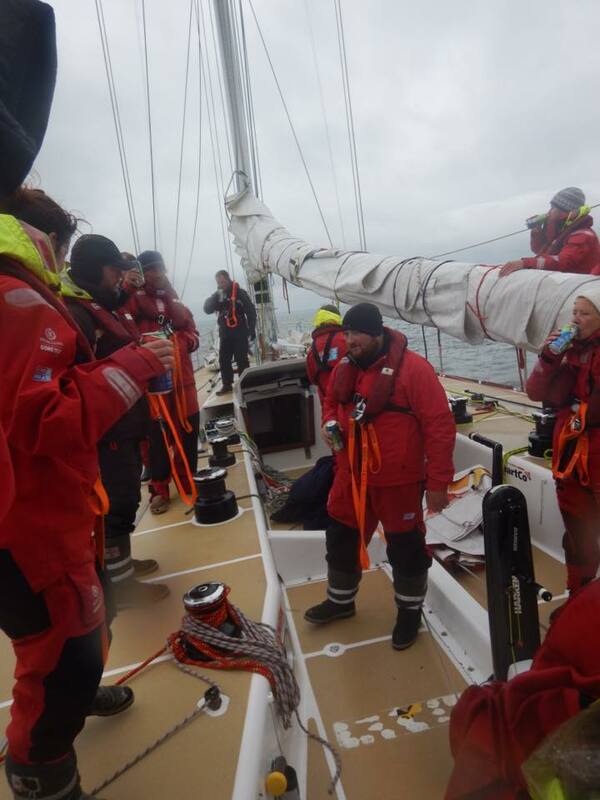 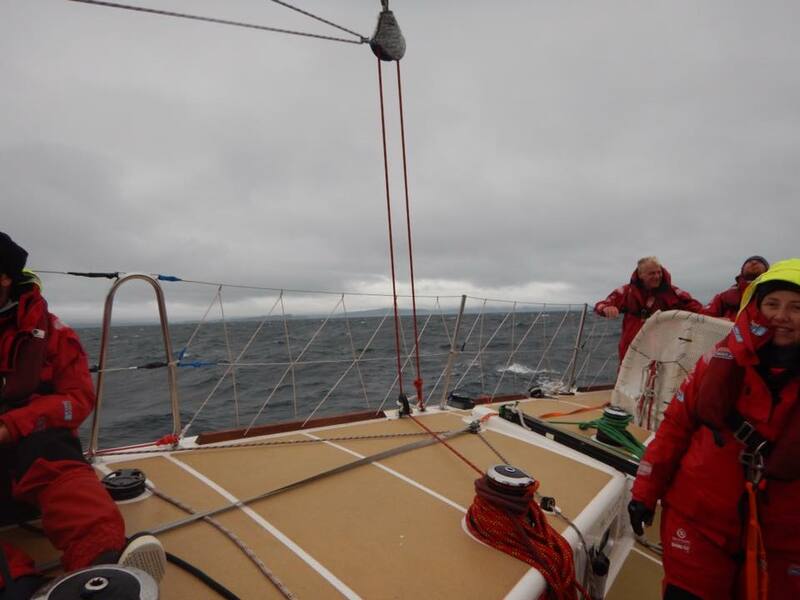 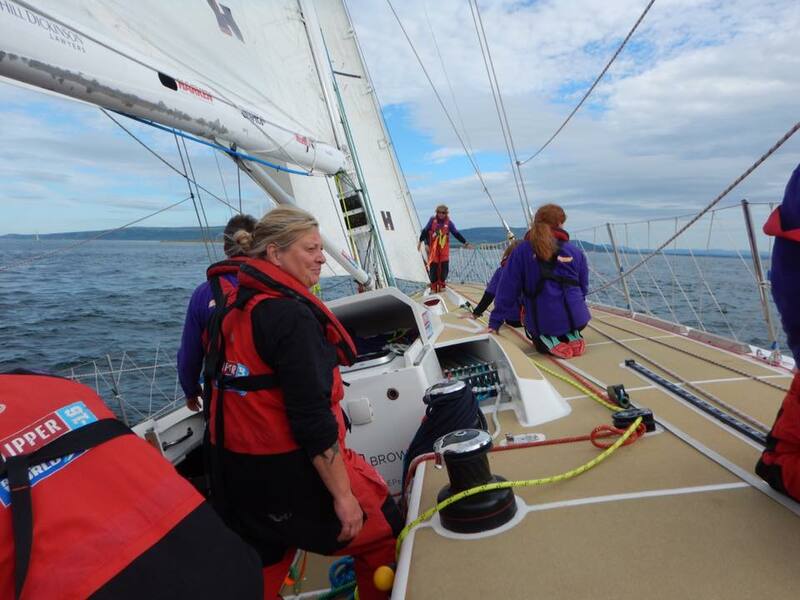 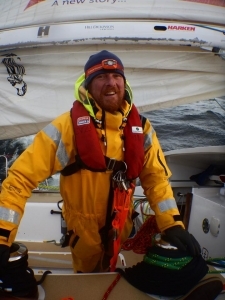 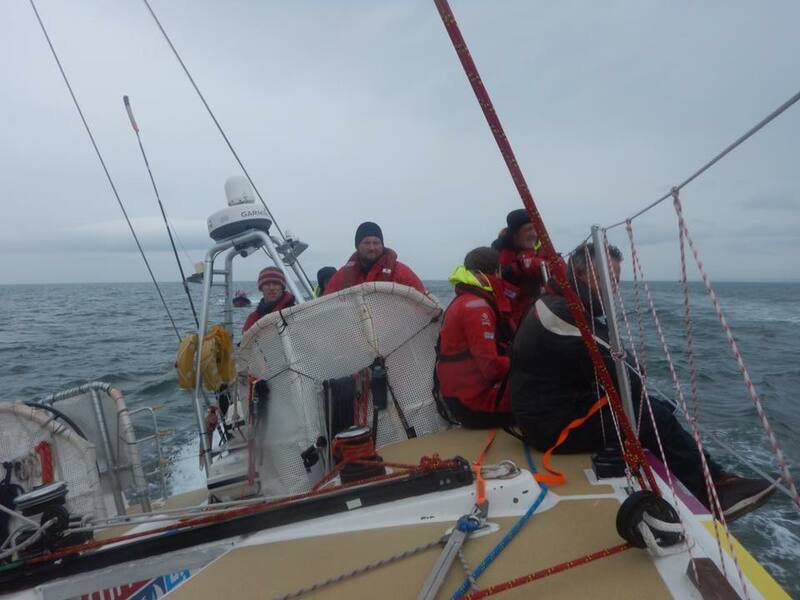 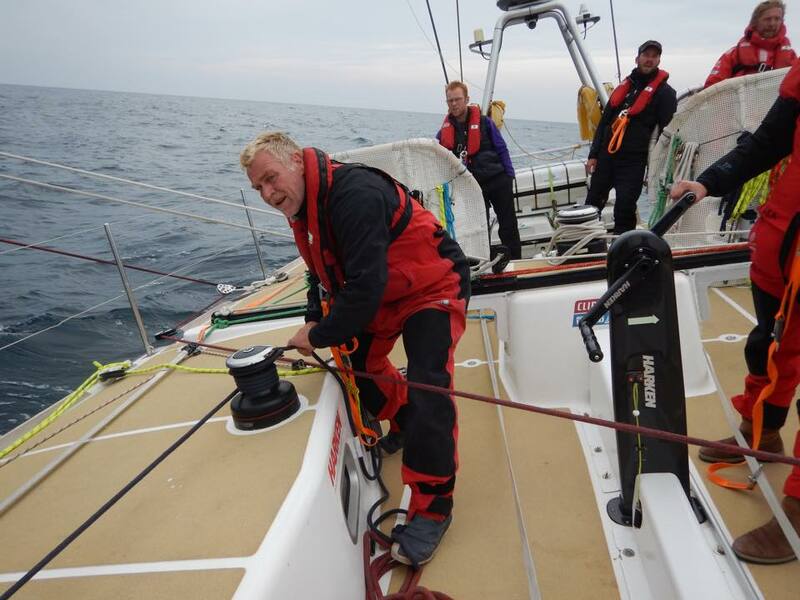 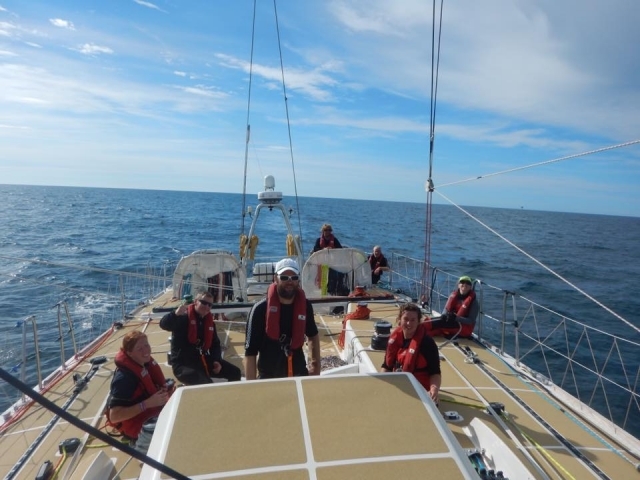 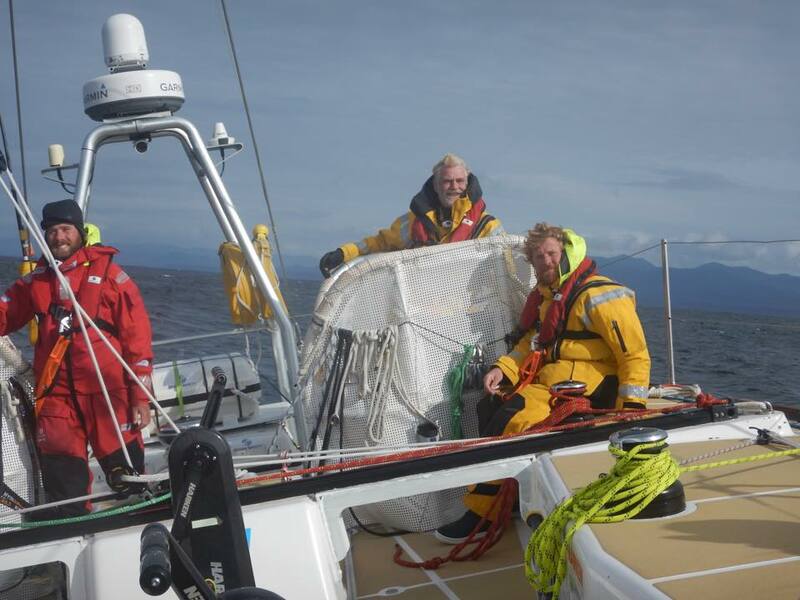 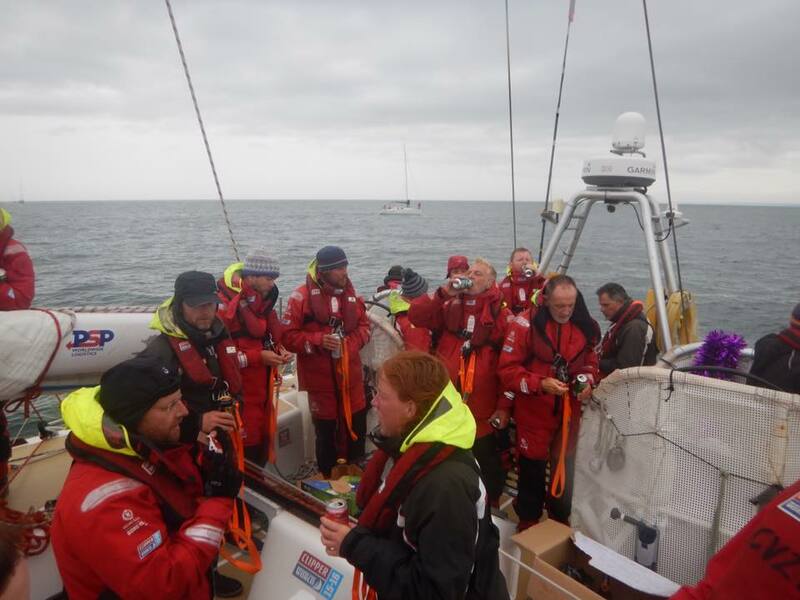 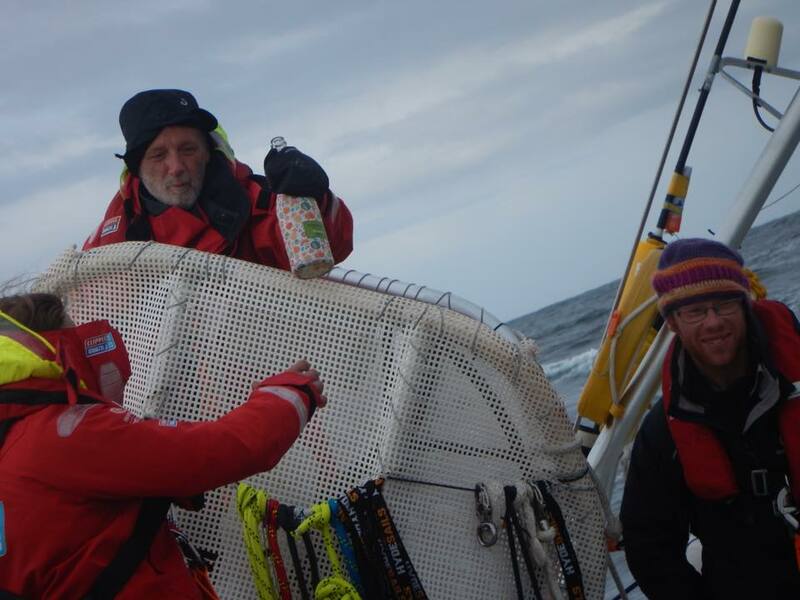 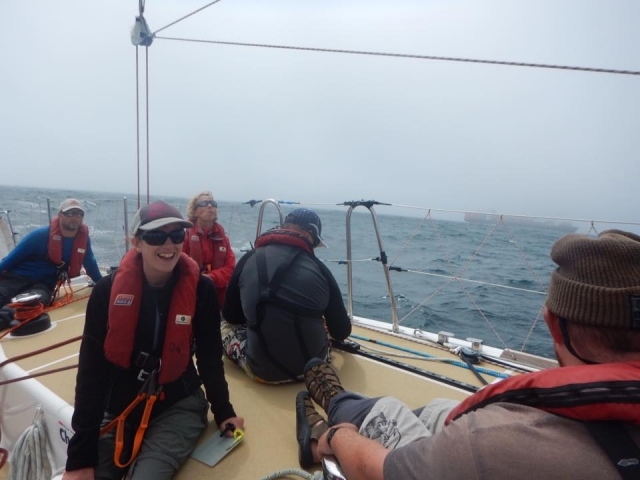 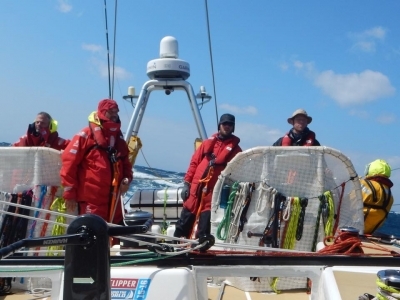 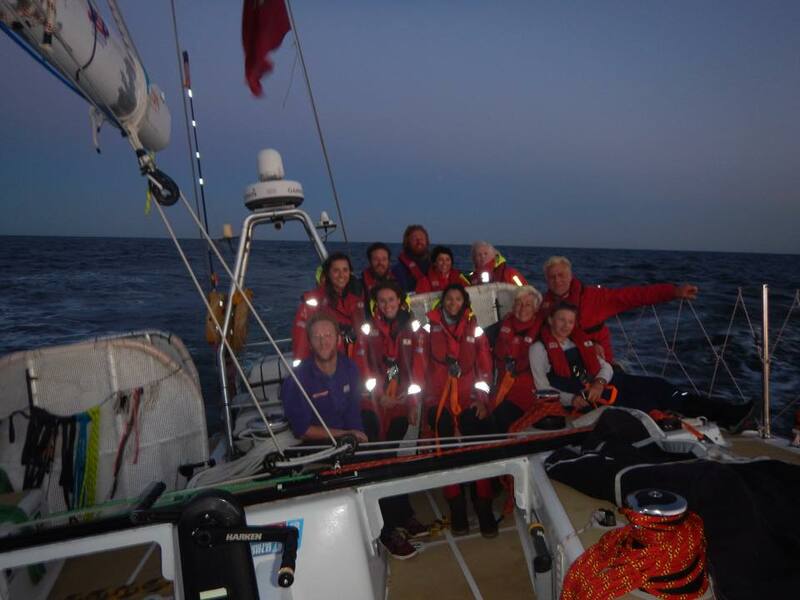 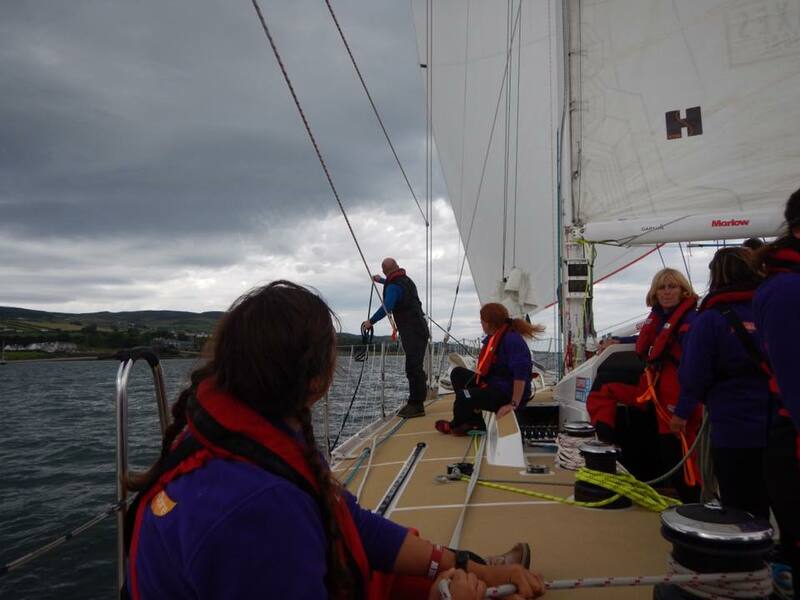 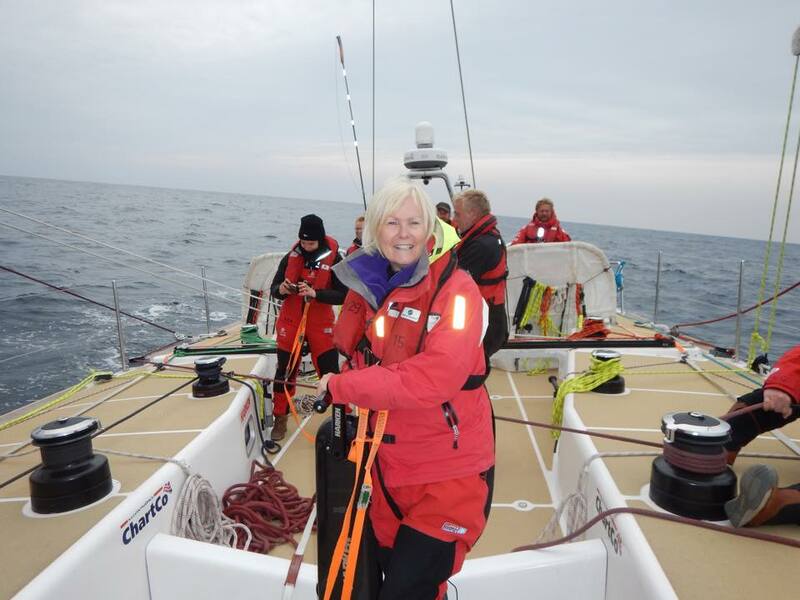 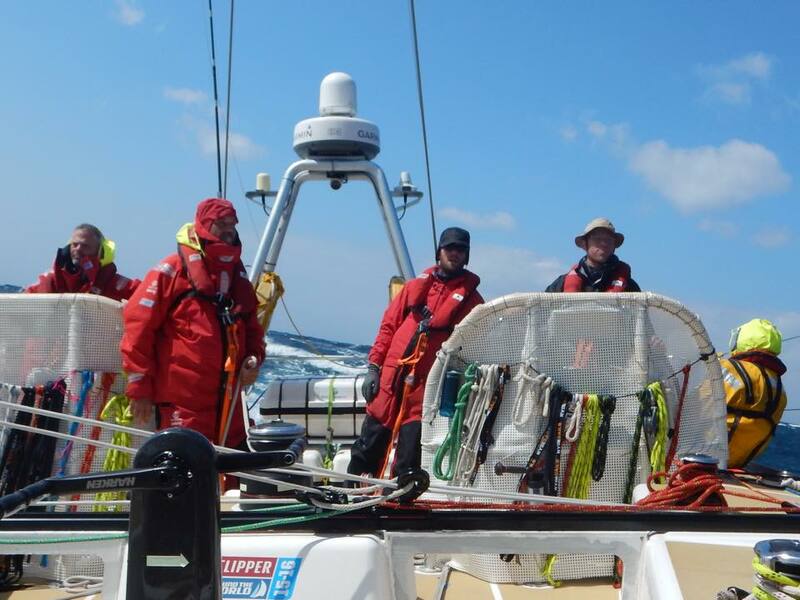 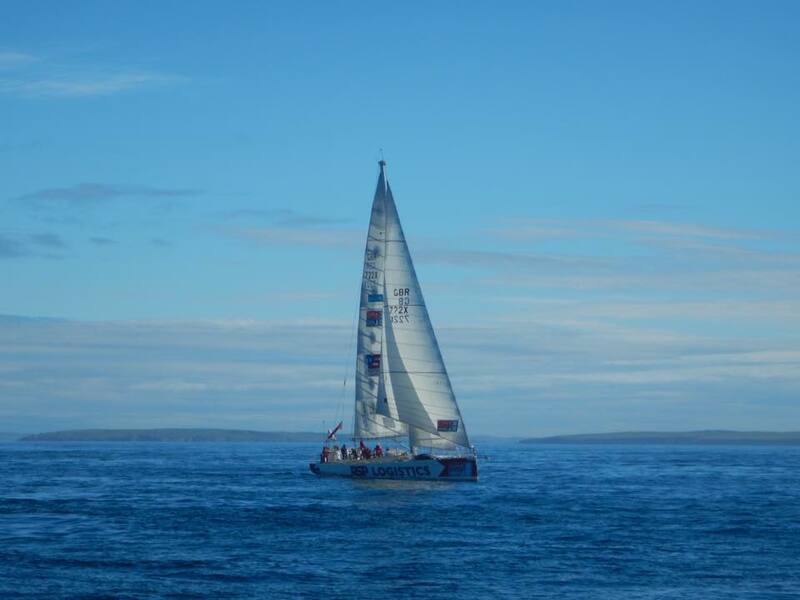 On arrival at Pentland Firth, LMax and us were leading the fleet but sadly the tide was turning and against us so we had to sit it out and wait for it to turn thus meaning that when we had finally made it out the other end the rest of the fleet had closed the gap. 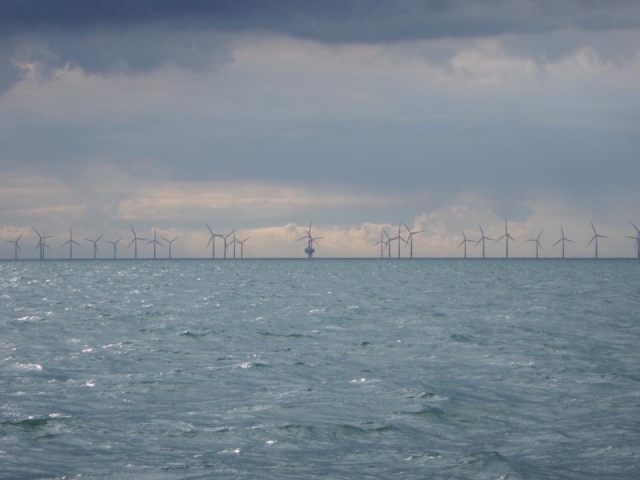 We reached the North Sea and it was so so flat! 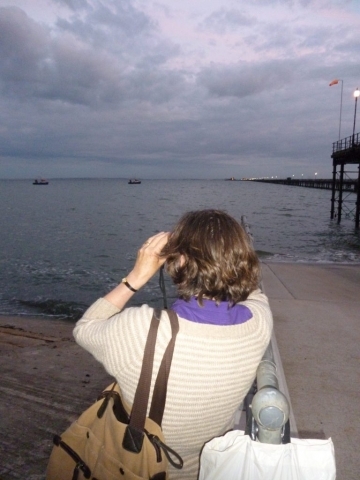 I couldn’t quite believe it as people had been worried it was to be choppy and hard going. 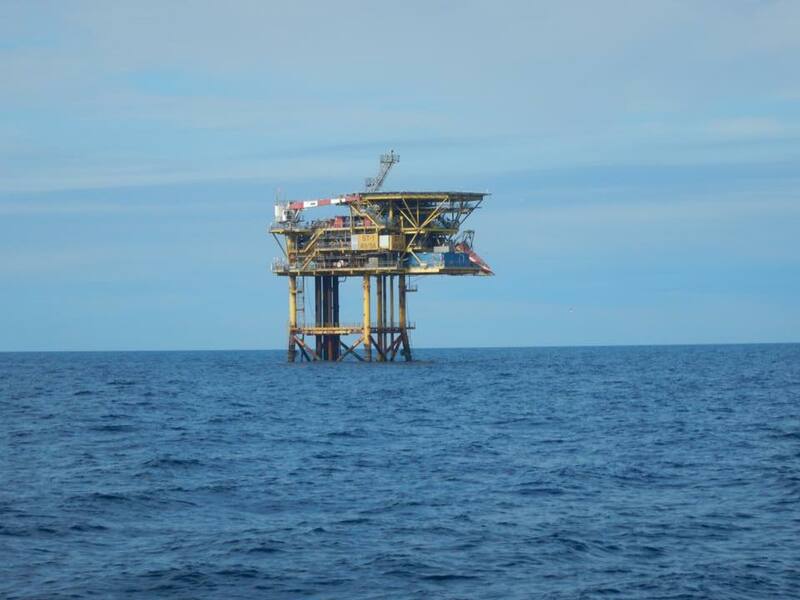 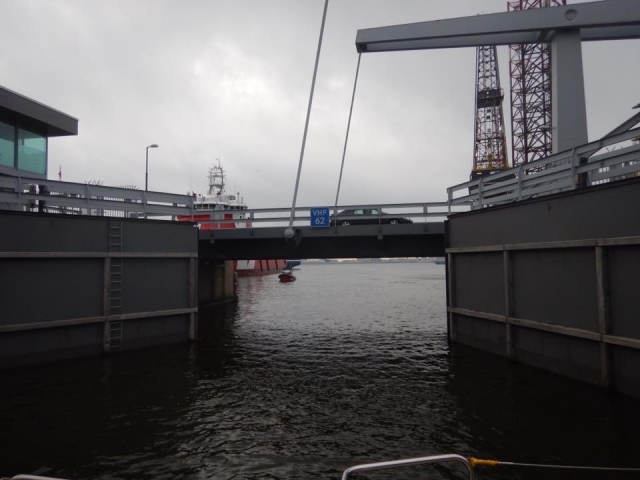 This meant we did make good progress towards Den Helder and had to weave our way through oil rigs and shipping along the way. 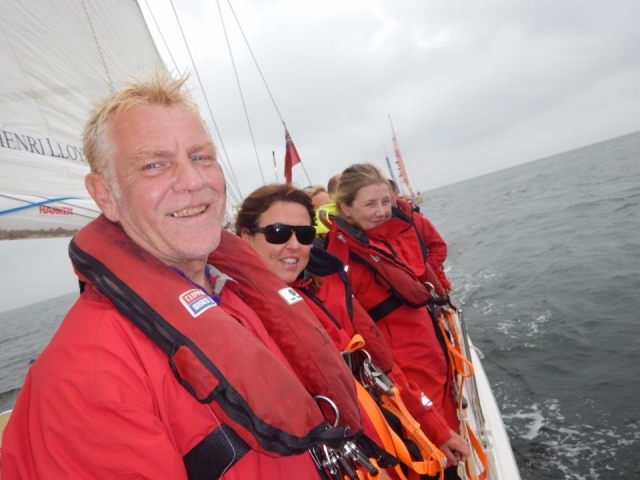 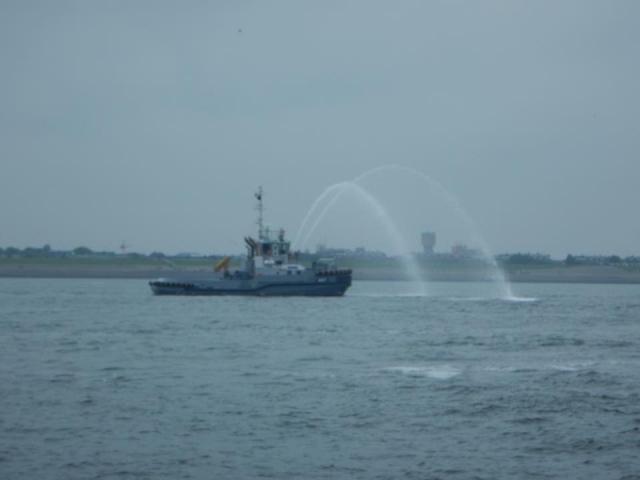 As Den Helder approached we were edging back the miles the boats had ahead of us. 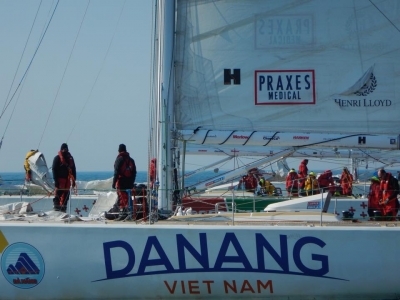 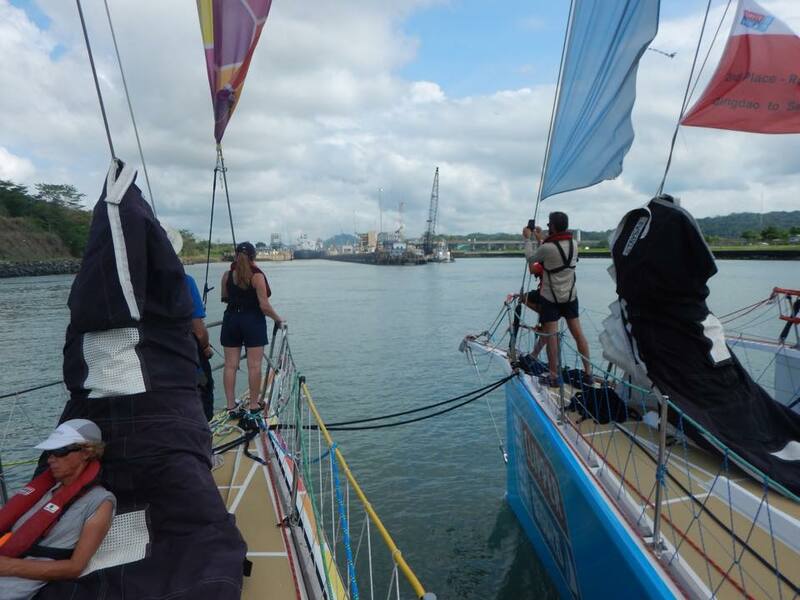 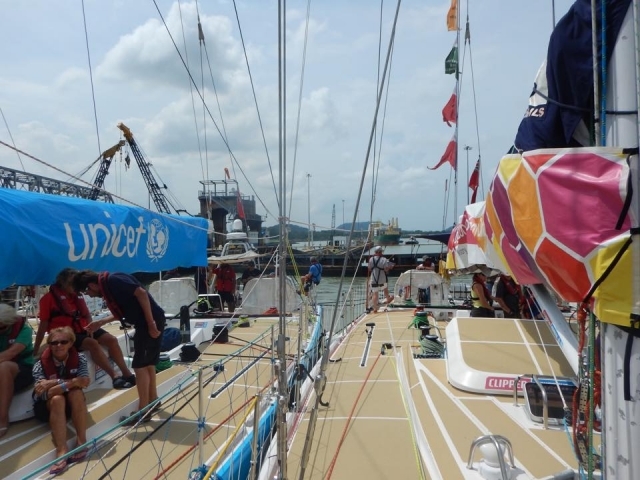 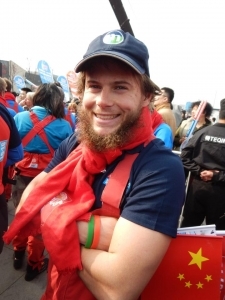 Once again we ran out of water and ended up coming in 4th with the boat ahead (Da Nang) crossing the line 3.5 miles in front of us. 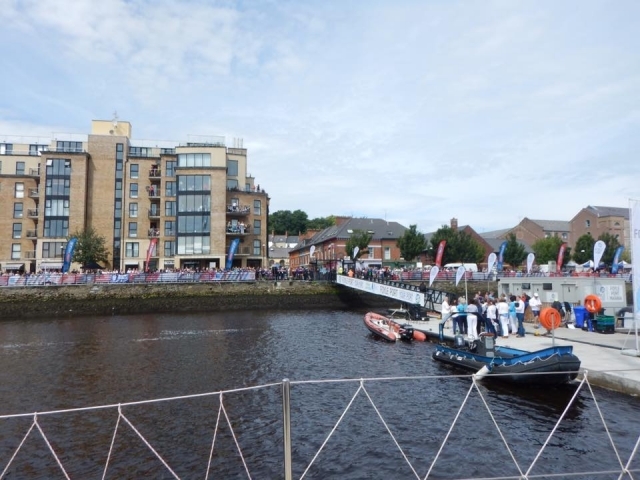 The podium boats this time were all teams who haven’t frequented the podium much this year and the excitement from those teams on their achievements was overwhelming. 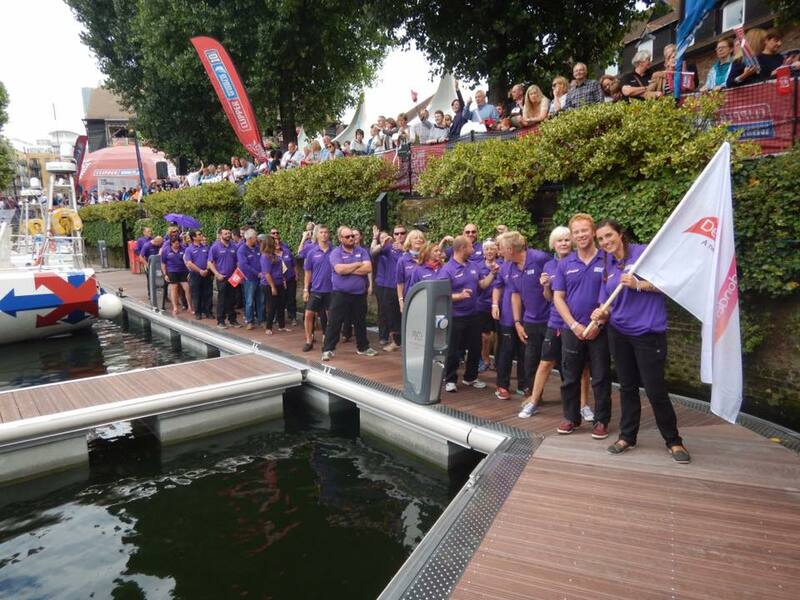 Although we didn’t make the podium, our place in front of LMax and GB means that, no matter what our result in the final race, we will come 2nd overall. 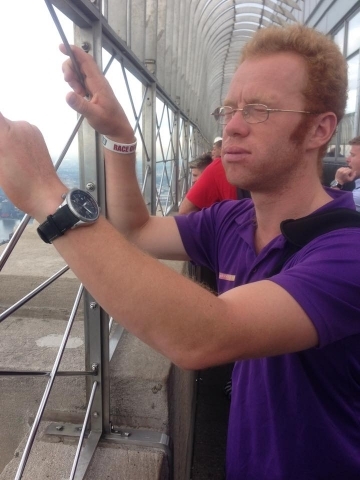 This is a mega achievement. This is the last stopover and I’m in denial still that this time next week my Clipper race will be over. 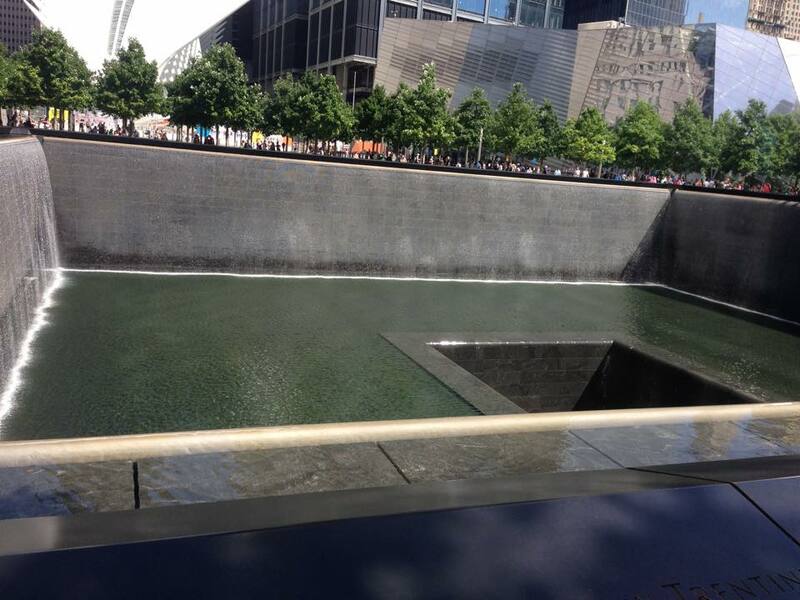 It’s an odd feeling and I’m not sure yet how I will feel when it’s gone. What does life hold for me? I’ve got one race left and maybe sometime during that I will have the epiphany I’ve been hoping for as to what comes next! Can’t wait to see lots of you in London on Saturday (30 July) – no idea how many of you are coming so thank you in advance! 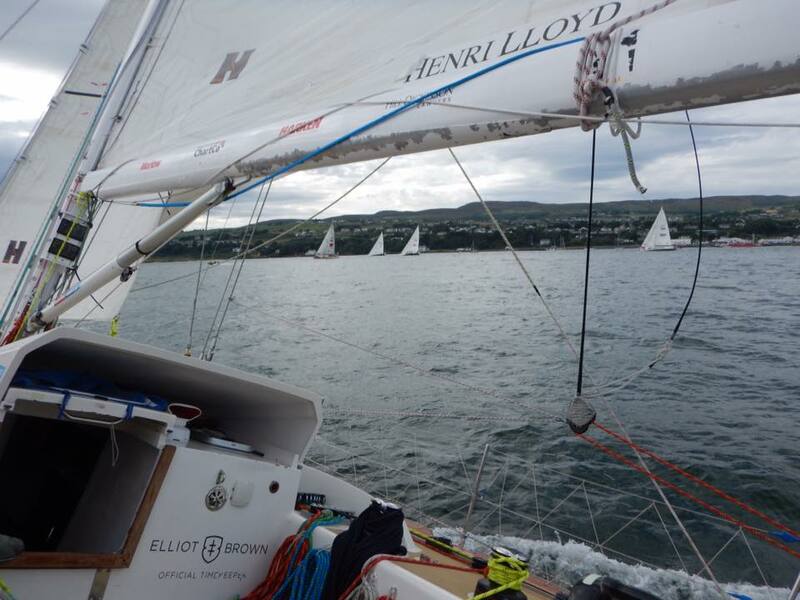 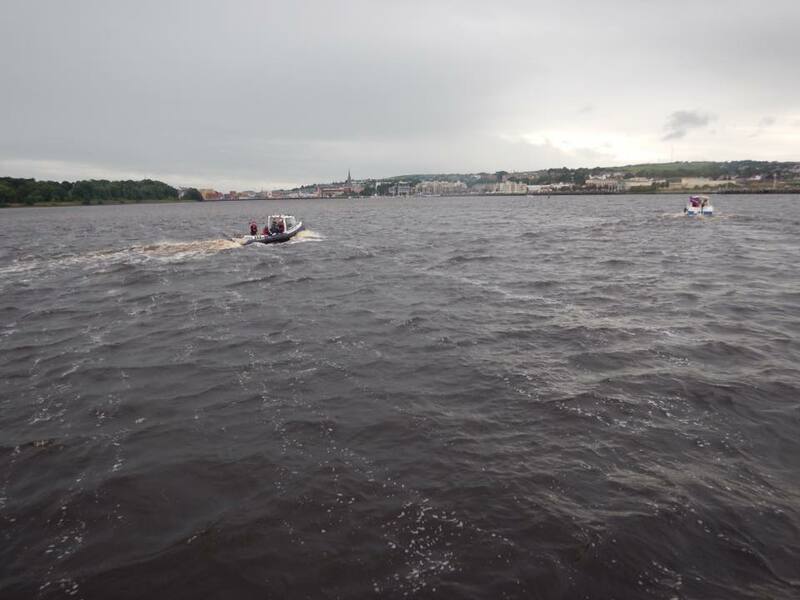 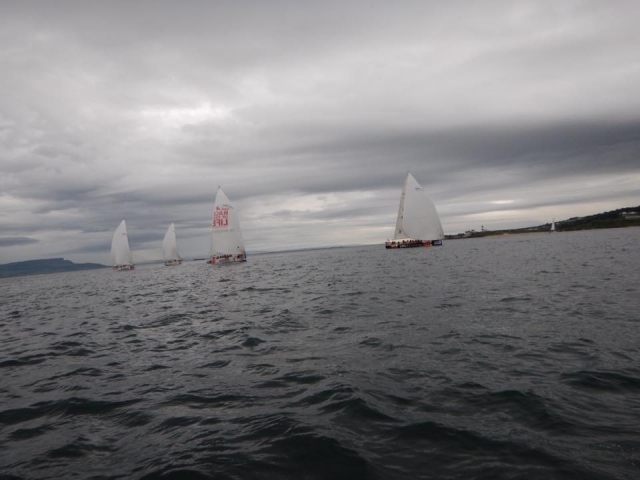 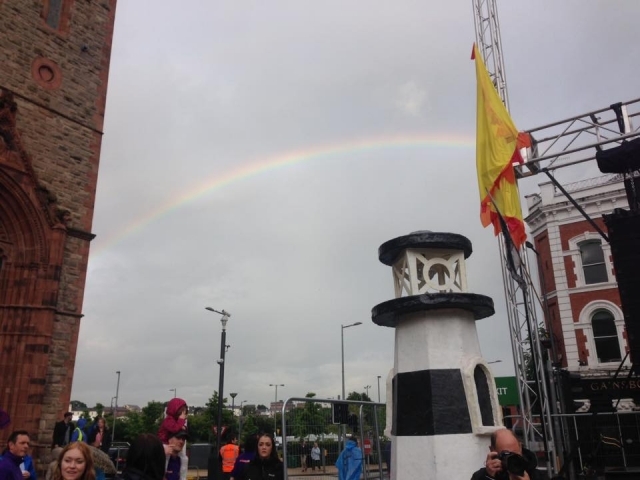 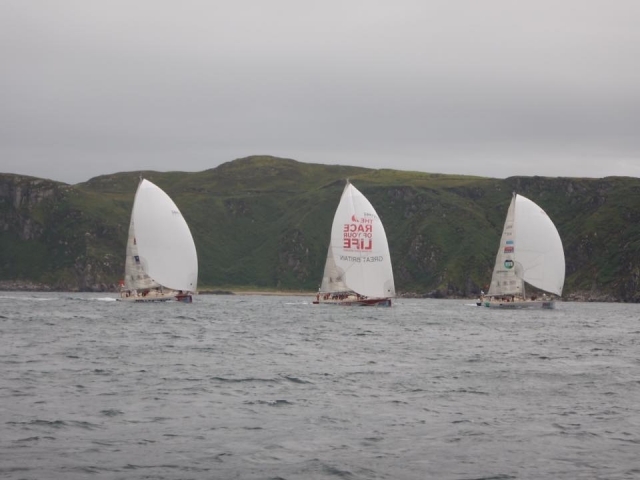 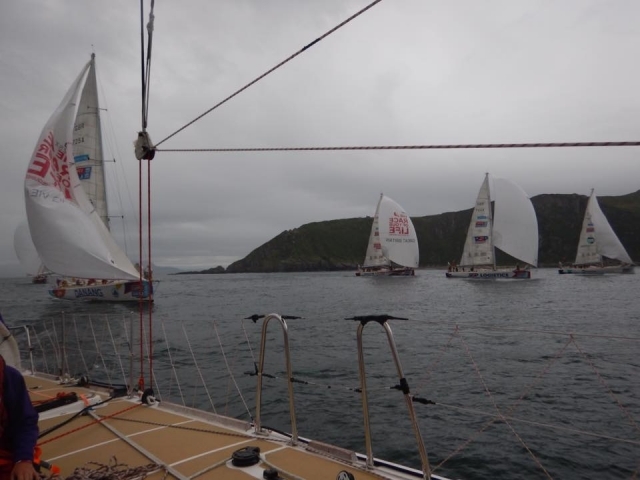 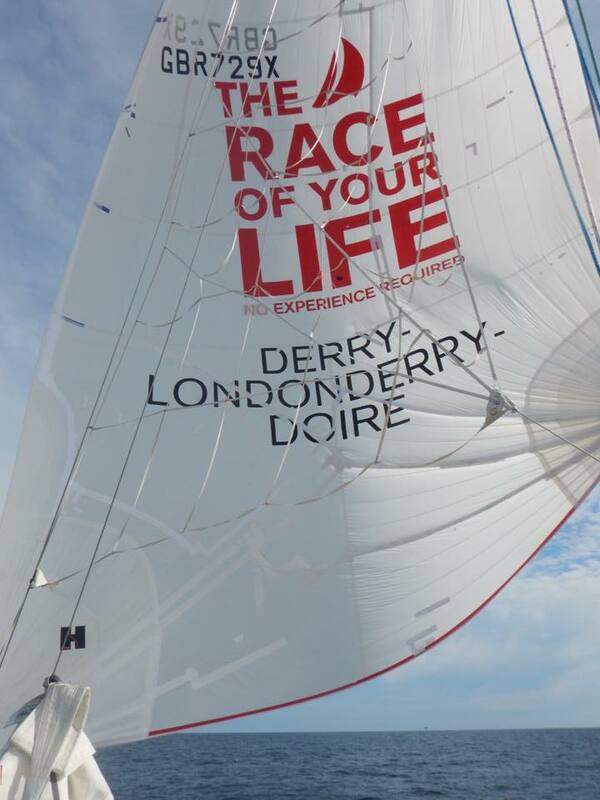 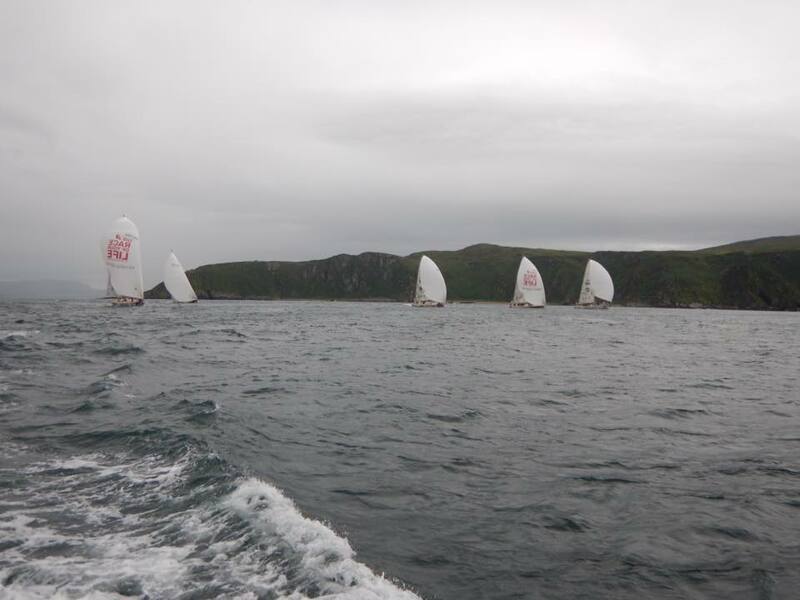 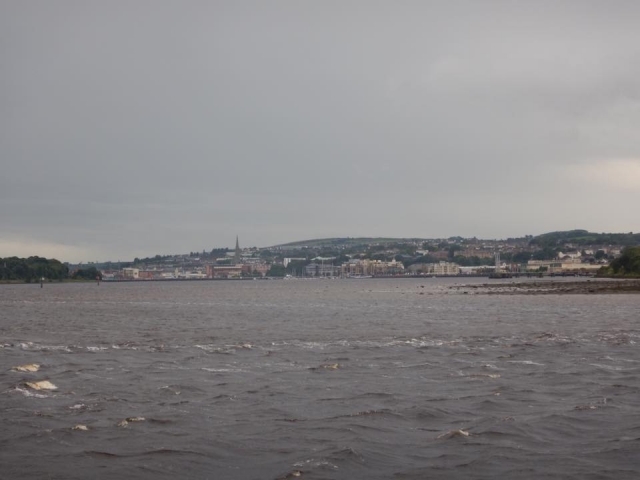 Race 12 marked the beginning of Leg 8 and was entitled the LegenDerry Finale. 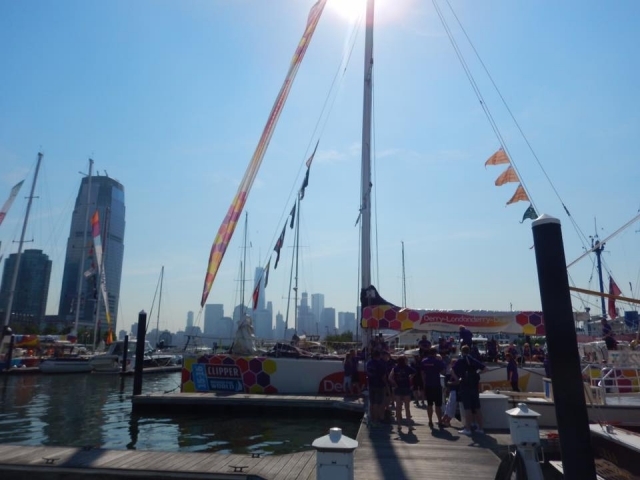 Leaving New York brought about mixed emotions for me as the race is in fact the beginning of the end to my Clipper journey which I not sure I’m fully ready for. 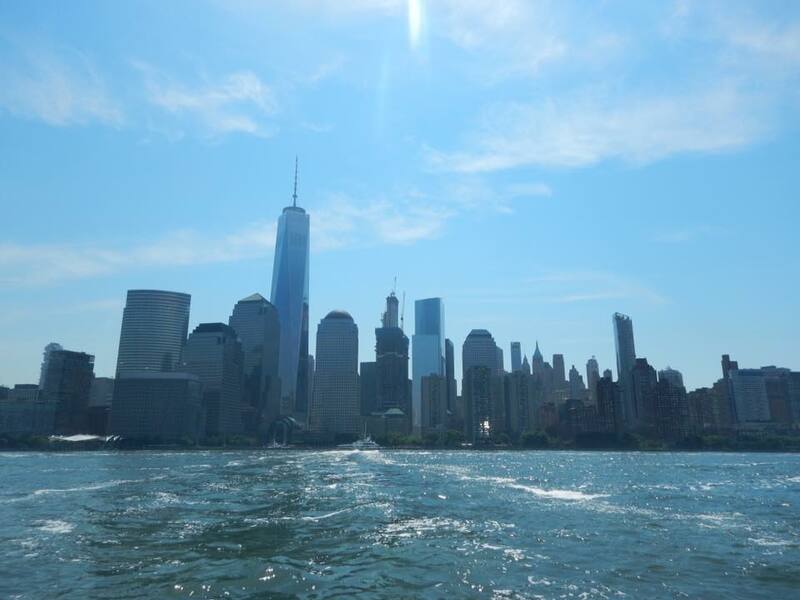 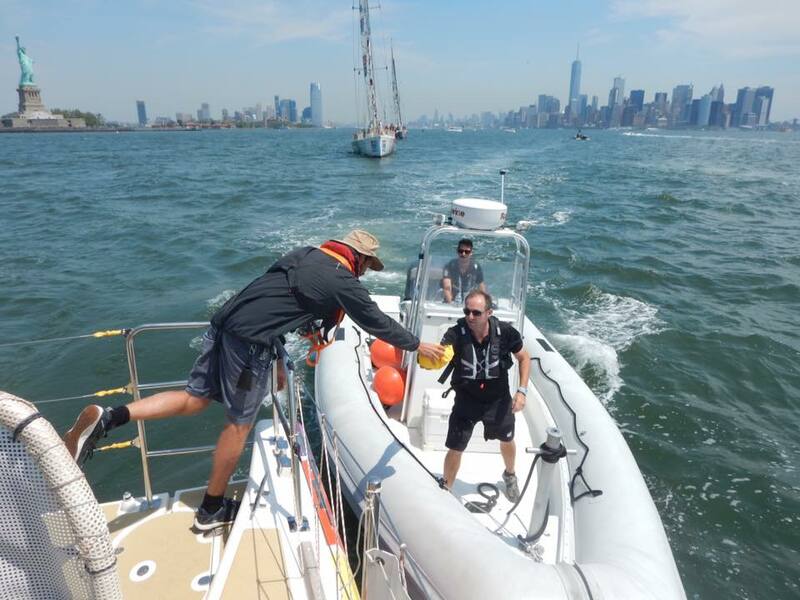 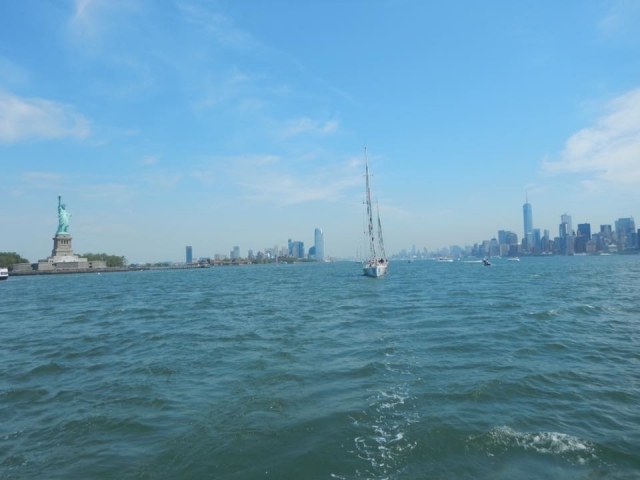 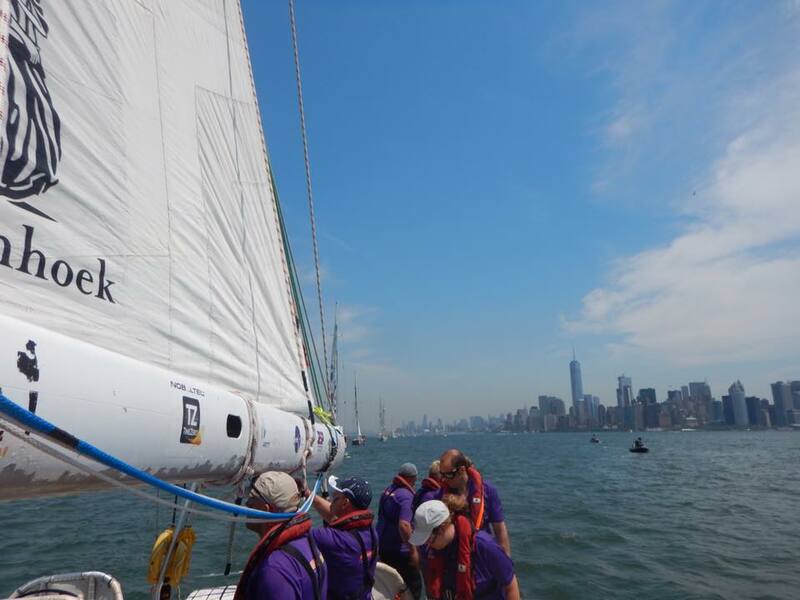 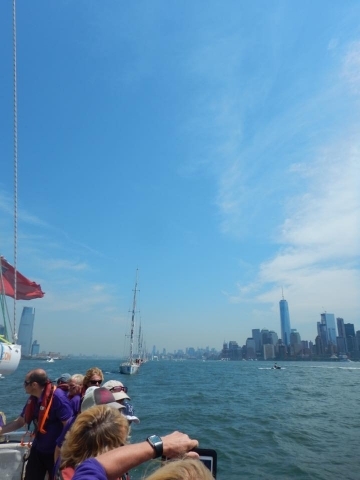 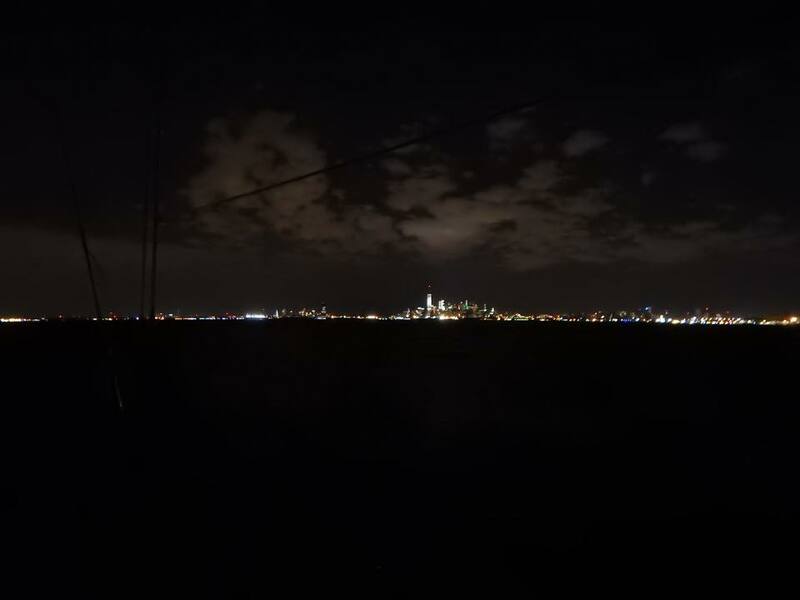 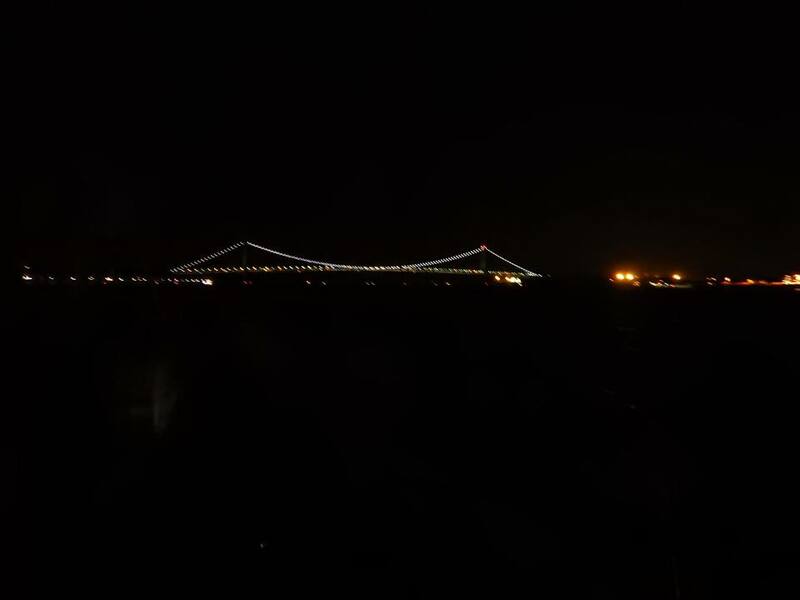 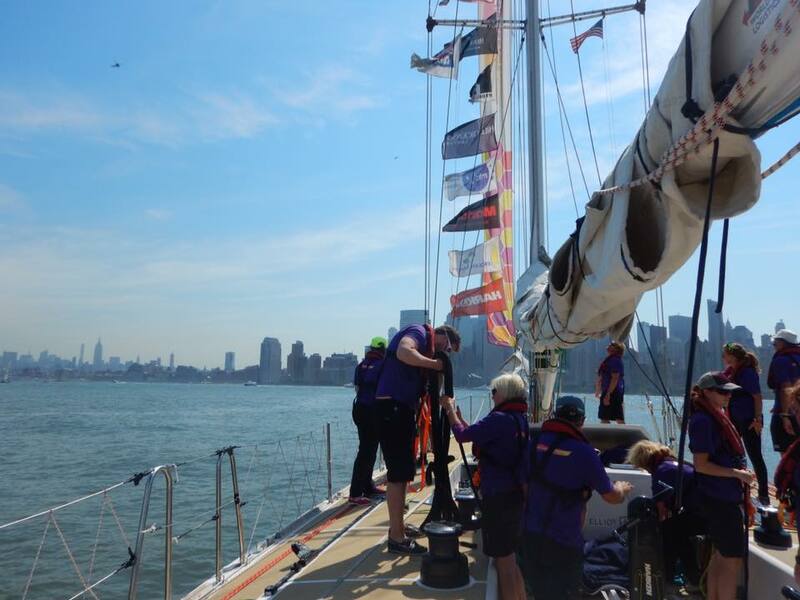 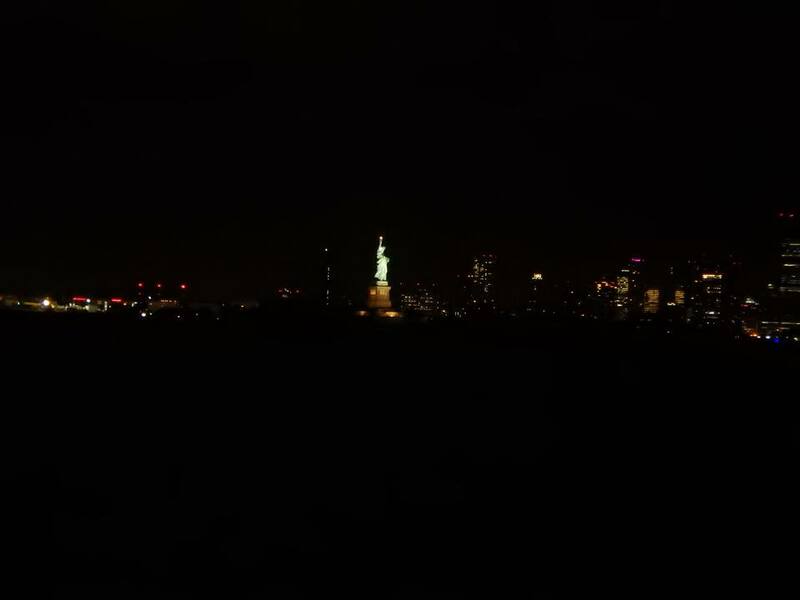 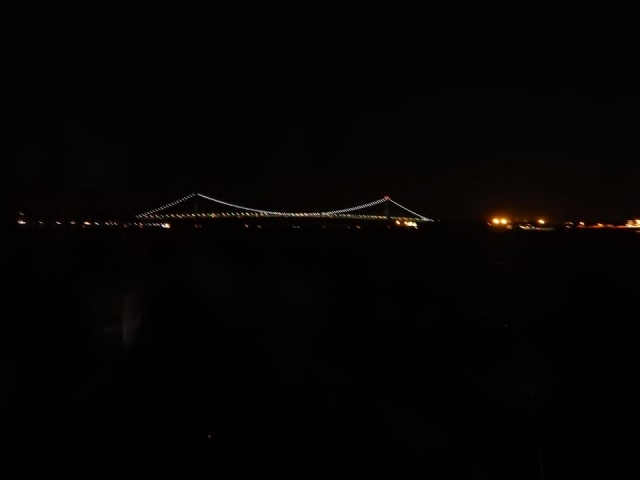 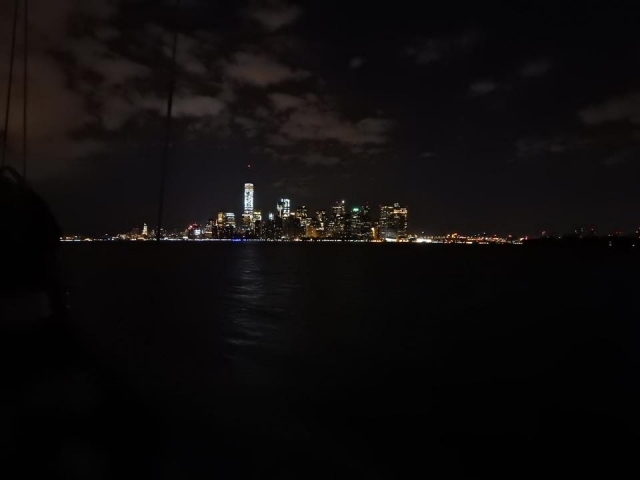 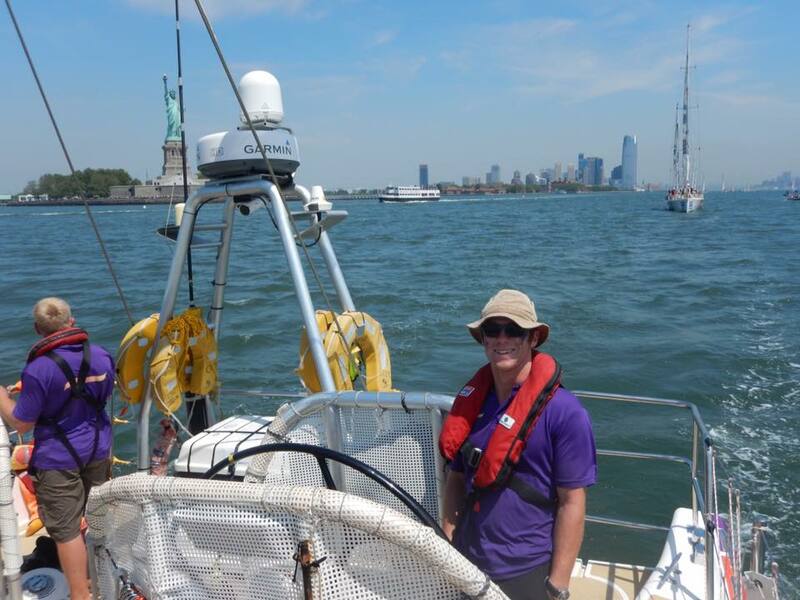 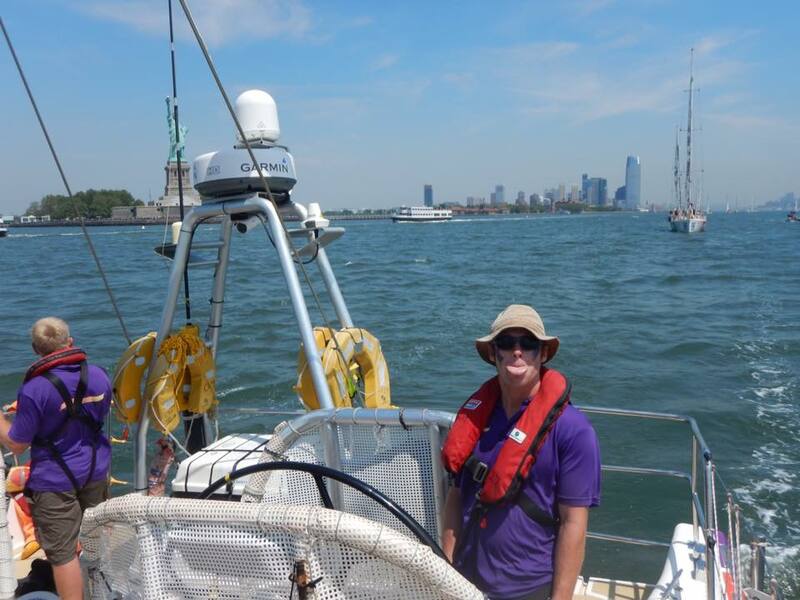 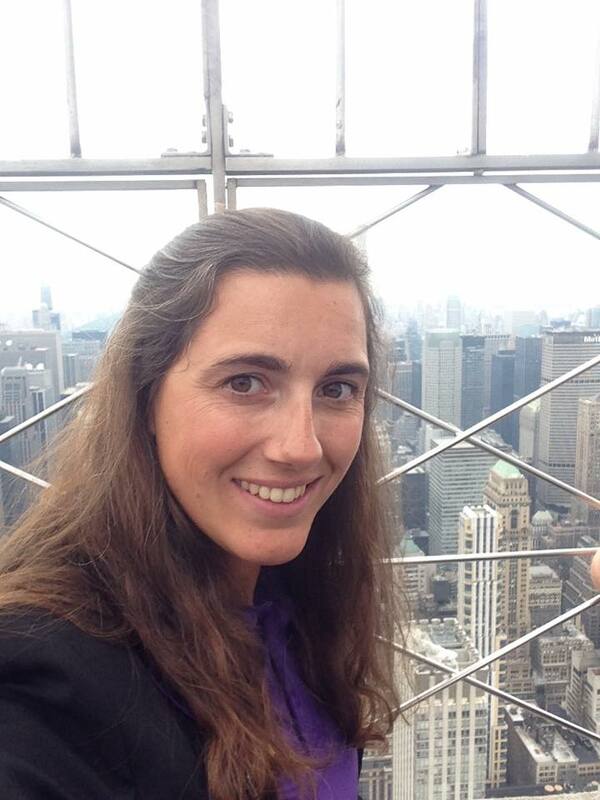 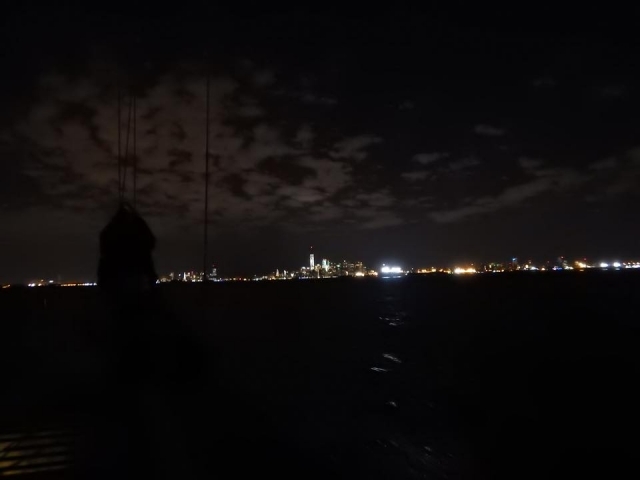 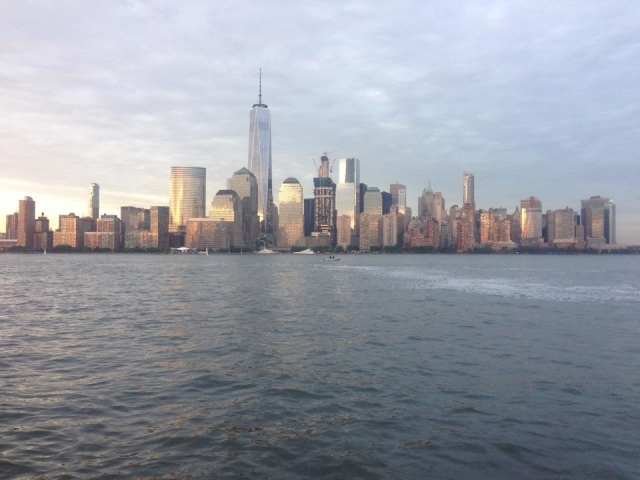 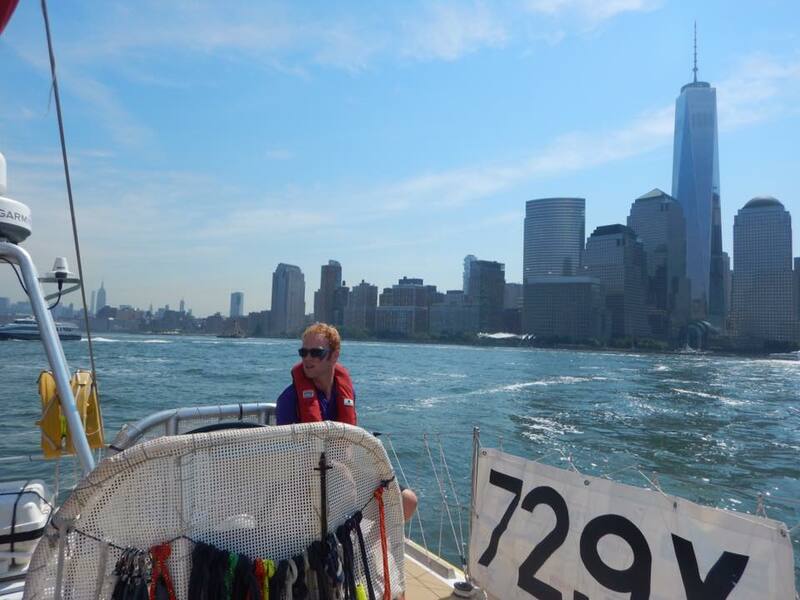 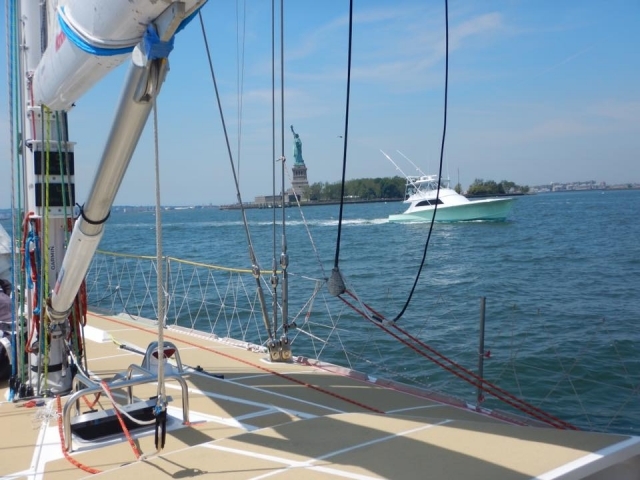 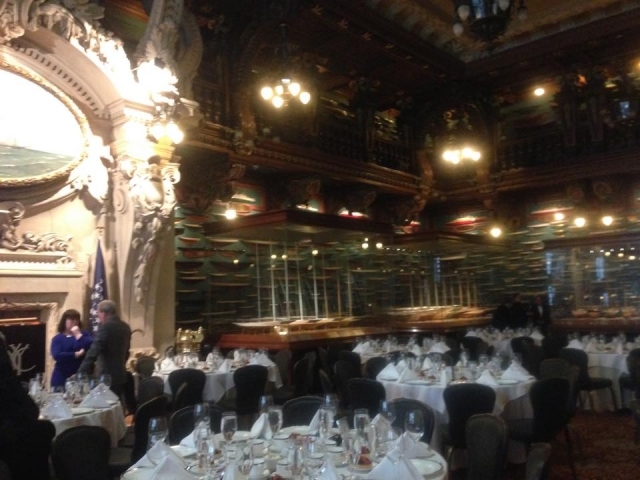 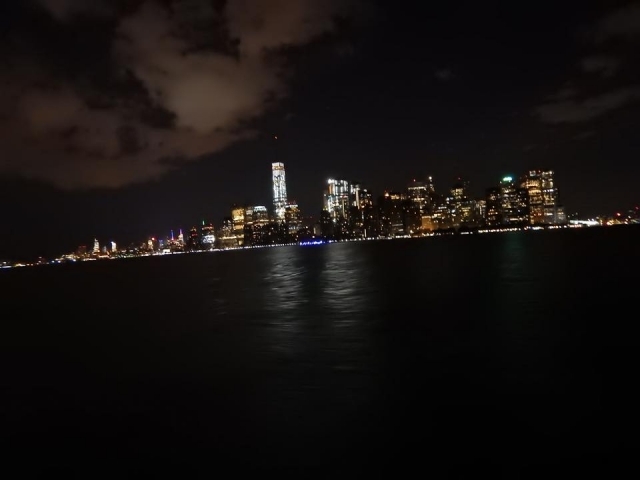 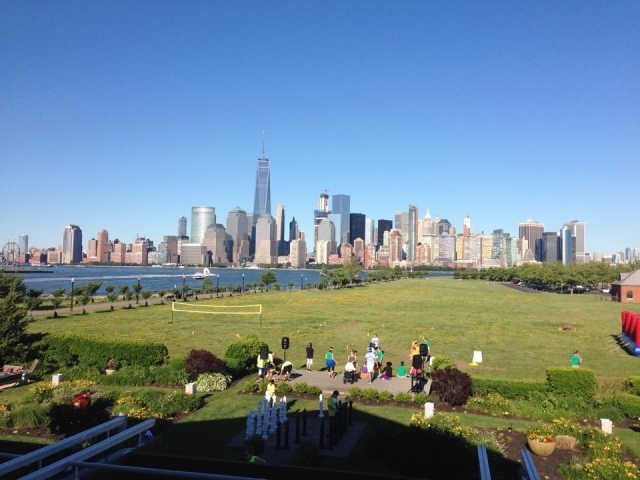 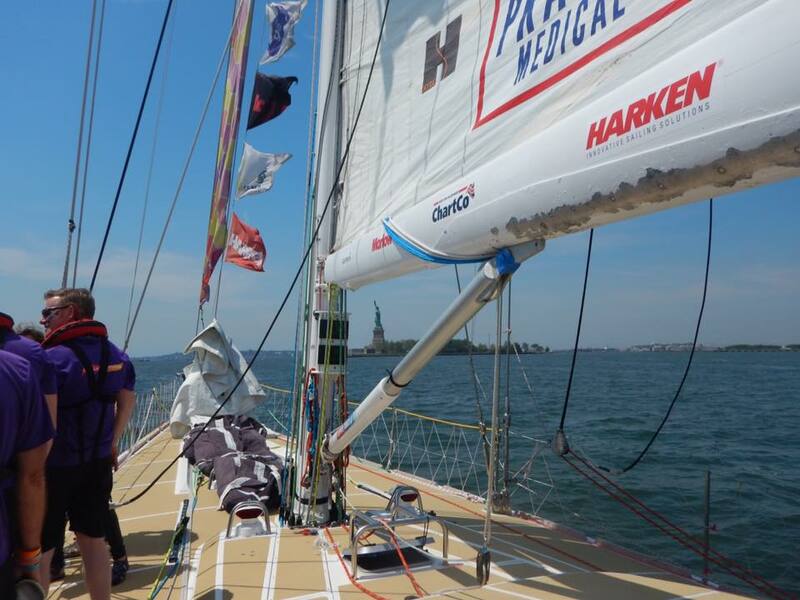 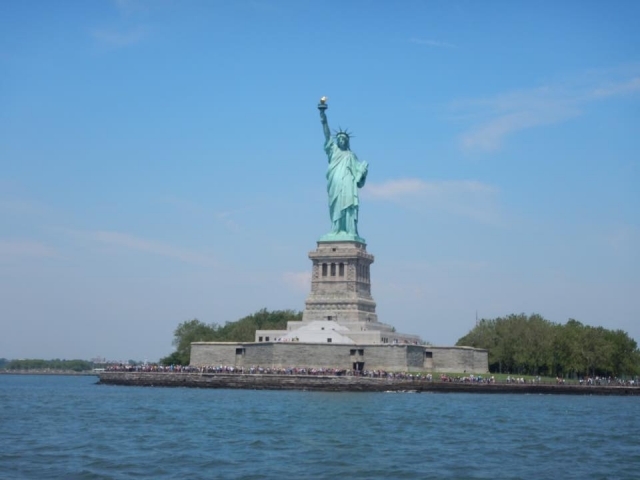 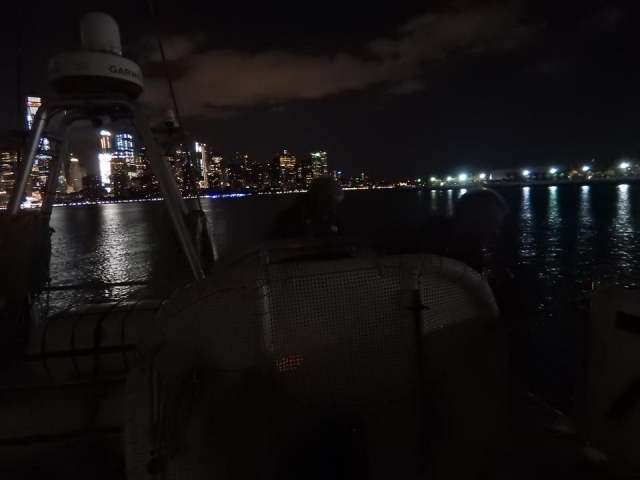 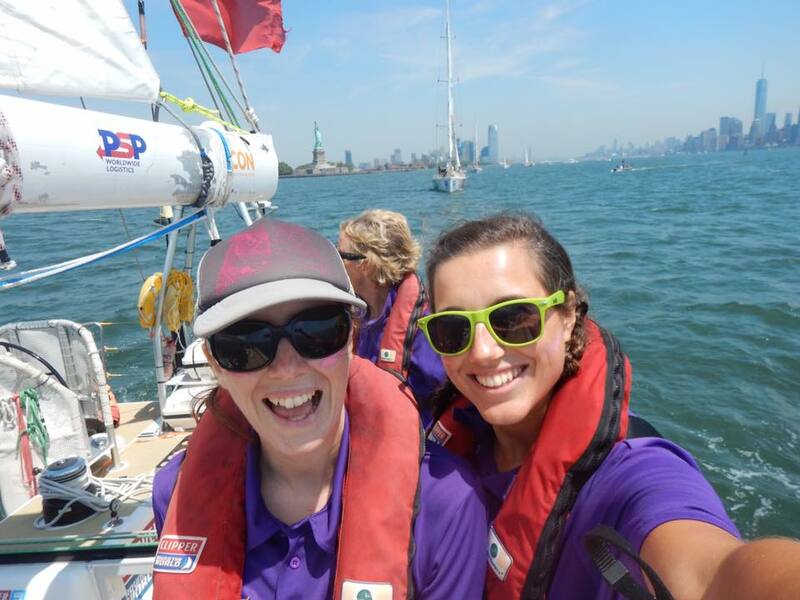 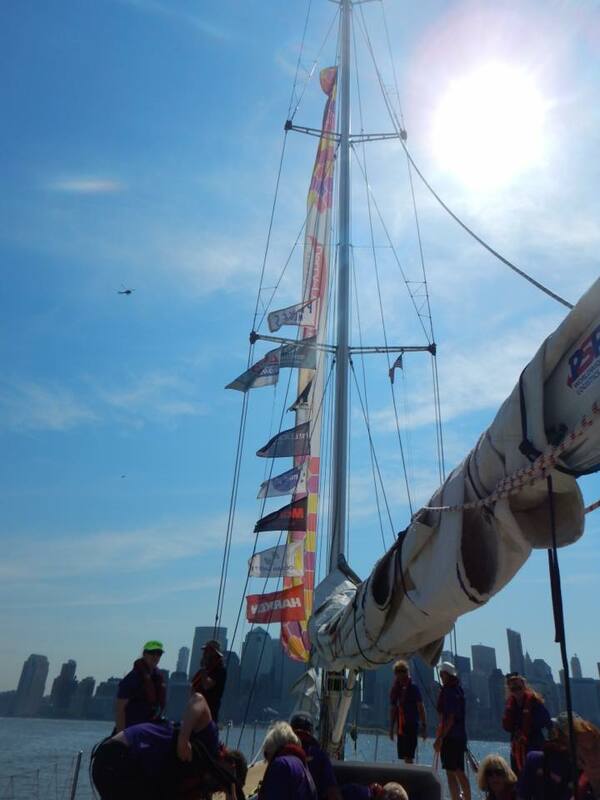 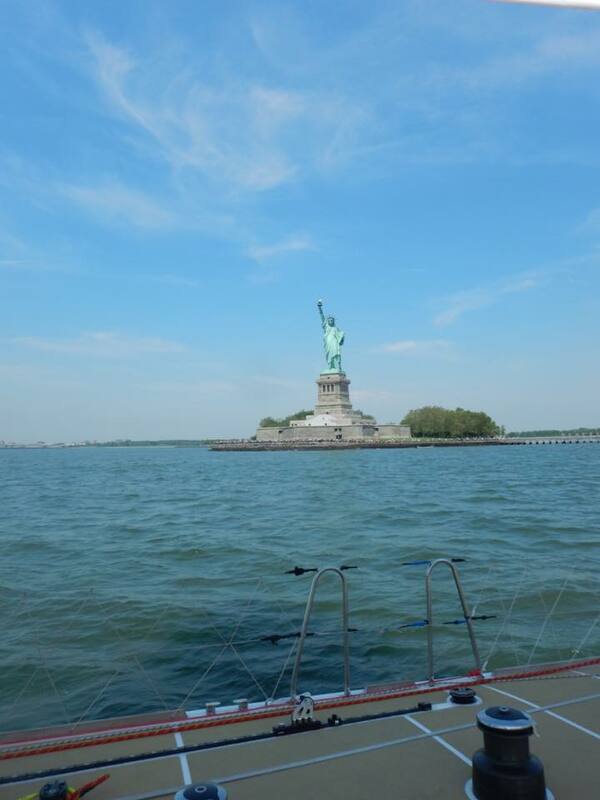 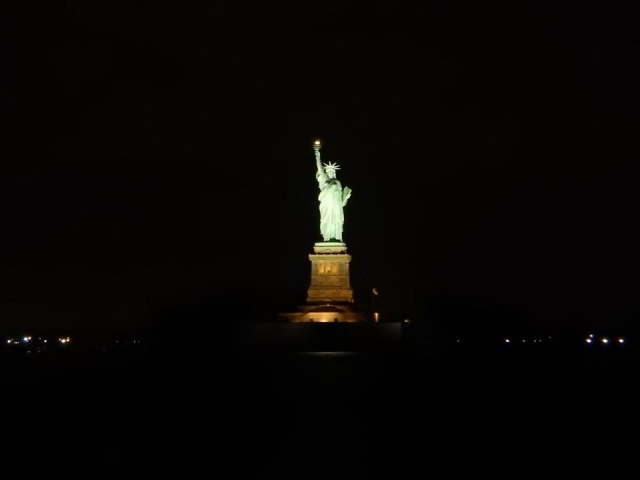 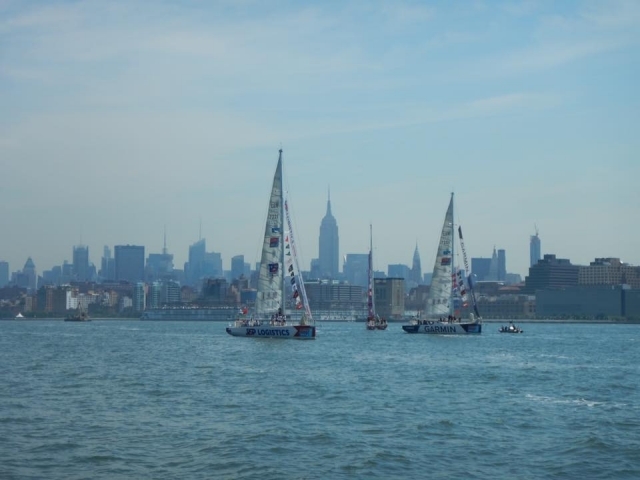 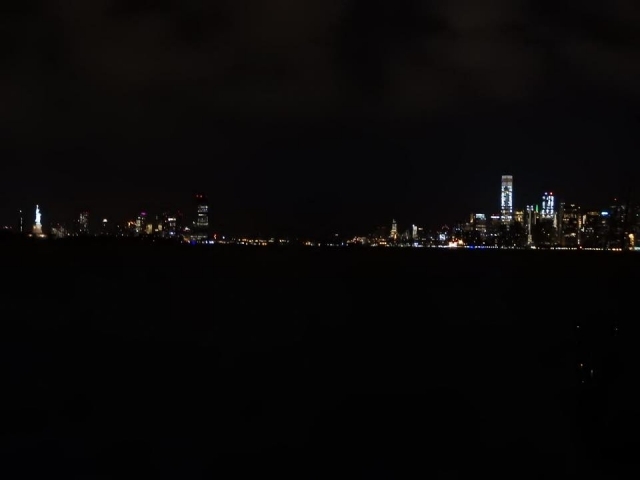 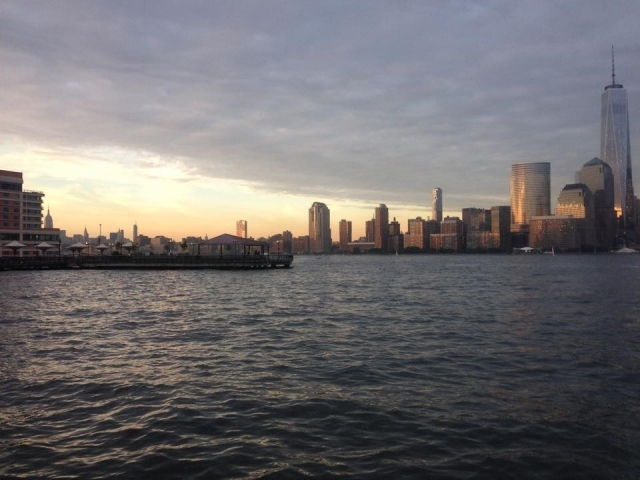 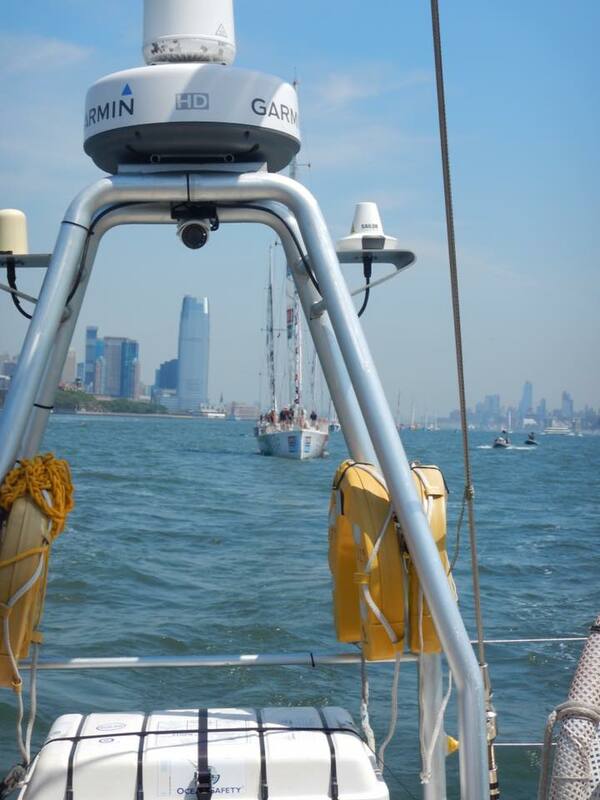 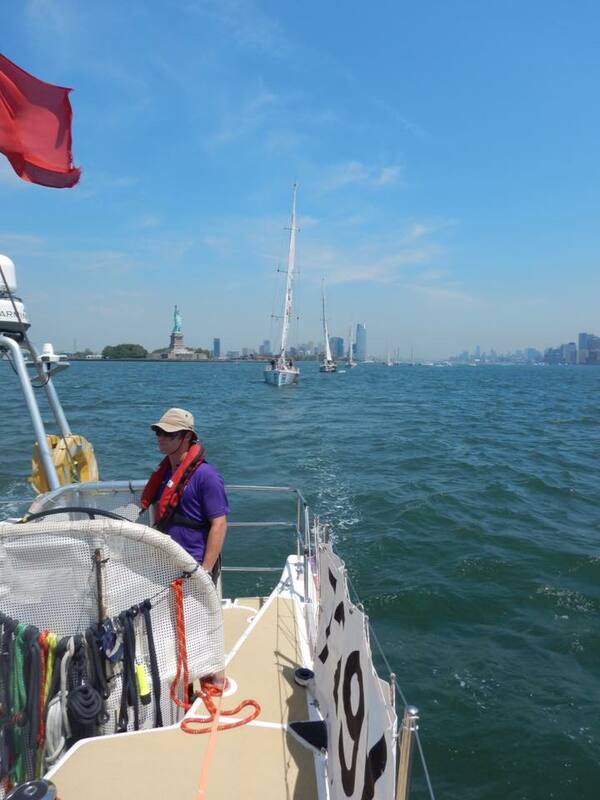 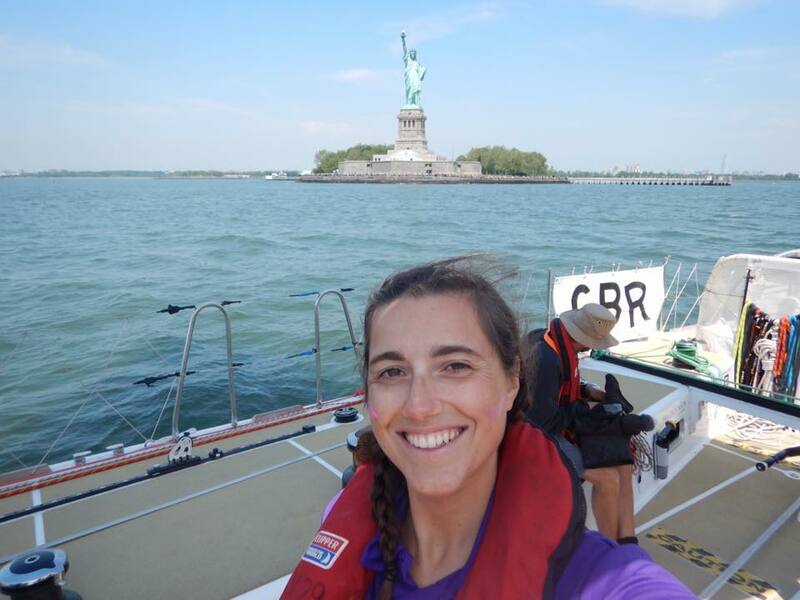 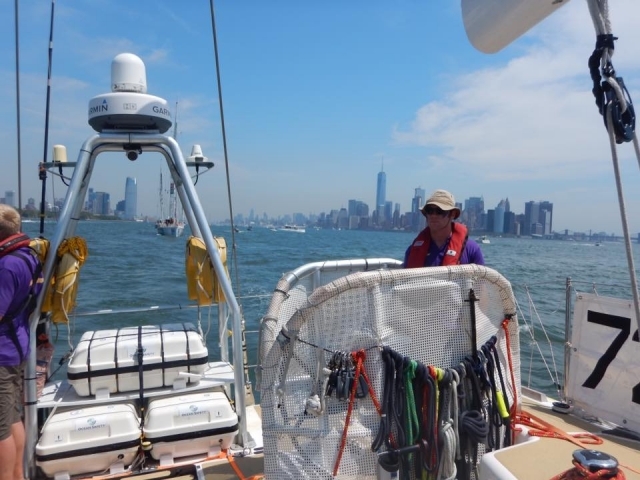 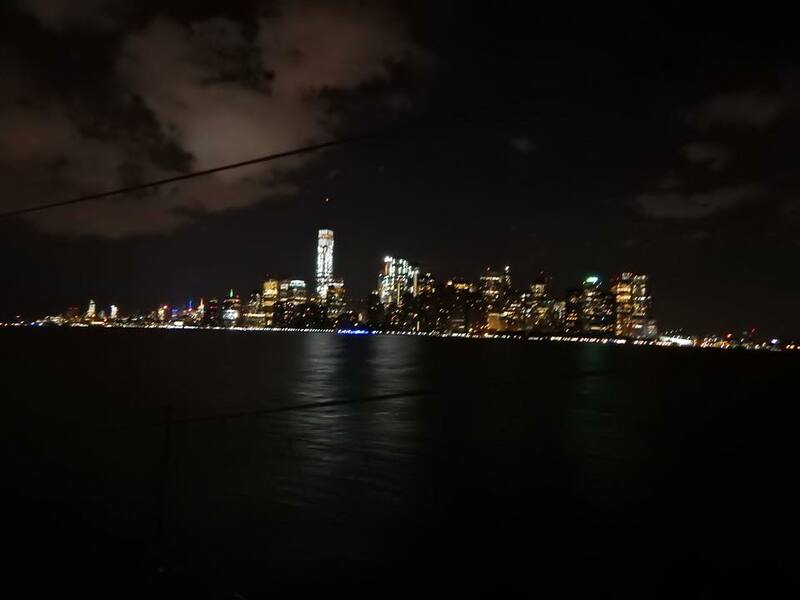 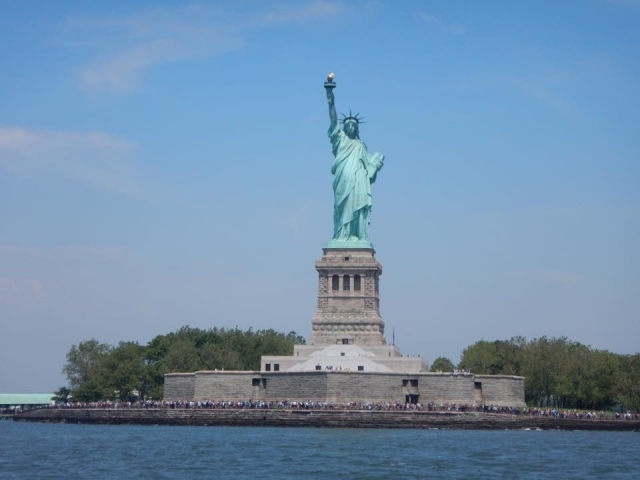 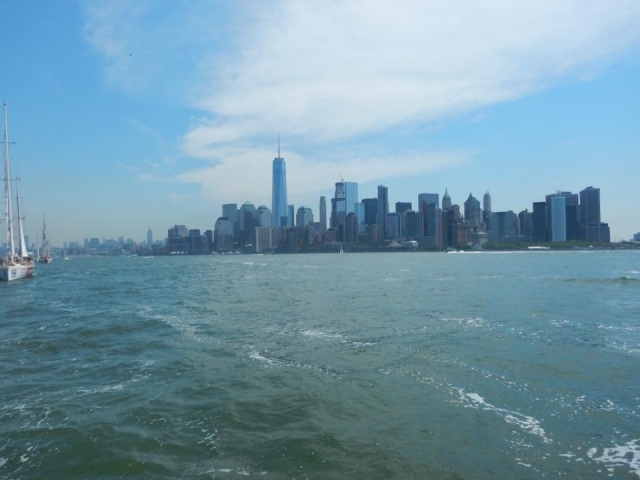 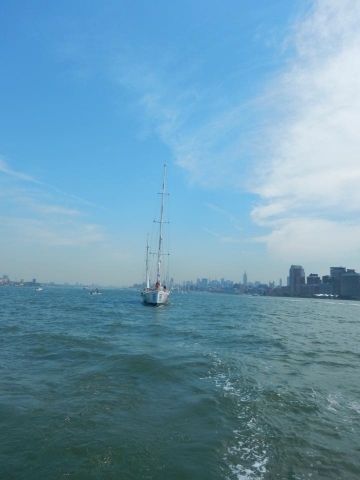 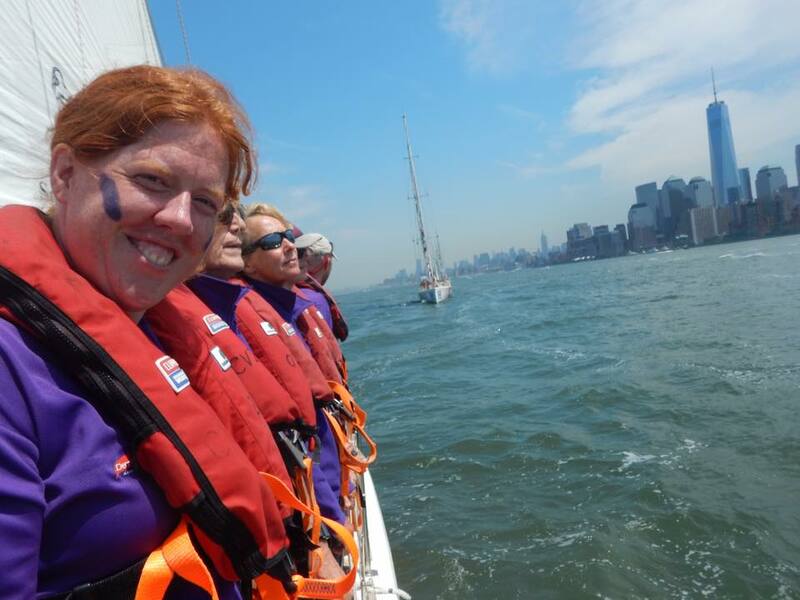 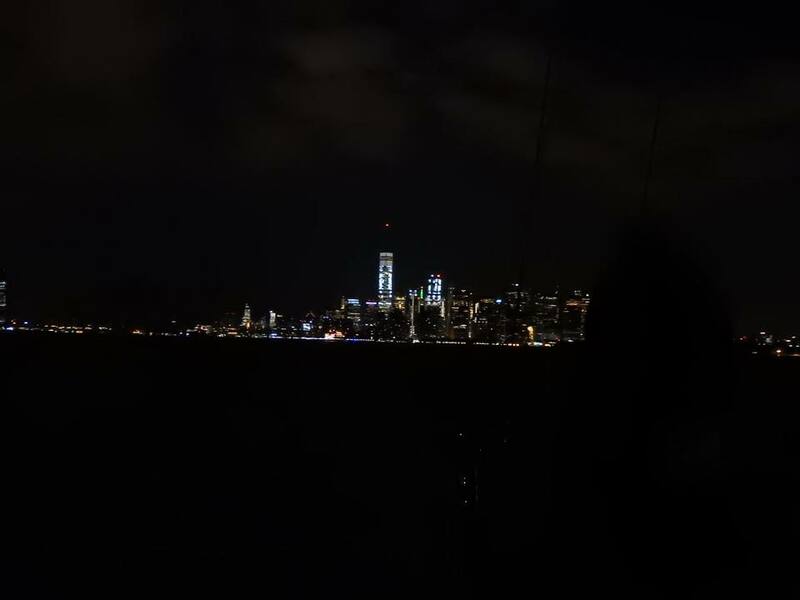 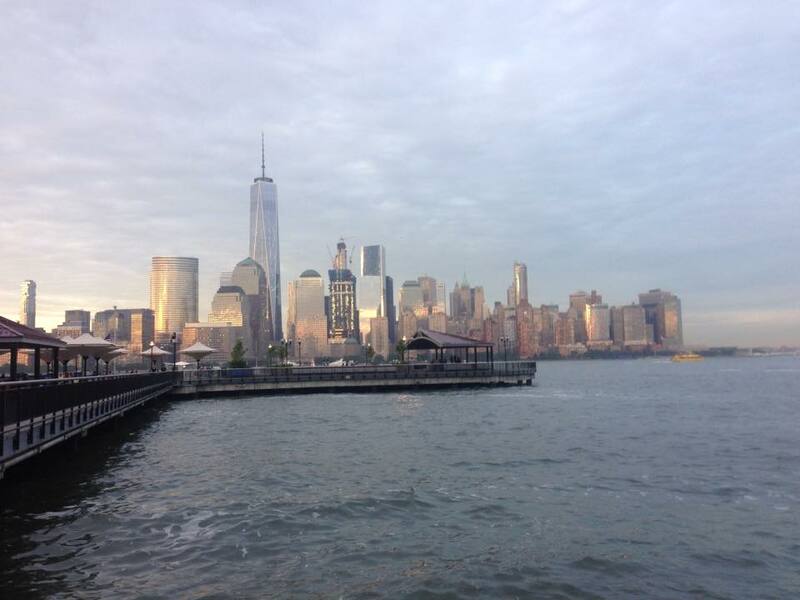 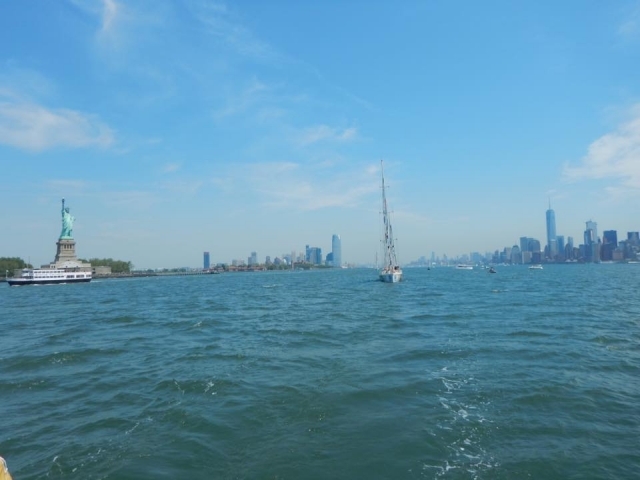 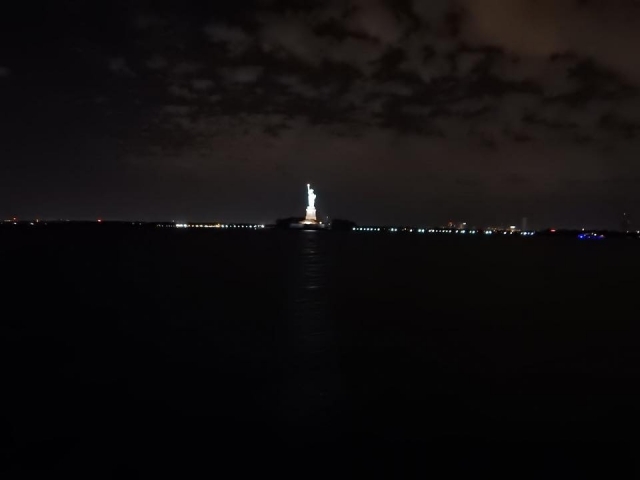 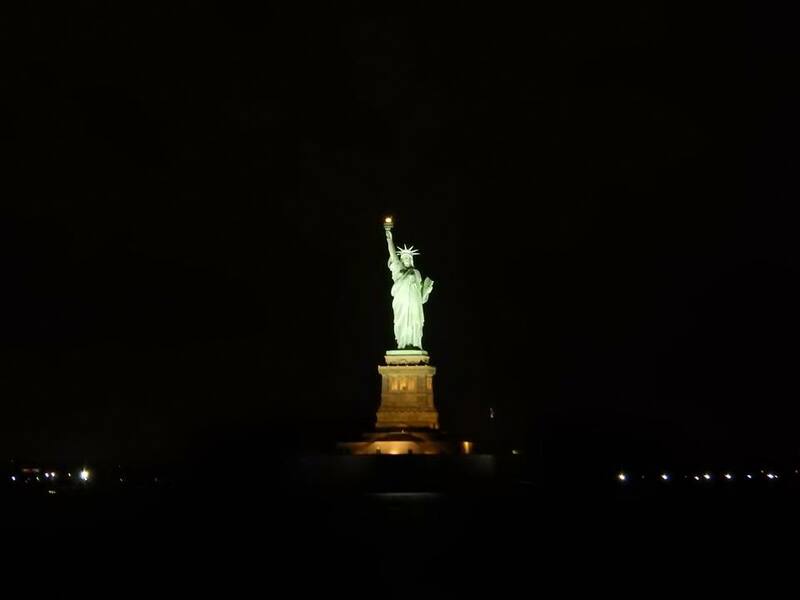 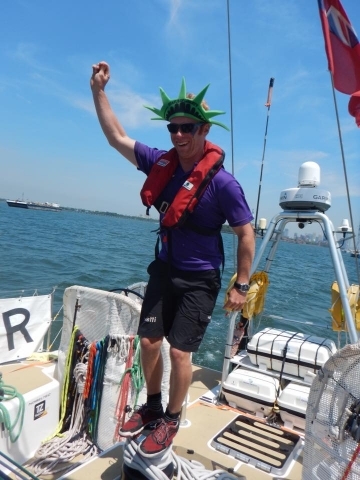 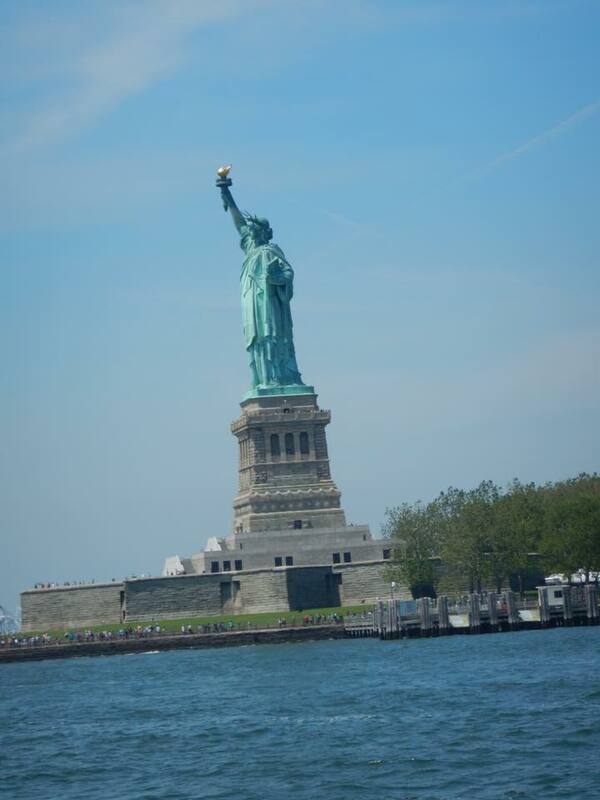 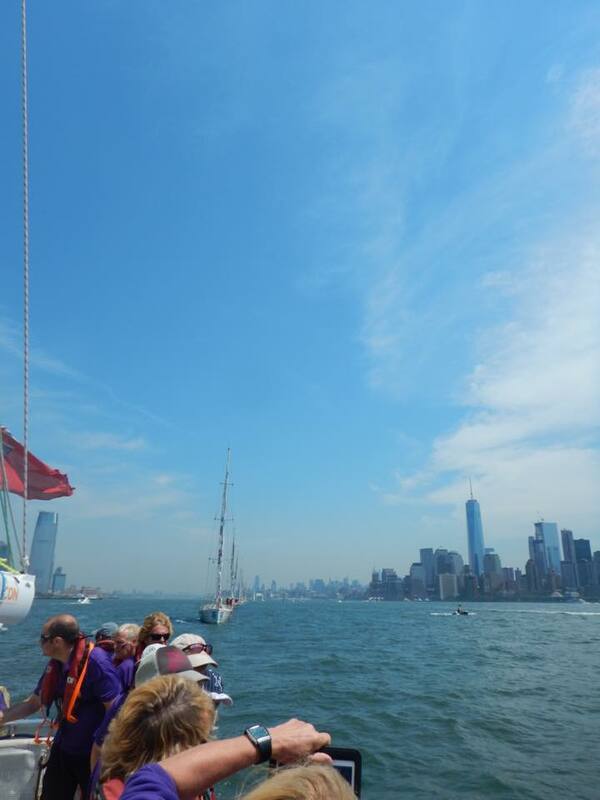 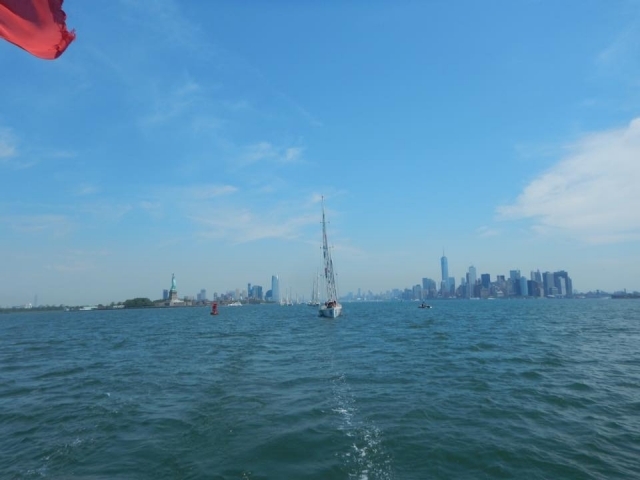 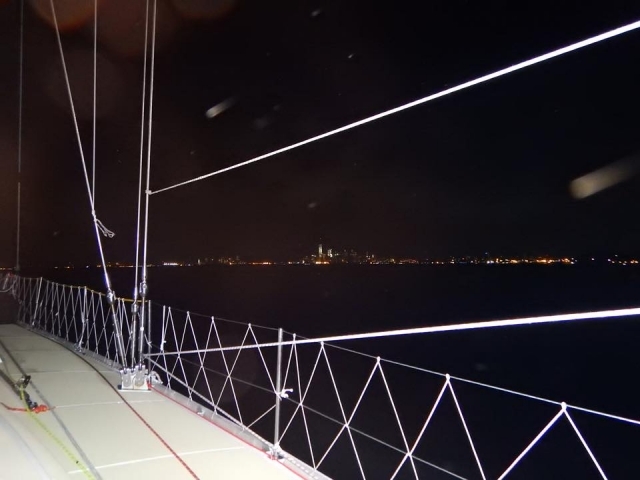 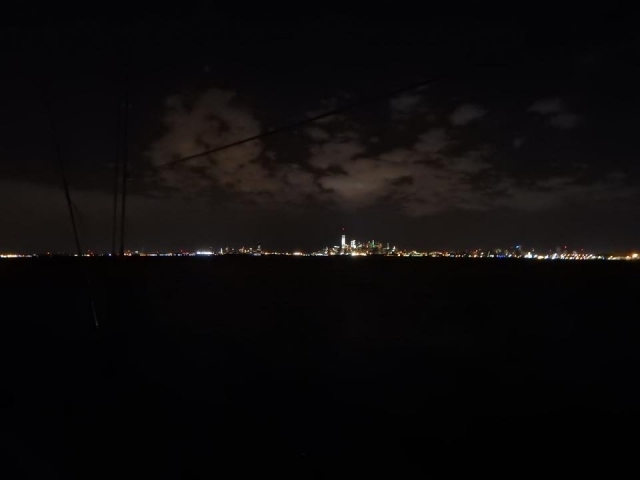 We sailed out with the impressive Manhattan skyline and Statue of Liberty behind us, knowing that there was just an ocean between us and home soil. 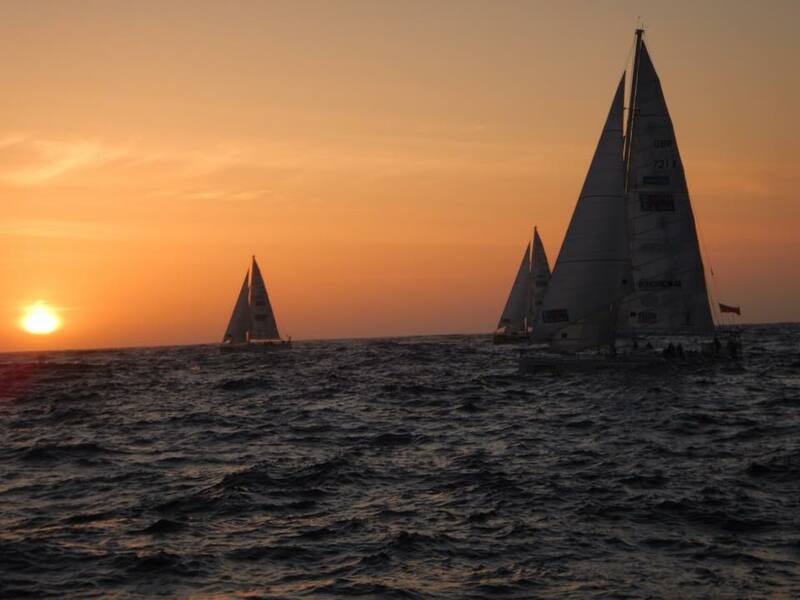 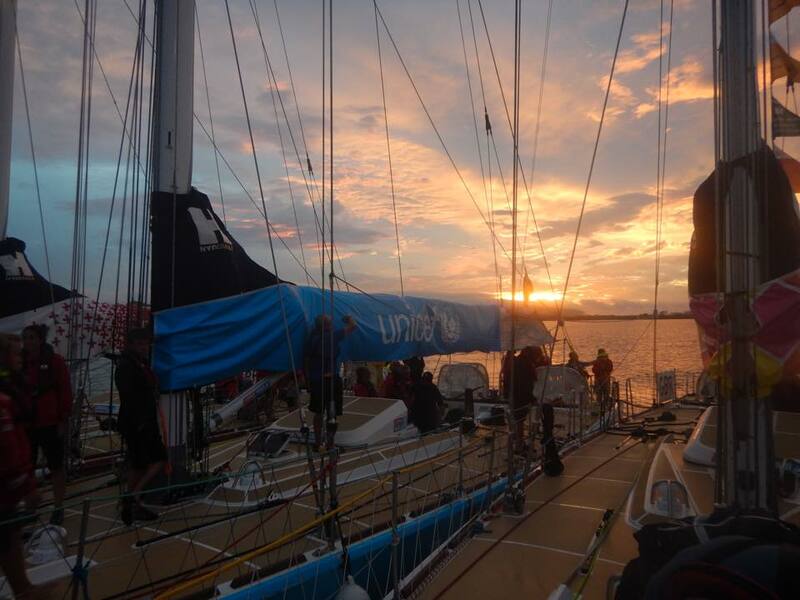 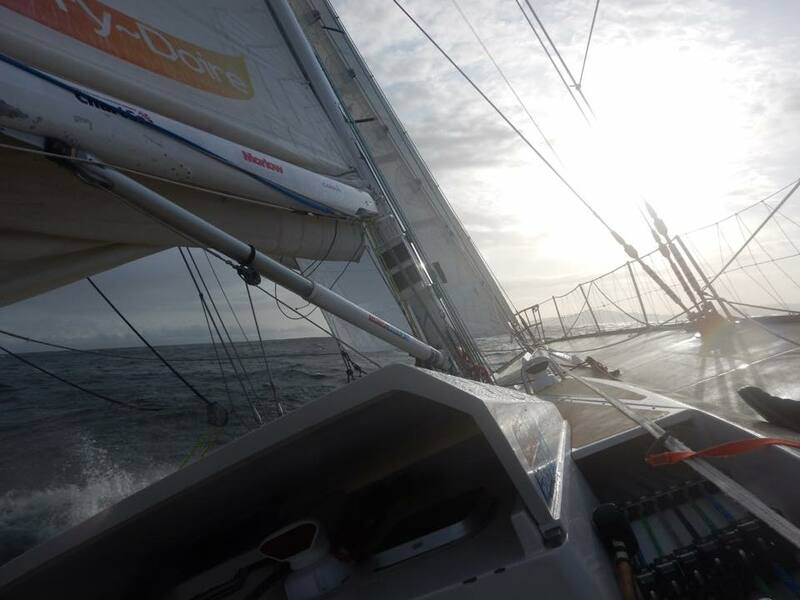 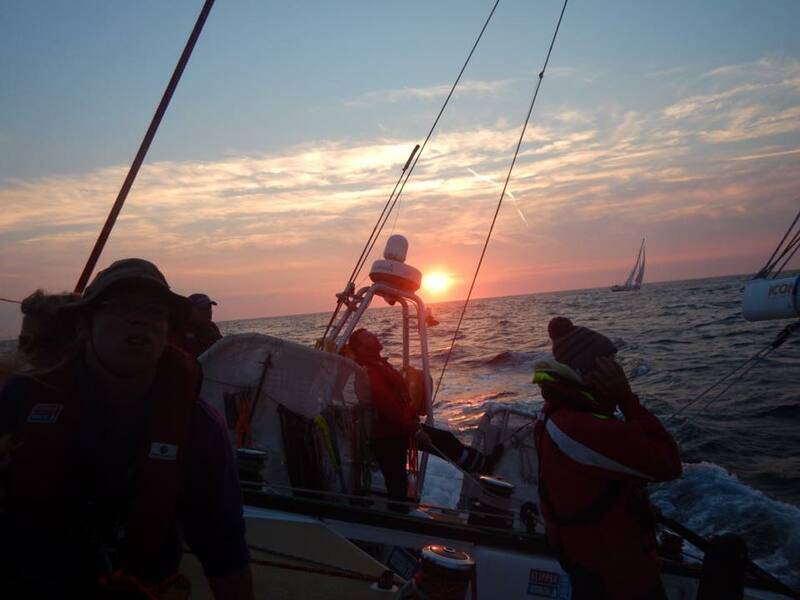 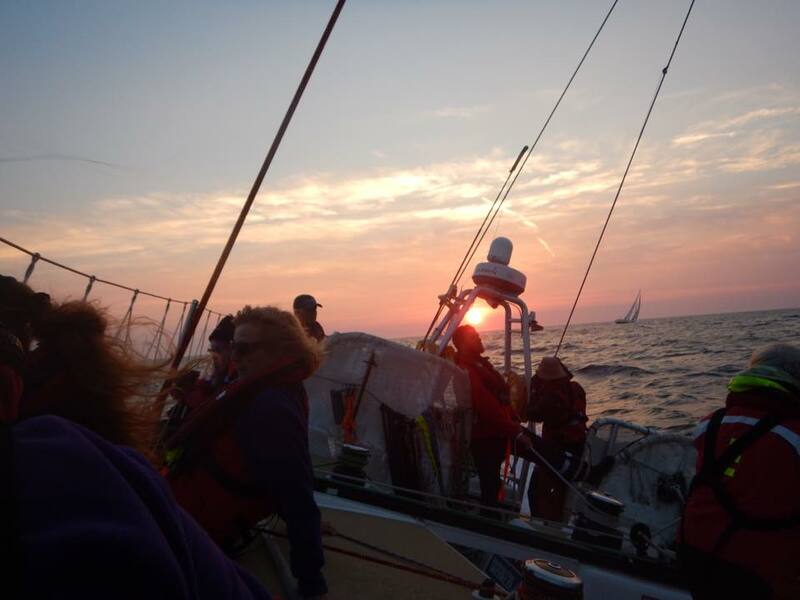 We had another Le Mans start as the sun begun to set over the fleet and we headed back towards the UK. 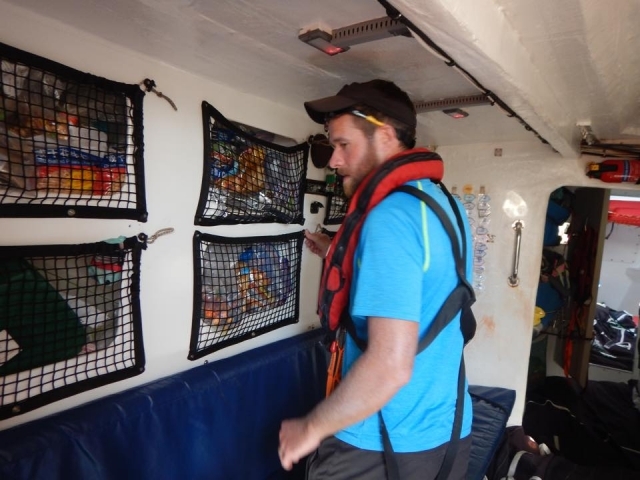 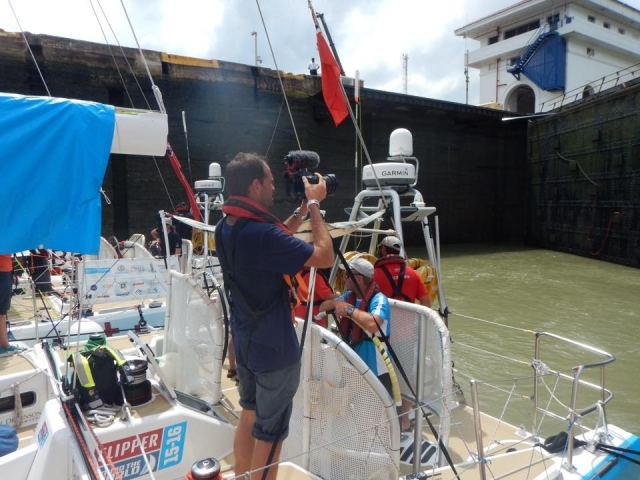 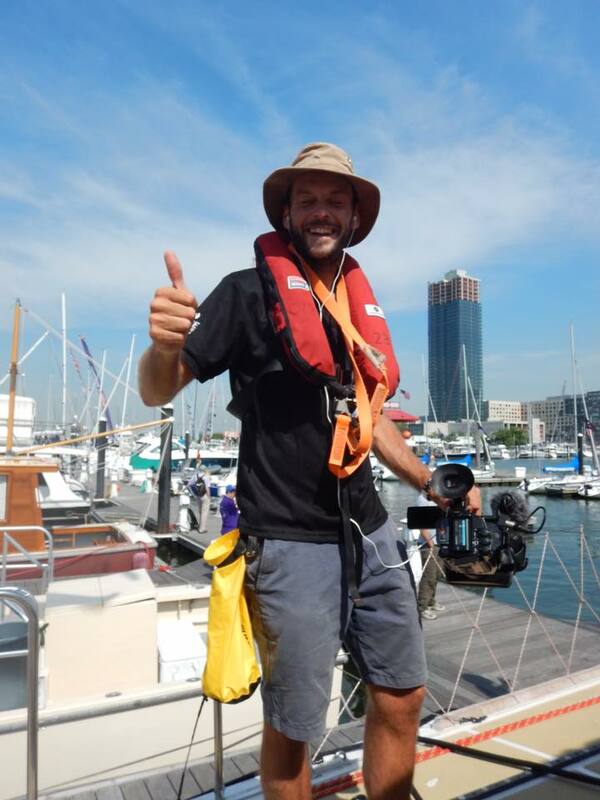 As we were heading for our home port, for this race we have been joined by Rich who works for the company making the Clipper documentary. 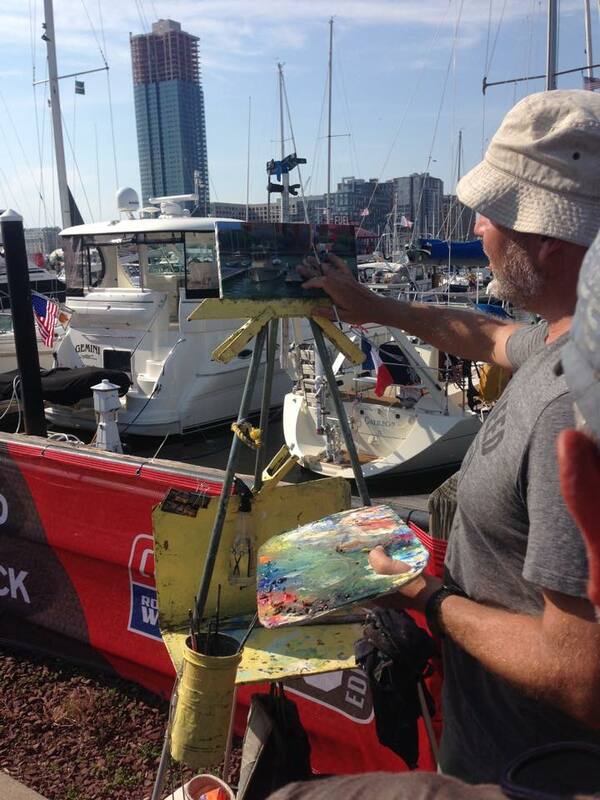 This has meant that no matter what has happened during the race, Rich has been there to document it. 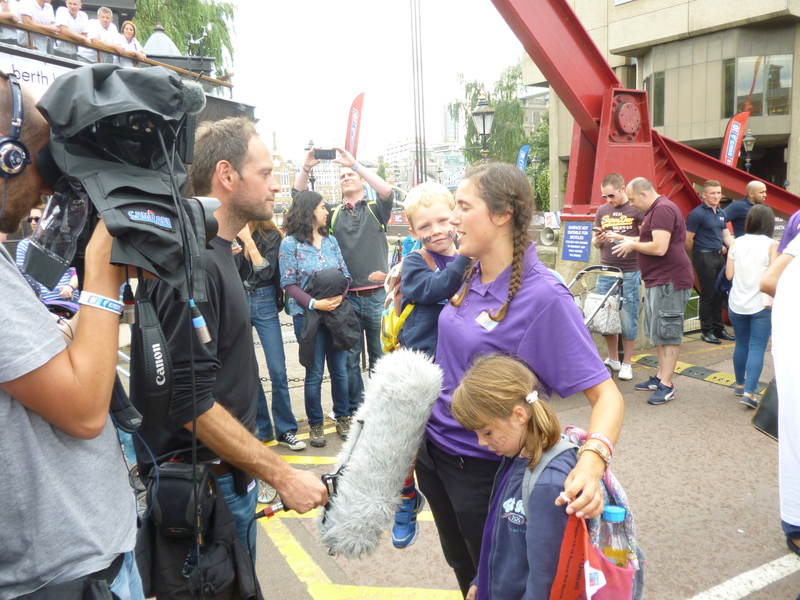 Our team is going to be featured in the final episode so keep your eye out for the publicity so you can get a real idea of what I’ve been doing all year. I’d got used to warm sailing so it was a shock to the system to return to the kind of seas we haven’t seen since pre America. 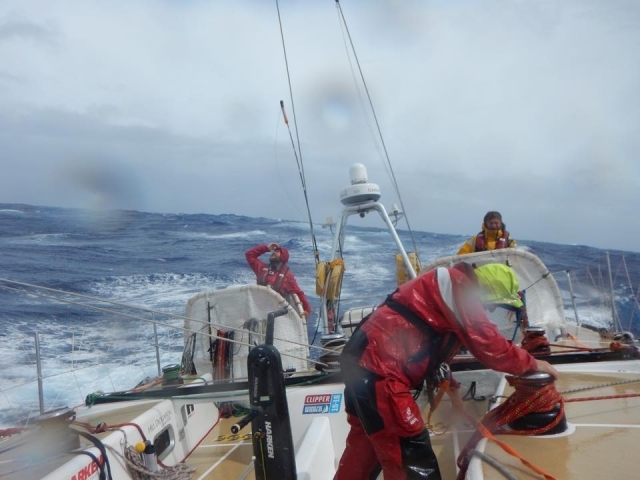 Waves crashing over the side and lots of heavy thundery showers has meant that it’s been wet wet wet. 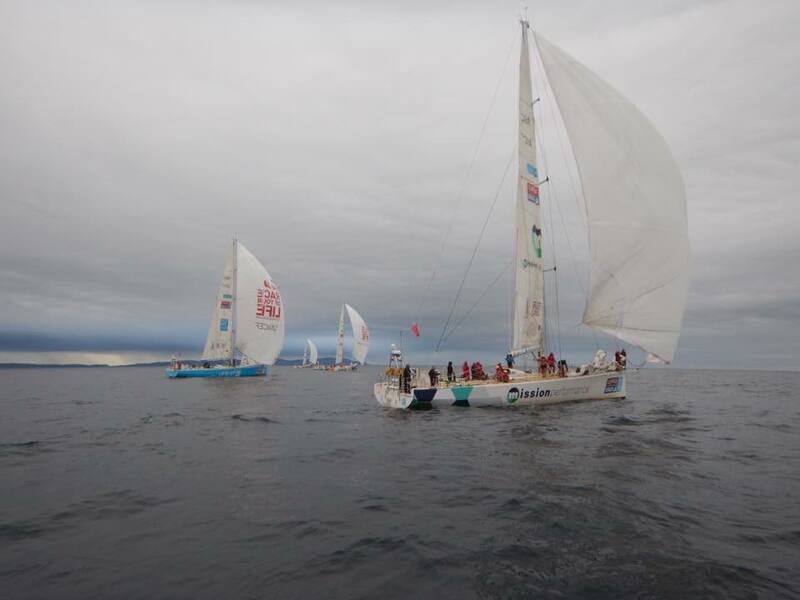 Oddly it hasn’t bothered me as much as we have known that the Atlantic crossing was to be short in comparison to other races. 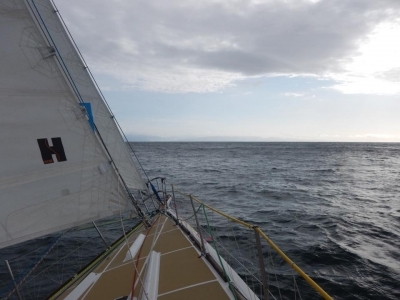 It’s been strange to think that this is my last big ocean crossing of the race. 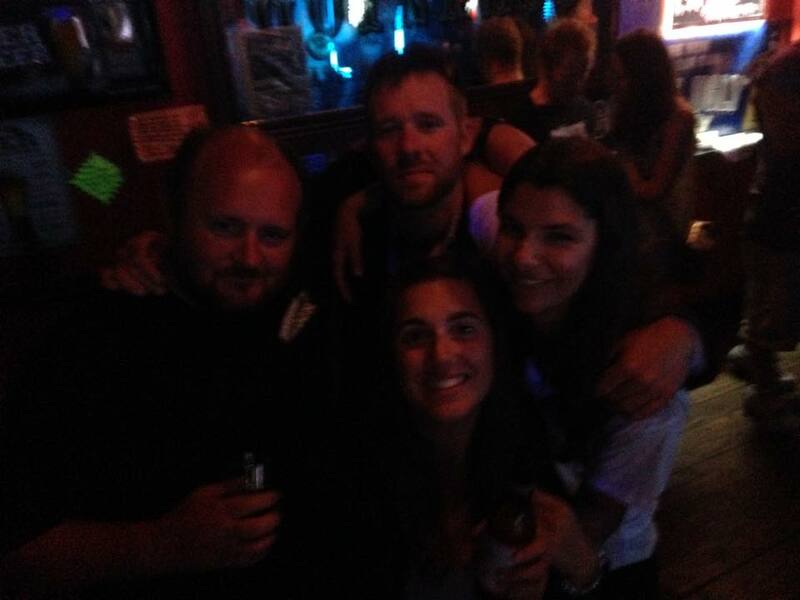 I’ve been thinking about this a lot and trying to soak up all the memories. 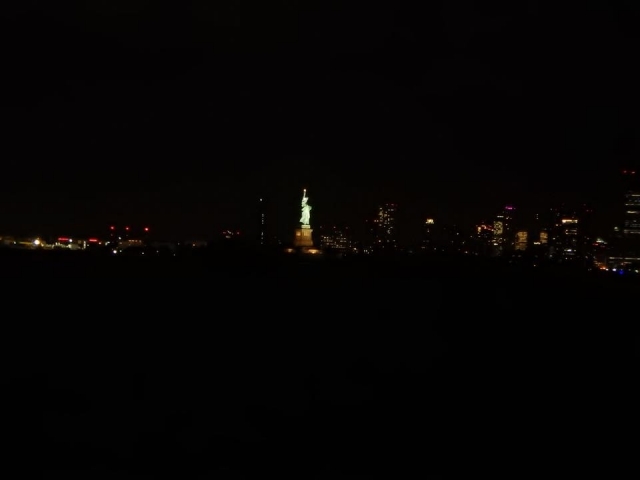 We’ve had some awesome starry nights which I only wish were possible to document to share with others. 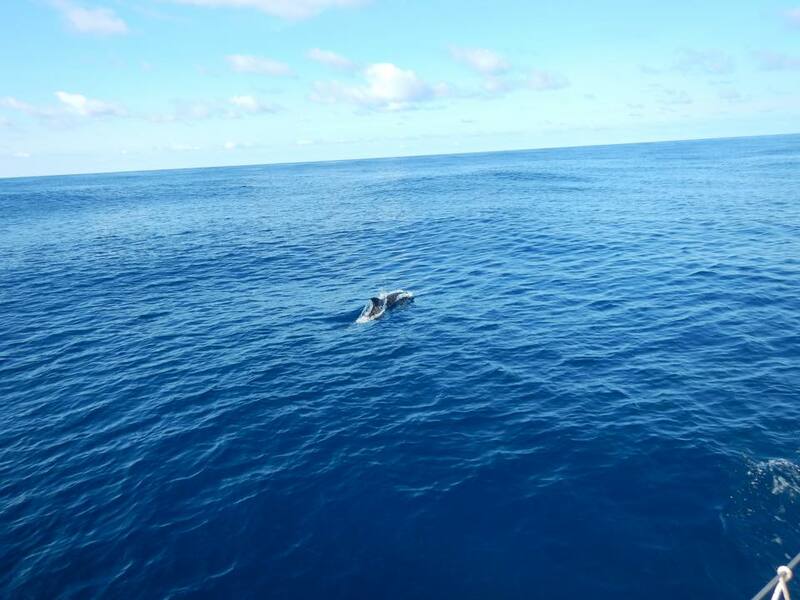 Wildlife-wise there have been whales and dolphins as well as loads of what we think to be the poisonous Men of War jelly fish. 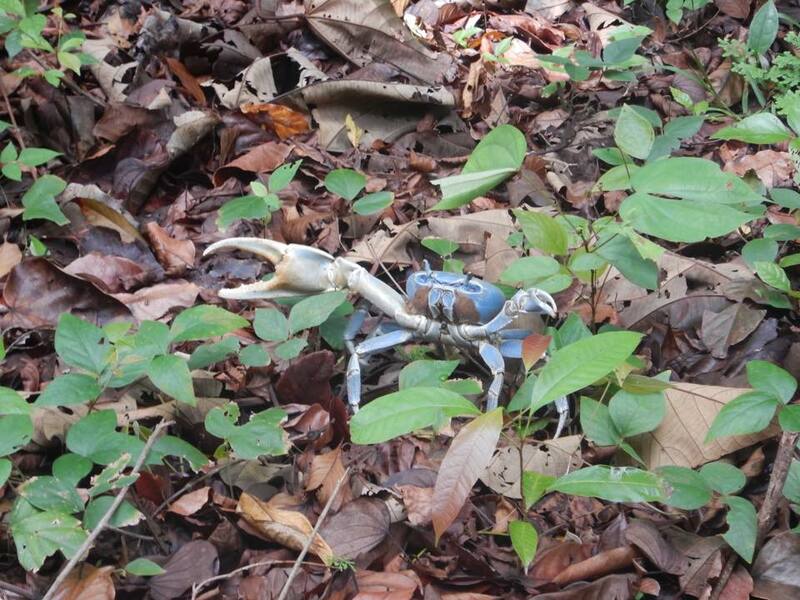 They might be deadly, but oddly pretty in contrast to the darkness of the Atlantic. 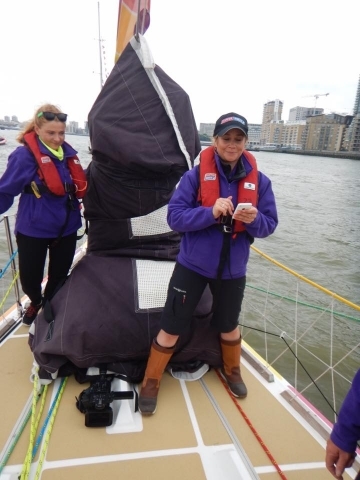 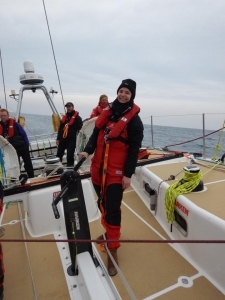 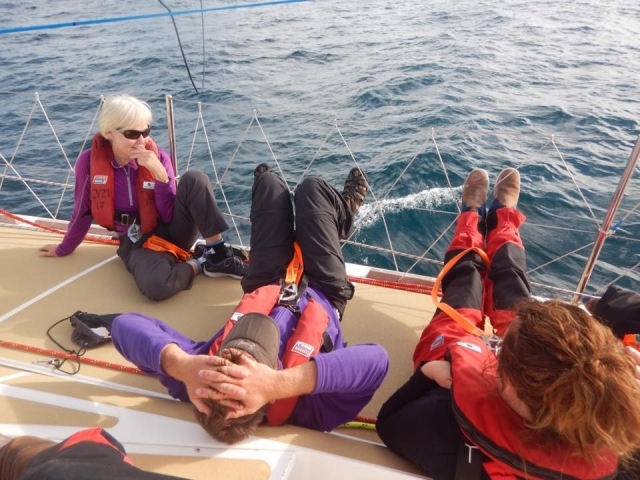 There have been moments I’ve felt rather sad too, especially when I lost my hat over board which has been with me all race, and when I found a hole in my boot. What does life hold after this race? I’m still yet to decide at the moment as to what the next adventure or challenge will be for me. I’m not the only one in the Clipper bubble to be feeling lost to the future – I keep being told it must be exciting having the chance to do anything… Which it is but also terrifying! 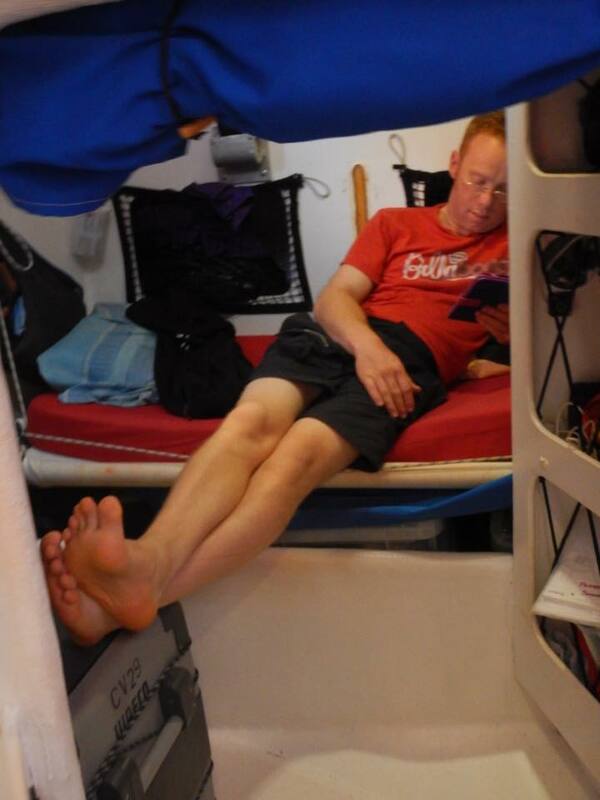 After all I’ve been living in this Clipper bubble for nearly a year and all I’ve done is sleep, eat, sail, repeat! Ellie and I have been mother partners again this race which has meant that we have finally got up to date with the rest of the world and got to the end of Downton Abbey! 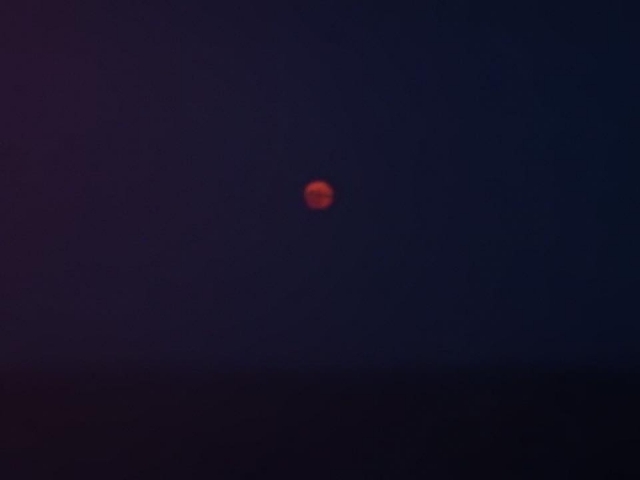 Only nearly a year behind the rest of you so thanks to those who have managed not to tell us the endings. 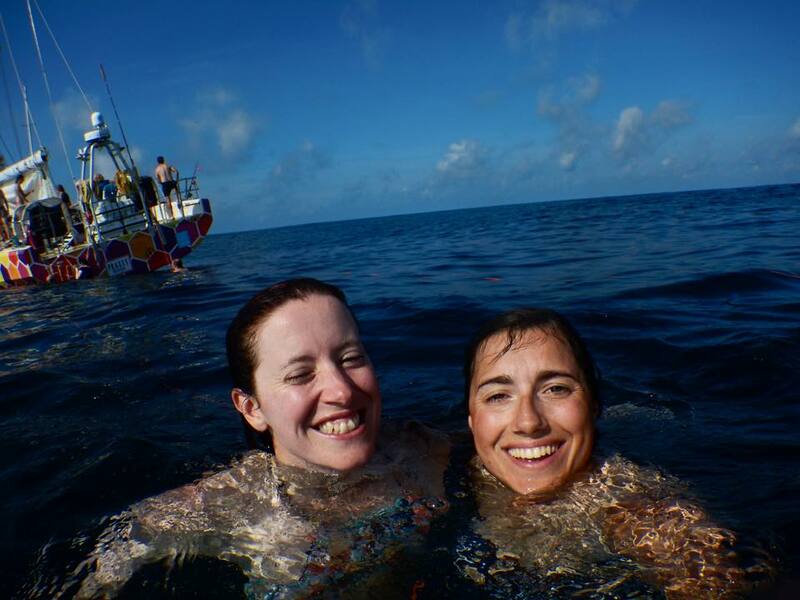 I will miss times like this with Ellie and am so grateful to have made such an awesome friend in her. 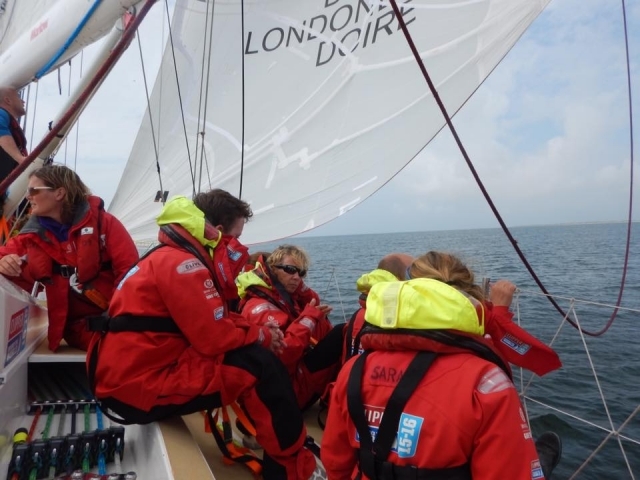 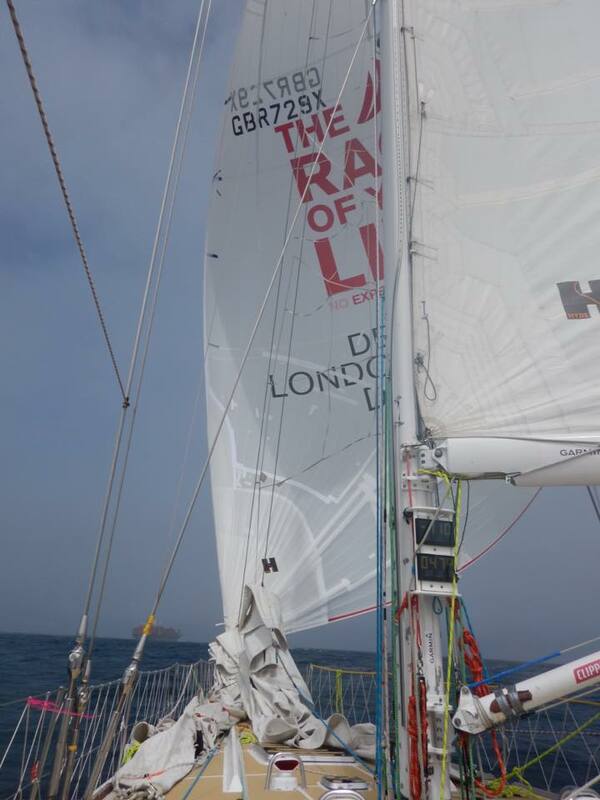 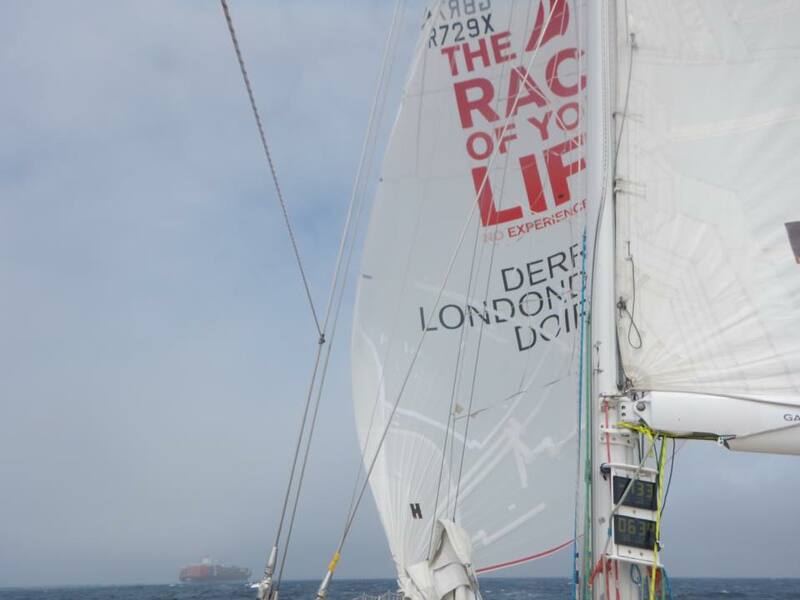 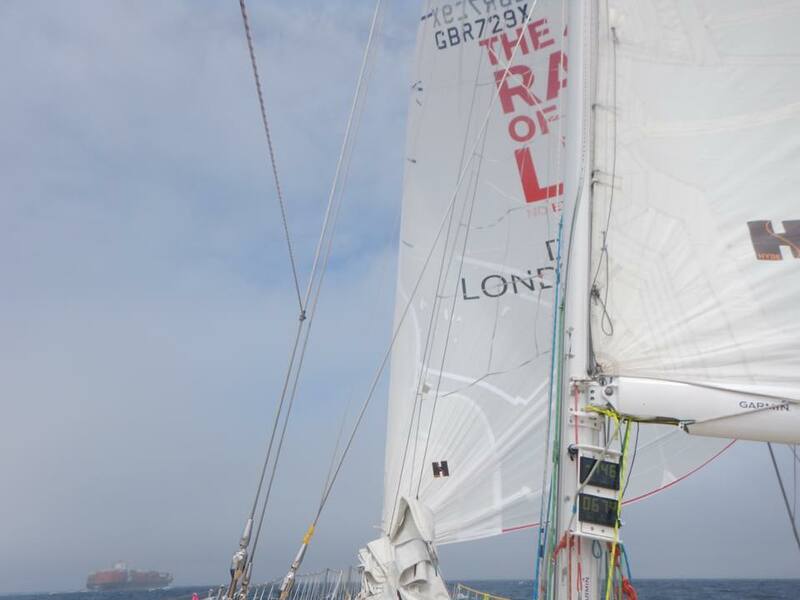 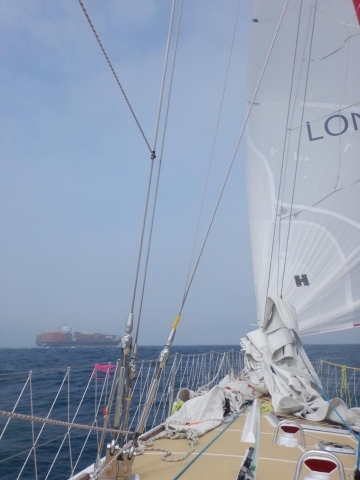 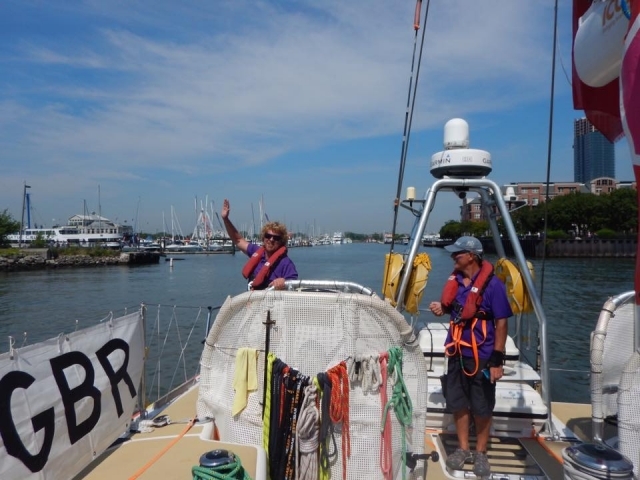 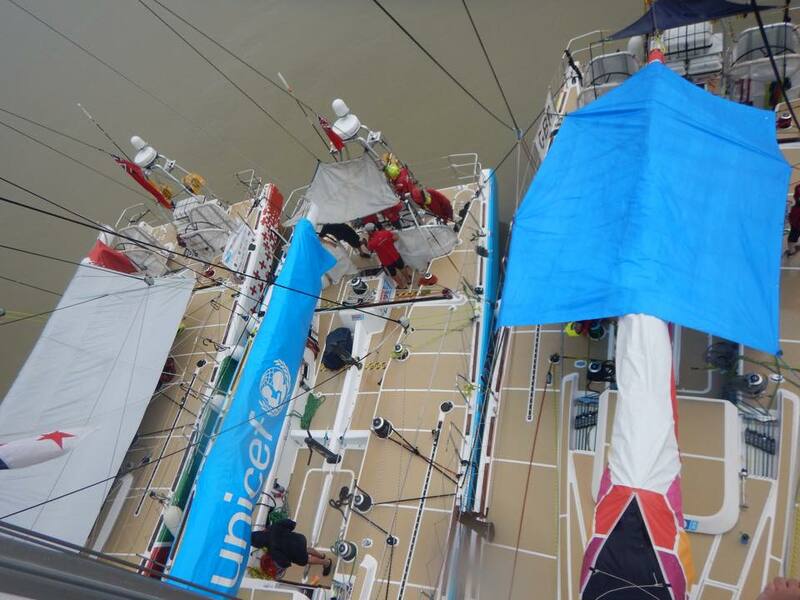 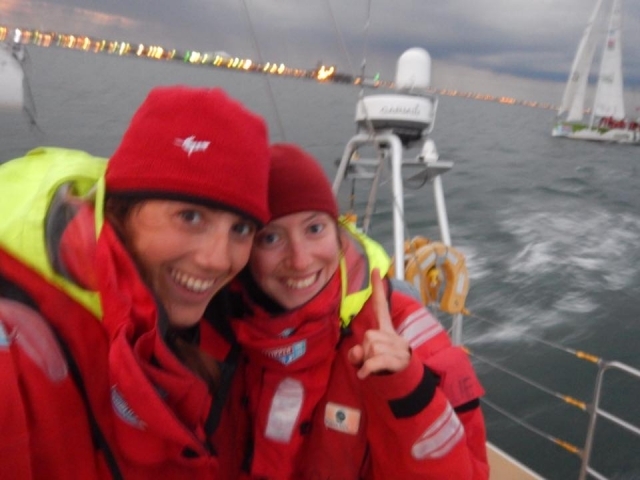 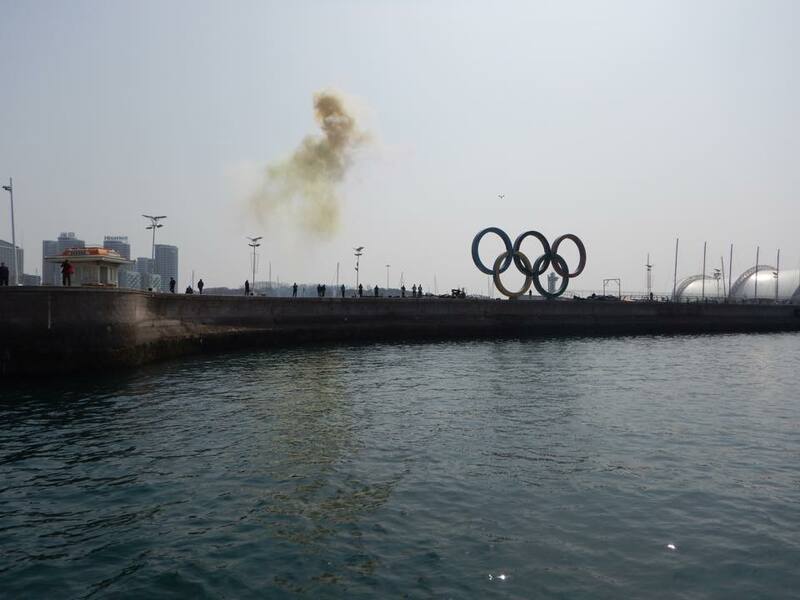 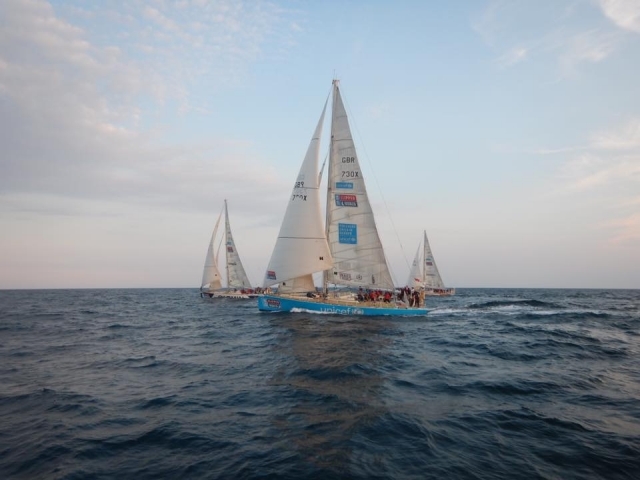 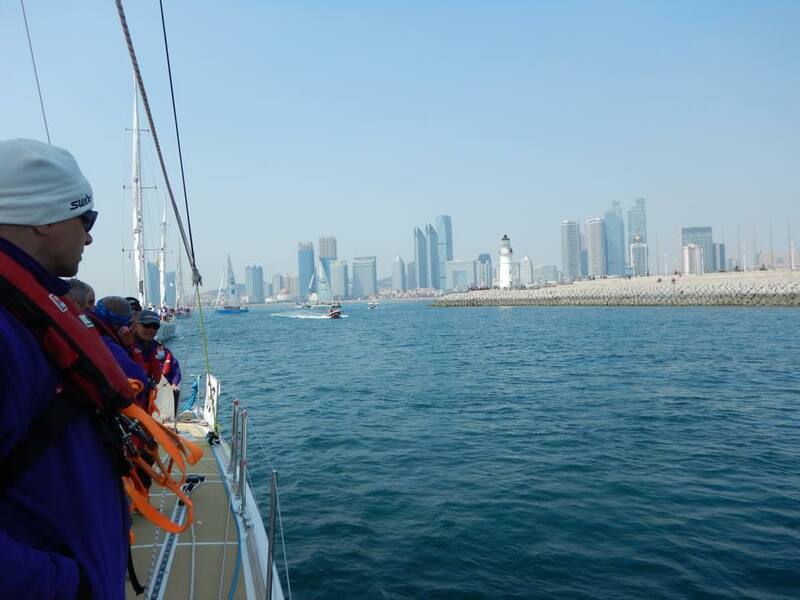 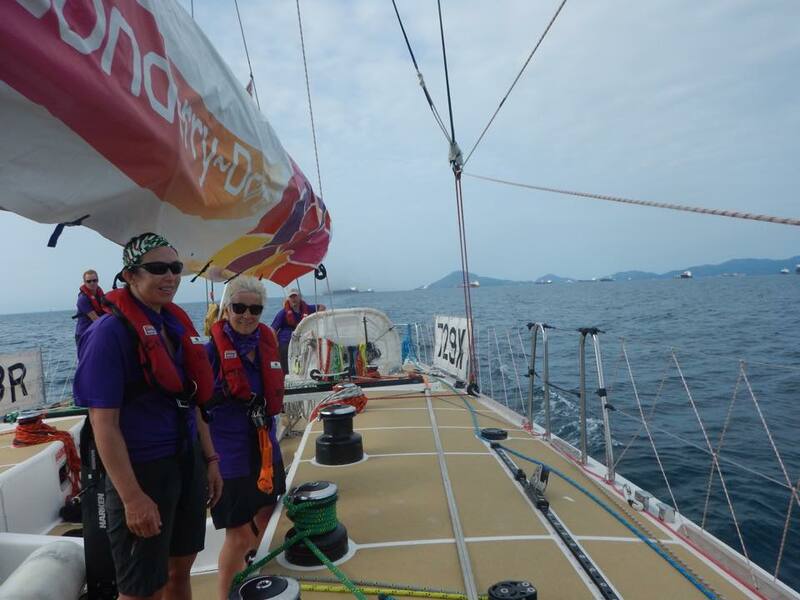 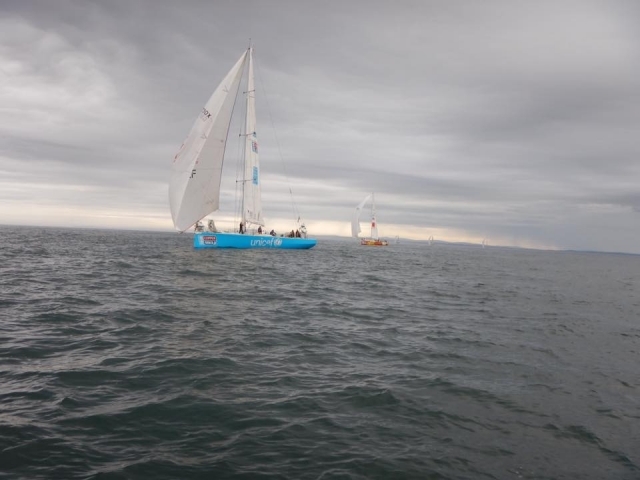 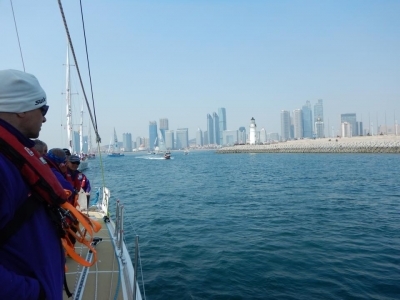 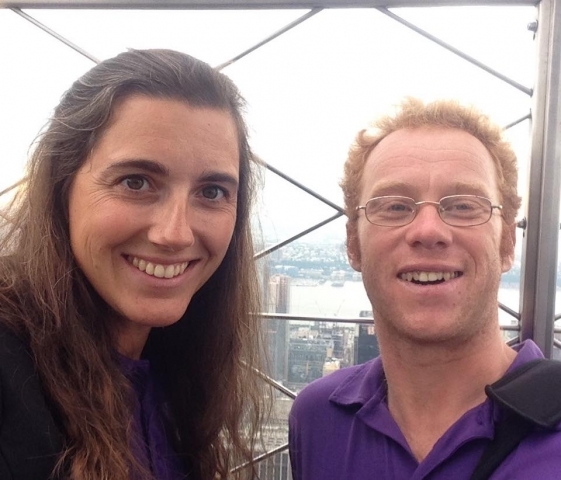 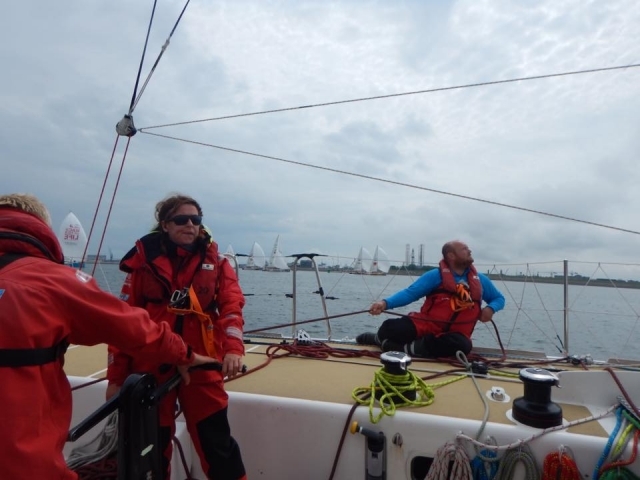 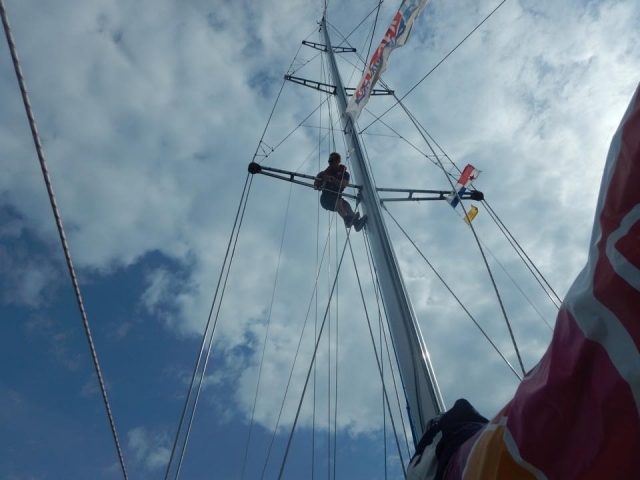 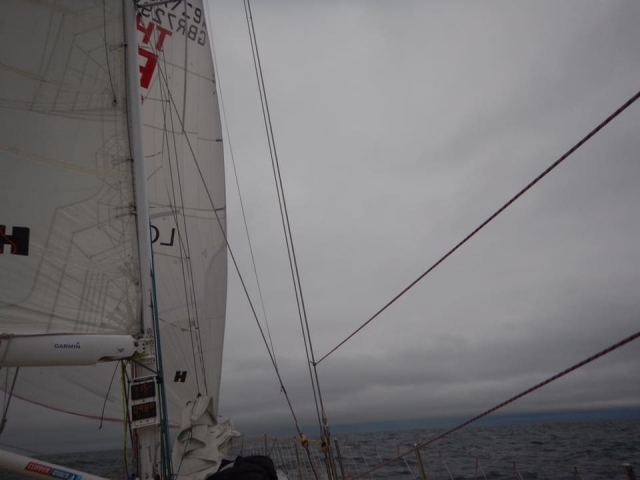 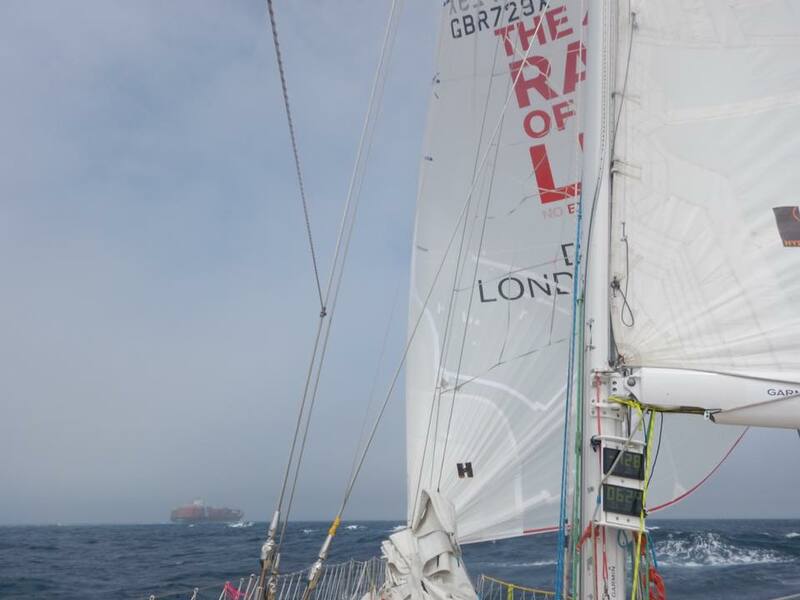 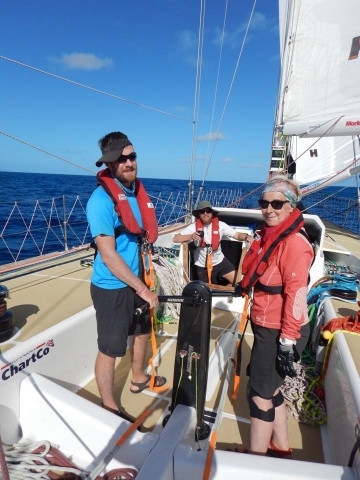 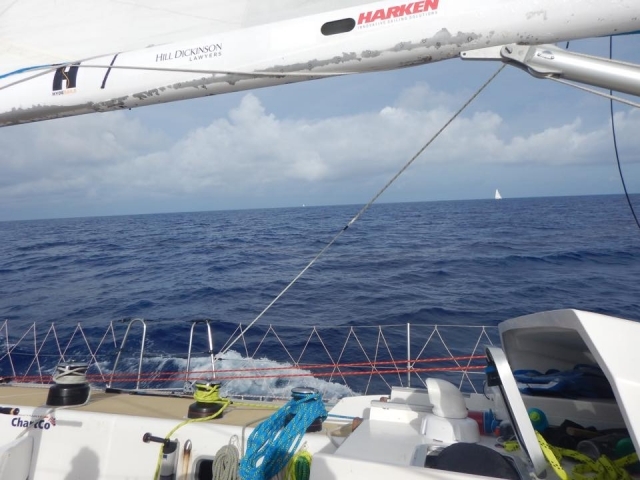 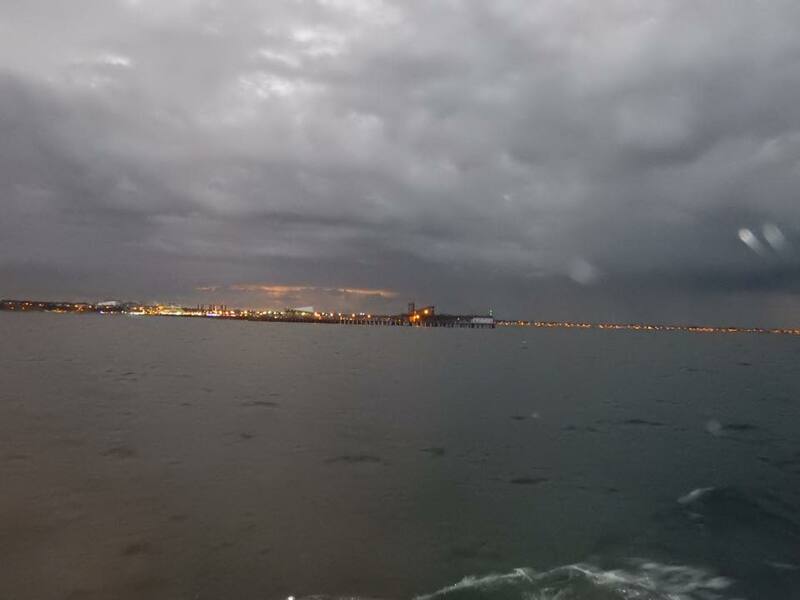 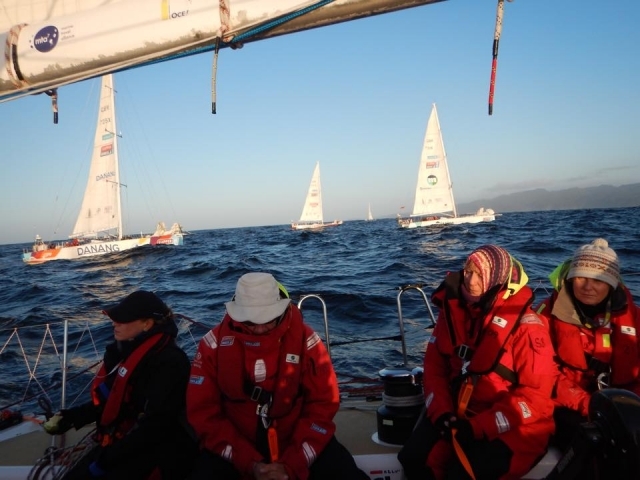 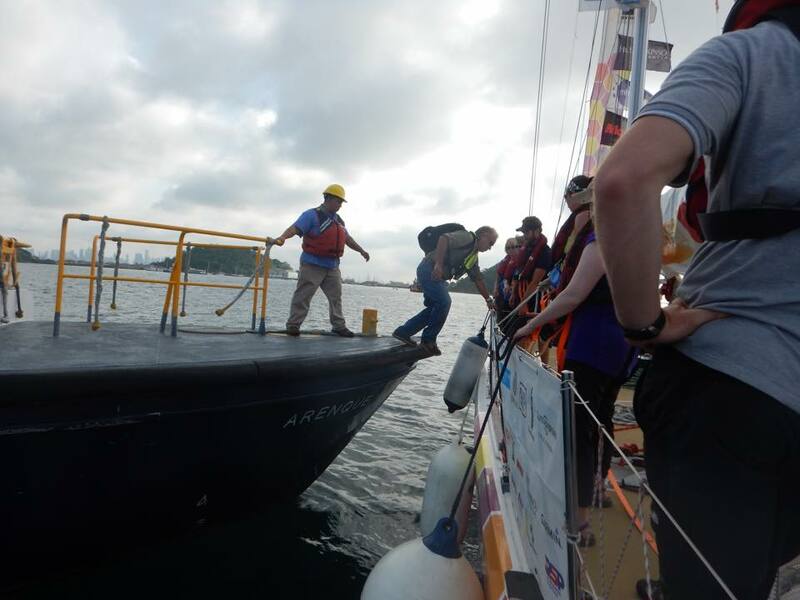 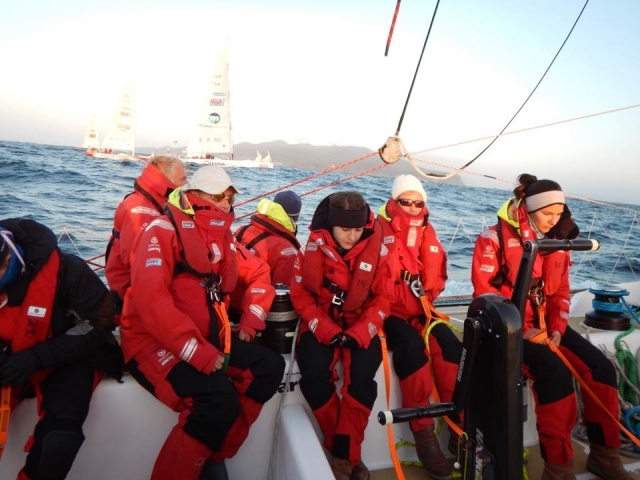 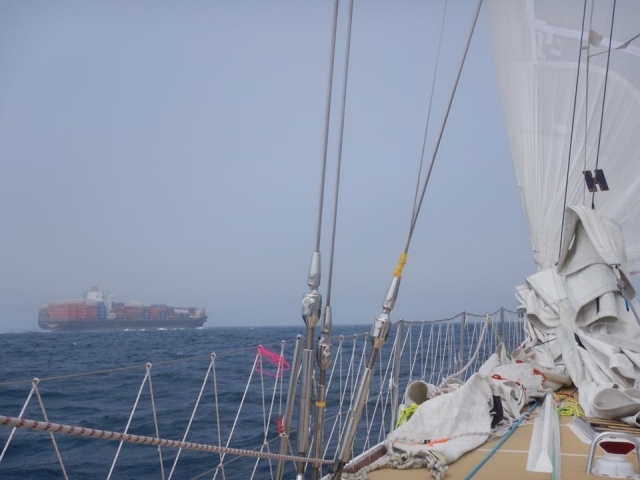 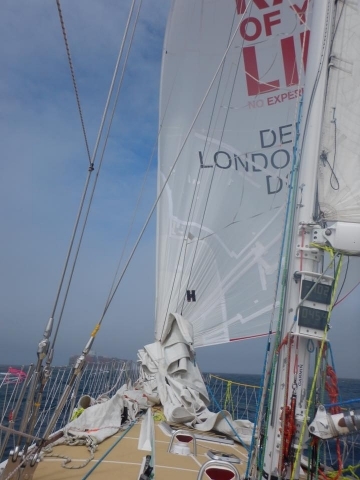 We flew across the Atlantic and as we were coming to the end of the course we were informed there was to be another race extension as the city was not ready for our arrival. 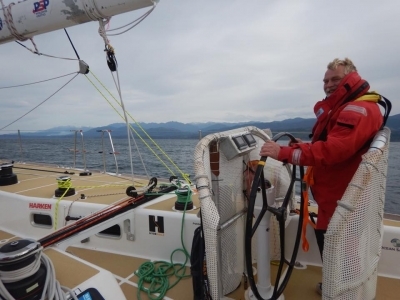 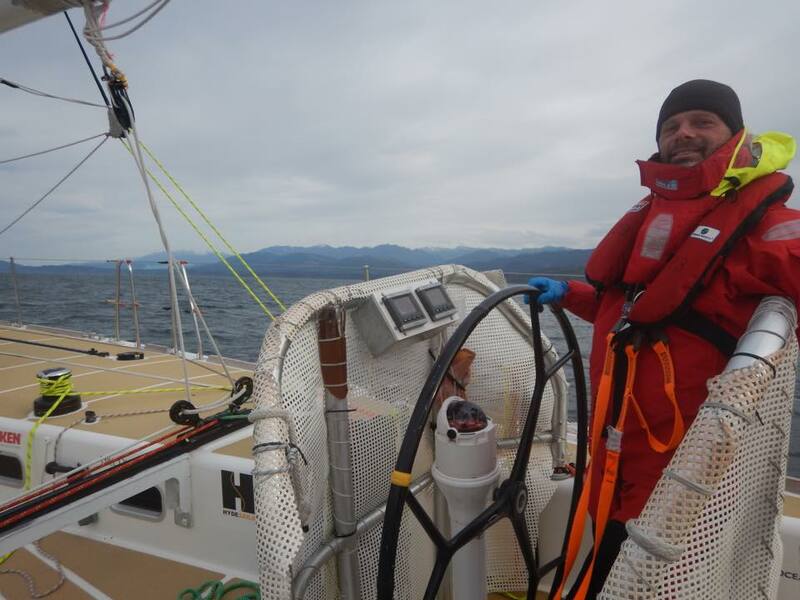 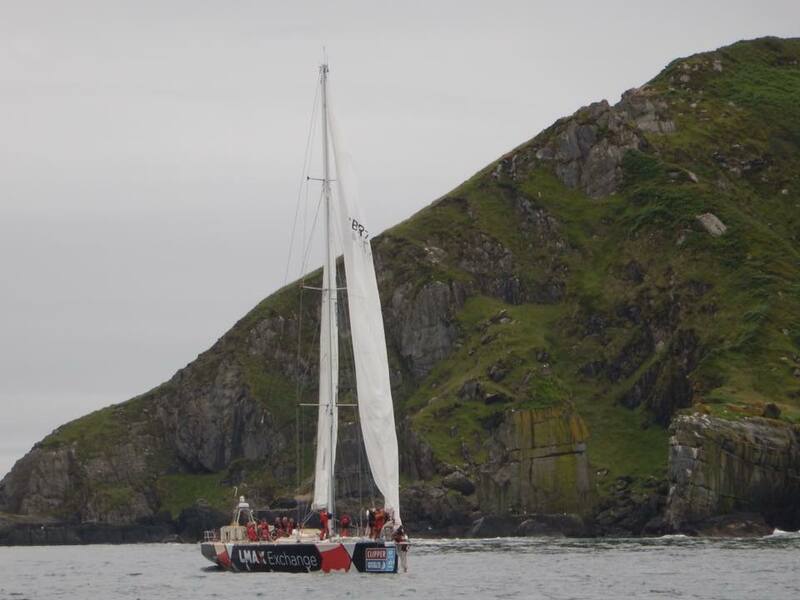 This added an extra loop up to Rockall and taking in the tidal Rathlin Island. 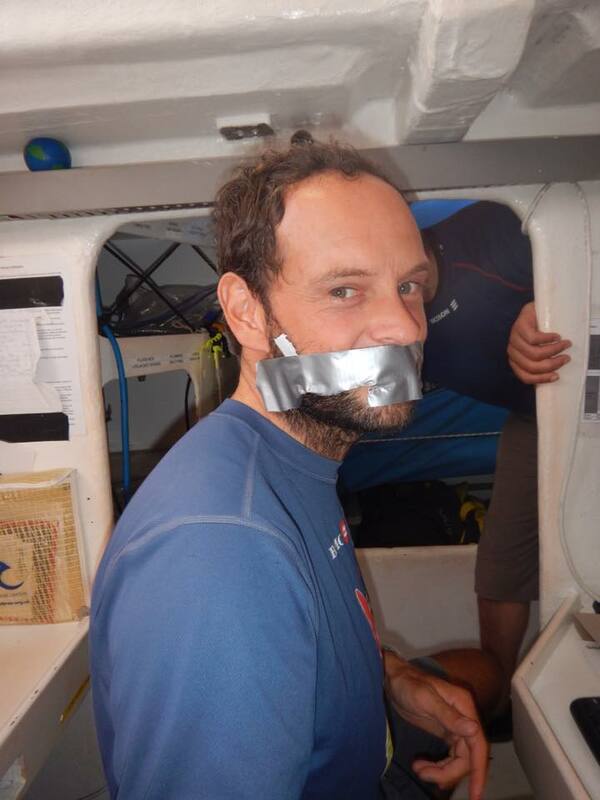 The news was met with mixed reactions from those onboard and unfortunately for us changed the end result. 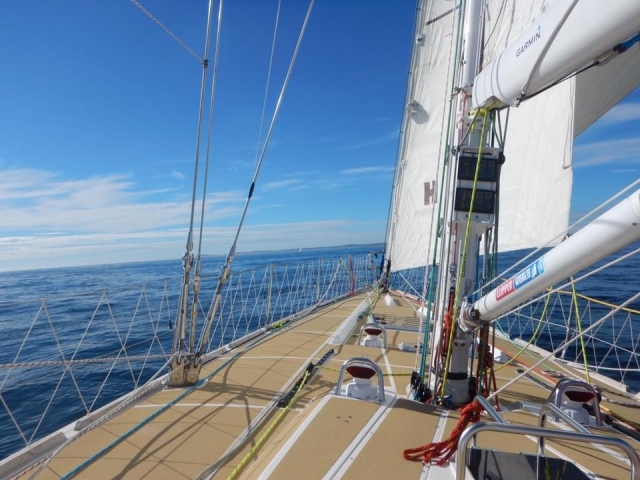 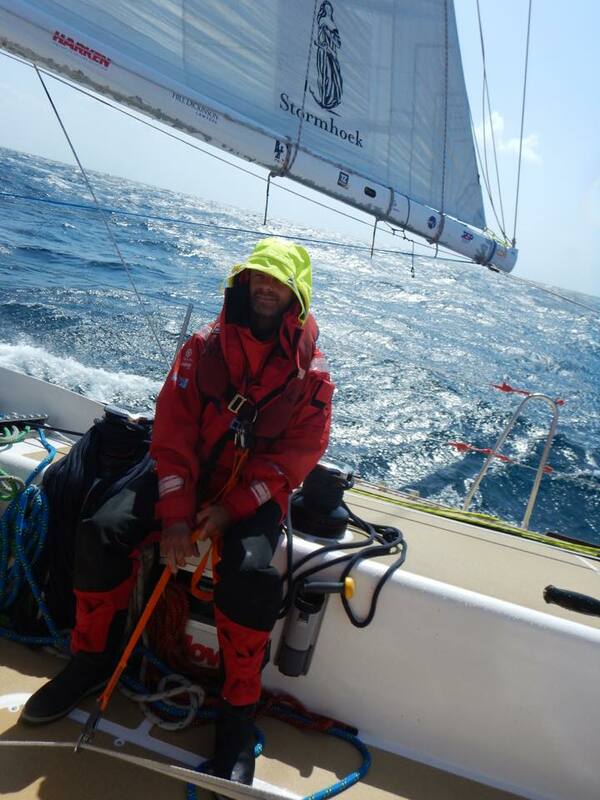 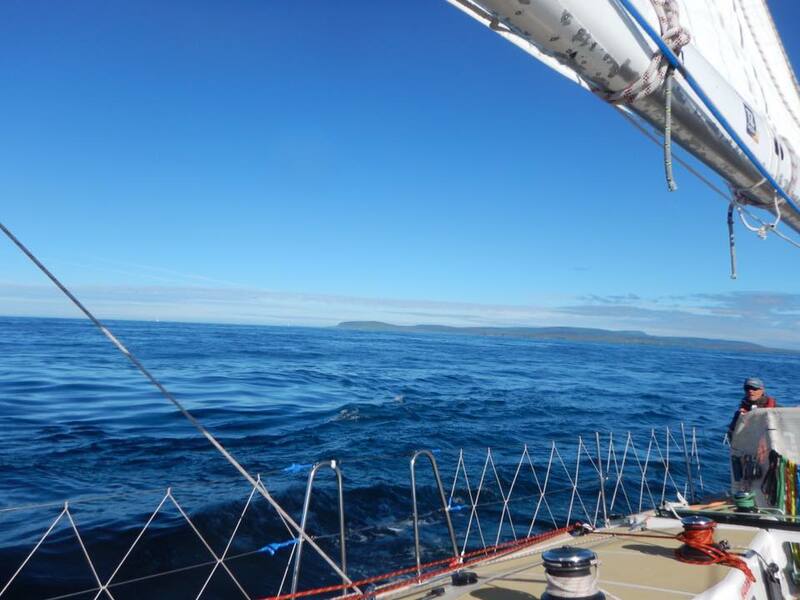 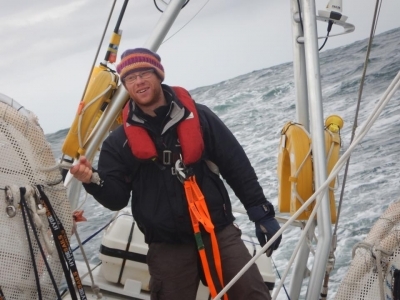 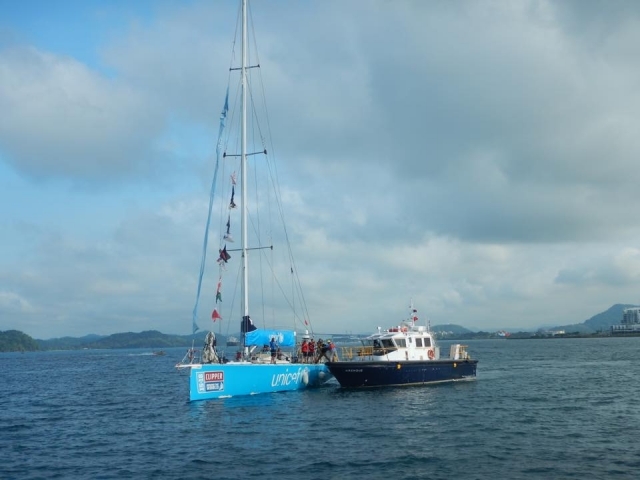 We were leading up to Rockall and as the rock came into sight, so did ClipperTelemed and LMax. 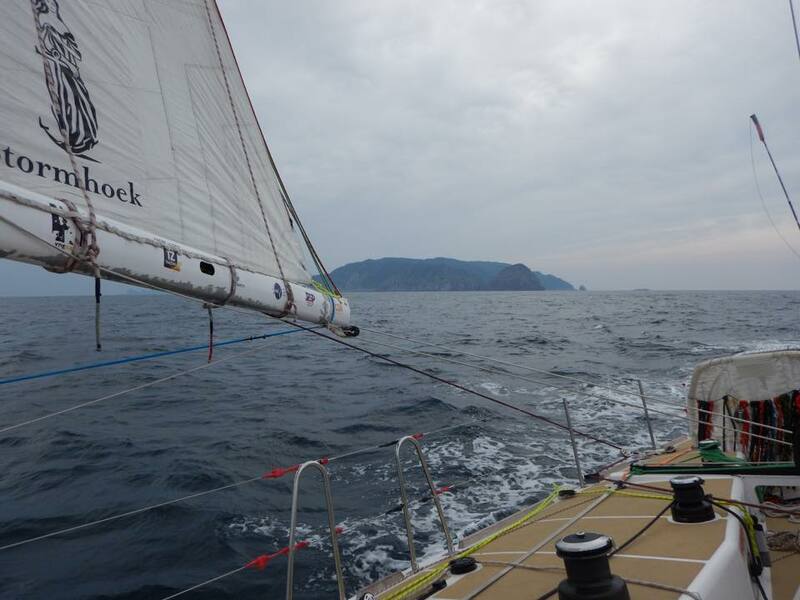 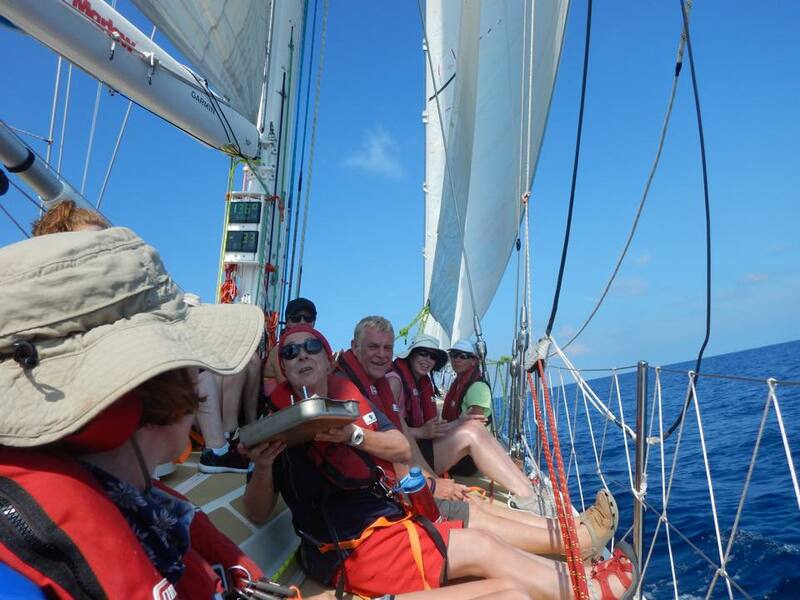 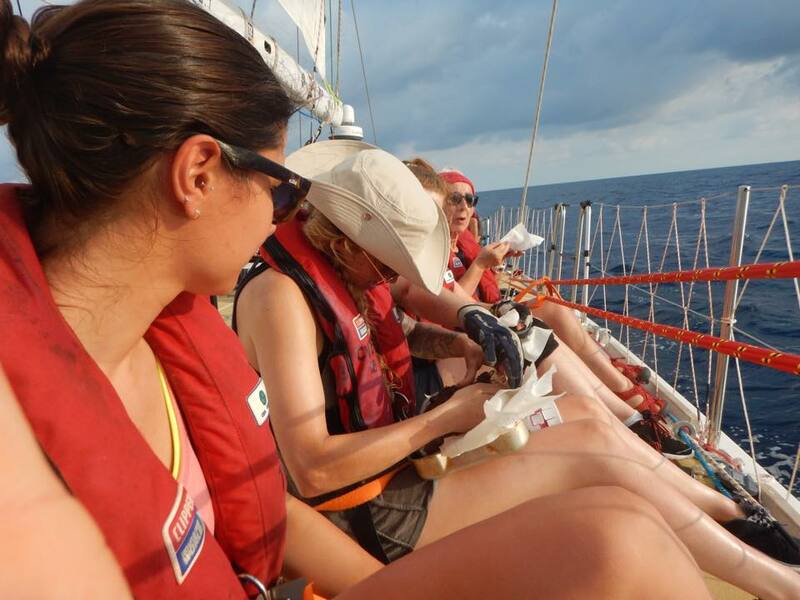 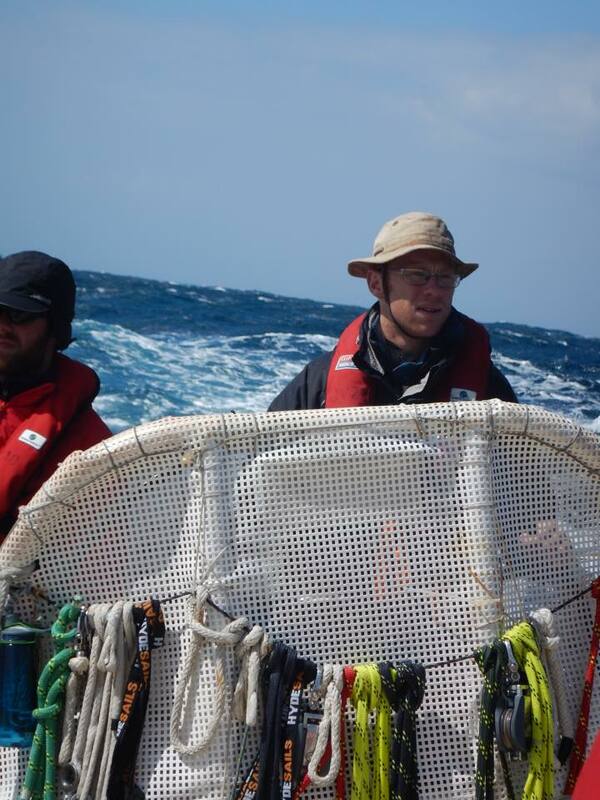 We crossed so closely with LMax as we went round the rock that their crew could have easily jumped aboard. 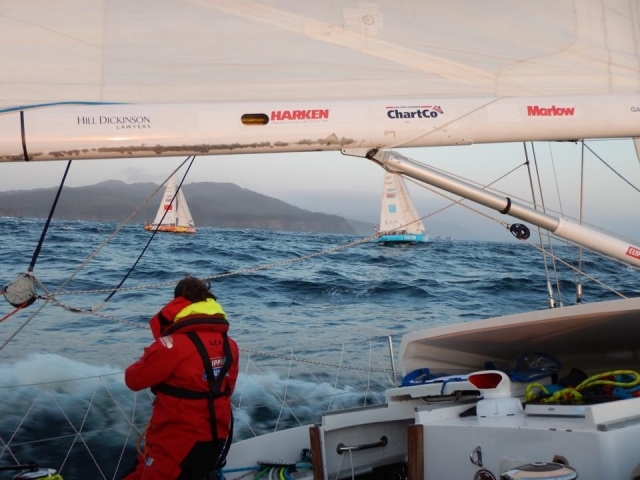 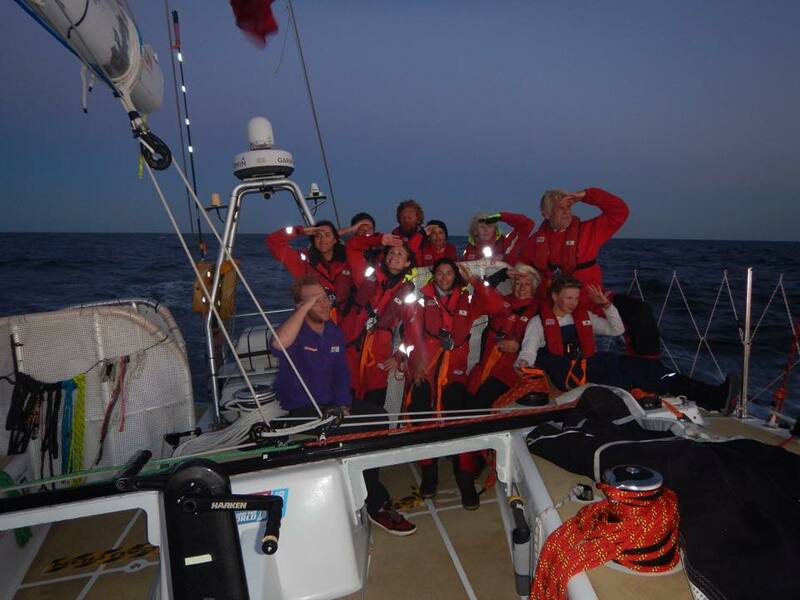 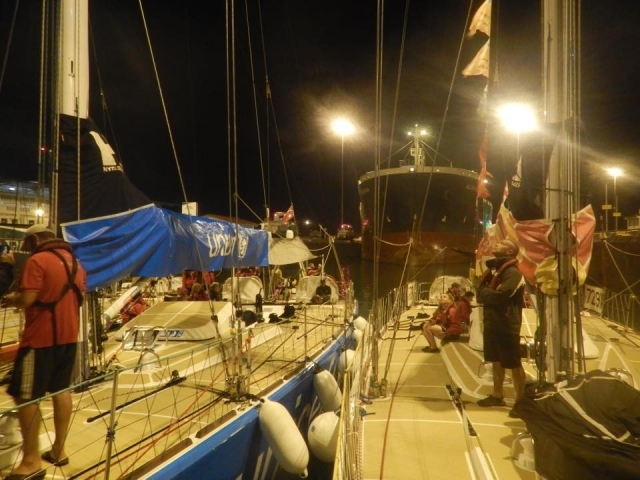 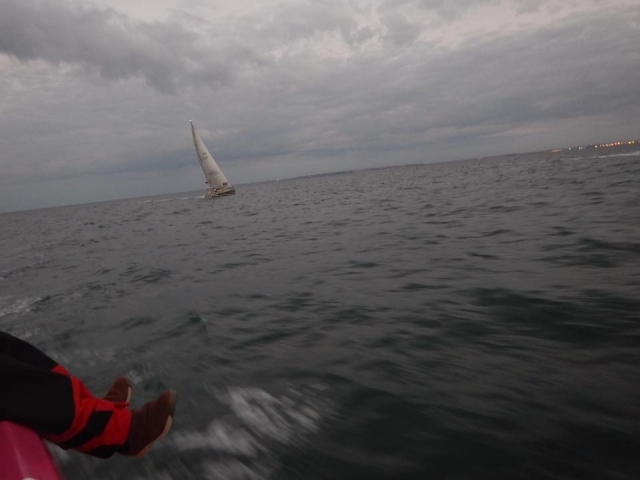 That night there was tough sailing as we tried to hold our lead with LMax closely on our heels. I went to bed and we were winning and when I came back on deck for the next watch we had been overtaken. It was a horrific feeling seeing them so close to us yet still ahead. 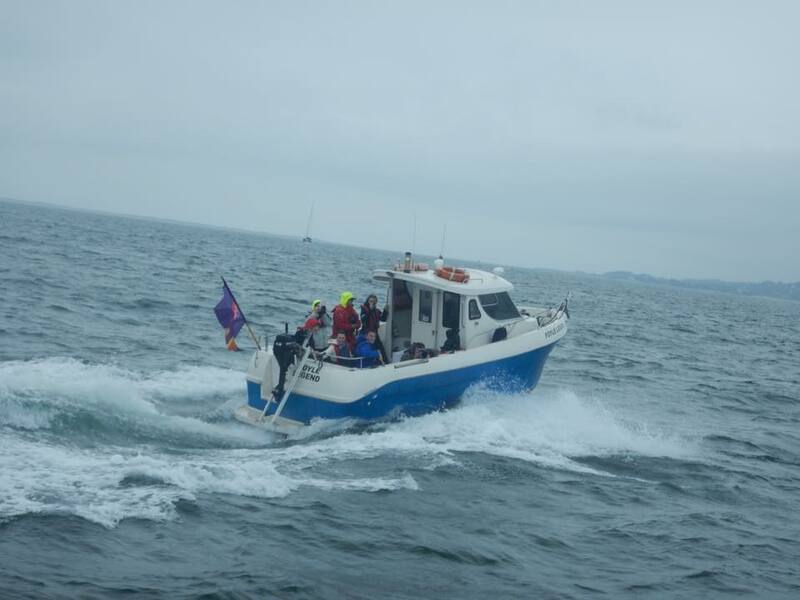 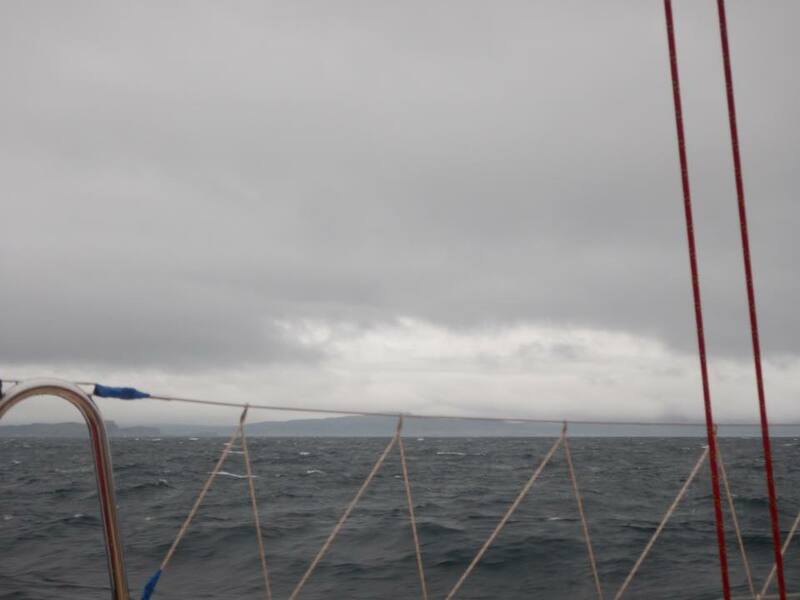 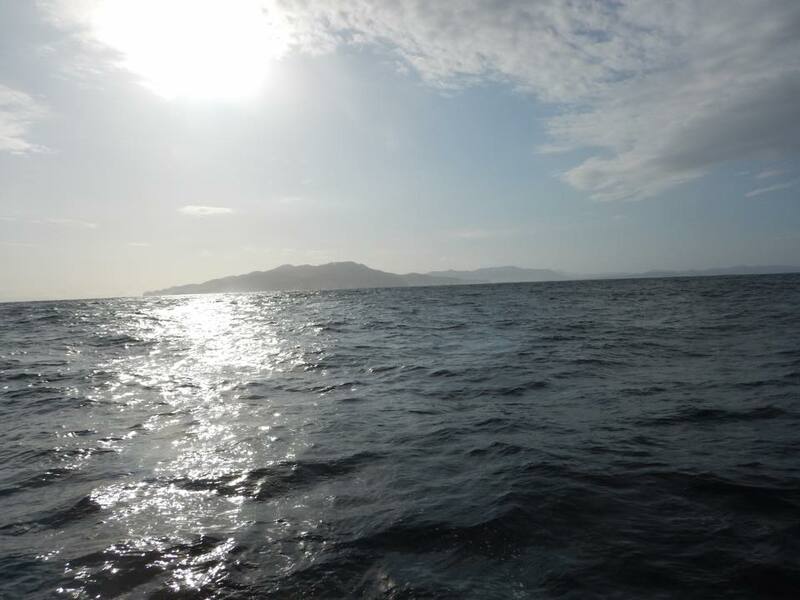 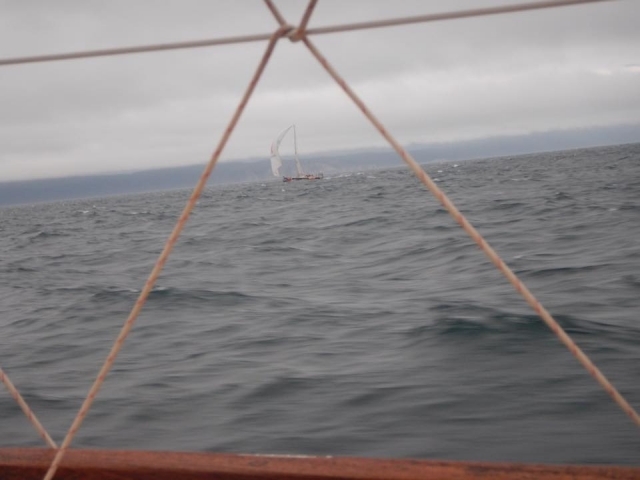 As we fought to claw the distance back we were approaching Rathlin Island and the tide was against us. 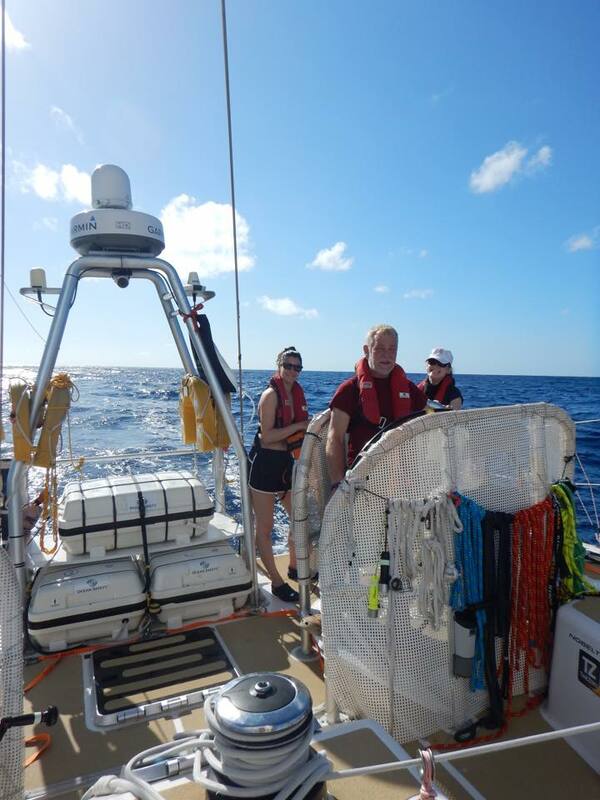 Ellie and I were in the nav station and watched as LMax managed to find a gap in the tide and slowly increase their speed. 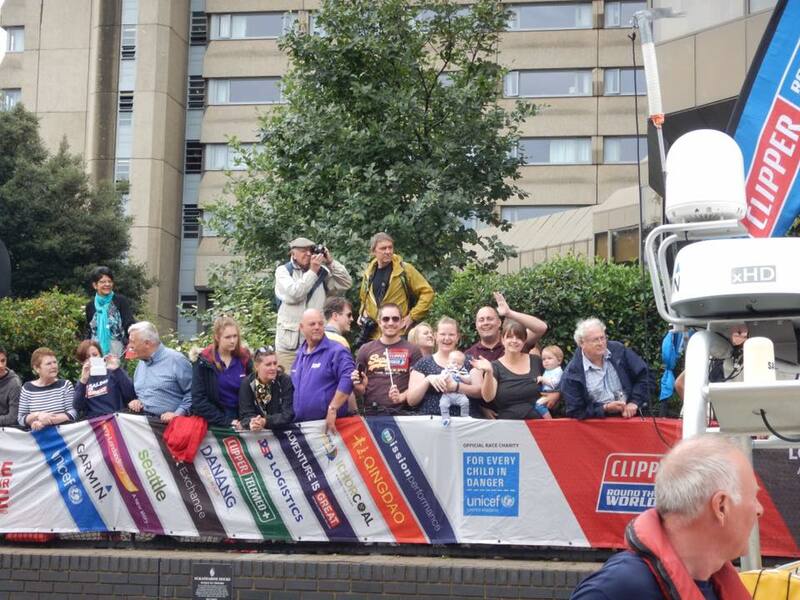 It was at this point, about 8 miles from the finish line, that I realised it was over. 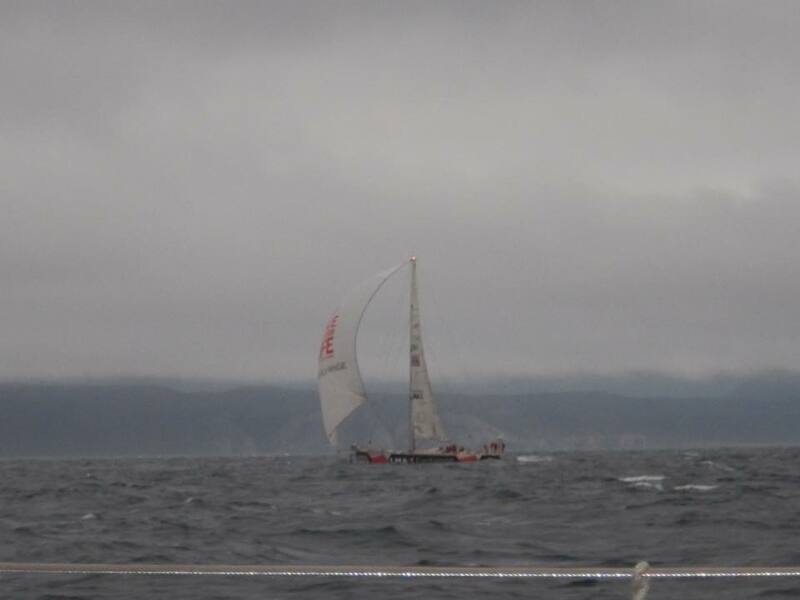 We weren’t going to win into our home port despite being in the lead for the majority of the race. 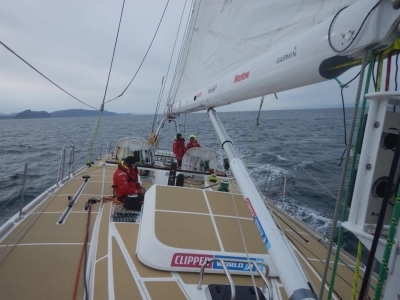 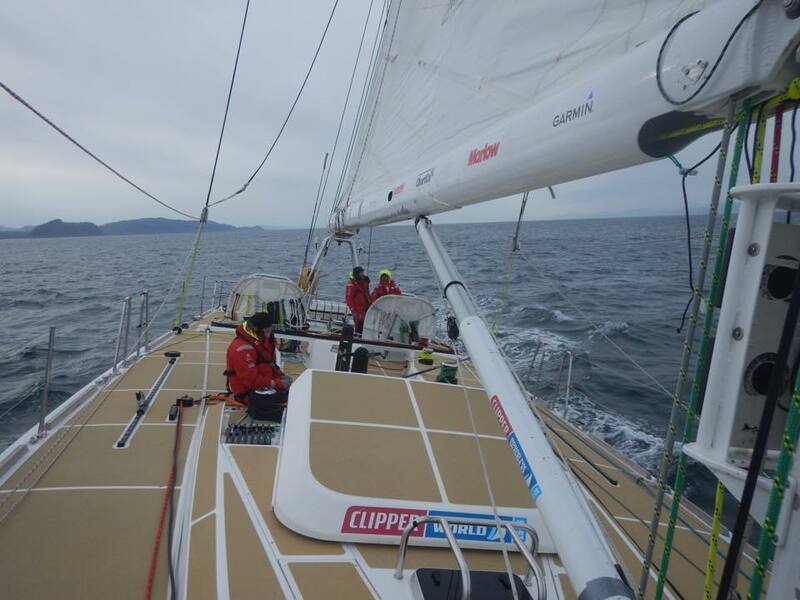 We then saw ClipperTelemed fly round the corner and make good speed towards us. We managed to keep going and crossed the finish line behind LMax. 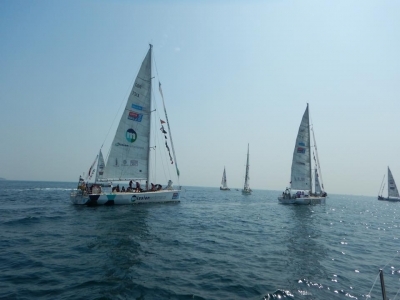 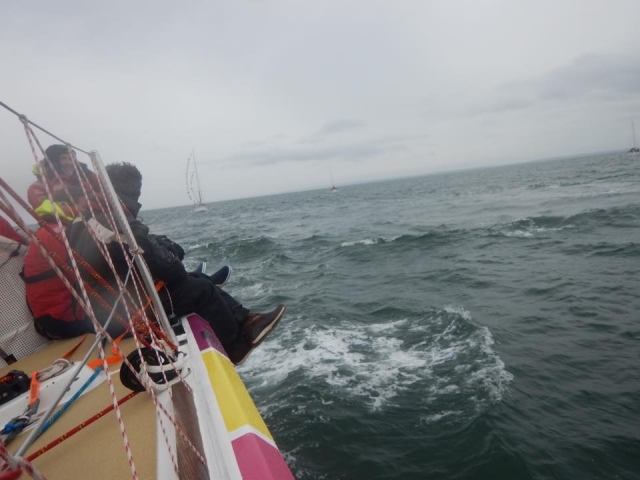 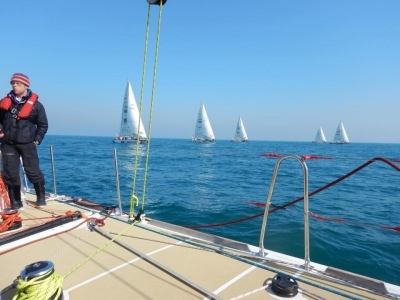 As we got nearer the finish we saw a group of boats forming and when we had finished the race a flotilla of yachts and boats was there to welcome us. It was lovely to have a welcoming party. 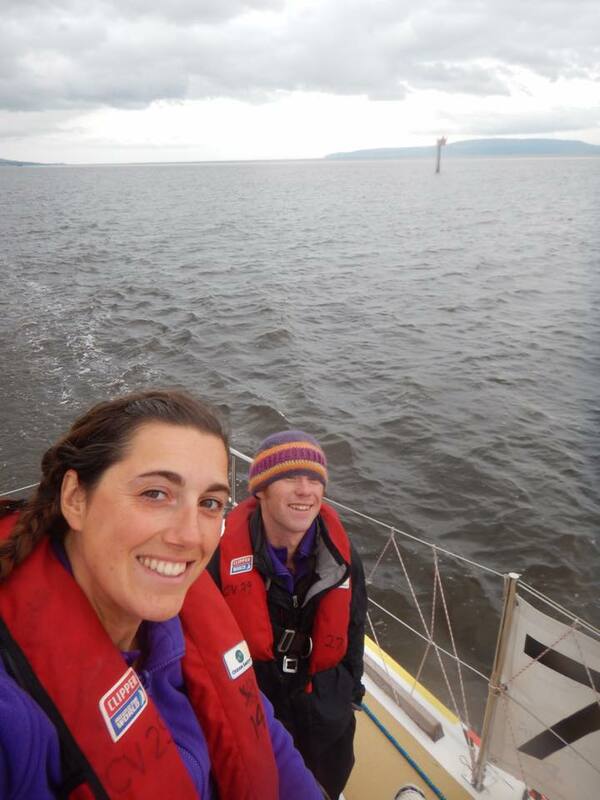 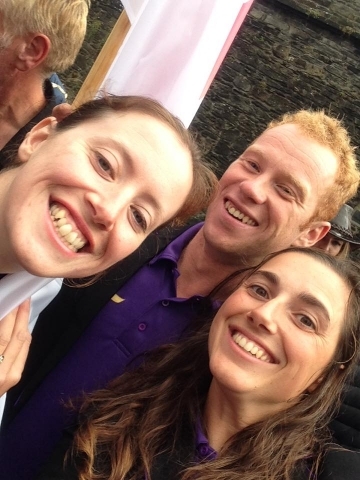 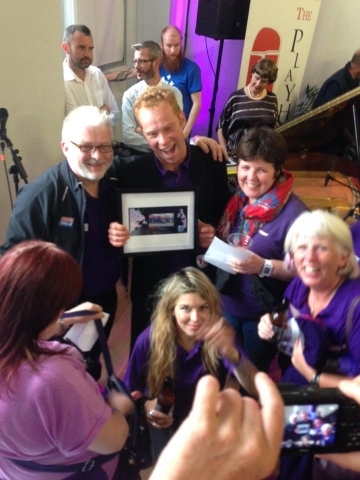 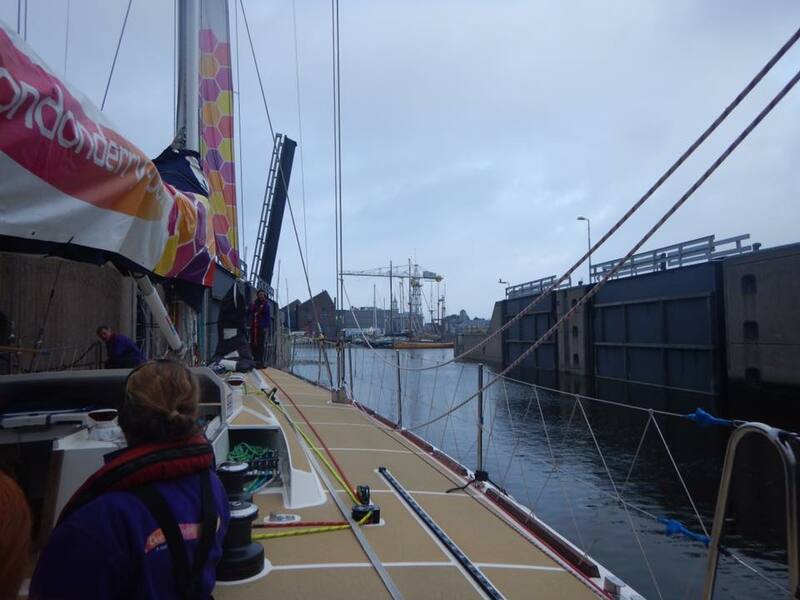 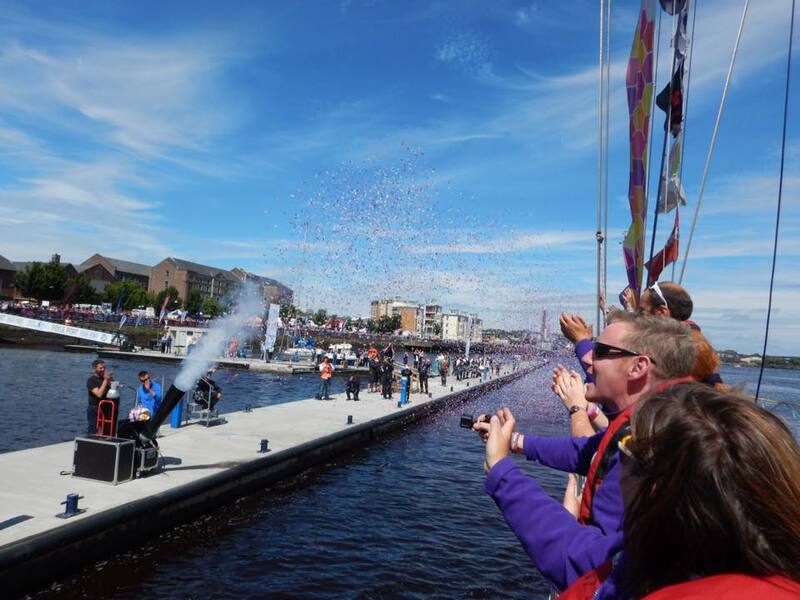 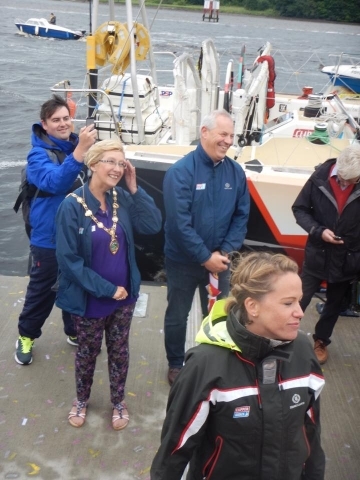 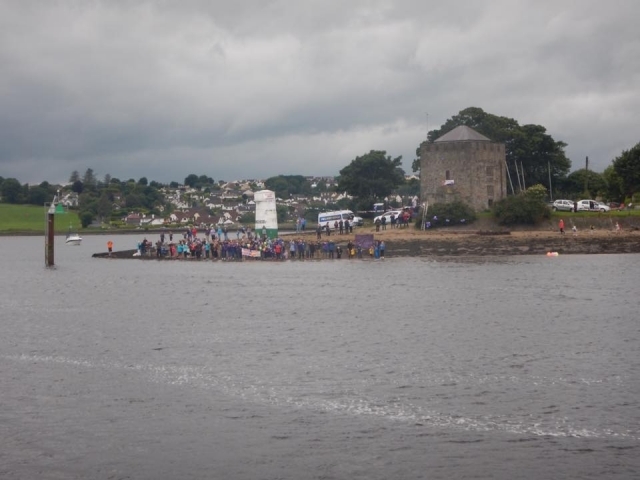 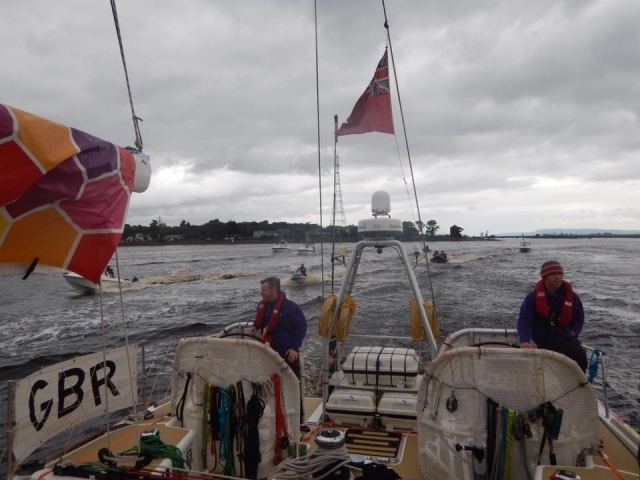 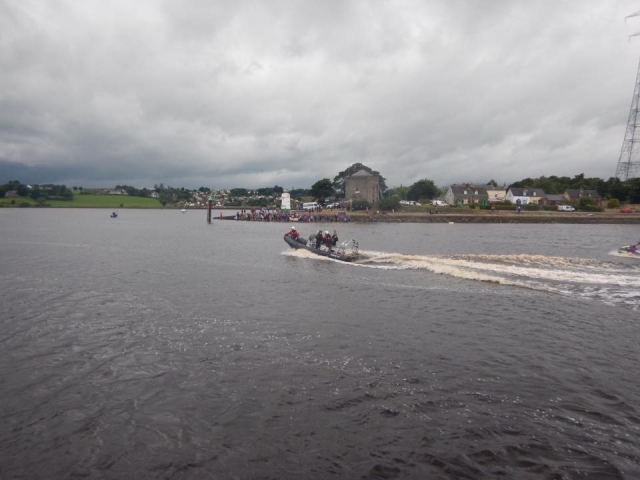 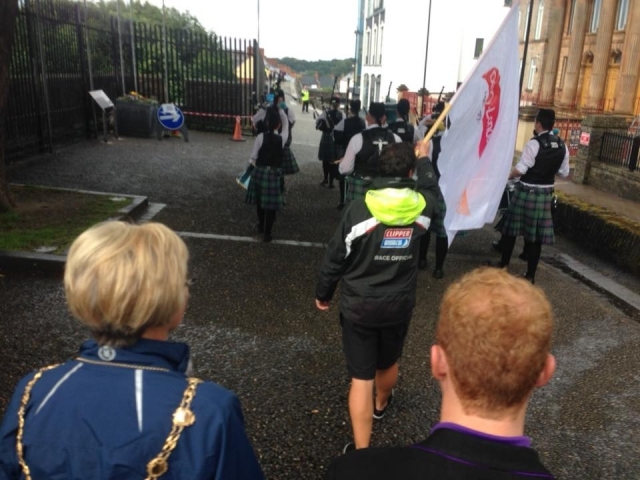 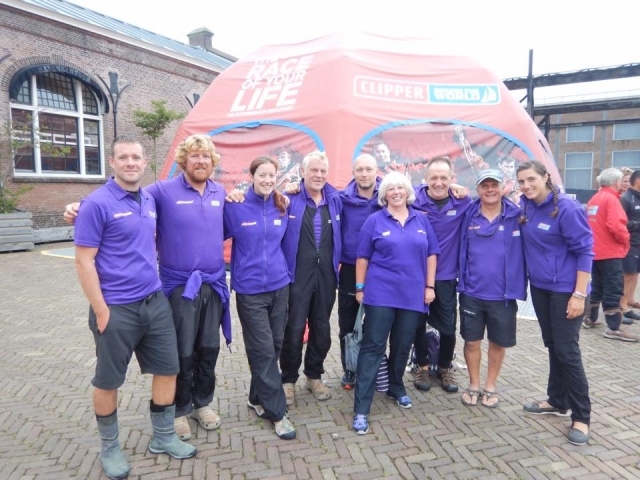 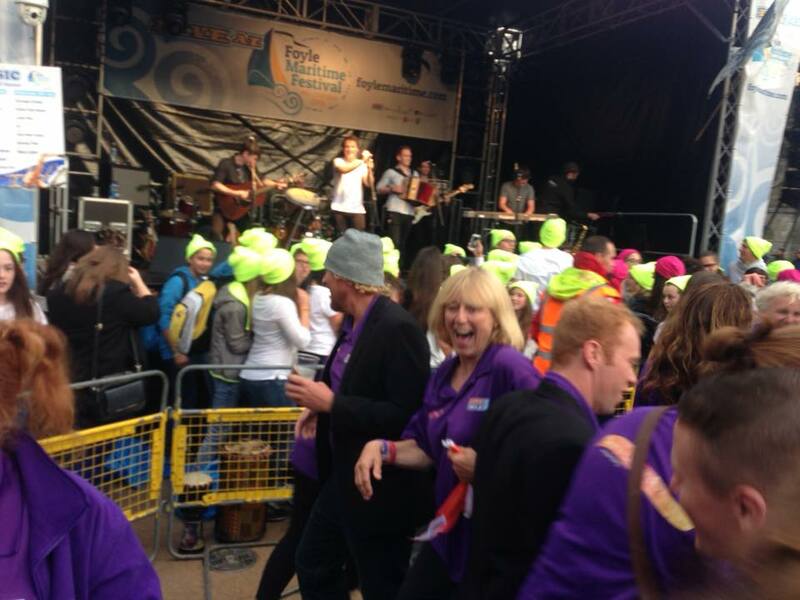 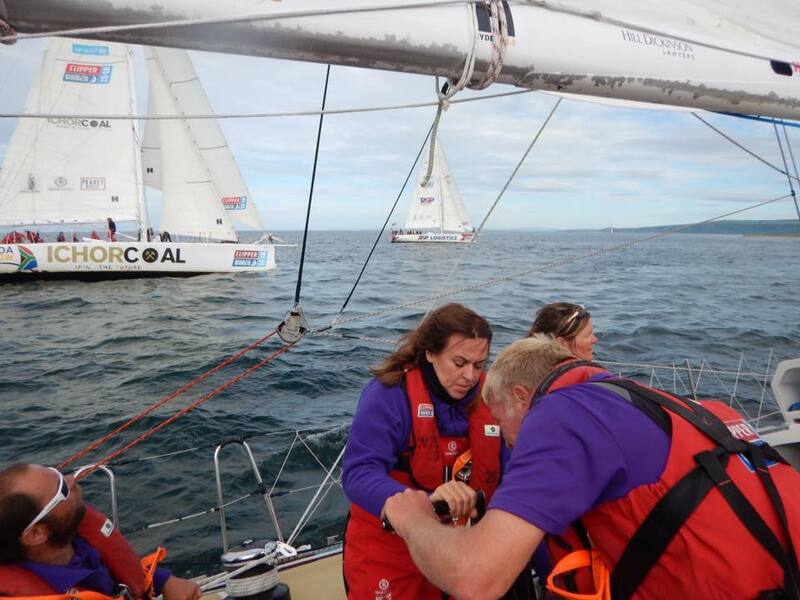 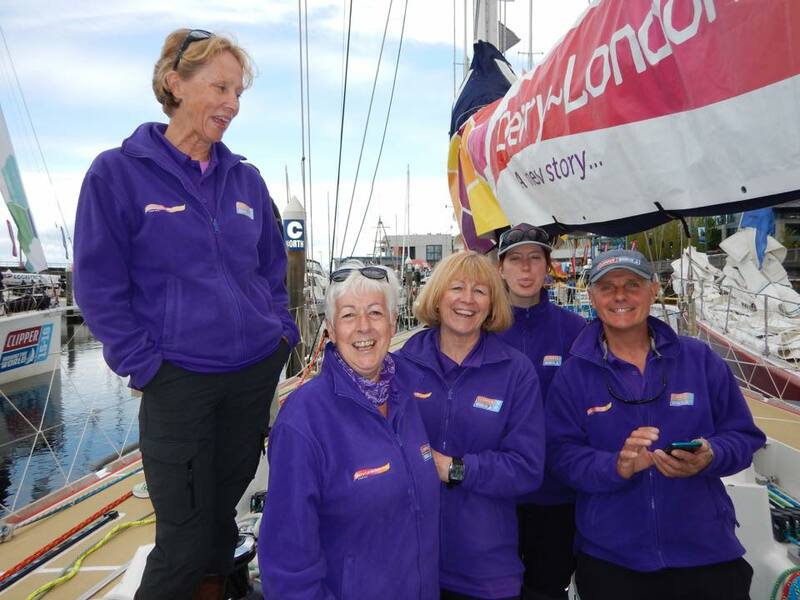 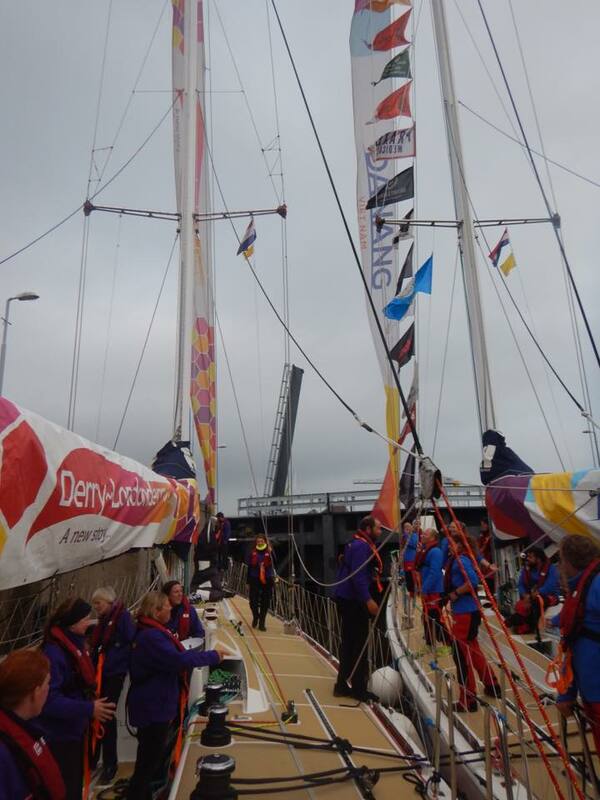 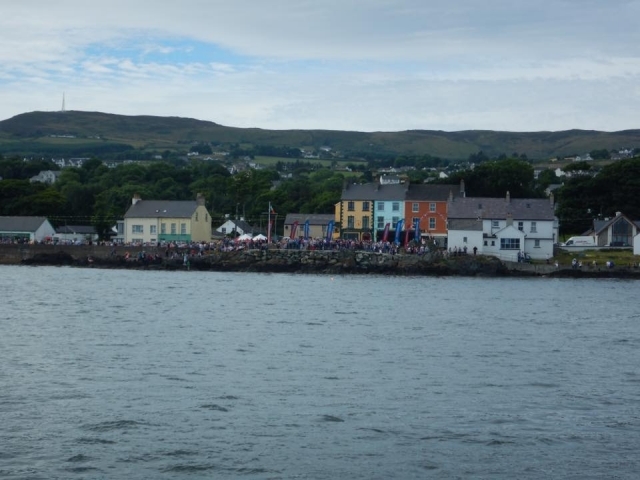 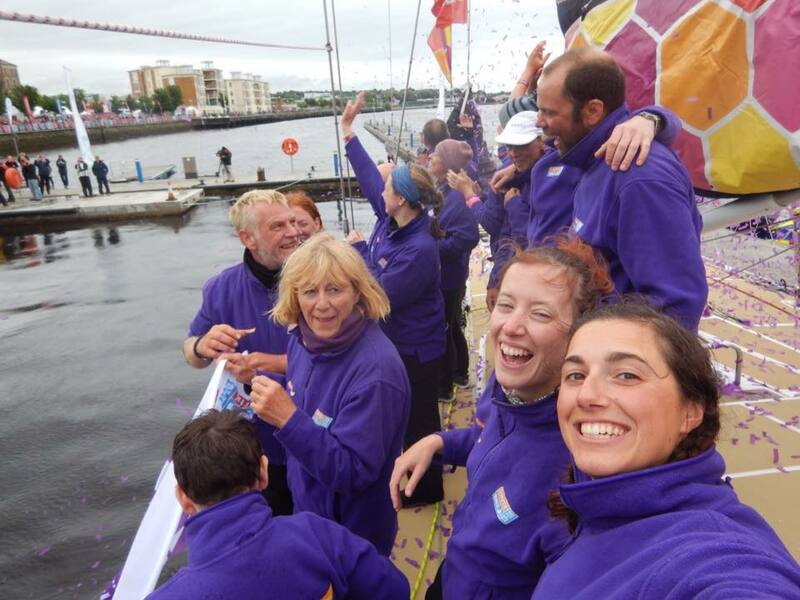 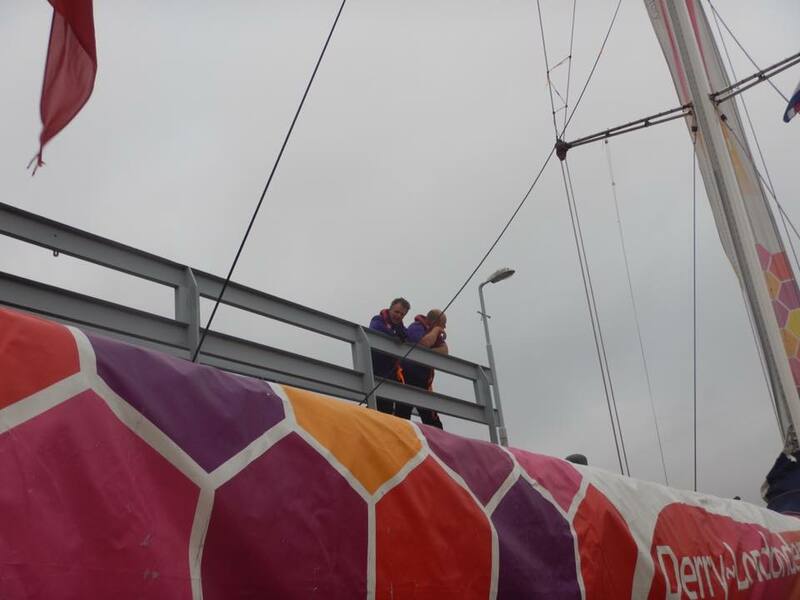 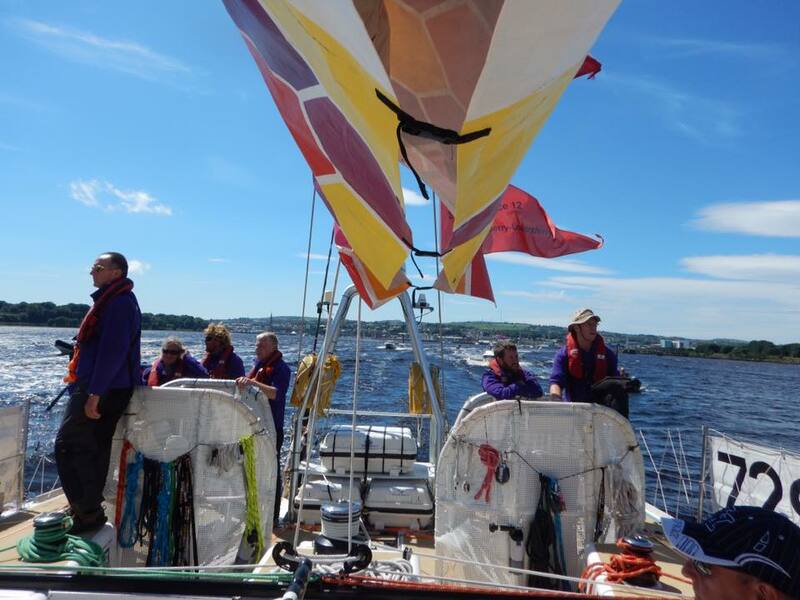 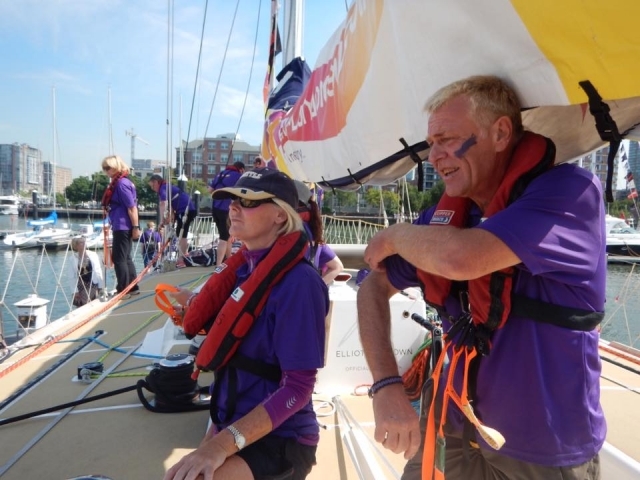 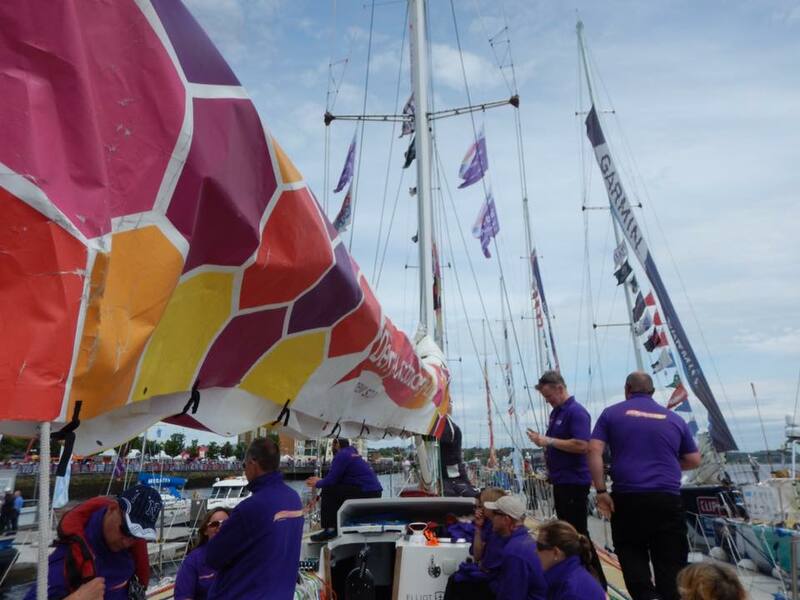 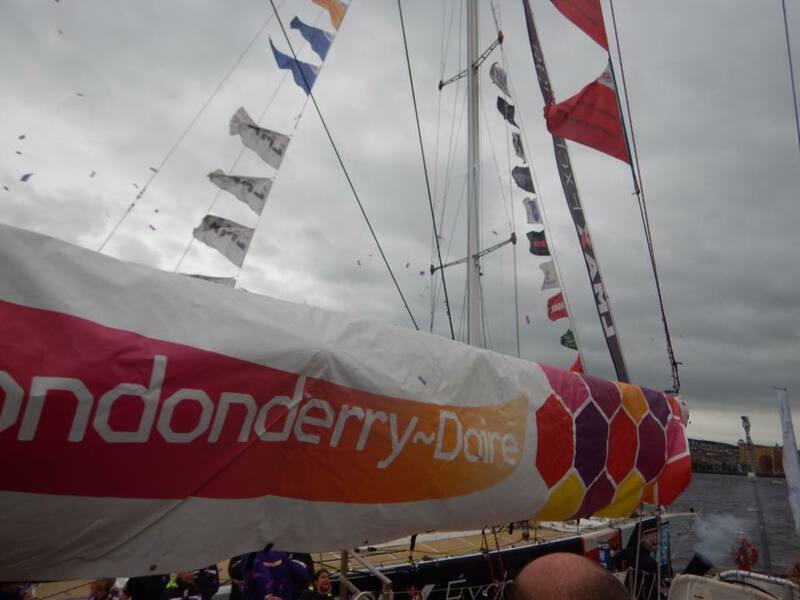 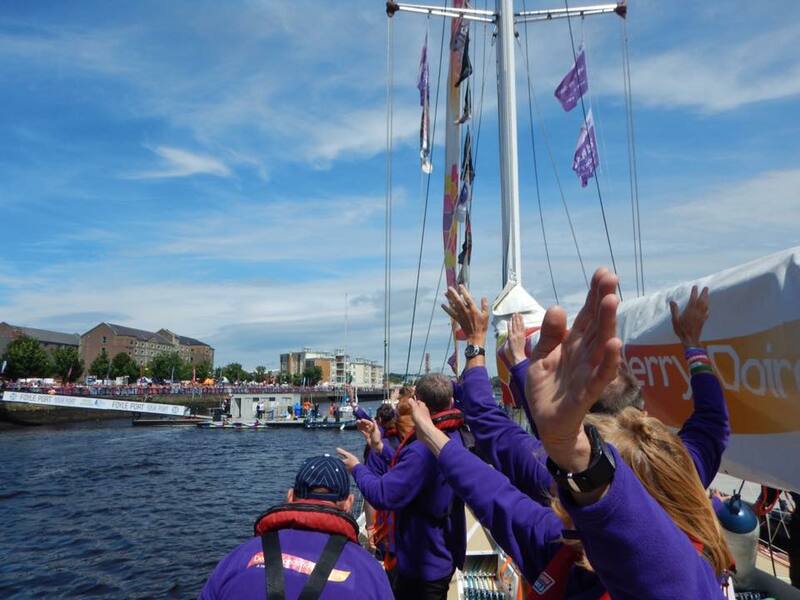 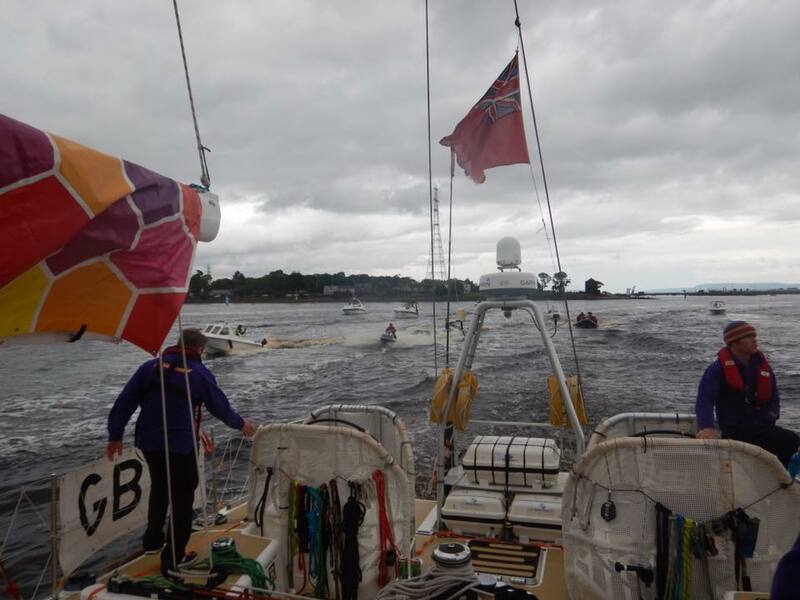 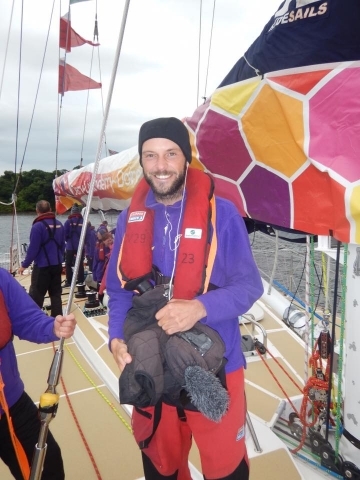 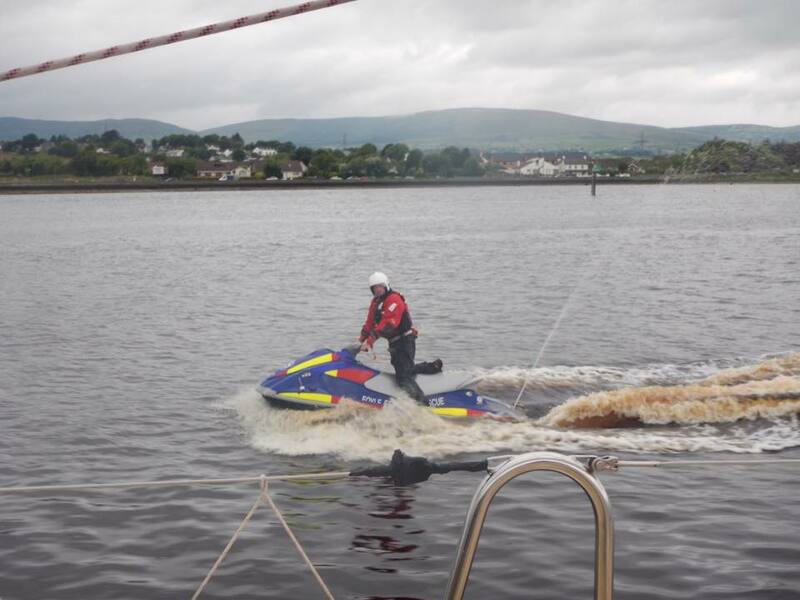 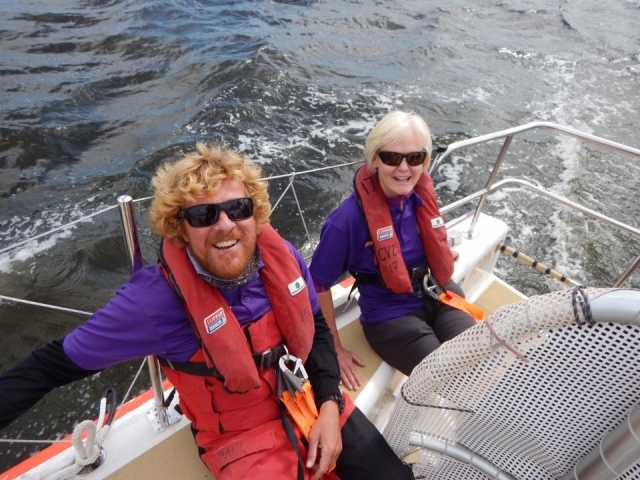 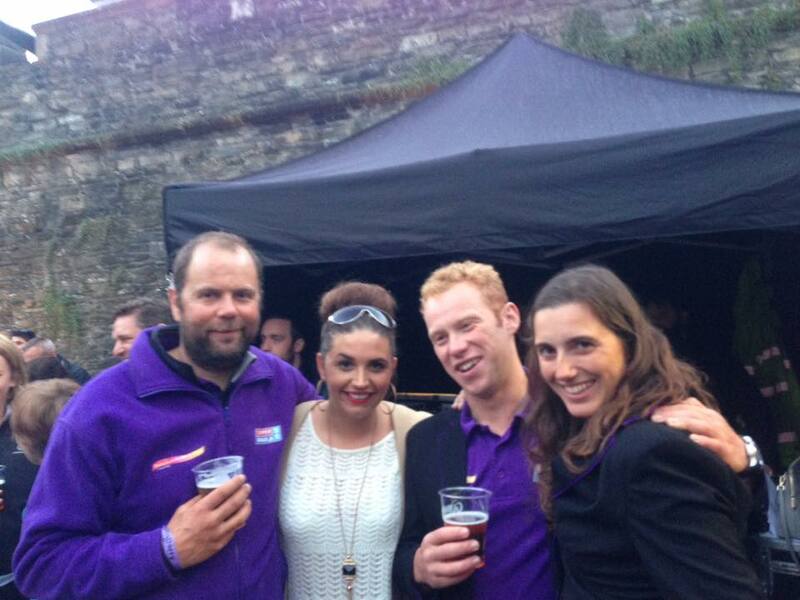 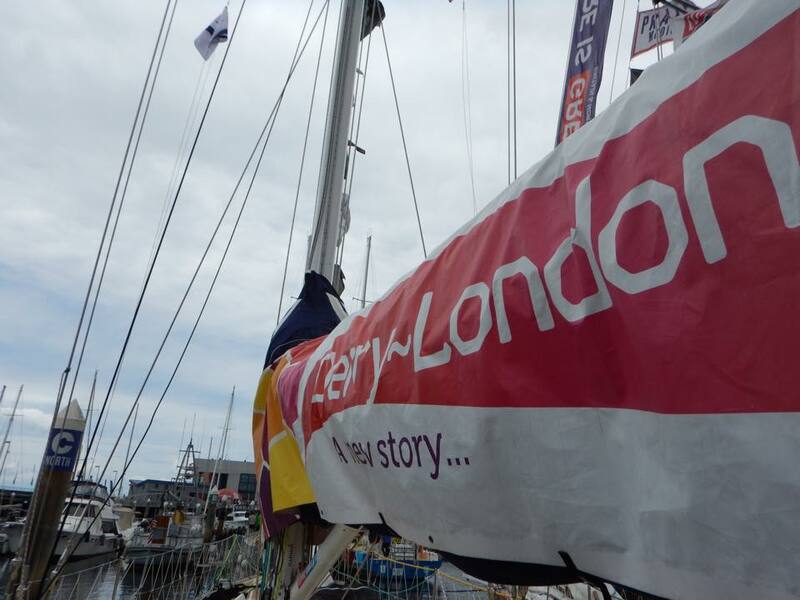 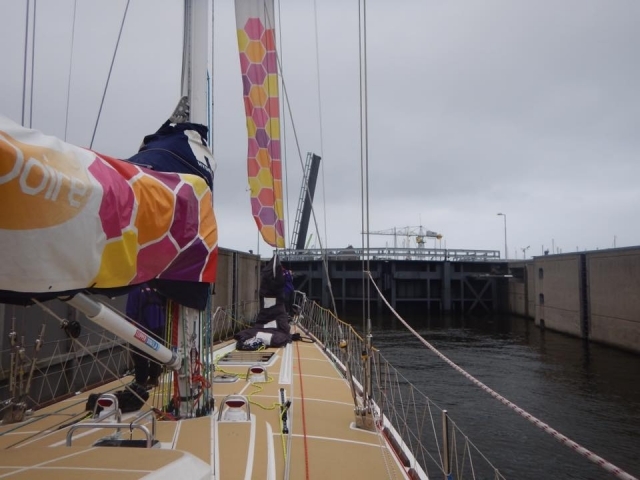 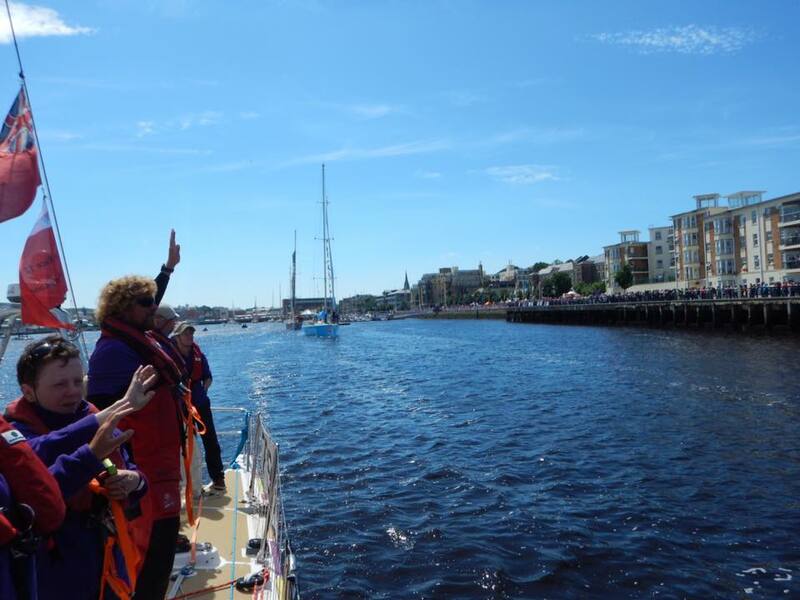 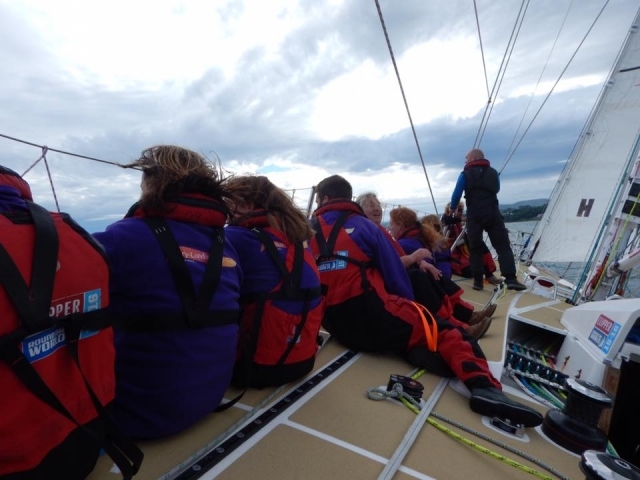 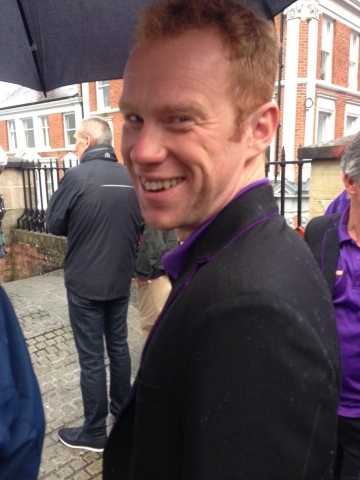 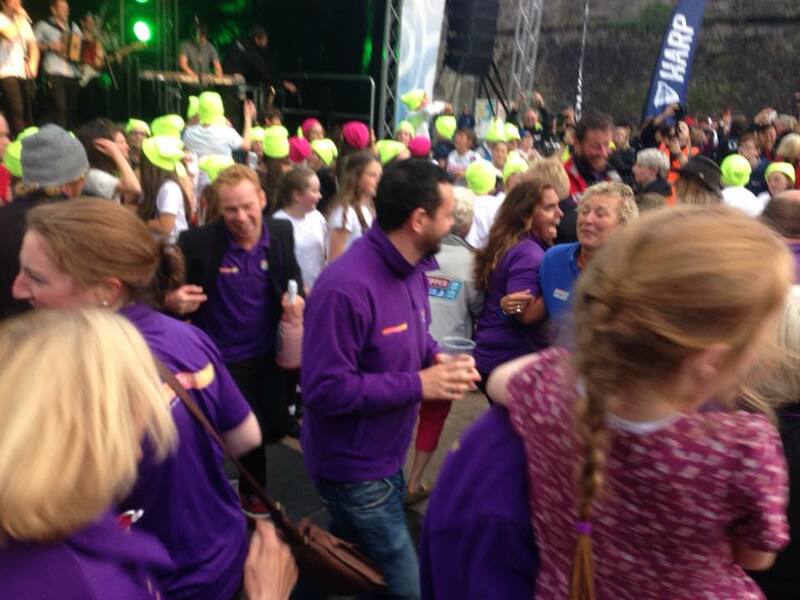 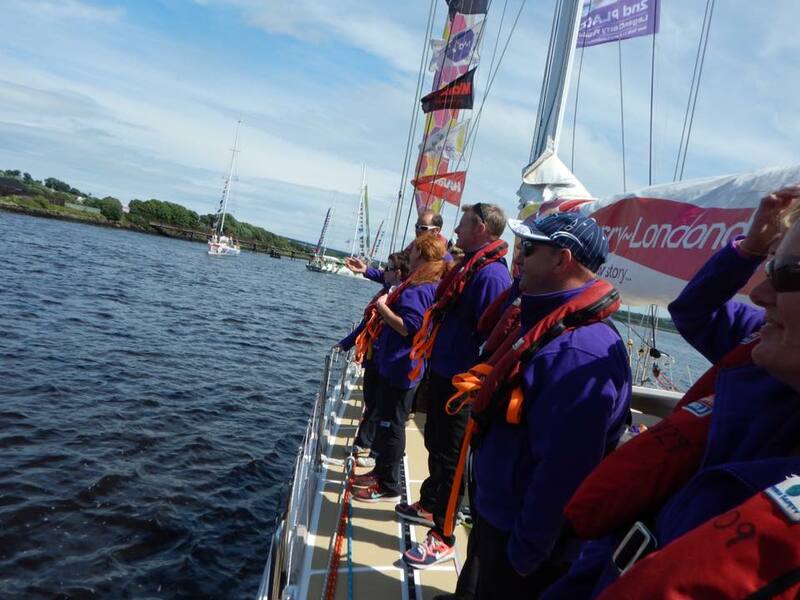 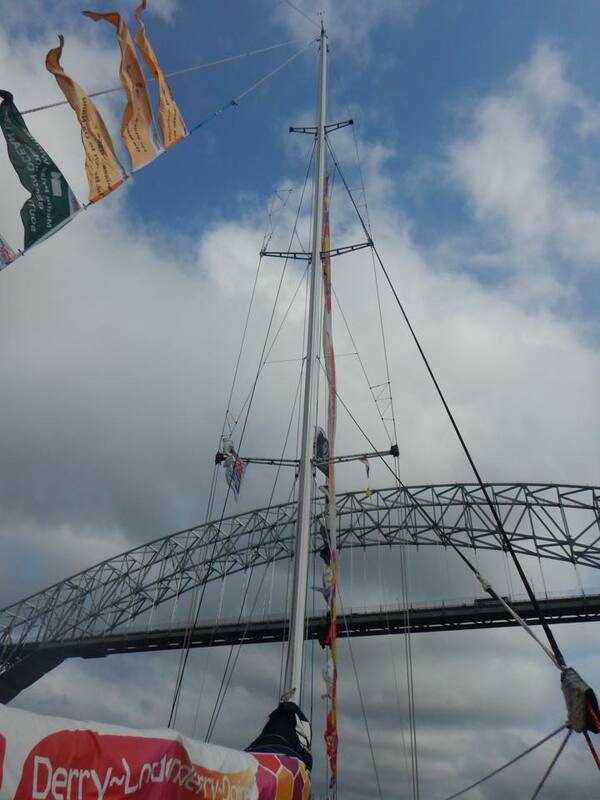 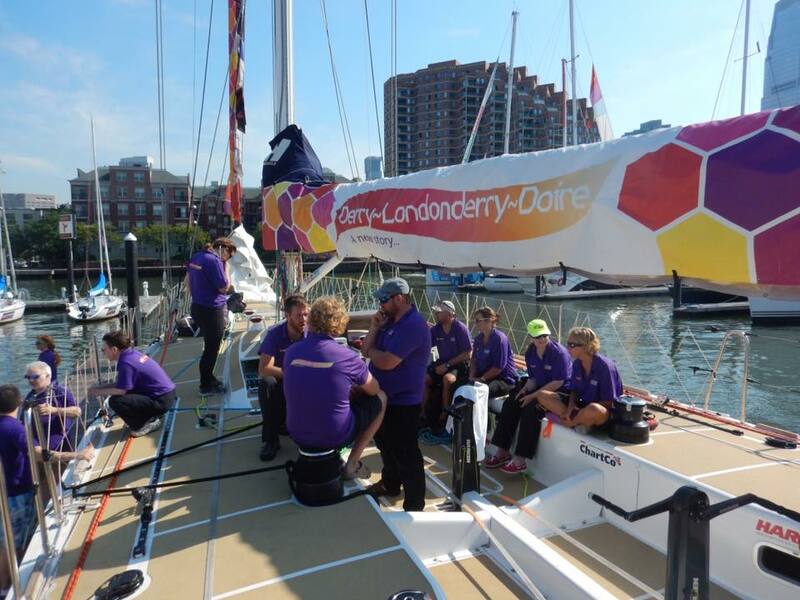 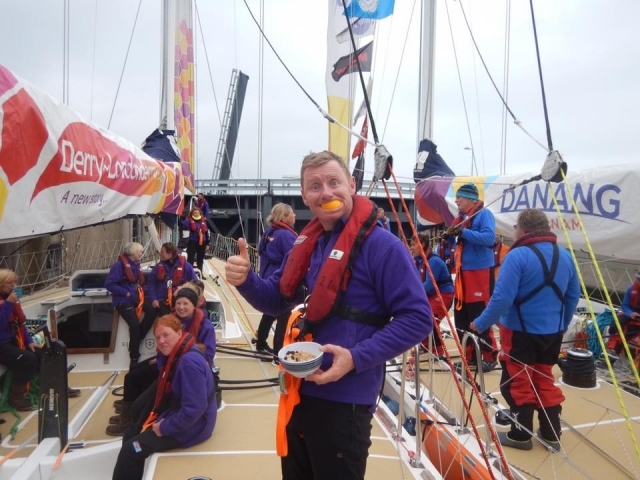 All the way from Greencastle to where we moored up in the city of Derry there were supporters lining the banks and cheering us in – many dressed in purple to show their support. The nearer to the city we got the louder the crowds became. 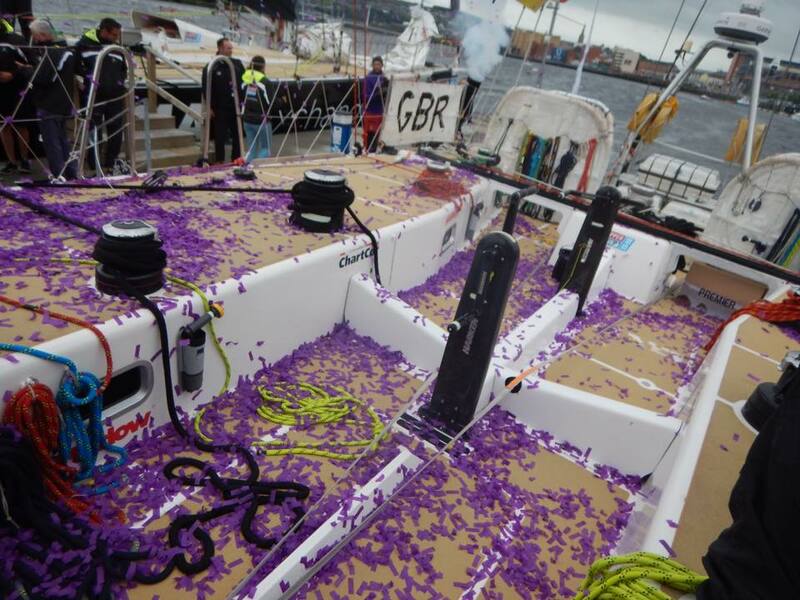 We were even covered in a confetti cannon on arrival. 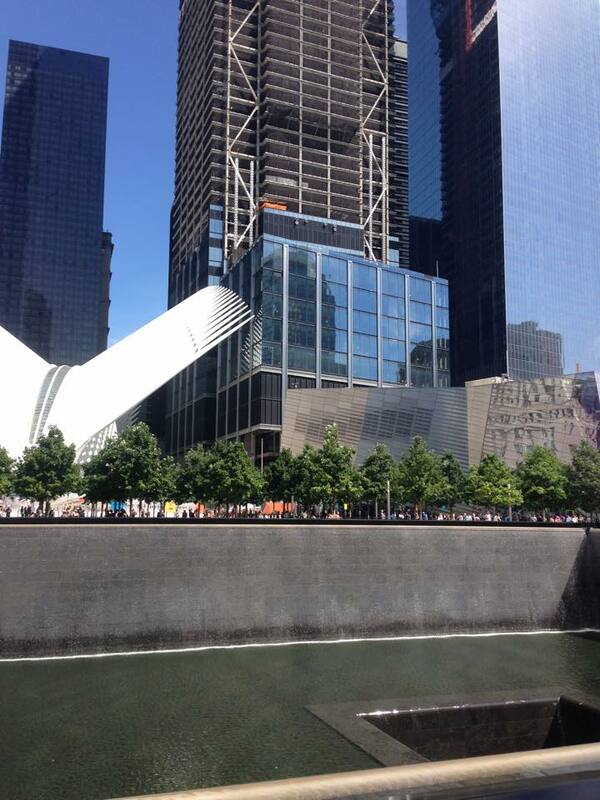 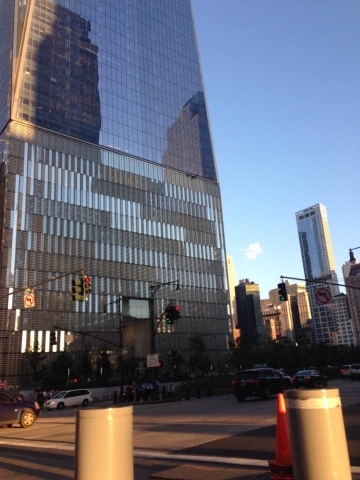 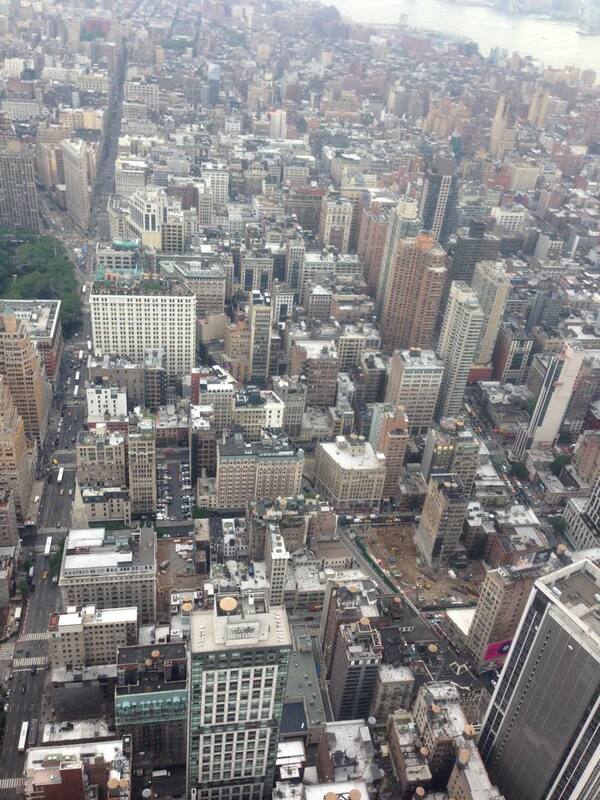 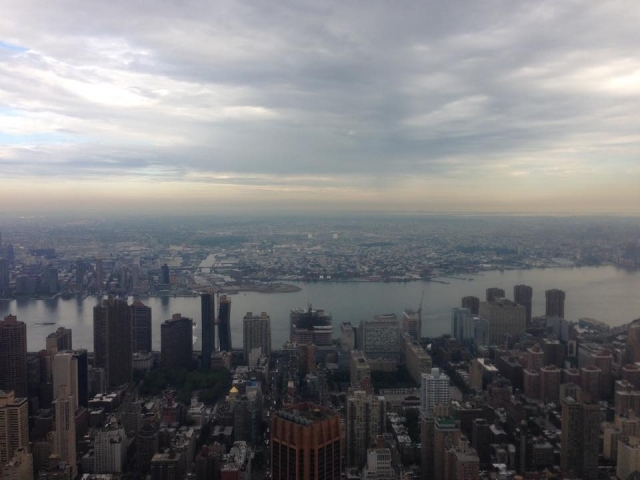 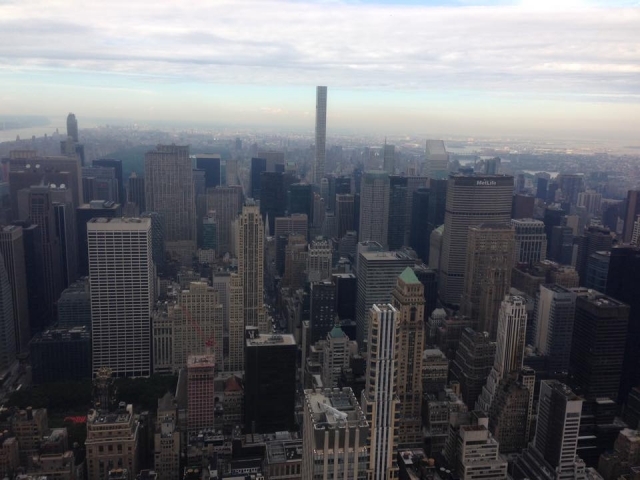 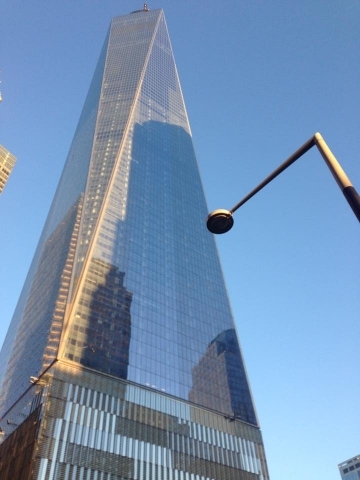 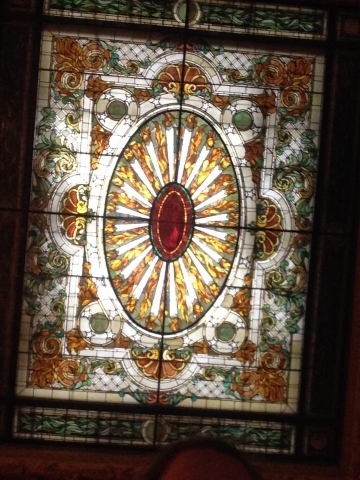 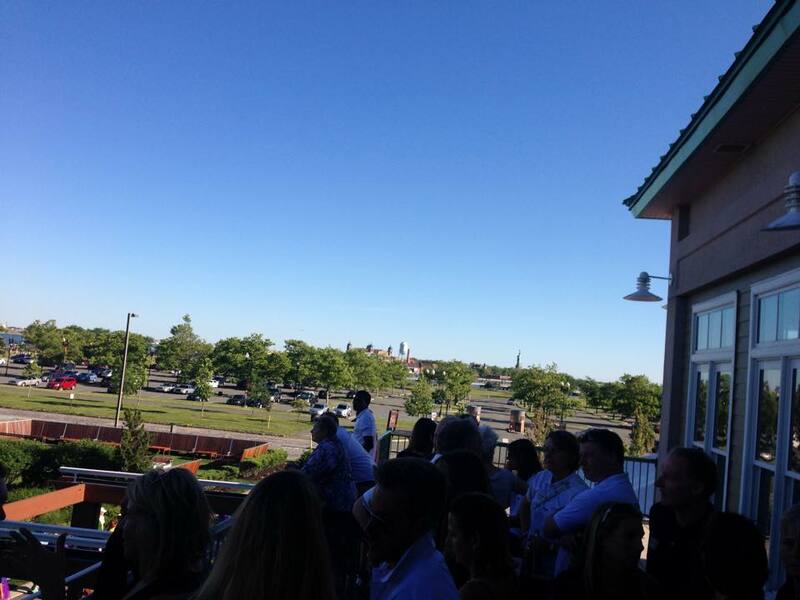 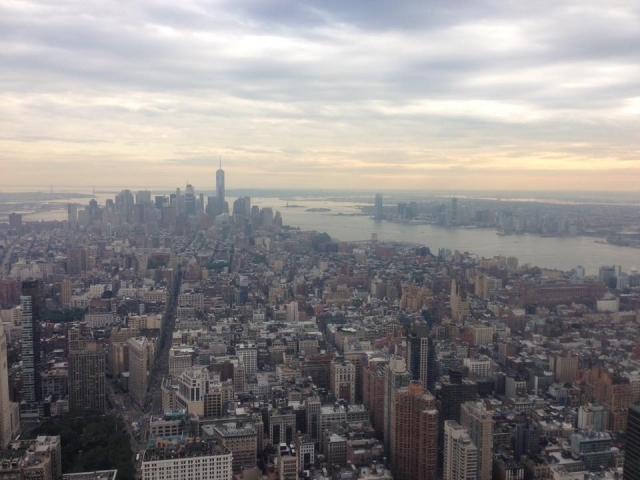 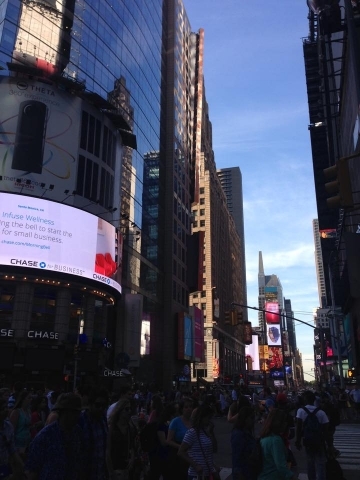 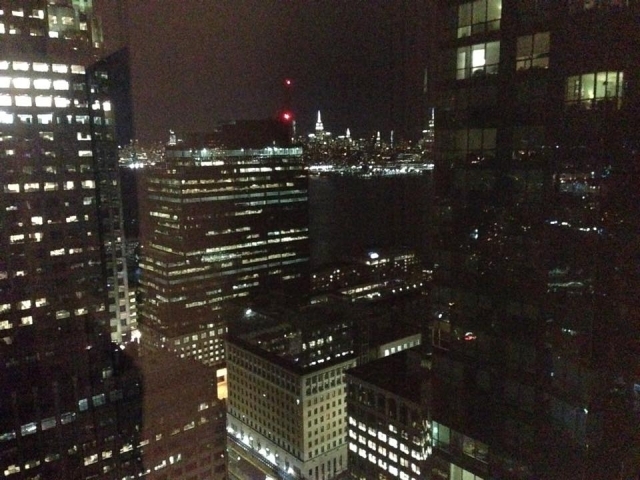 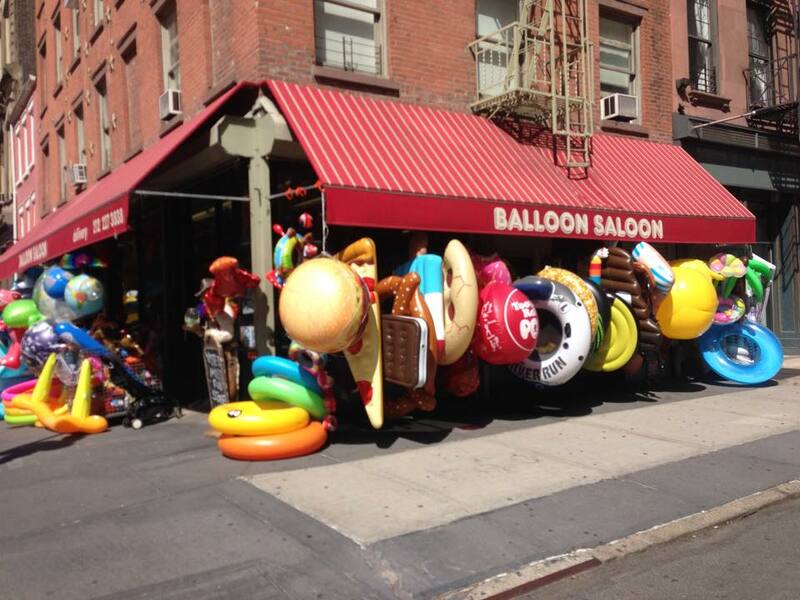 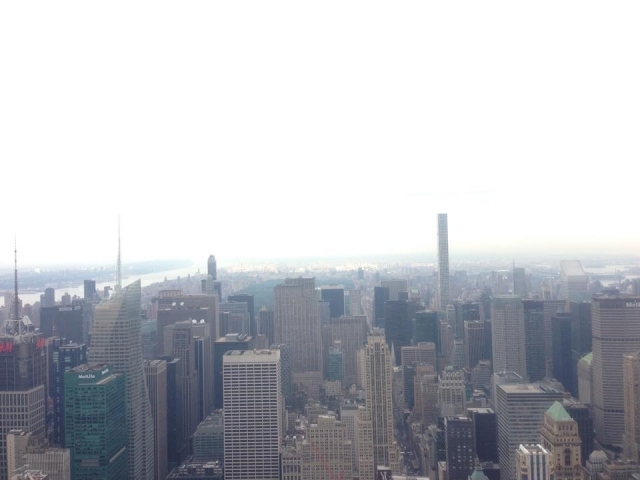 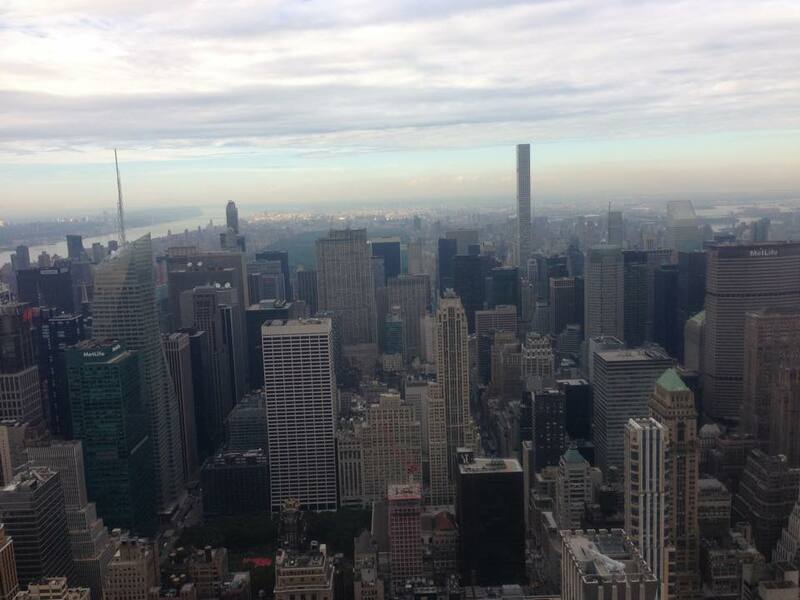 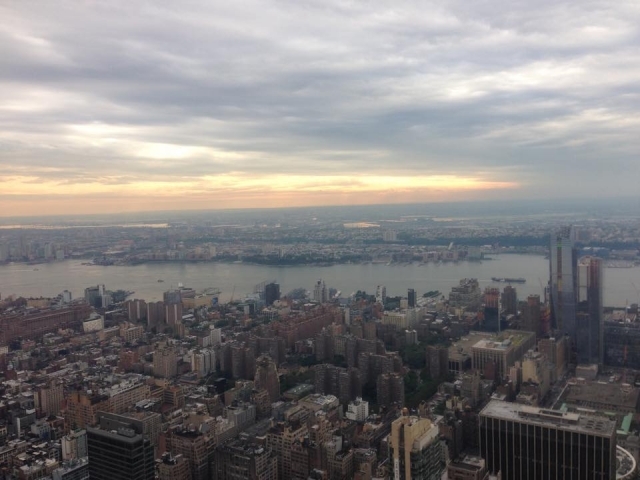 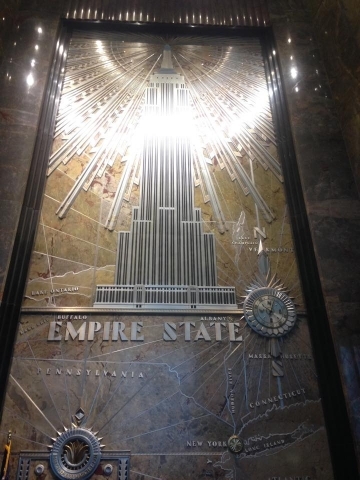 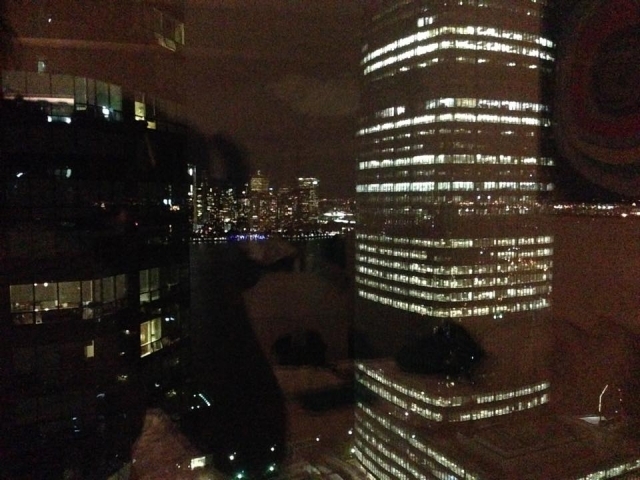 The city it appears was proud of us, no matter what which made our arrival more pleasurable. 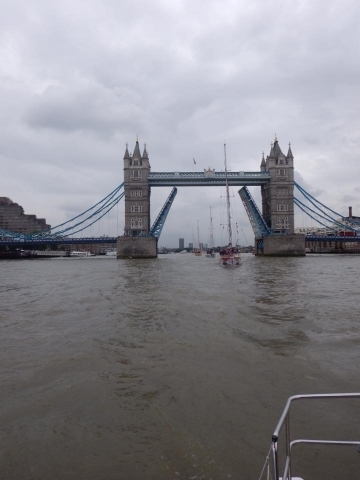 We were too quick for Mum and Dad to be here for our arrival but I was glad of their hugs the following day as the last one I had from them was the 30 August when we left London last year. 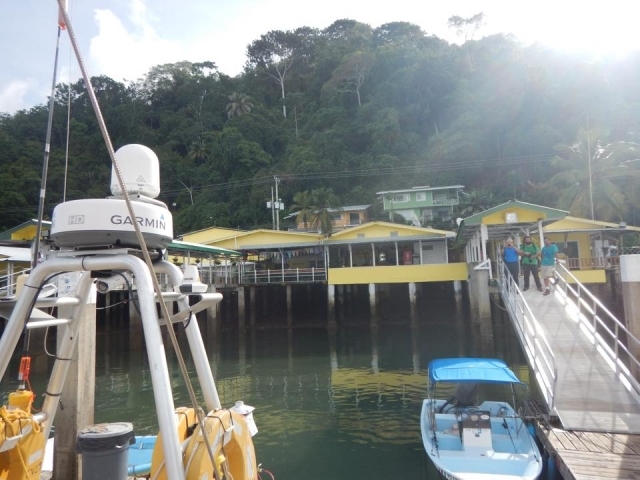 I have always looked forward to being the home team in a home port but never expected the welcome to be so warm and friendly. 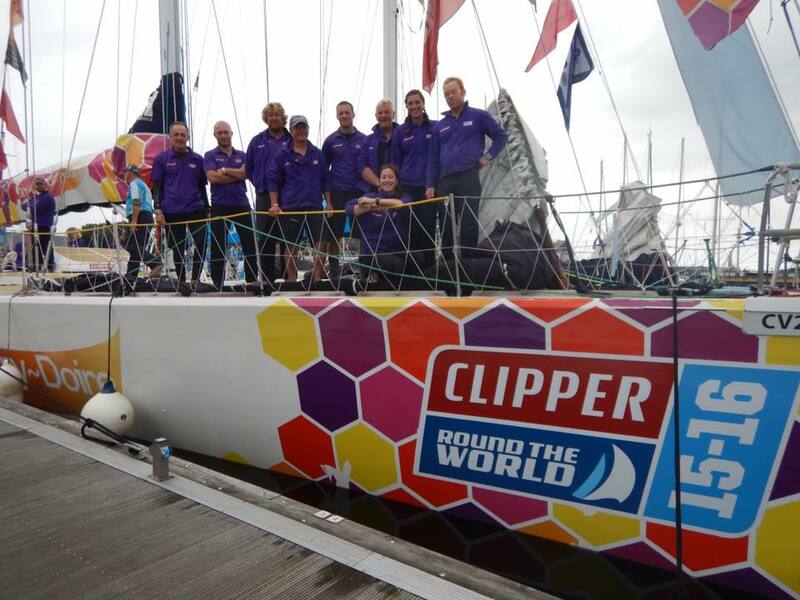 People get Clipper here and are truly excited to welcome ‘their’ team. 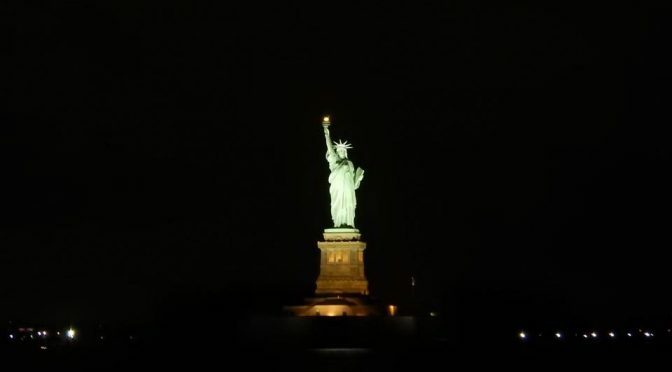 It doesn’t matter that I am not from the city, we have all been treated like heroes. 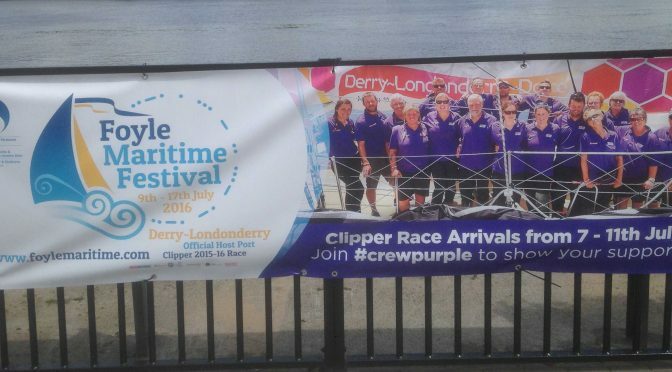 People have stopped me in the street as they recognised me as being Derry crew (even when not in Clipper kit!) and we are all famous as we are are on banners across the city. 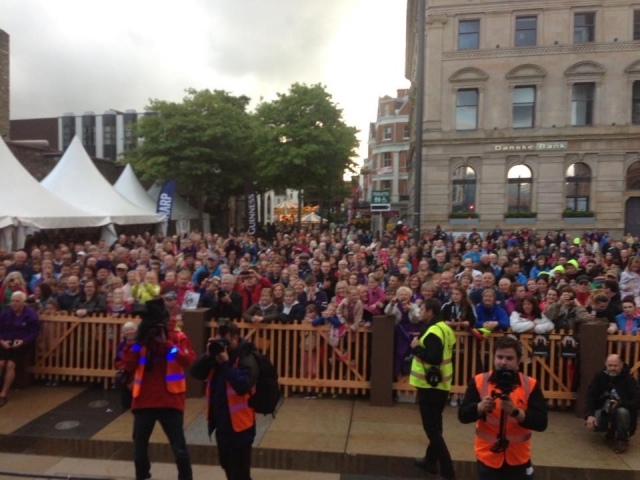 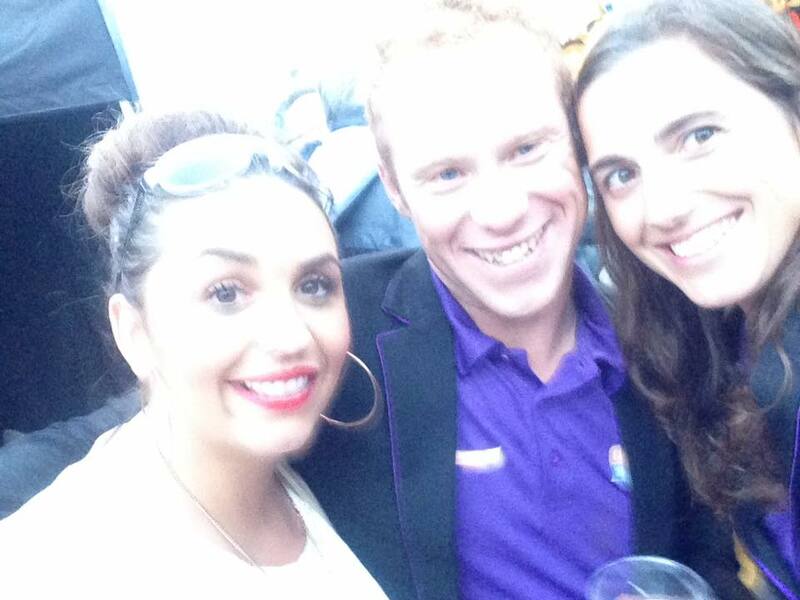 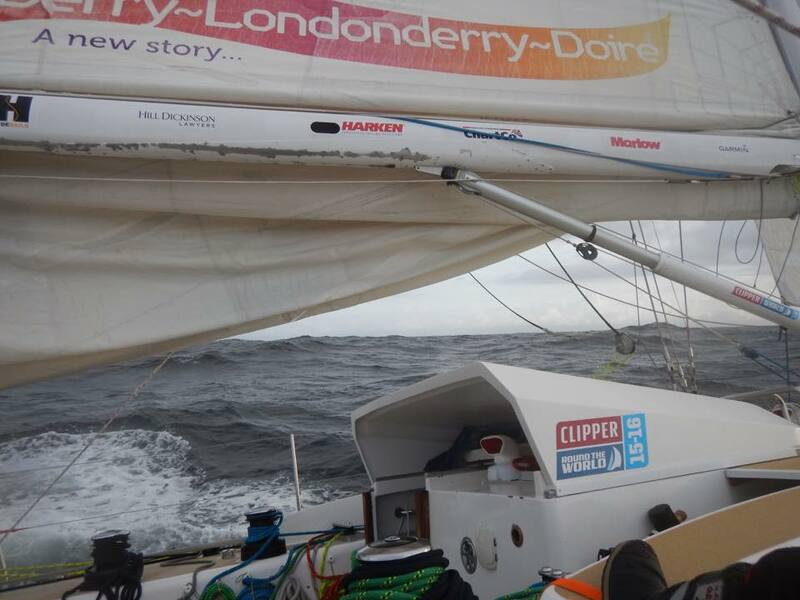 Thank you Derry for making us so welcome here – this is one of the greatest Clipper memories I will have. 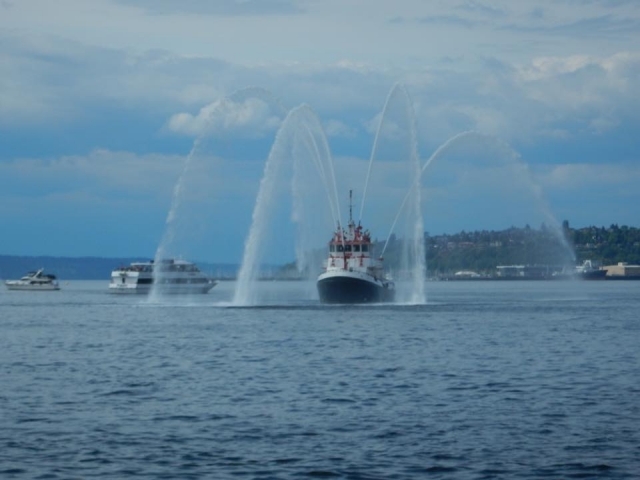 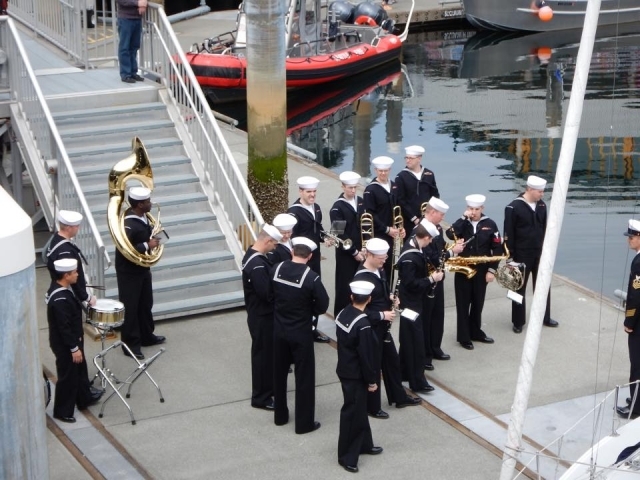 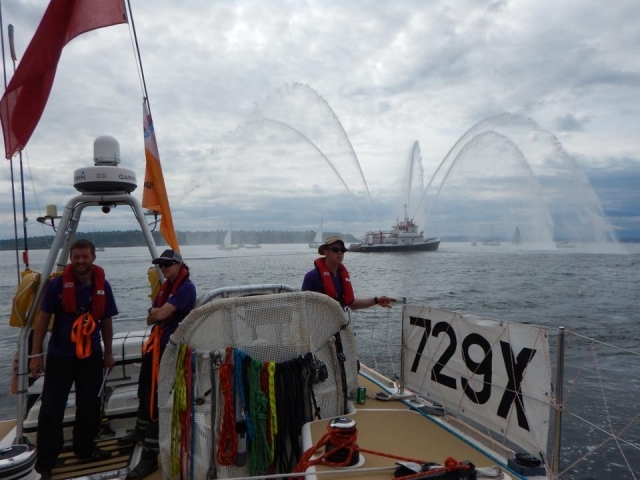 We left Seattle to a ceremony which involved the navy band playing us out along with a fire boat giving us a watery display during the parade of sail. 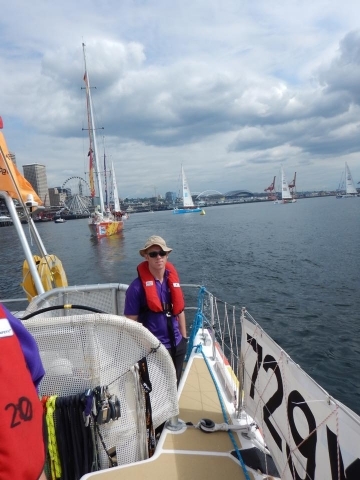 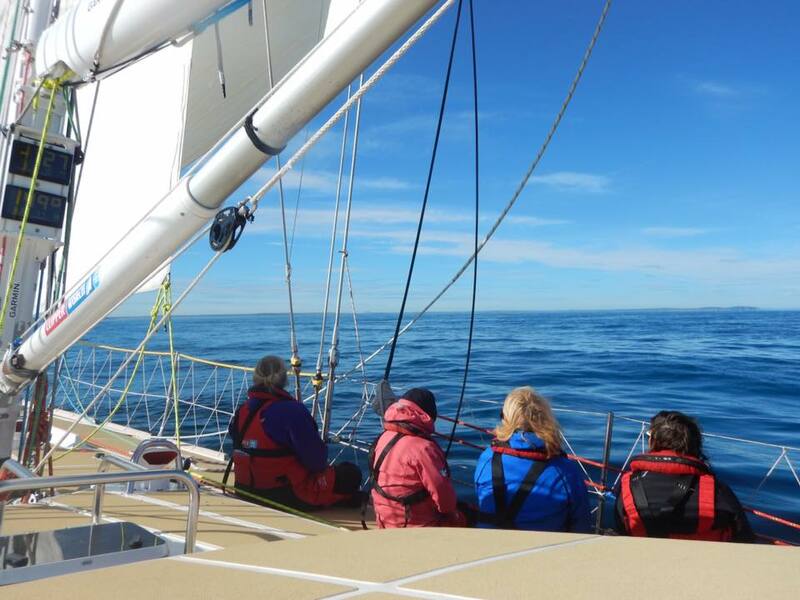 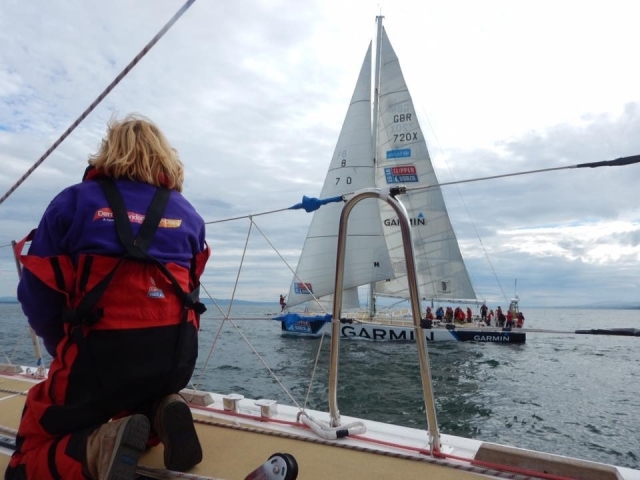 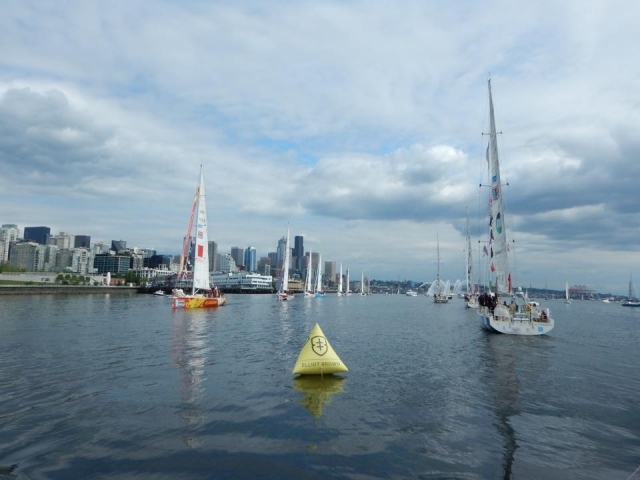 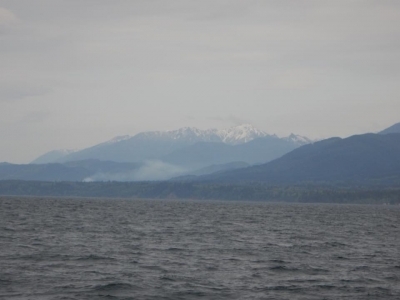 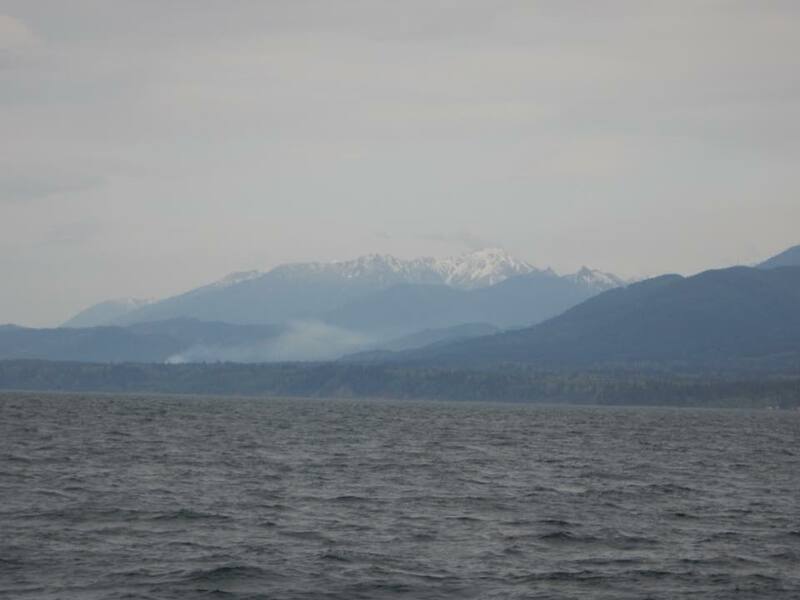 As Seattle has a major shipping lane leading up to the city we motored out to sea for another Le Mans start. 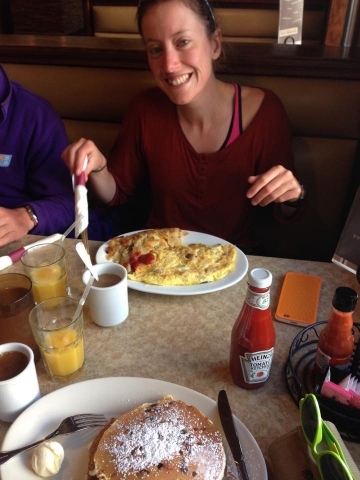 The climate was noticeably warmer then on our way into Seattle which was reassuring as I’ve learnt that I’m not good at coping in the cold during this race! For the leg I’ve been given the role of navigator for our watch (haha I hear you cry!) so am glad that all that needs to happen really is ensuring the land is always on out port side and then we can’t go wrong! 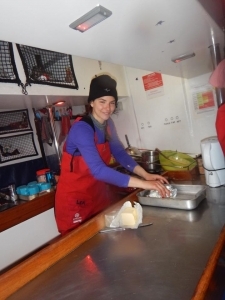 It’s good to be pushed with new skills and I’ve enjoyed learning more. 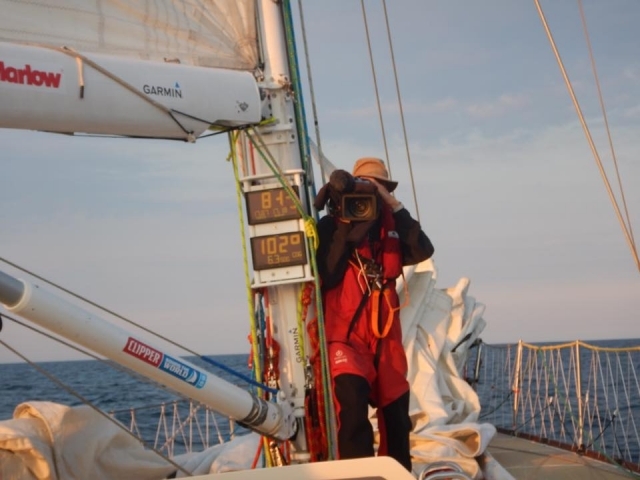 Dan has also begun to teach me how to use a sextant which so far I’ve not been that successful with but hoping to get better as time goes on. We have been treated to much more wildlife this race and I’ve ticked off turtle in my spotting list. 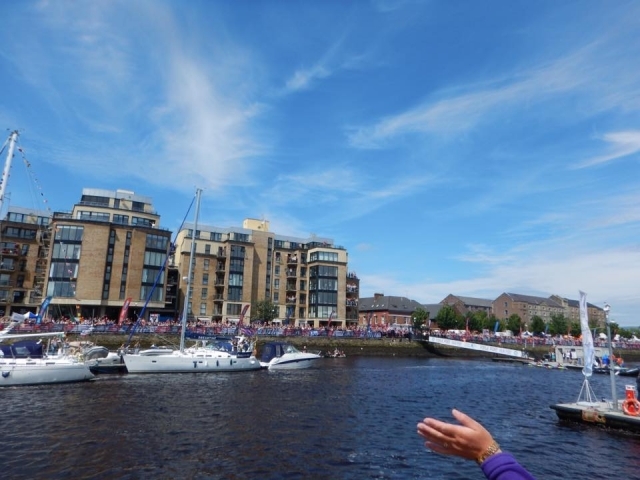 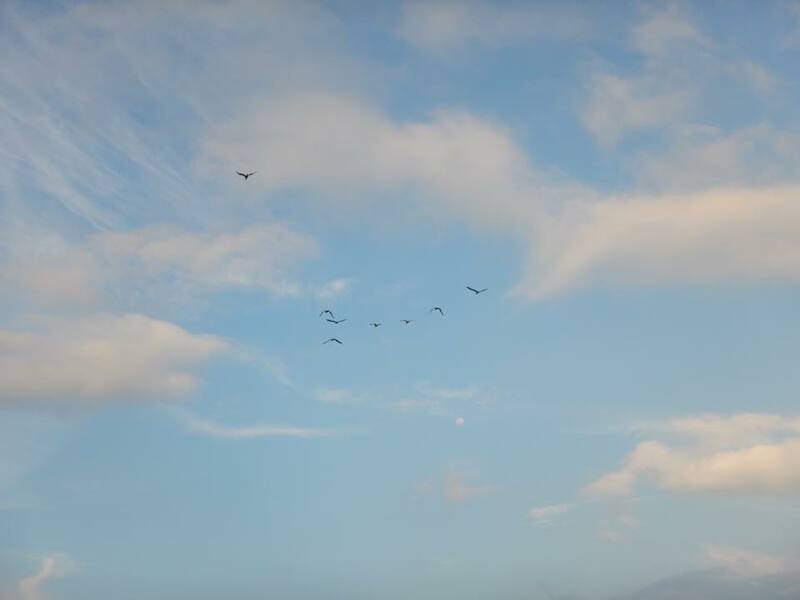 They always seemed to be waving at us as they floated by. 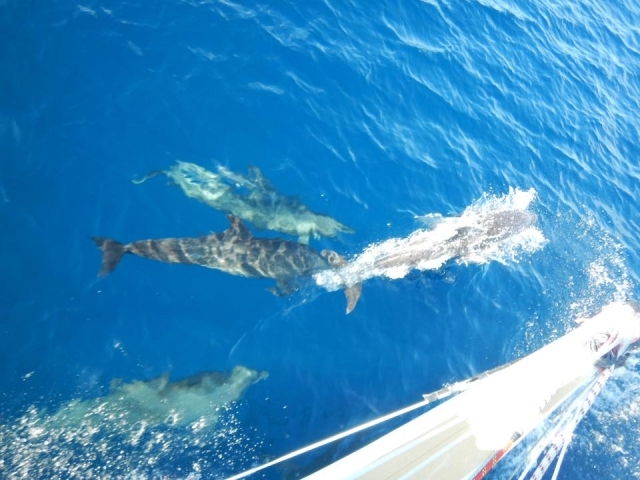 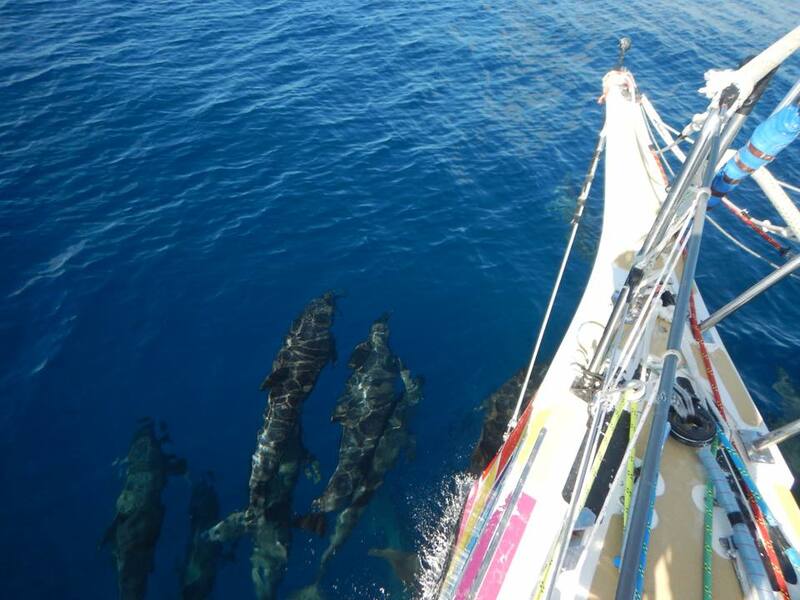 We have had lots of Dolphins of all shapes and sizes and have been treated to their dancing across the bow and jumping out the water. 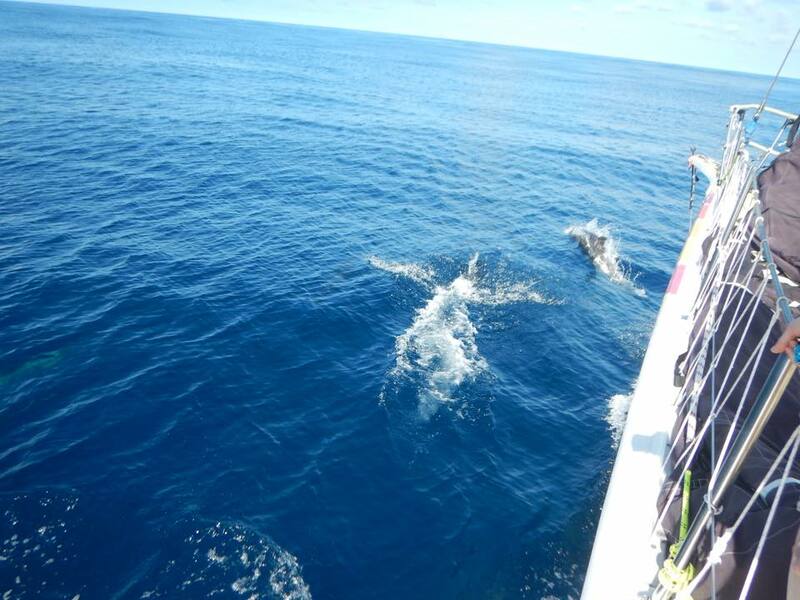 There have been a few sail fishes passing us which are another impressive sight. 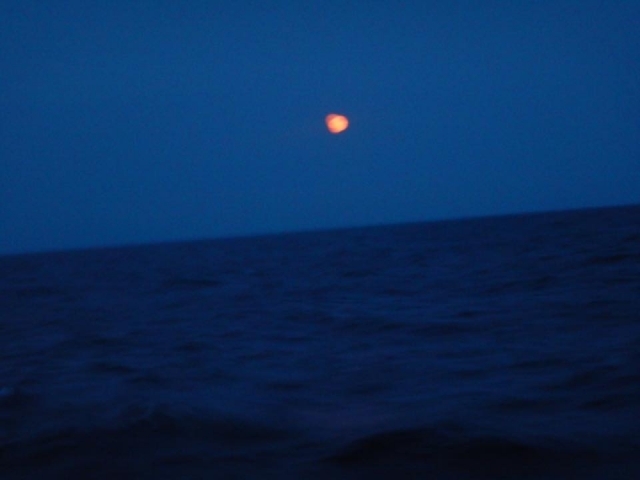 One evening we were treated to the most spectacular moon – it was so bright and then was encased by a halo of light and fluffy clouds. 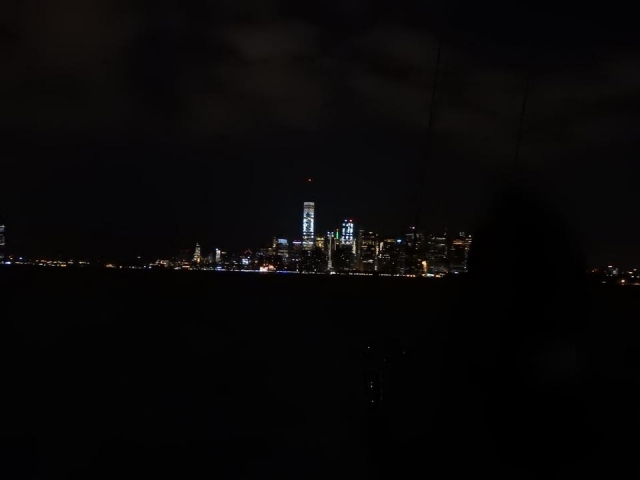 I wish I could have taken a photo of it to share but sadly it doesn’t work in the dark nor is it ever possible to capture these amazing skies in their full glory. The weather has brought lighter winds and less challenging conditions which has meant the fleet has stayed closer together. This has also meant for the majority of the race we’ve had sight of other yachts which makes for a different kind of race. 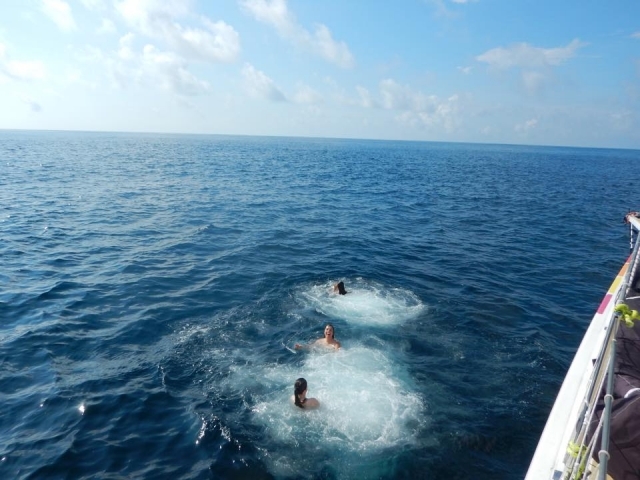 The weather continued to warm up the further south we got so back to living in a sweat pool. 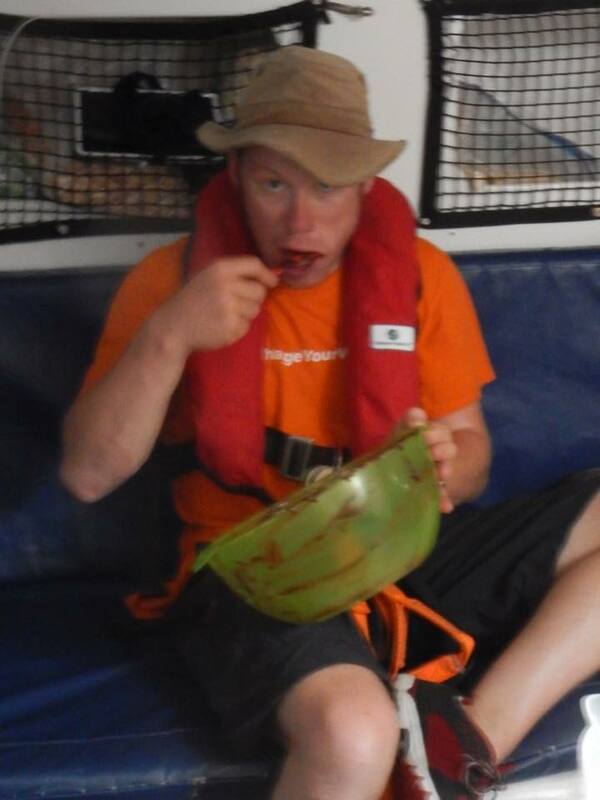 As disgusting as it sounds I’m still happy to be hot! 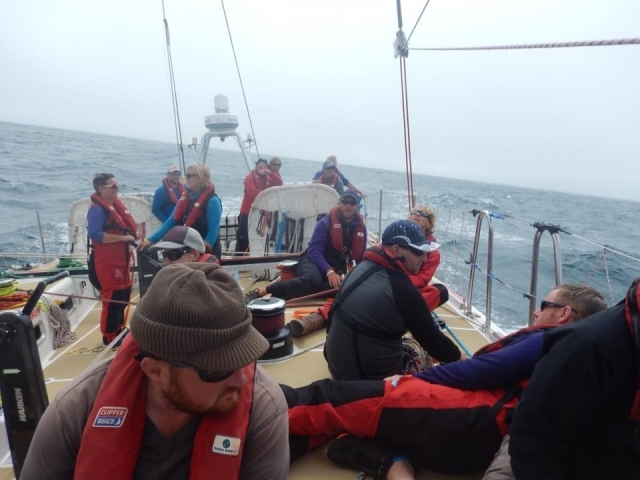 At least the racing hasn’t been as strenuous as the last hot leg was although the conditions have been tough for some of our joiners! 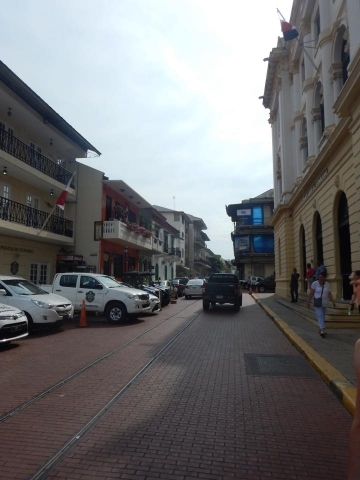 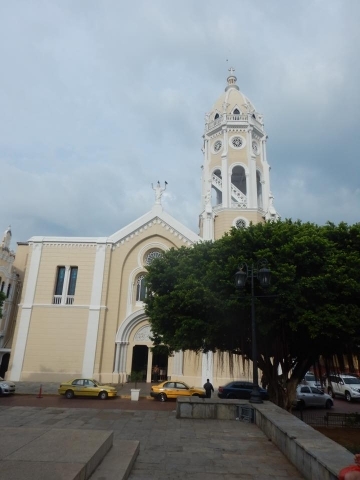 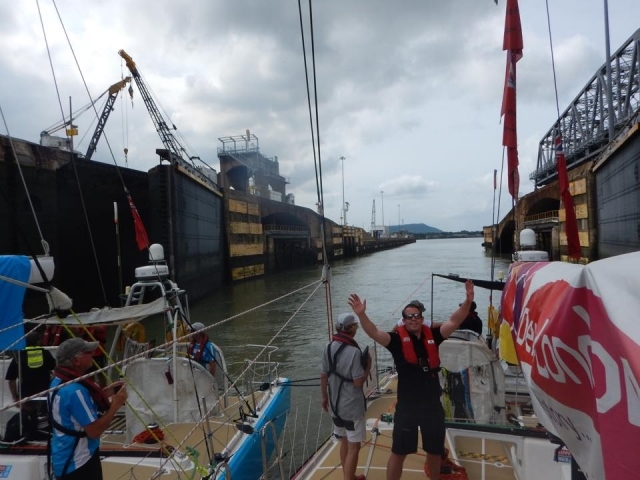 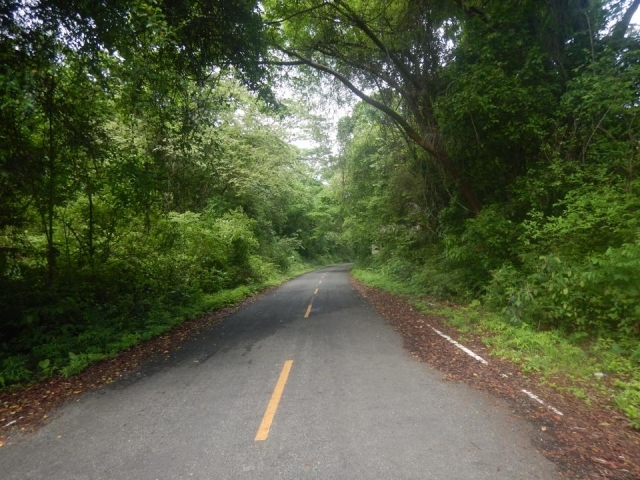 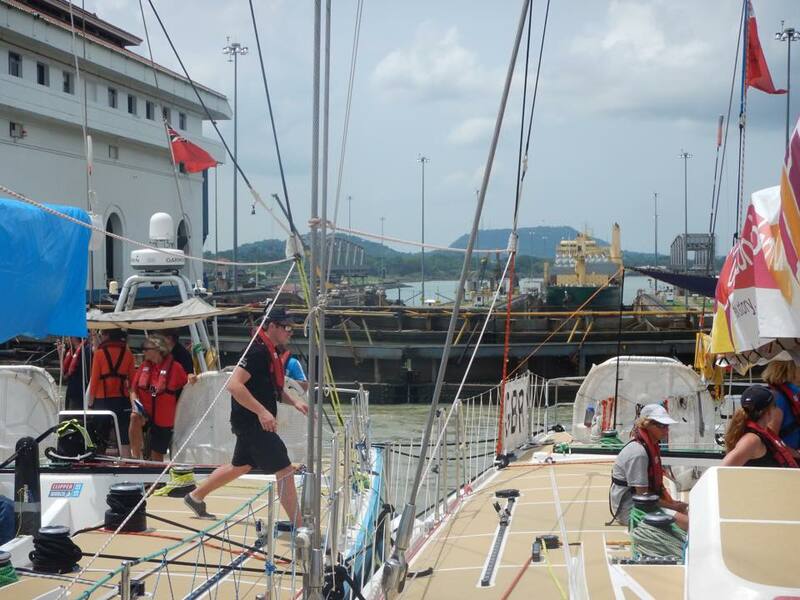 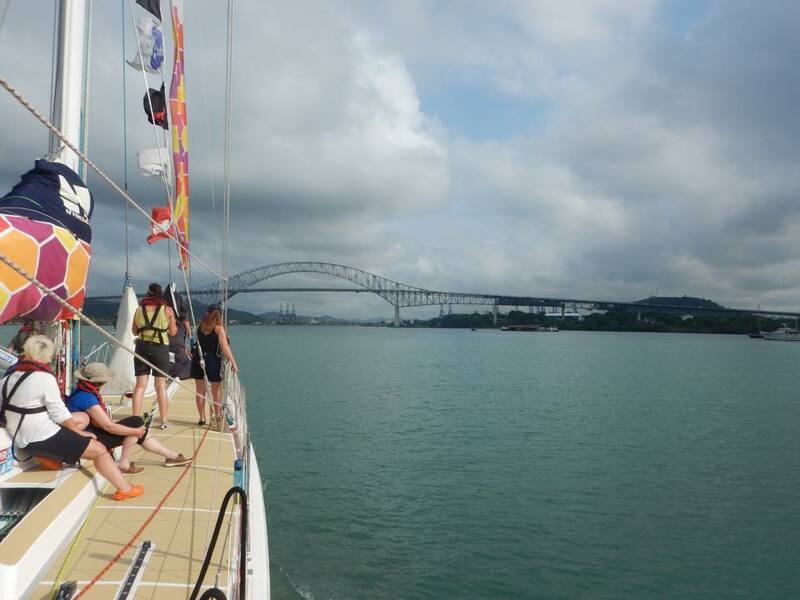 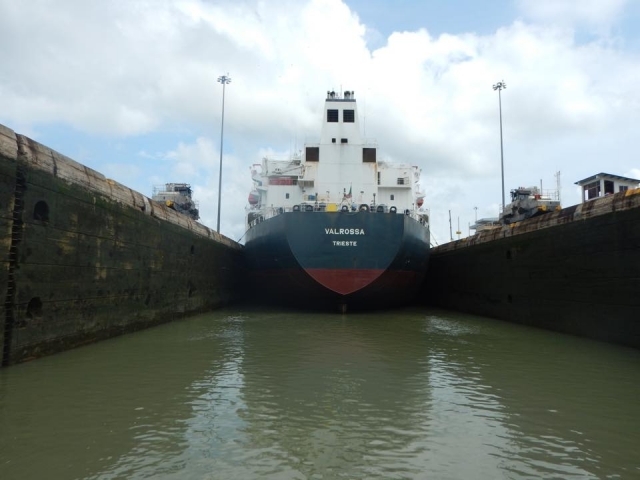 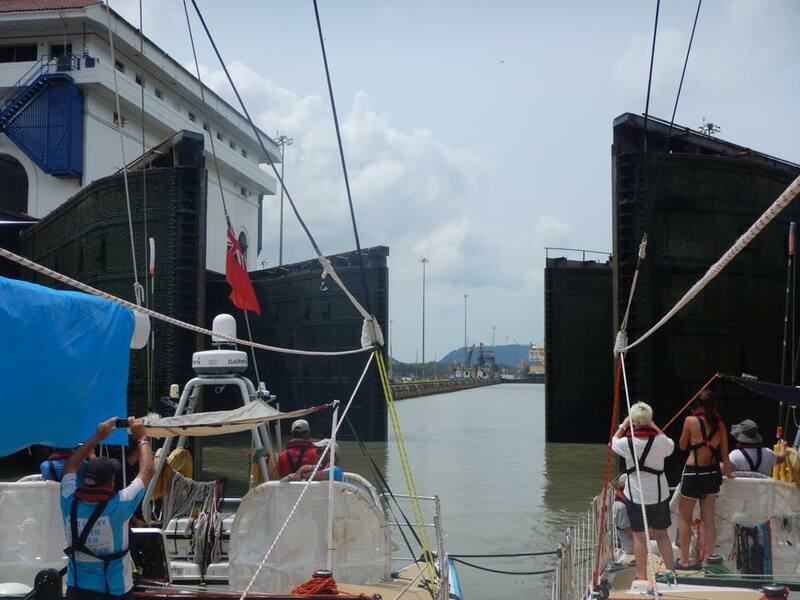 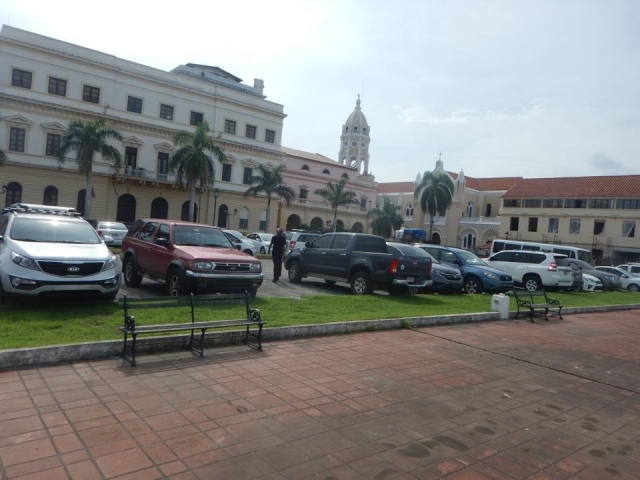 This race started with a number of possible finish points due to the timings for transiting the Panama Canal. 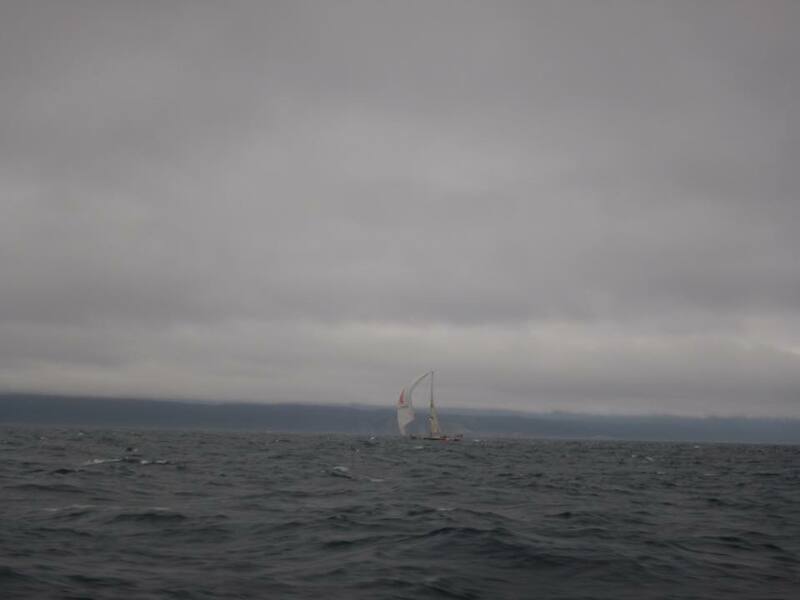 This meant that we weren’t sure where the end would be as it all depended on the progress of those at the back of the fleet. 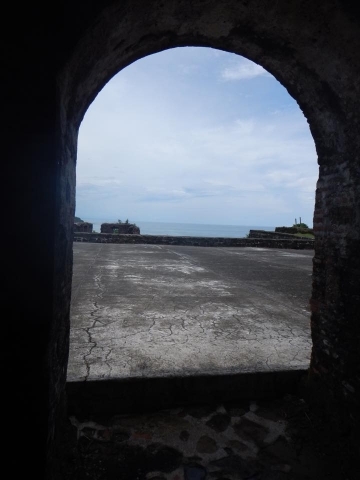 It also meant that we could have crossed a line before knowing it was to be the end, which is what happened. This meant that when the message came that the race was over it was a little deflating as we were racing hard to catch those in front of us still, we had just run out of water! 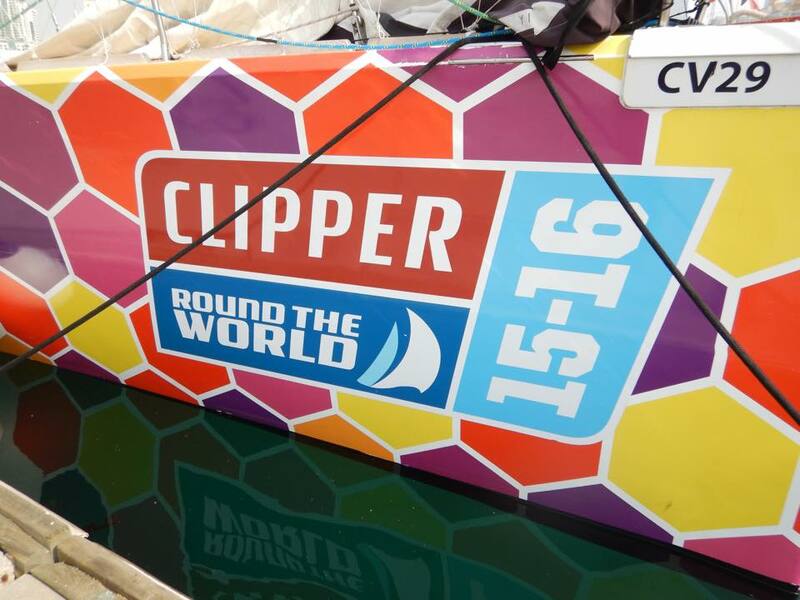 I know we can’t win them all, and I’m glad that ClipperTelemed+ have got their first podium, however this hasn’t helped me being a bad loser! 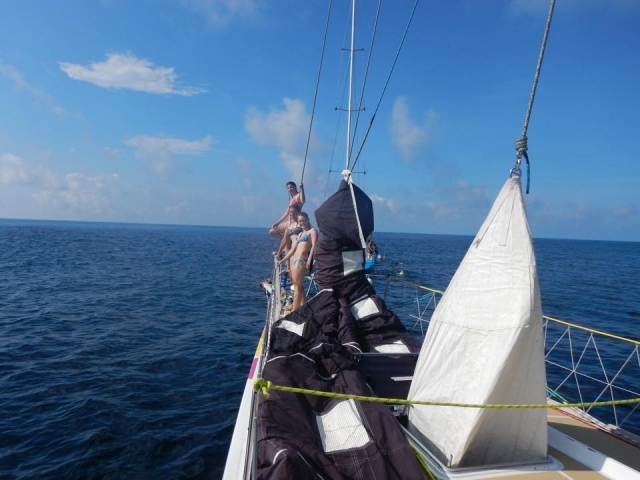 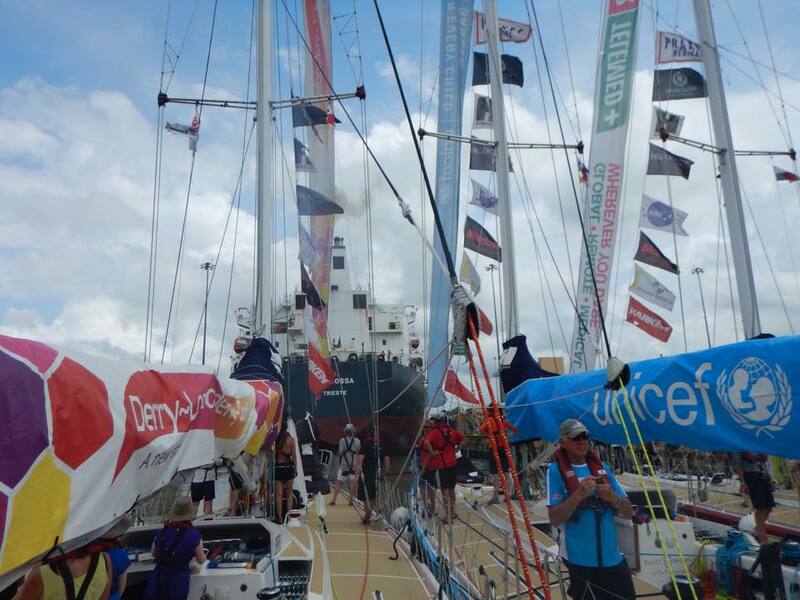 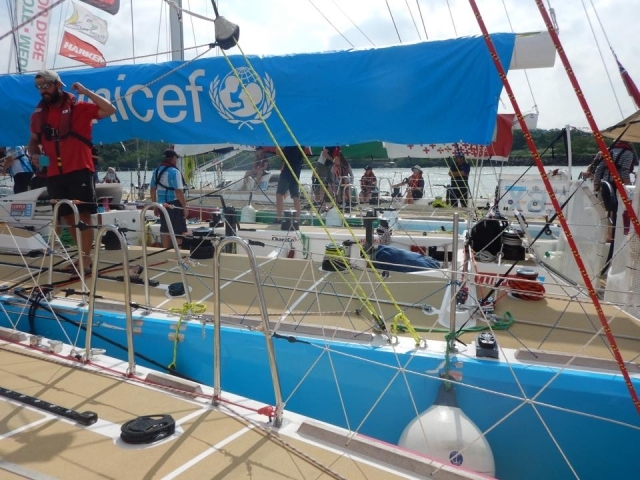 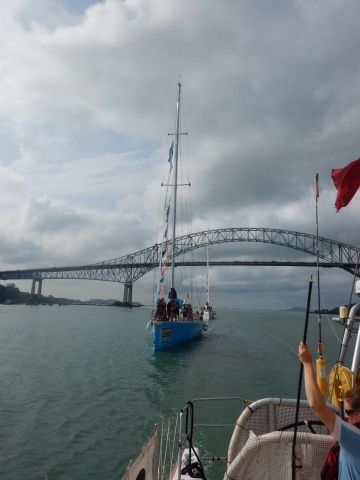 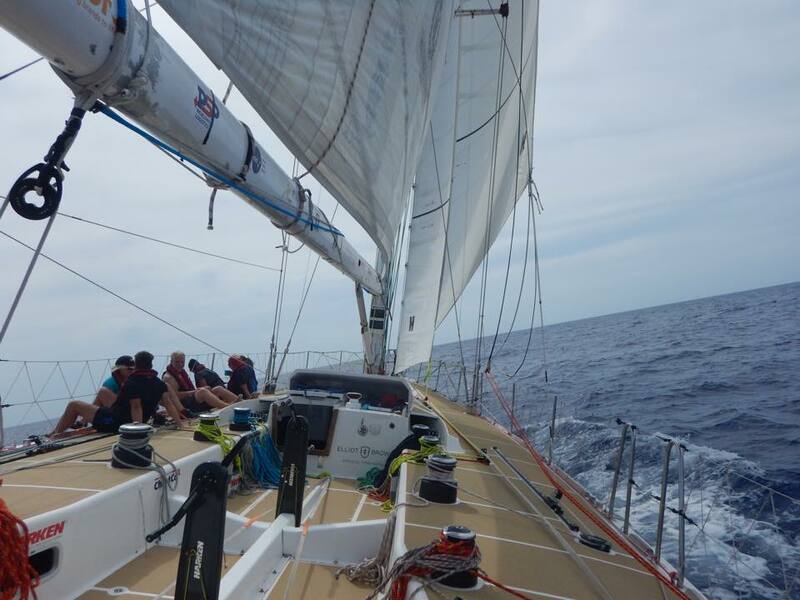 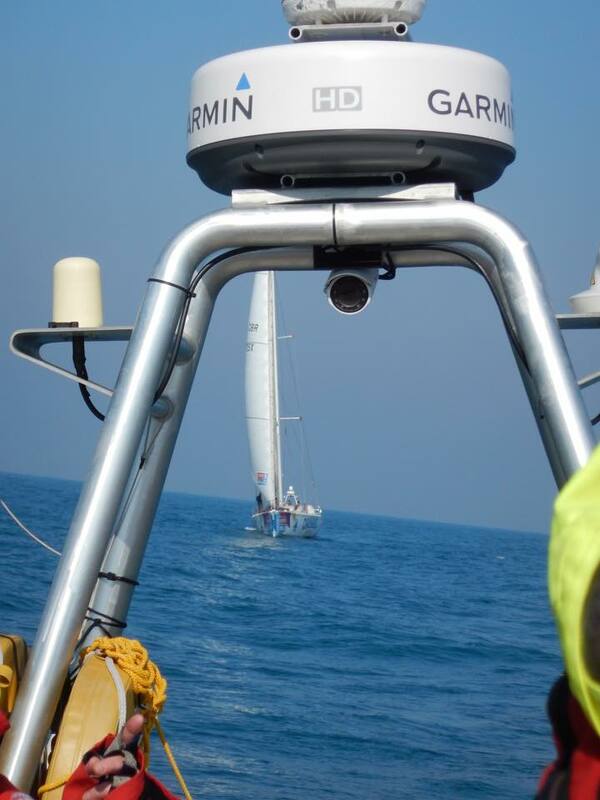 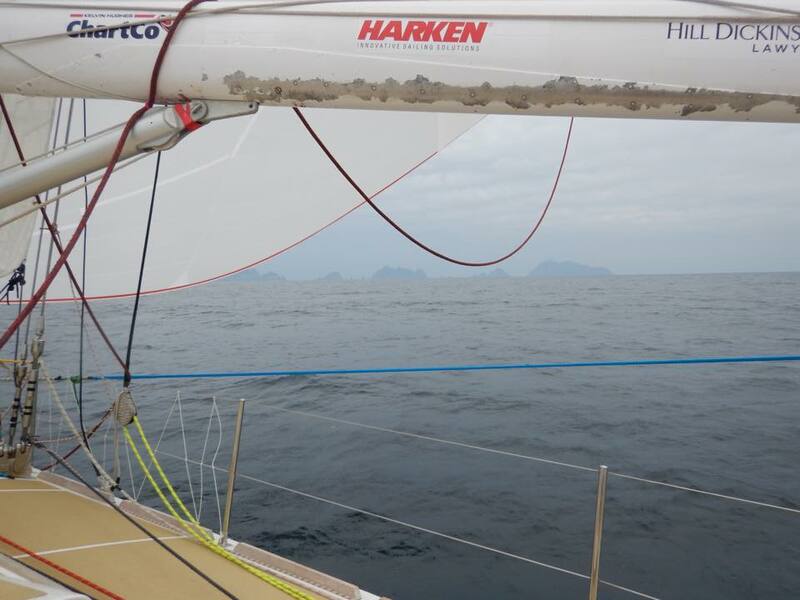 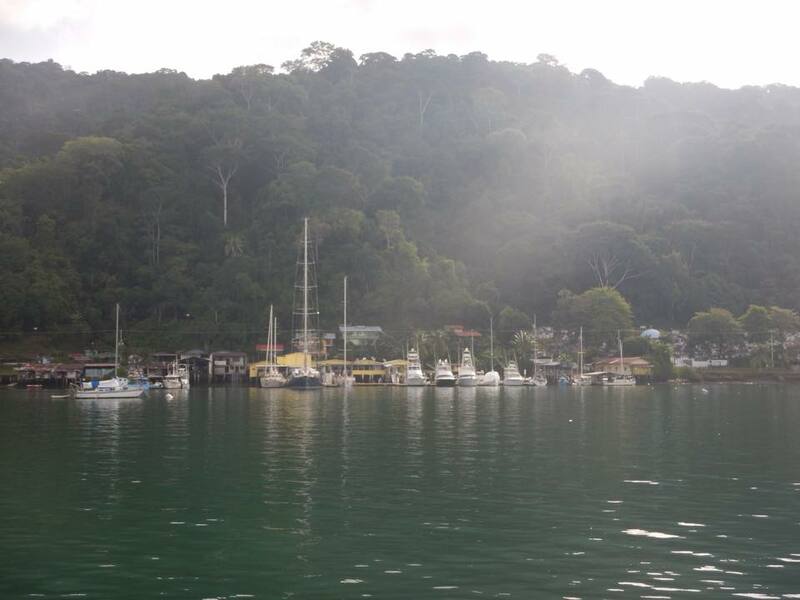 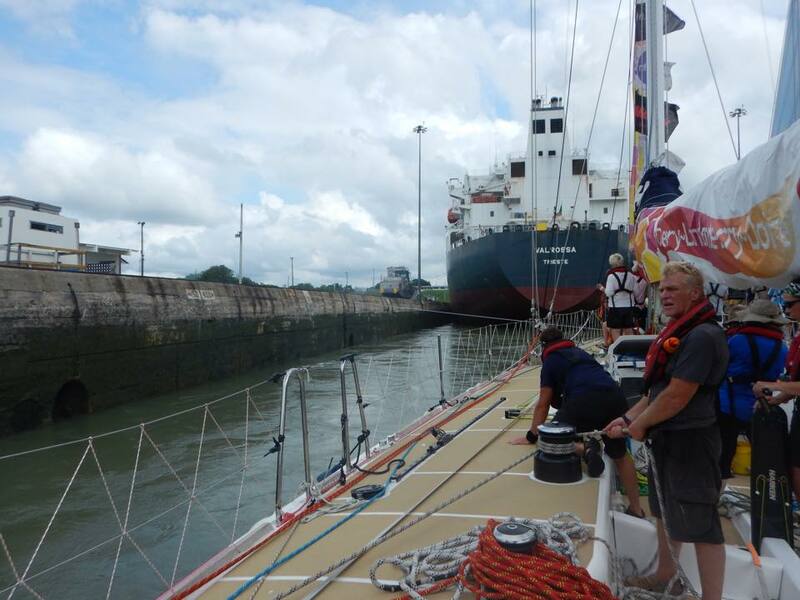 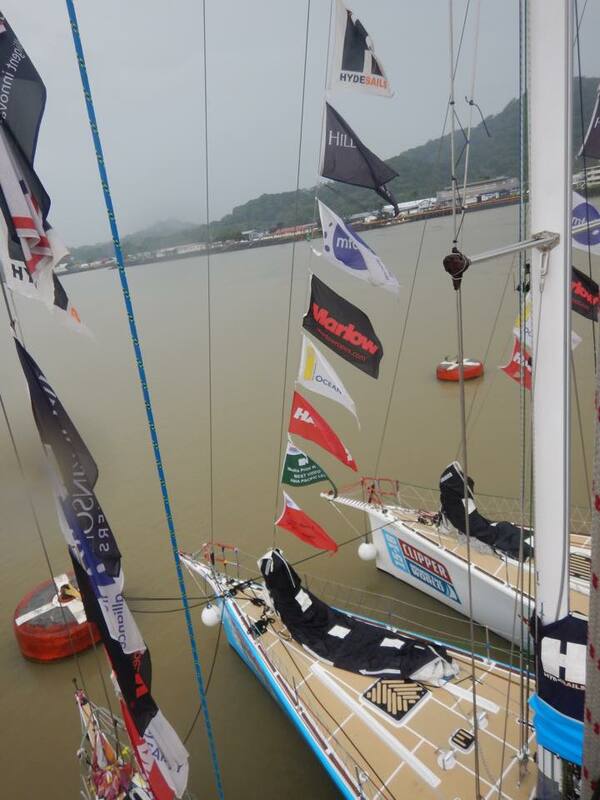 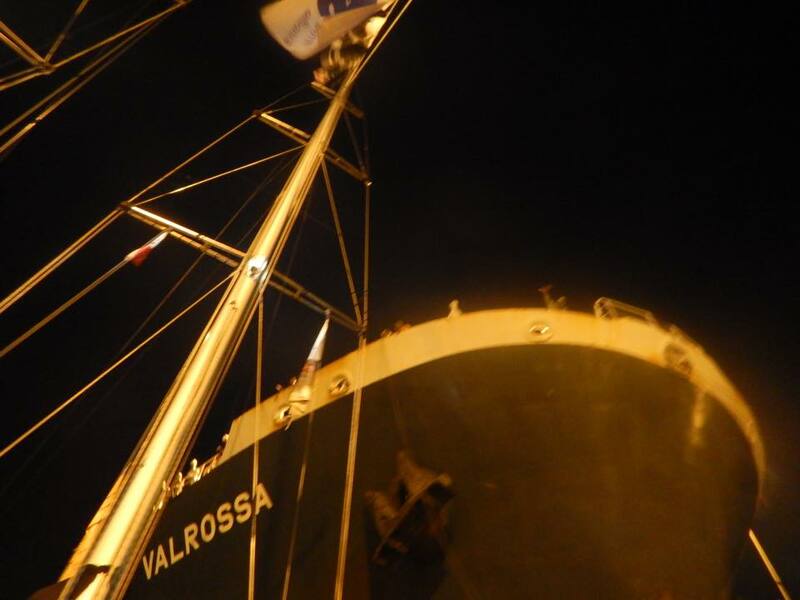 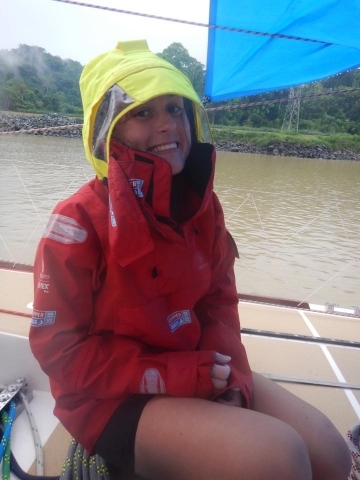 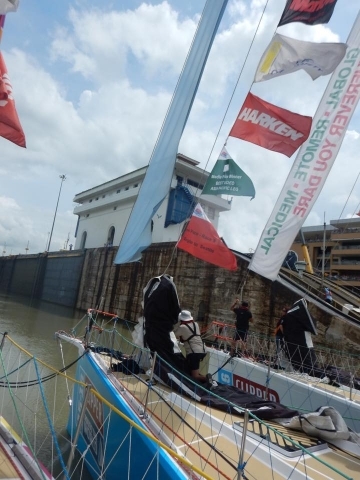 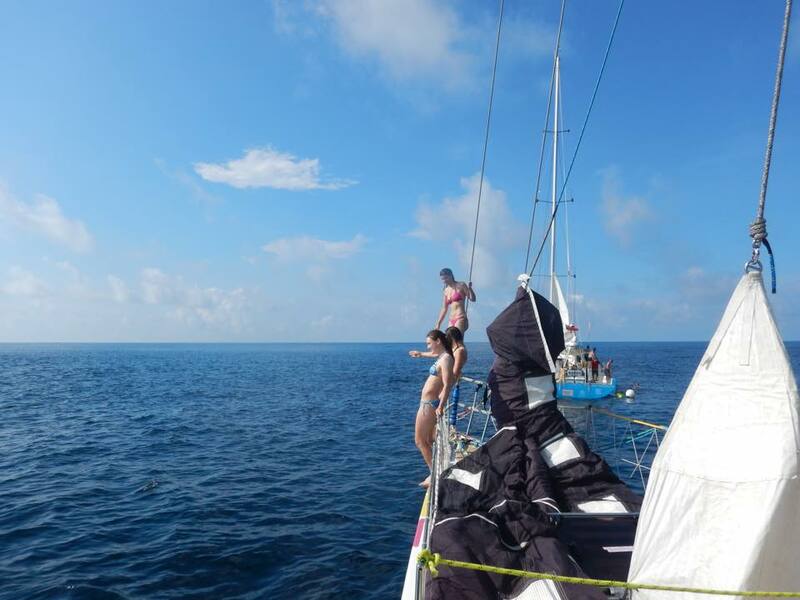 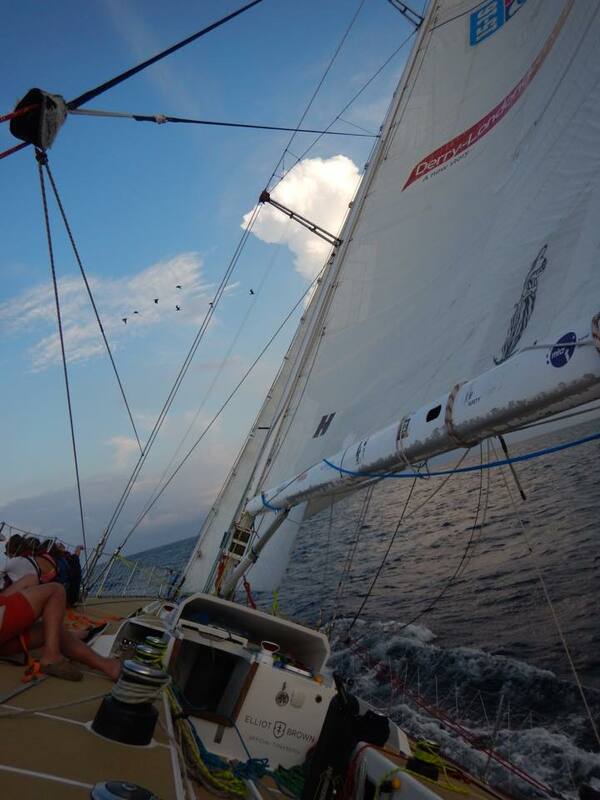 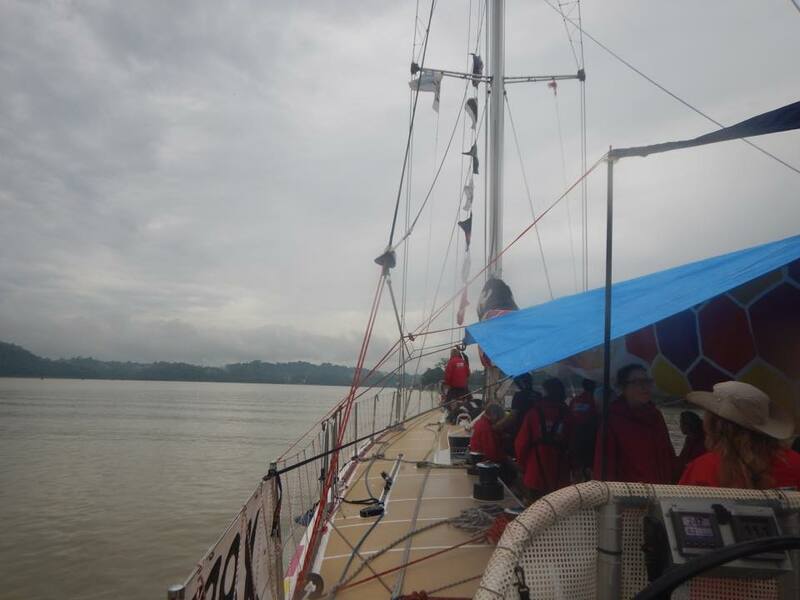 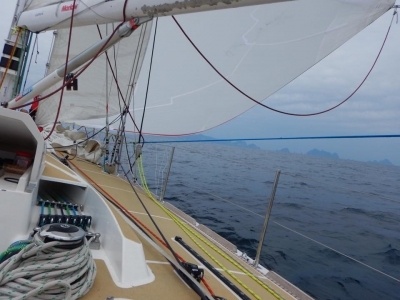 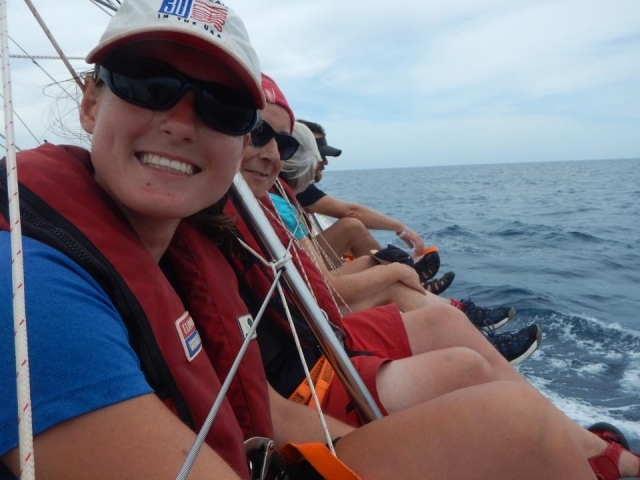 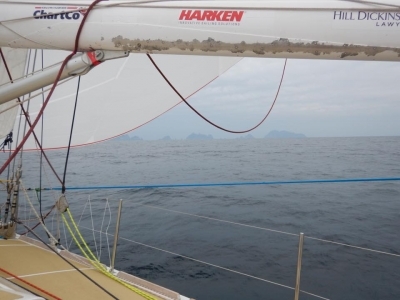 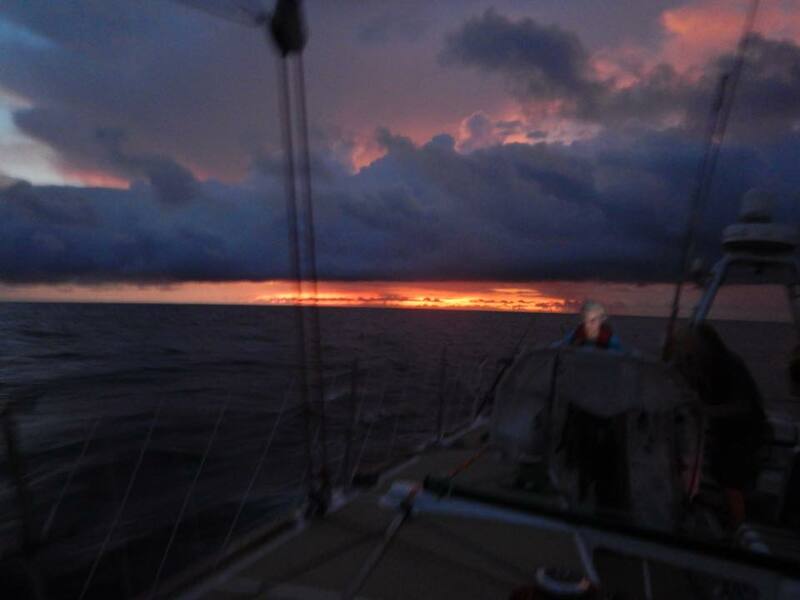 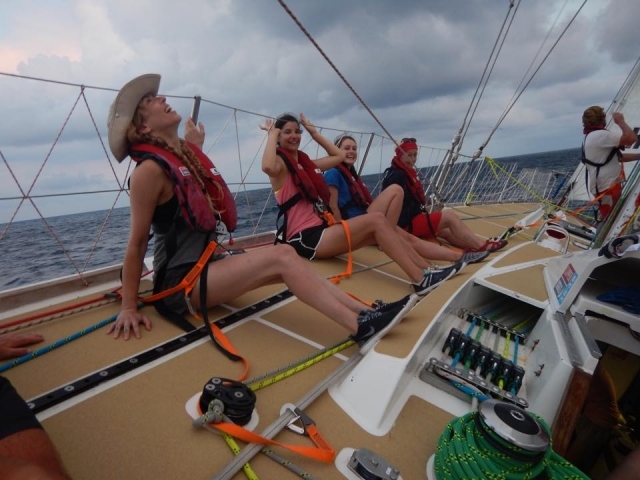 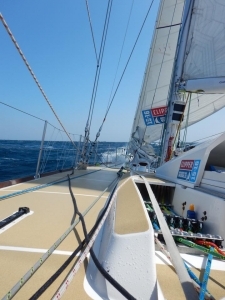 As the race ended so far from Panama we had a long motor sail to get us there. 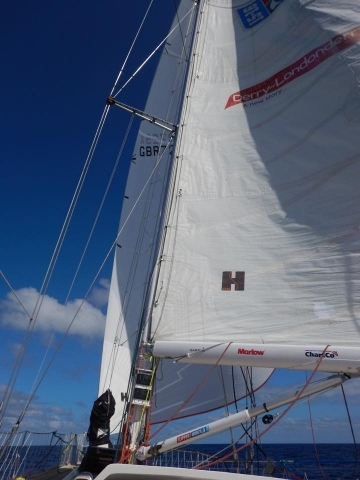 This did allow for more of a cruising existence rather then our full on racing mode. 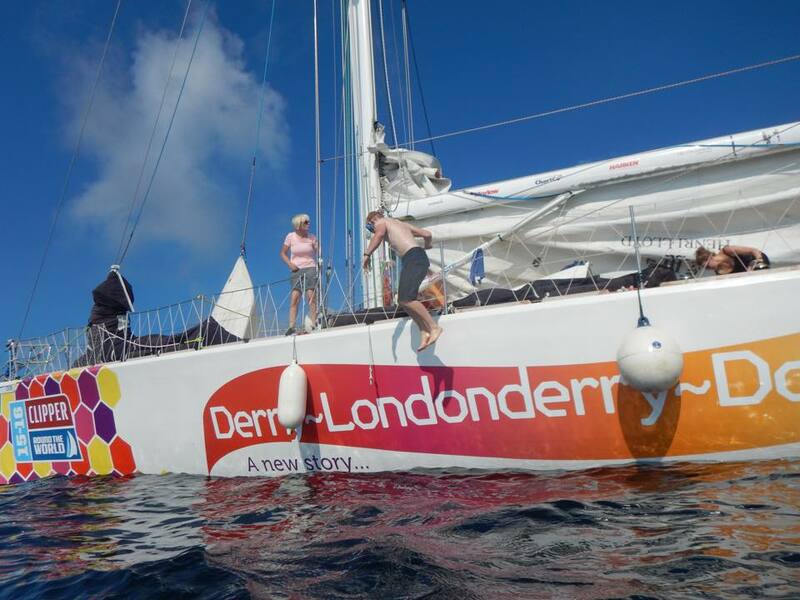 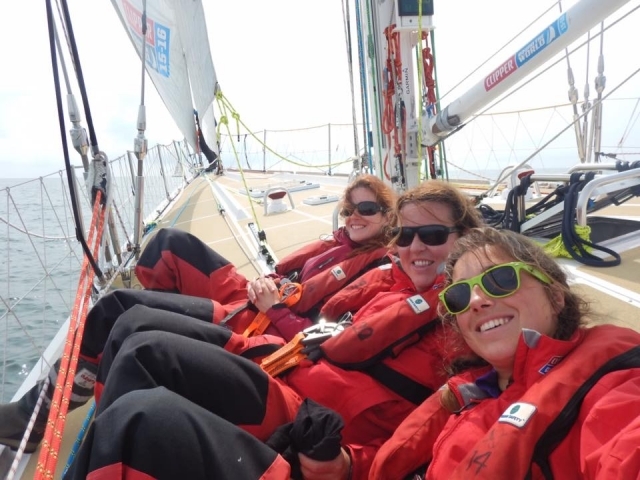 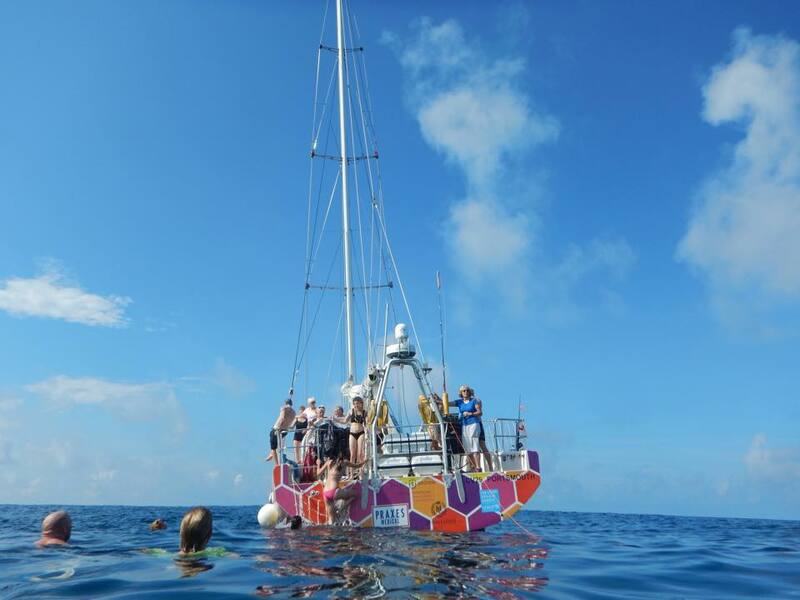 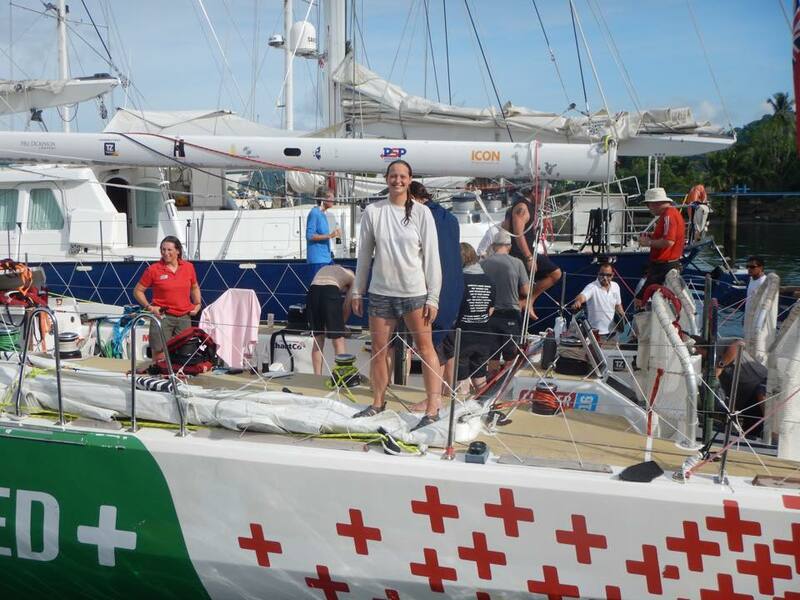 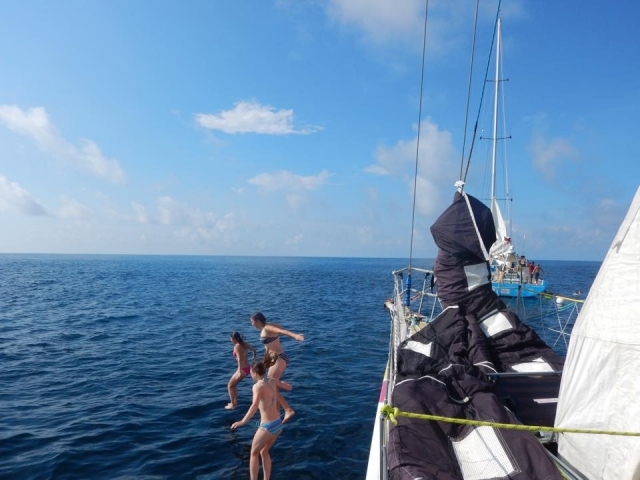 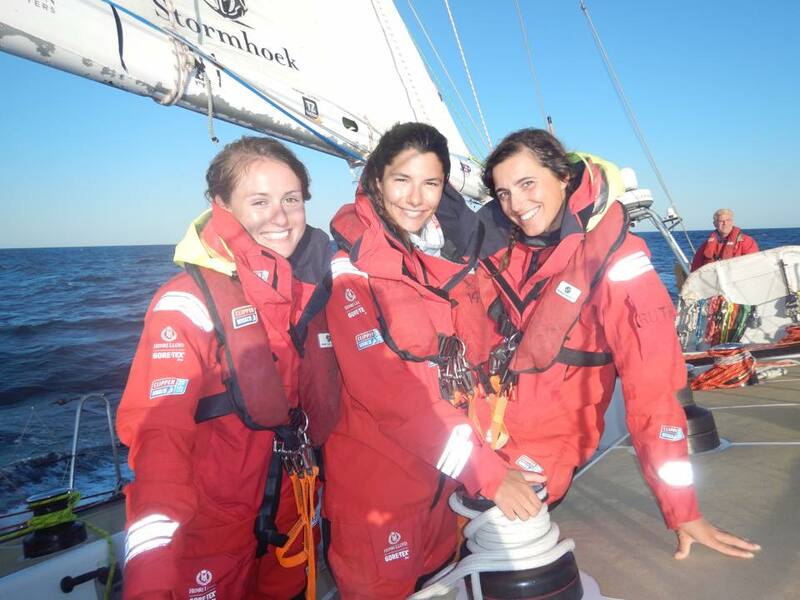 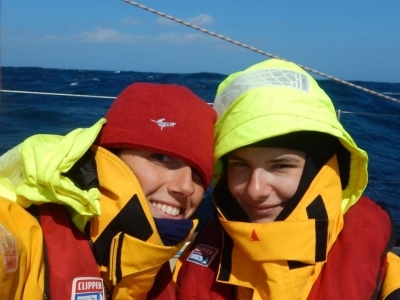 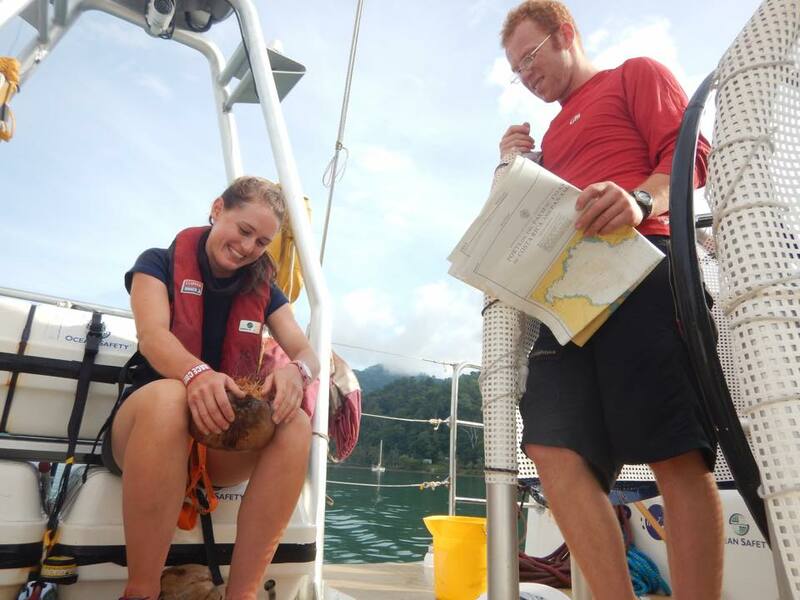 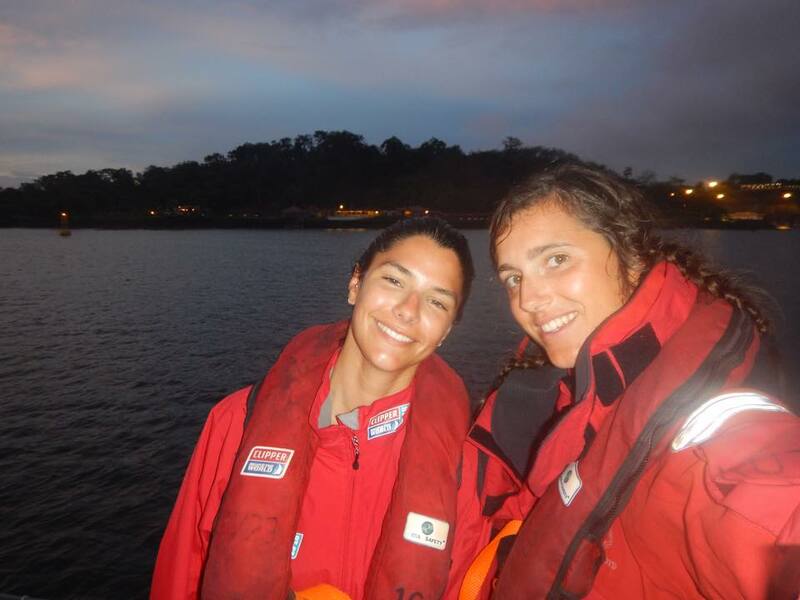 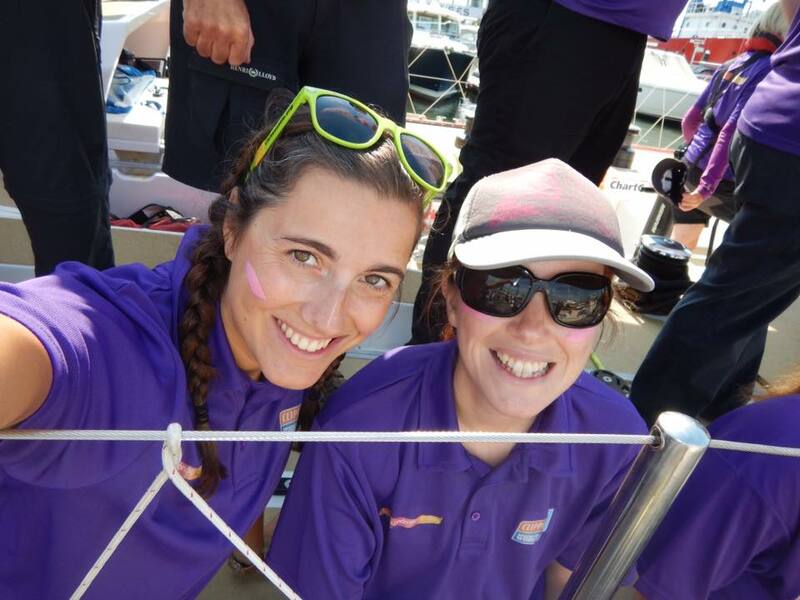 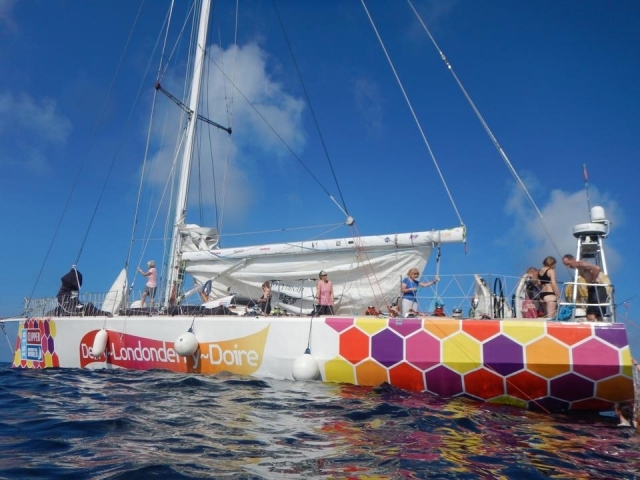 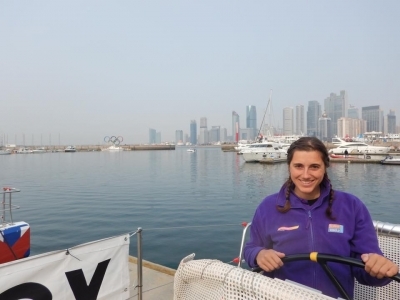 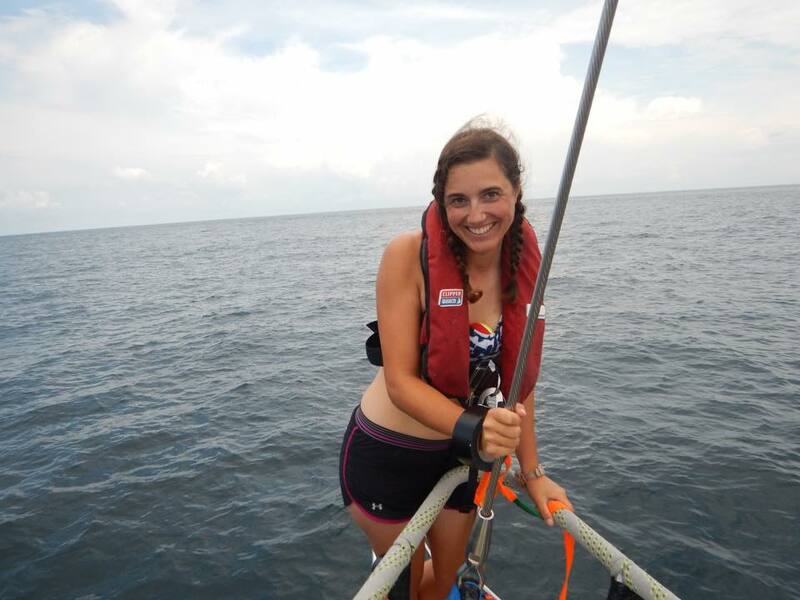 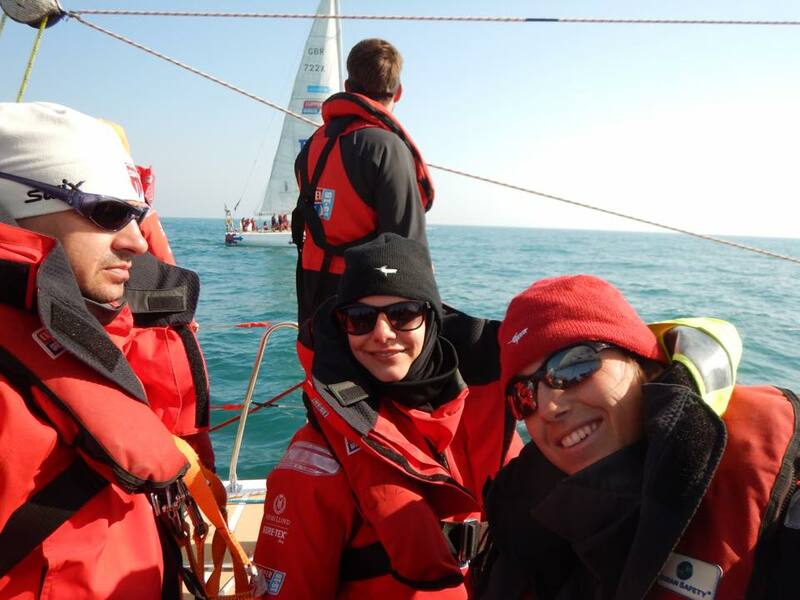 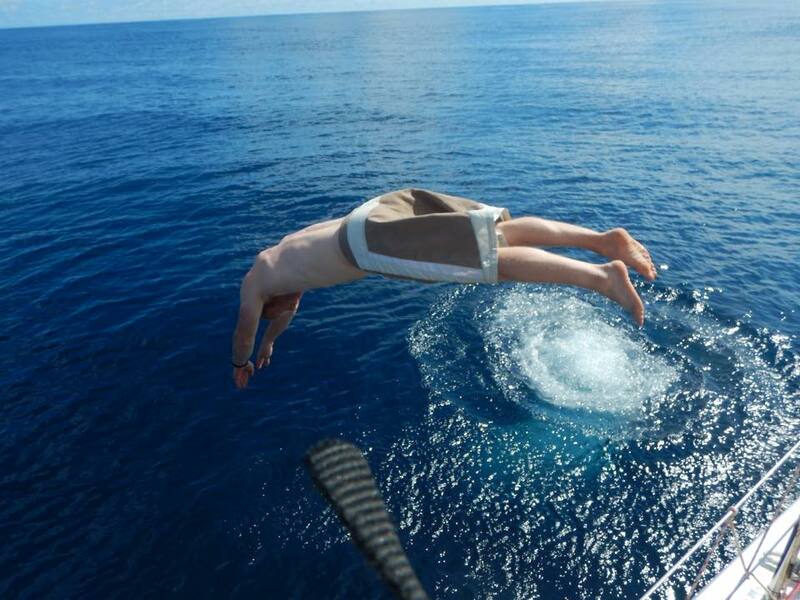 We carried out jobs on the boat to make sure we were ready for the next race and also had daily swims in the sea. 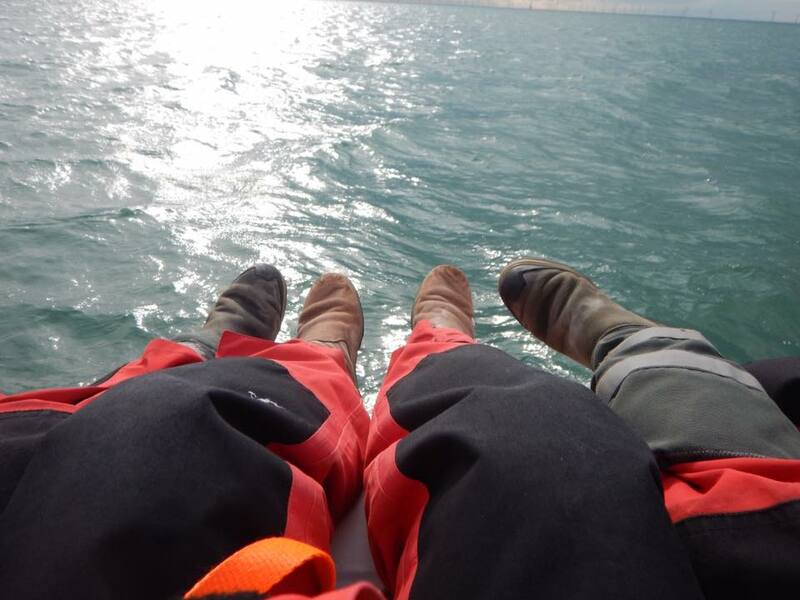 These were magical for not only cooling us down but also how often do you get to swim in 3000m deep seas? 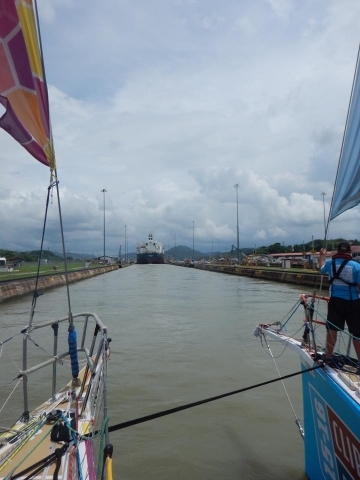 Because of the long motor we had to refuel which meant we have added a Costa Rica stamp to the passport (even though we were only there for about 3 hours!). 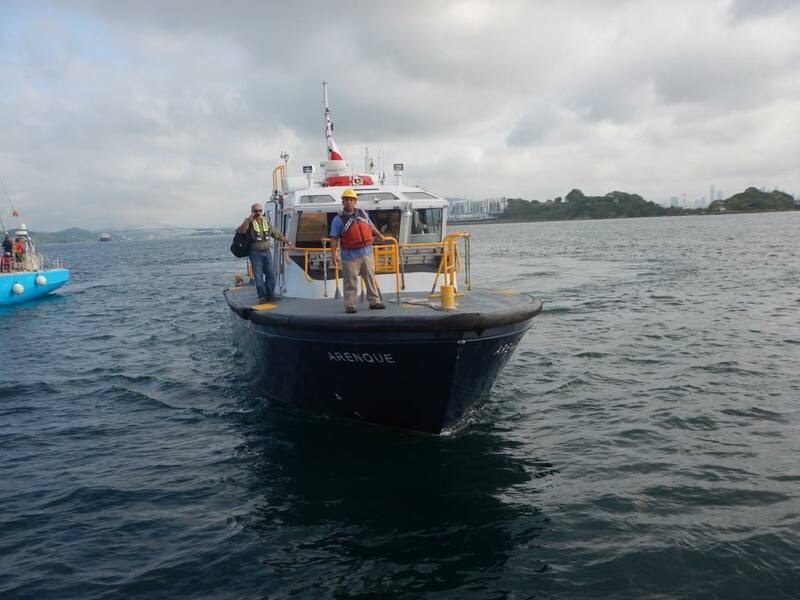 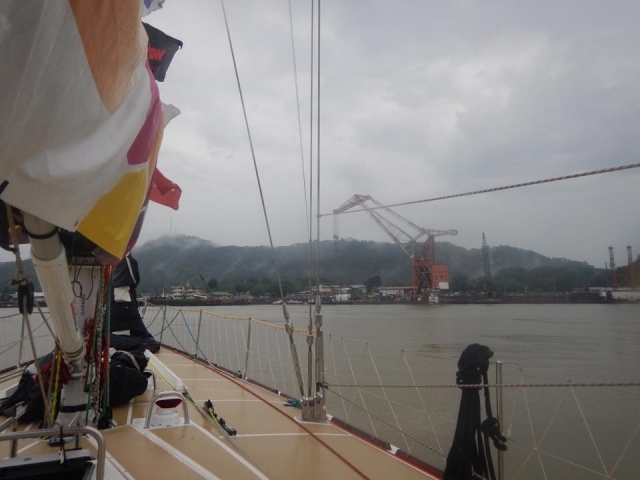 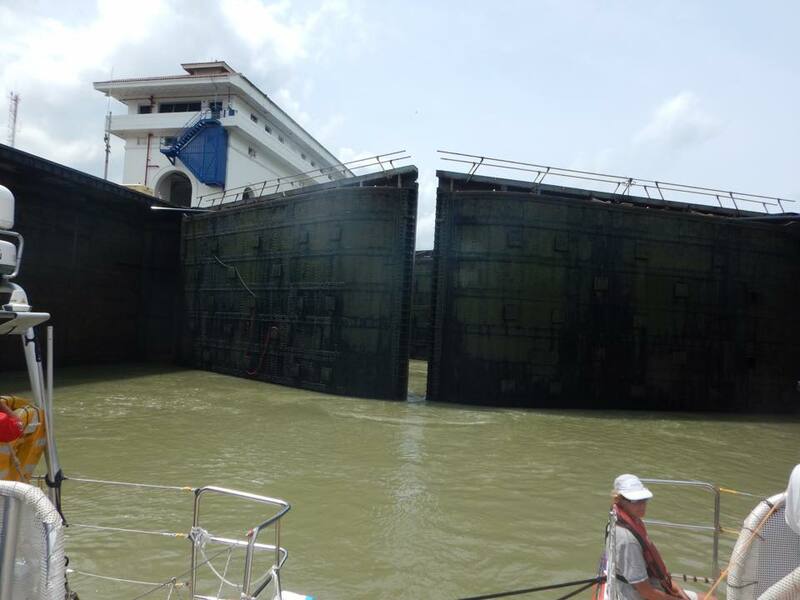 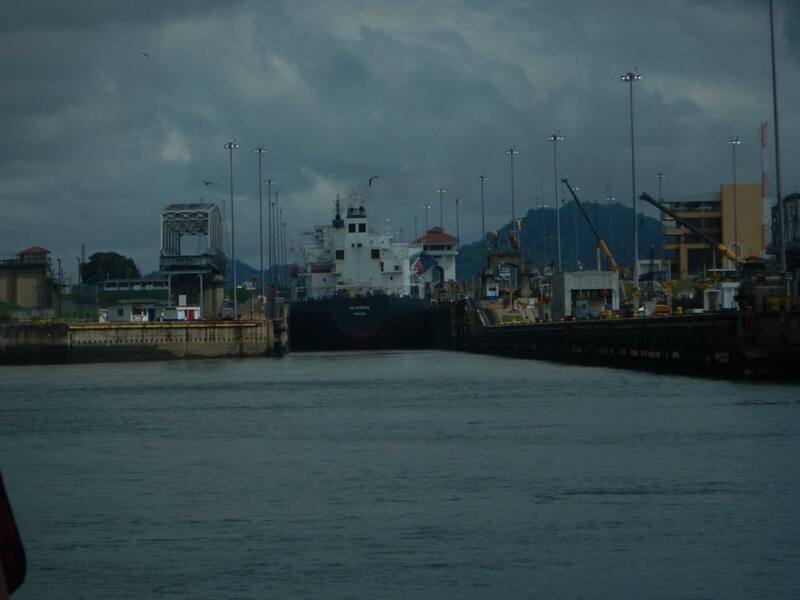 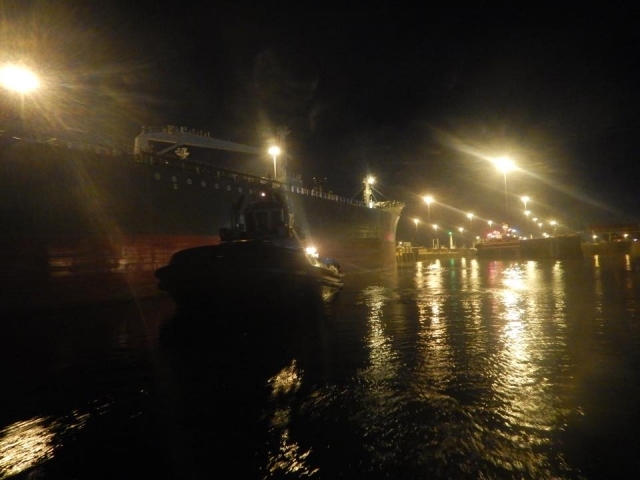 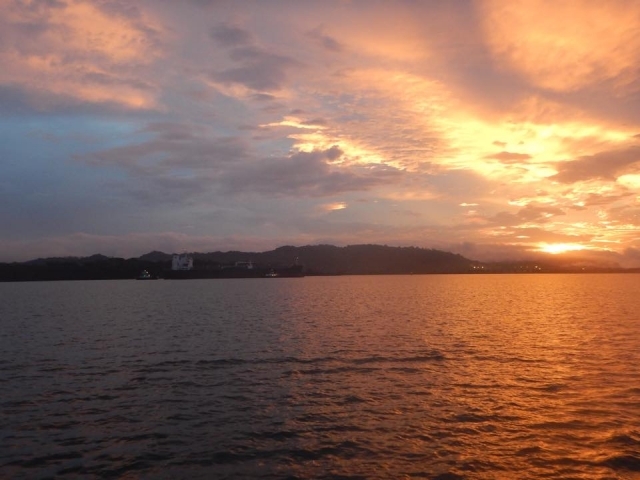 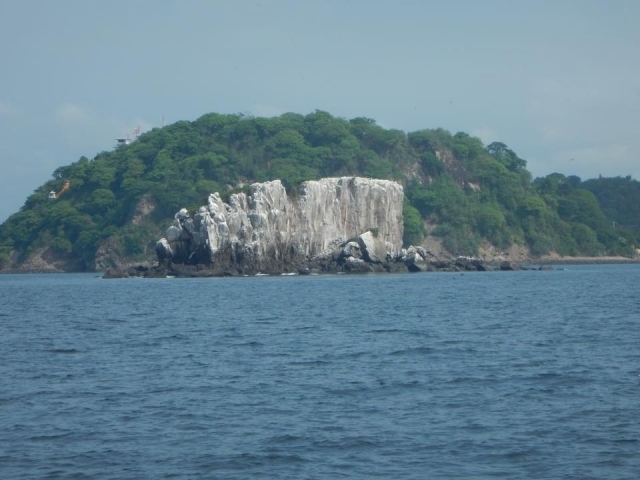 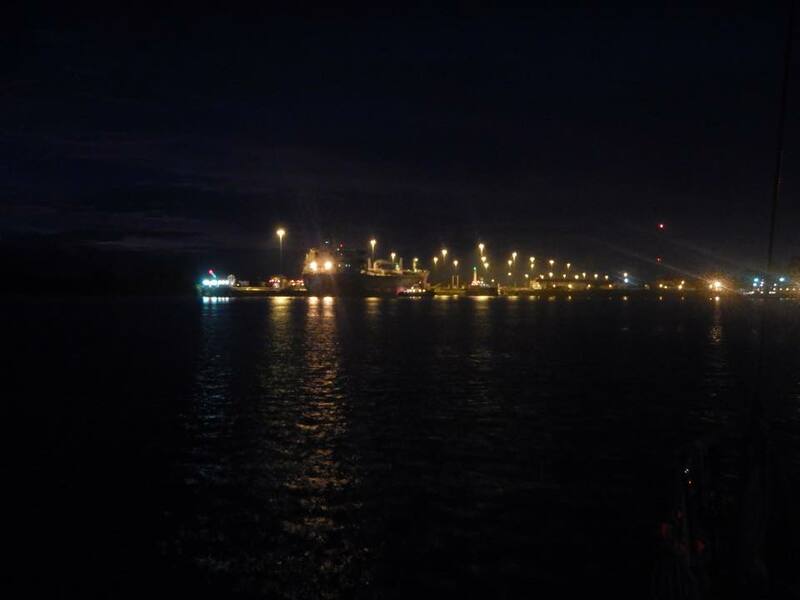 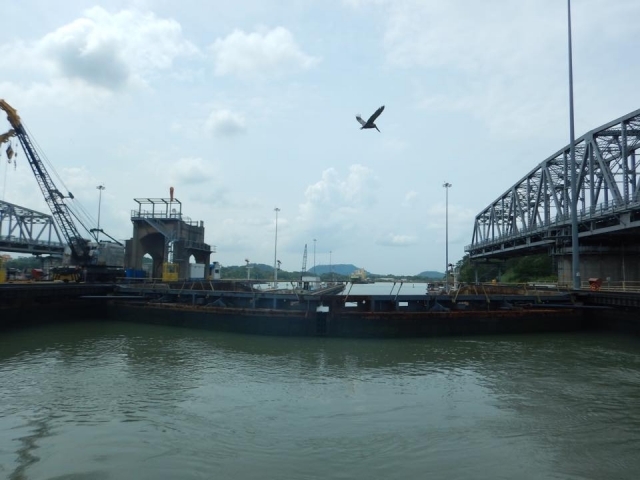 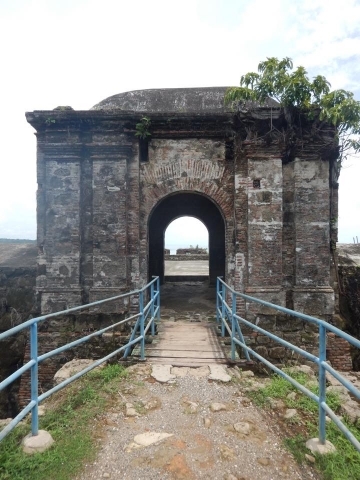 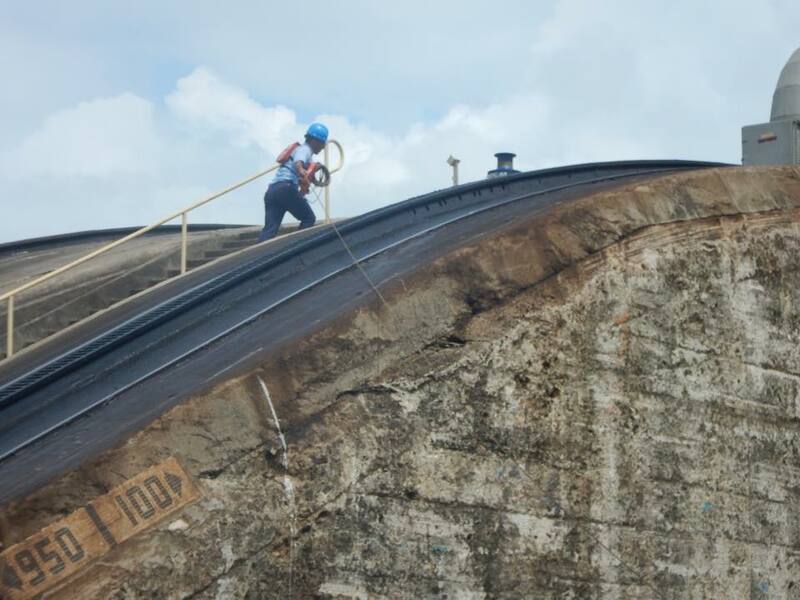 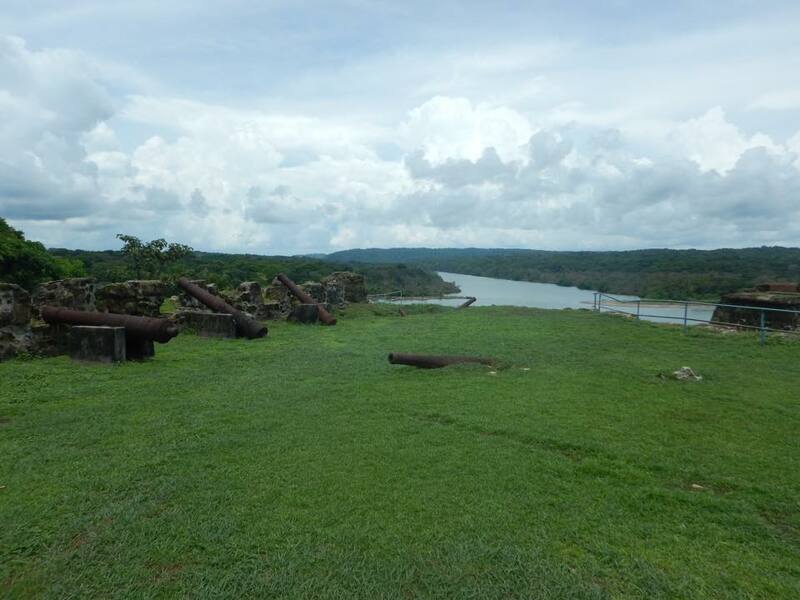 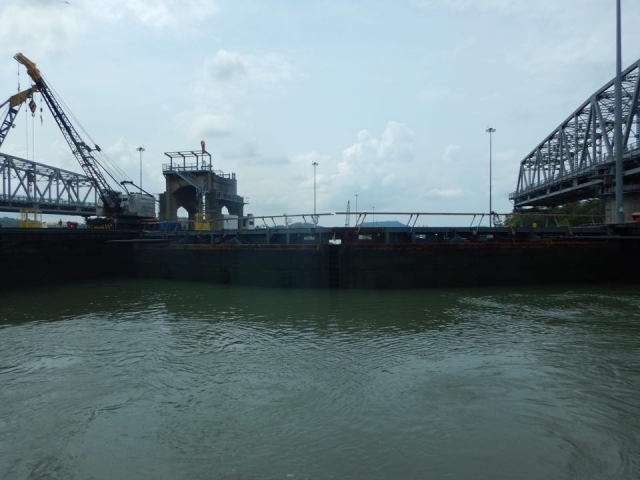 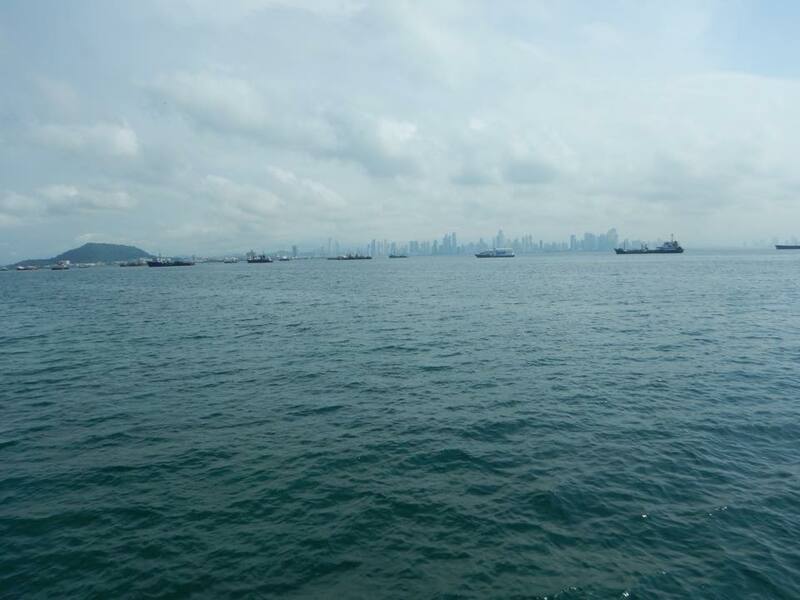 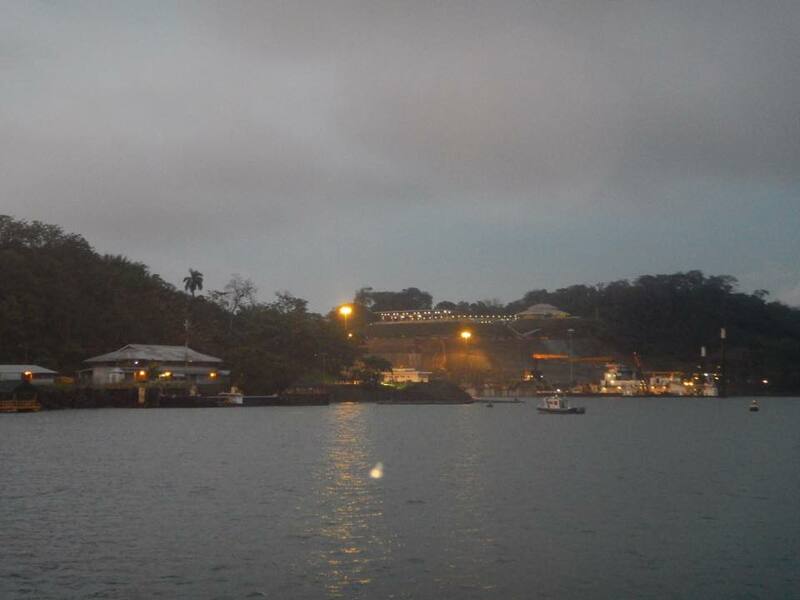 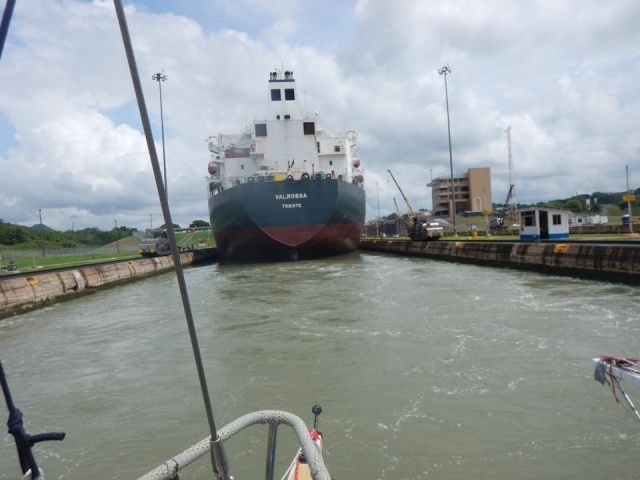 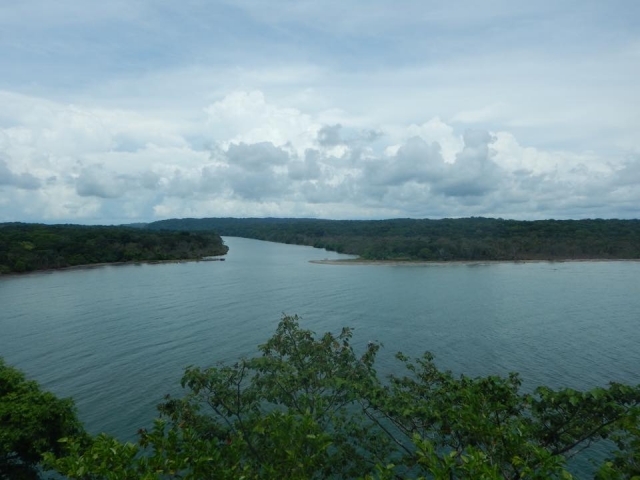 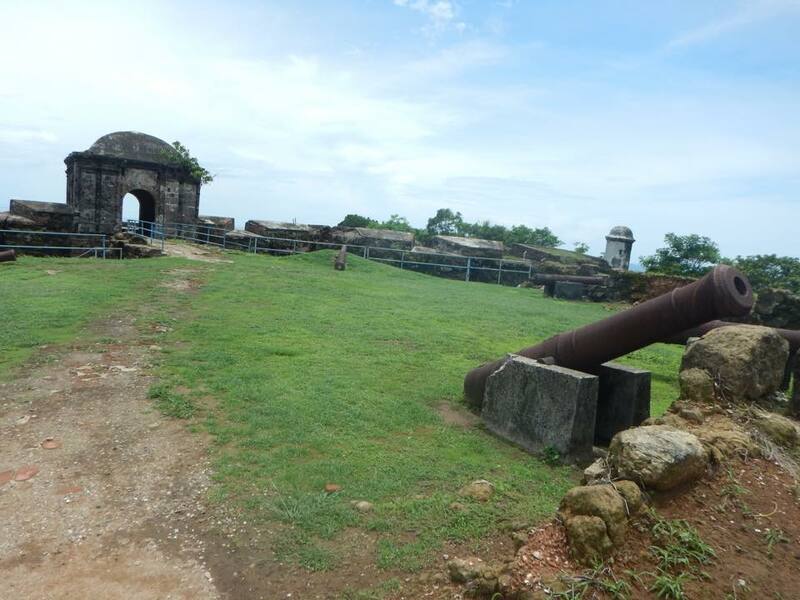 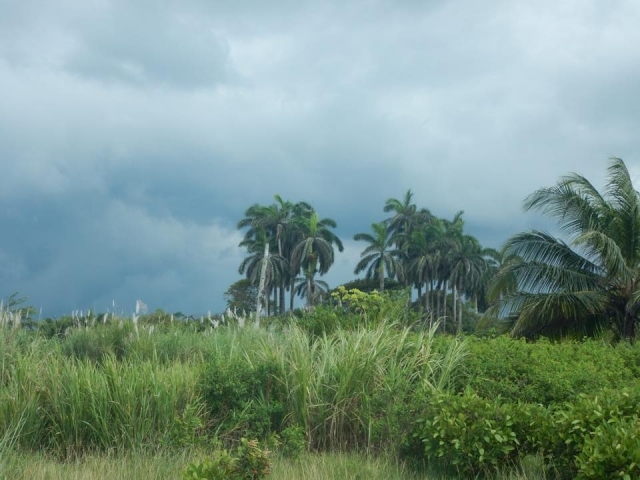 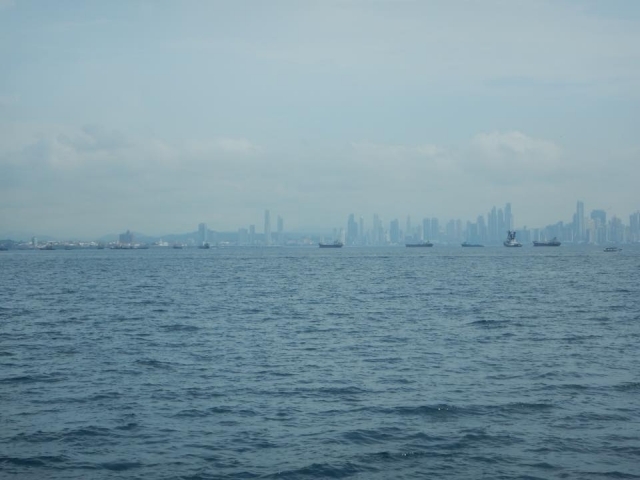 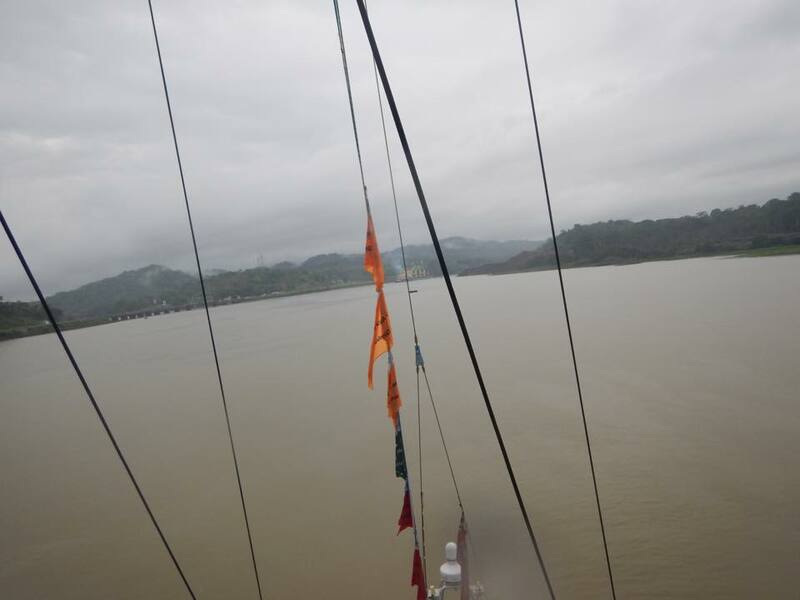 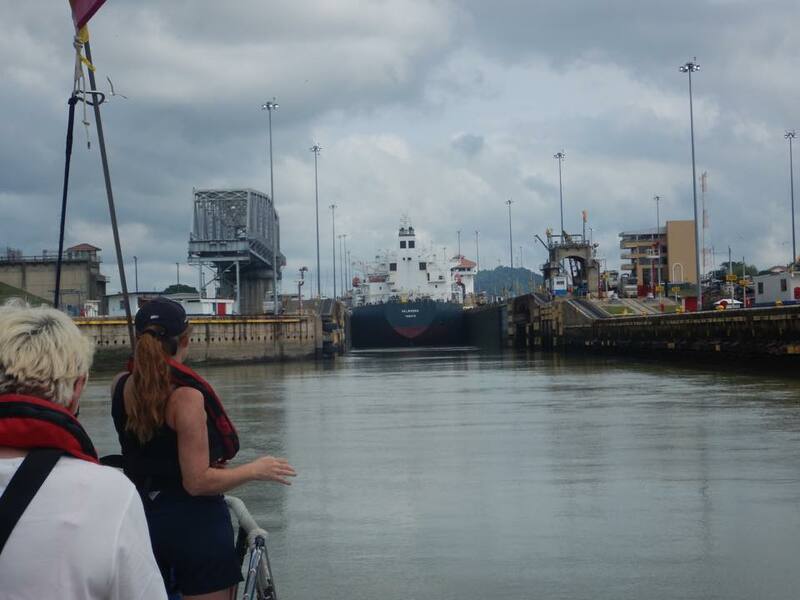 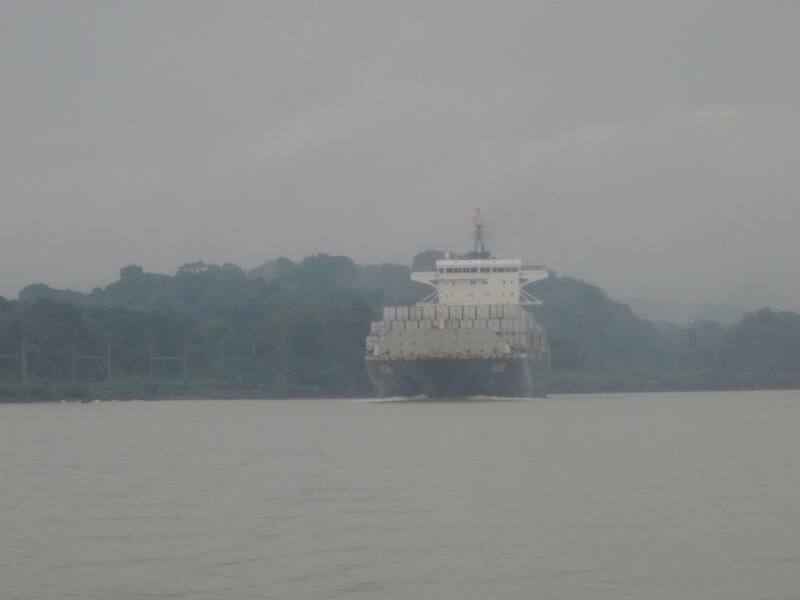 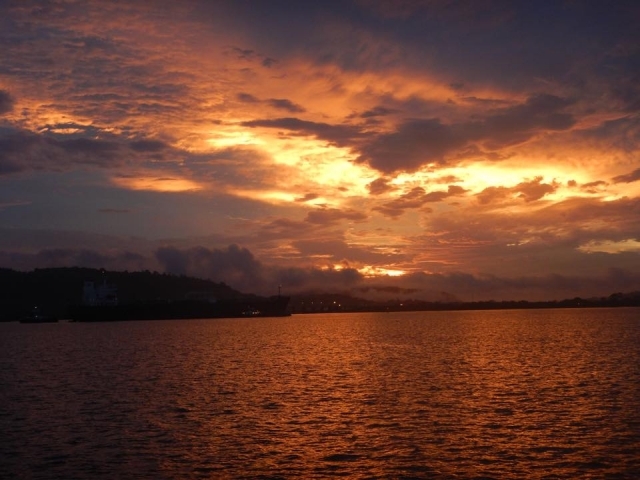 We arrived on the Pacific side of the Panama Canal and found out we would be transiting the next day. 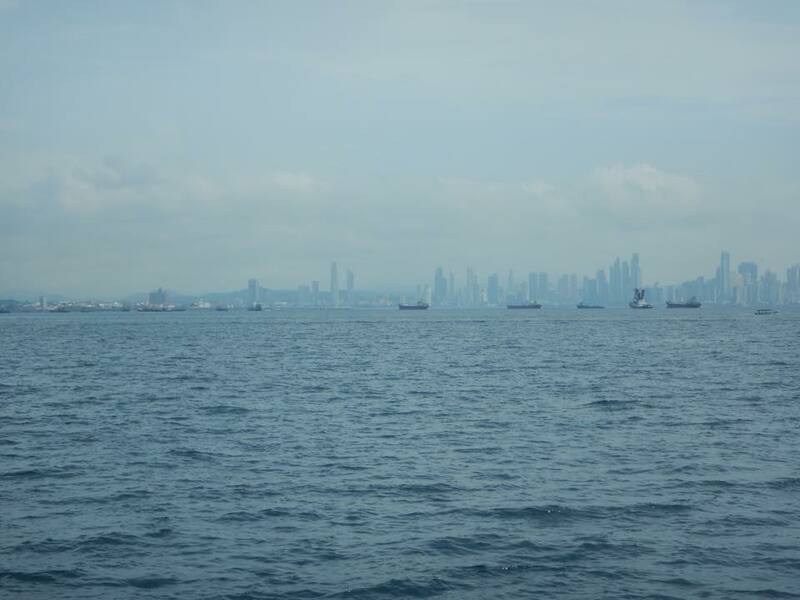 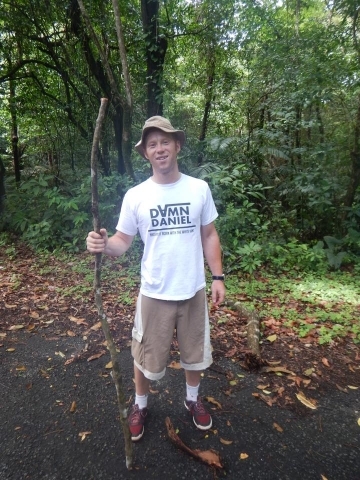 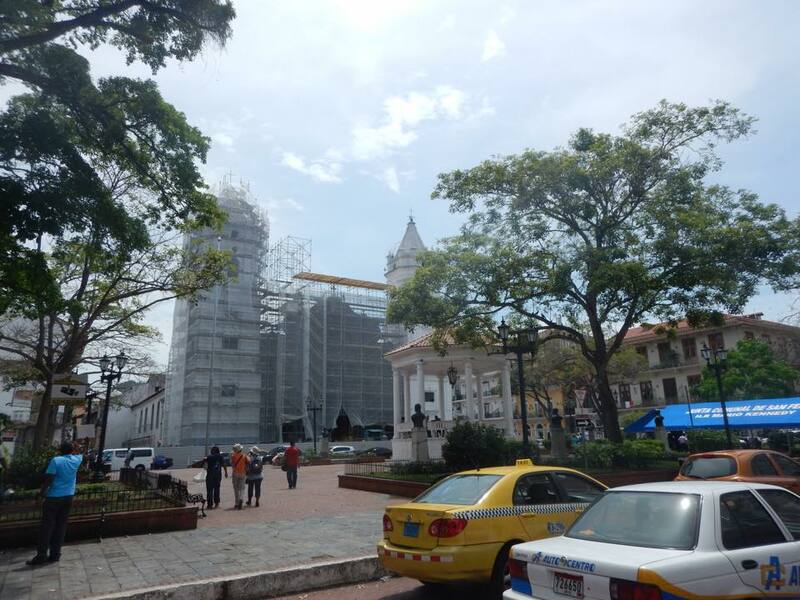 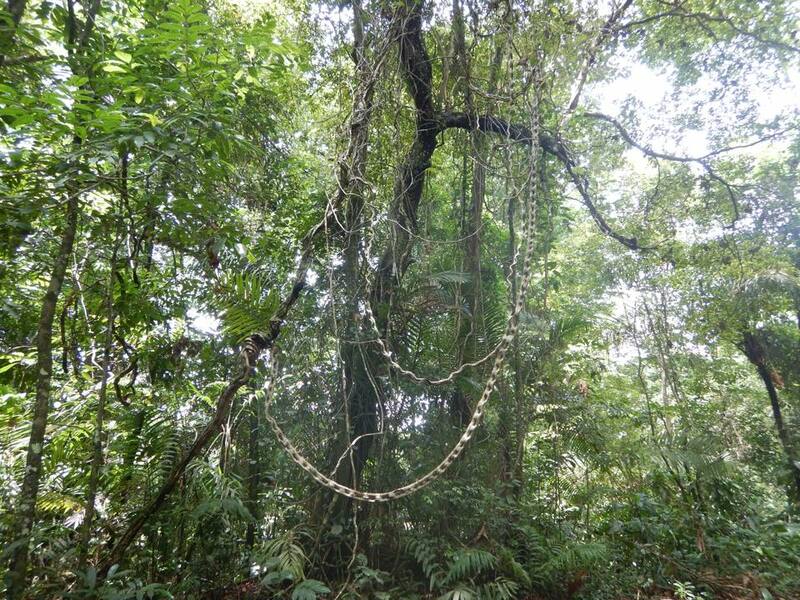 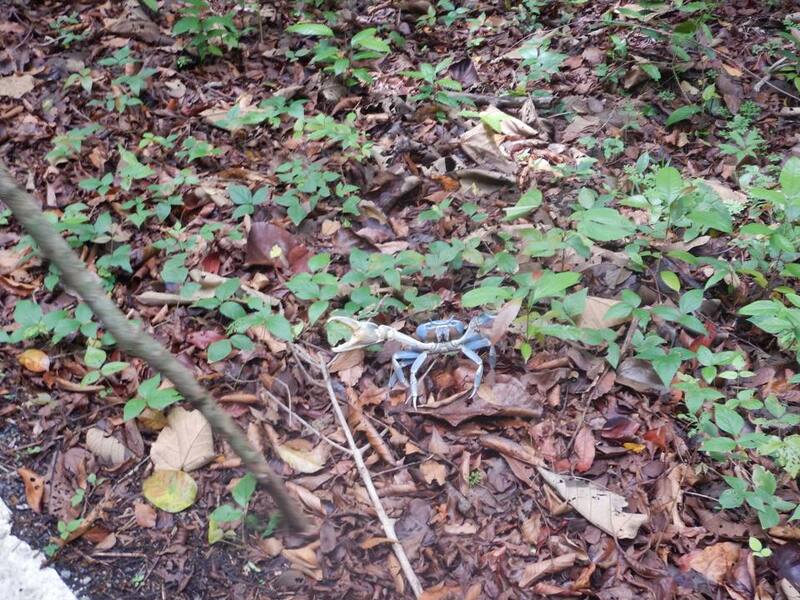 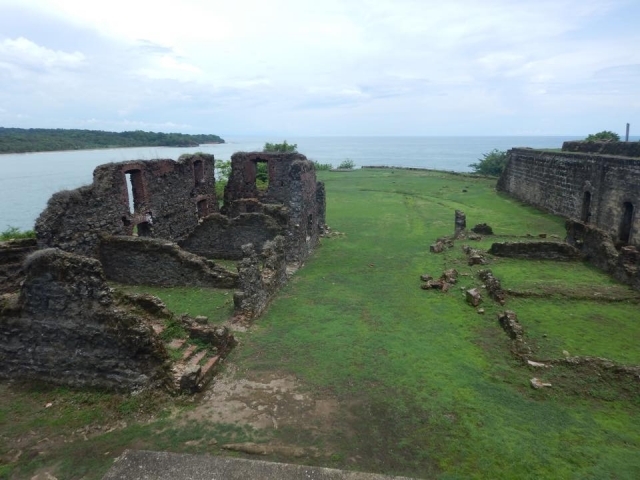 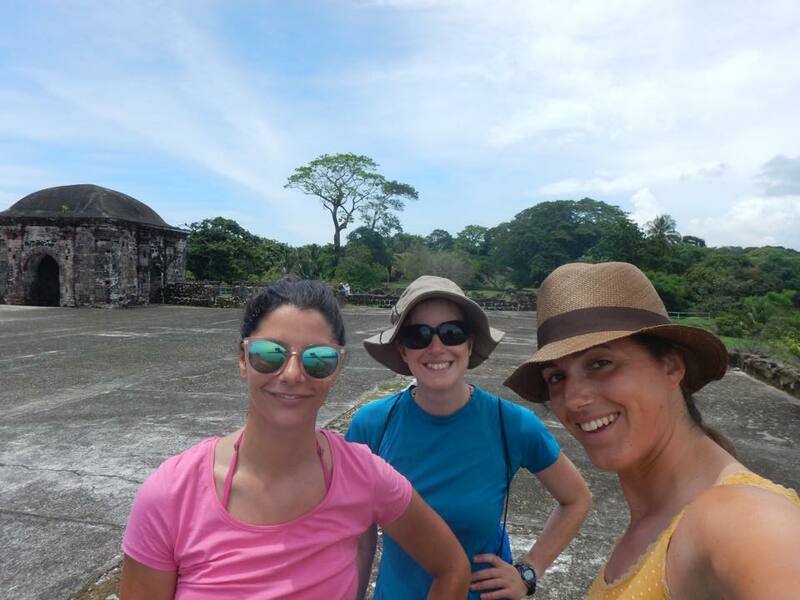 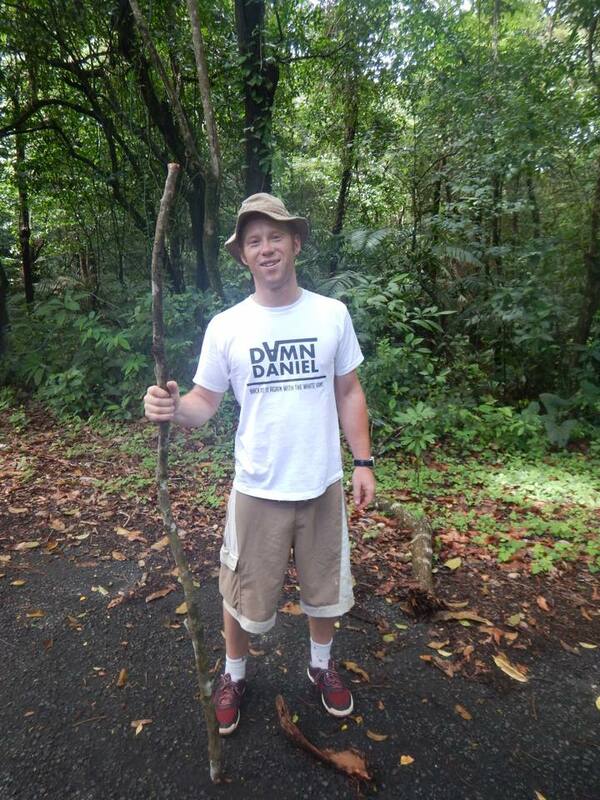 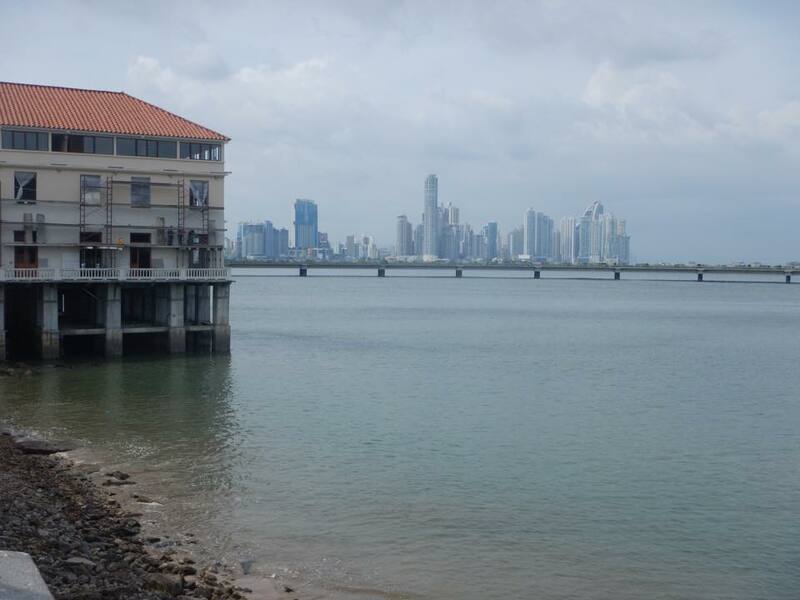 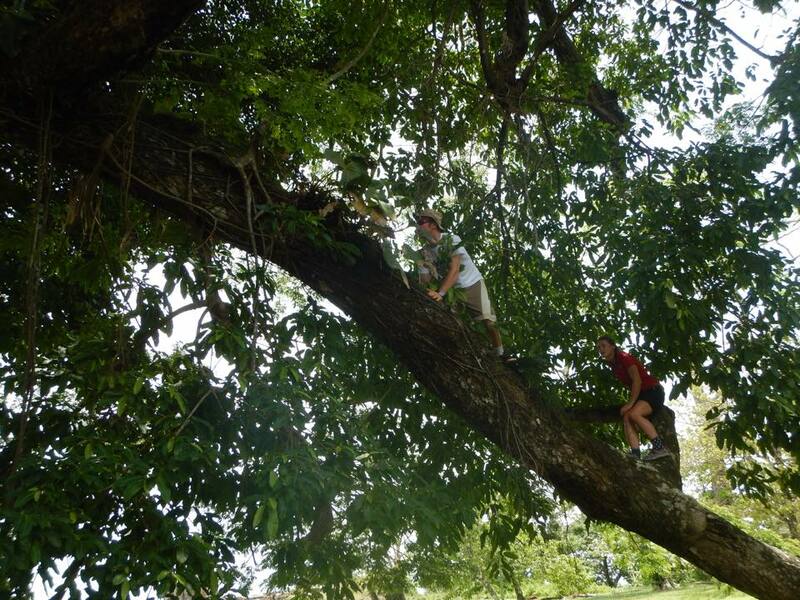 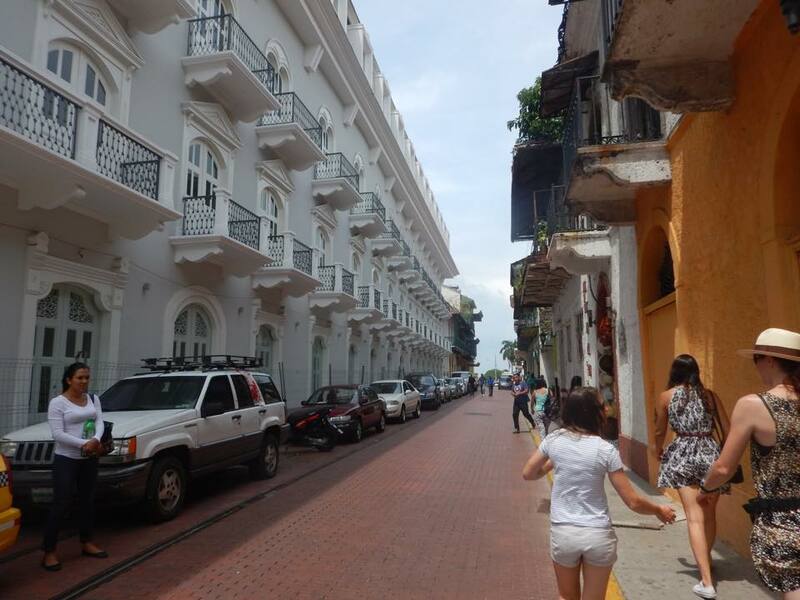 This left us with half a day to explore Panama City (thanks to Ruth H for the suggestions of where to go!) 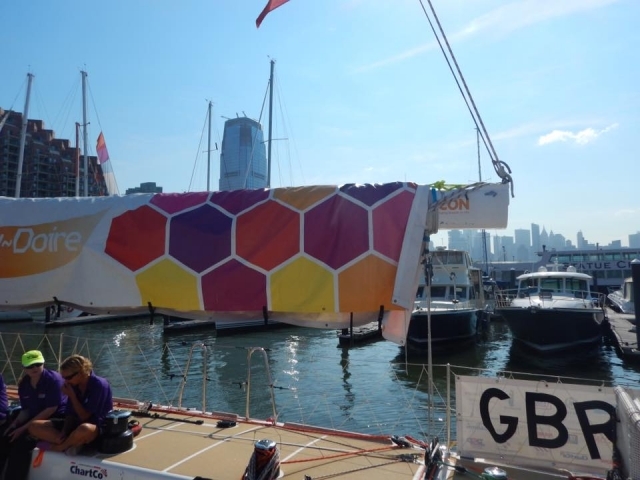 before being ready to transit. 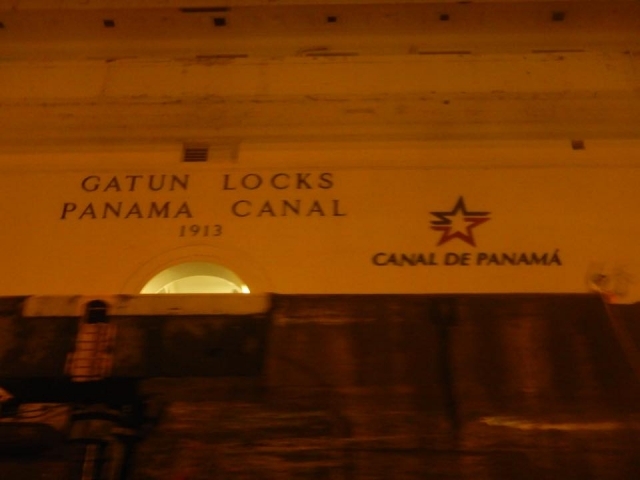 We also visited the canal museum to get some of the history under our belt. 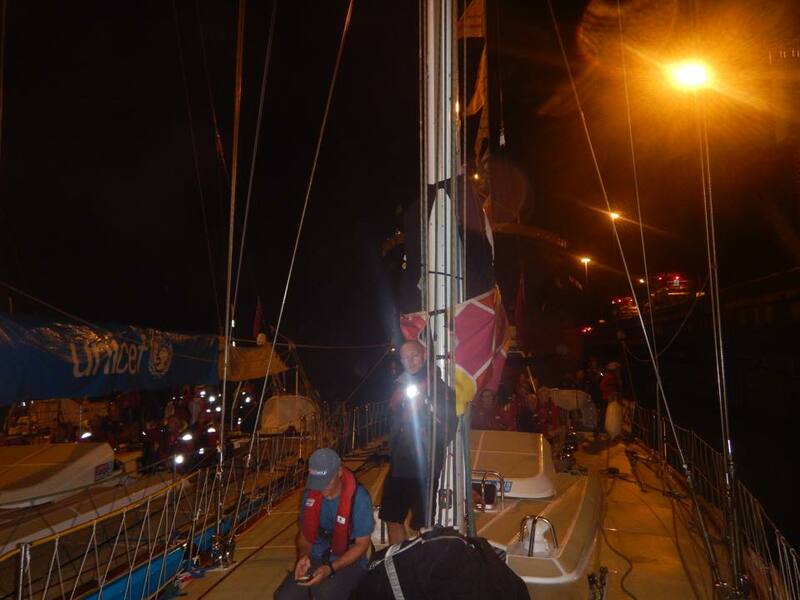 The transit begun at 6.30am and we were to go through with UNICEF and ClipperTelemed+. 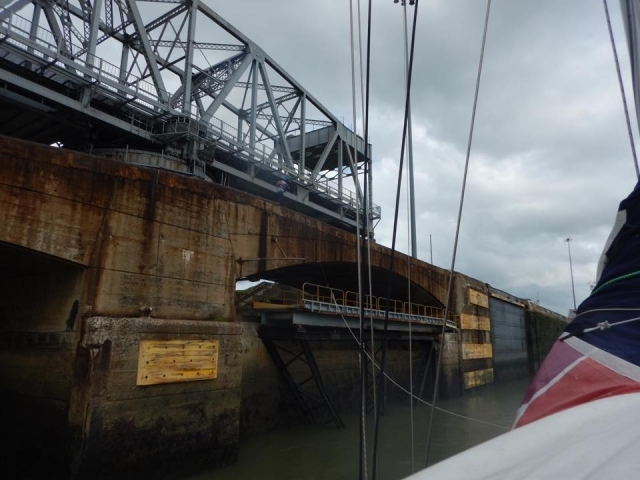 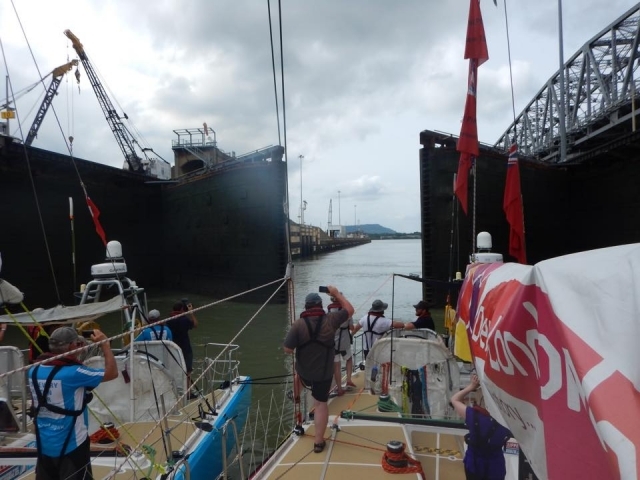 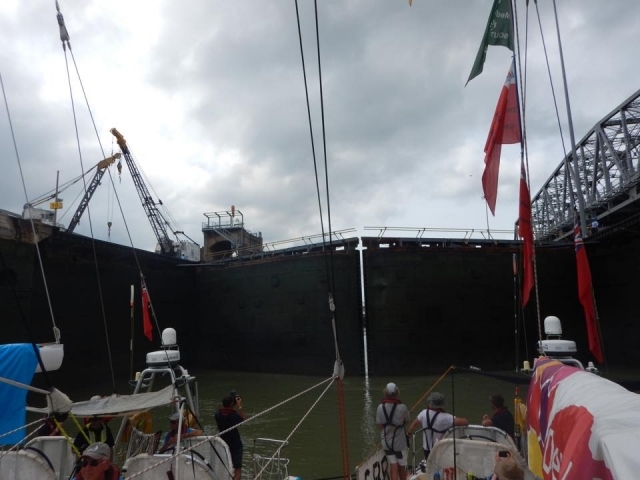 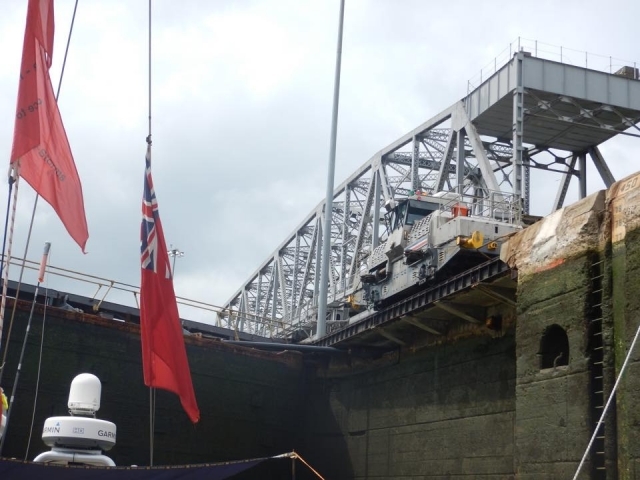 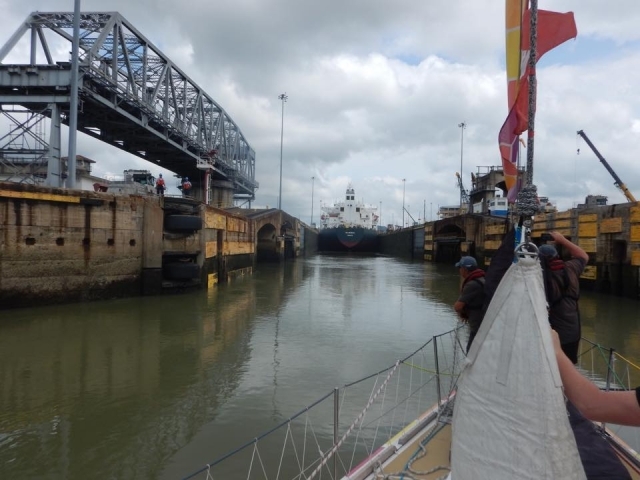 We went under the bridge of the Americas and then rafted up with the other two boats to head into the first set of locks. 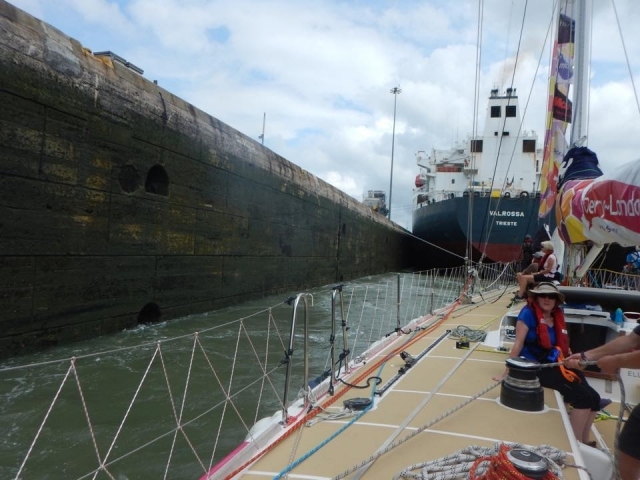 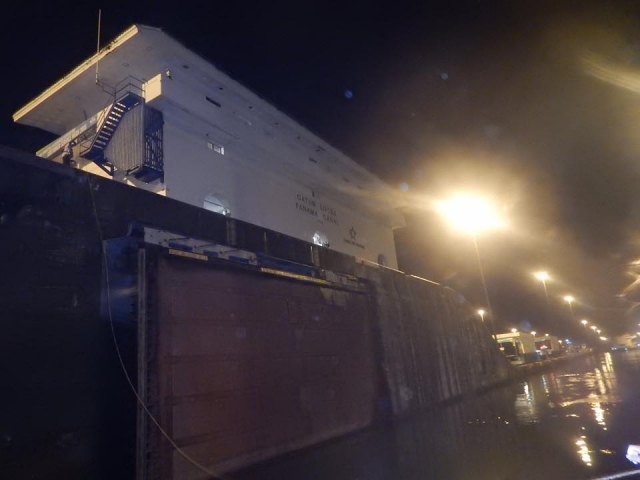 We were going through with a massive container ship that was nearly as wide as the lock! I have to admit that the first set of locks was quite exciting but once the rain came the transit became less exciting. 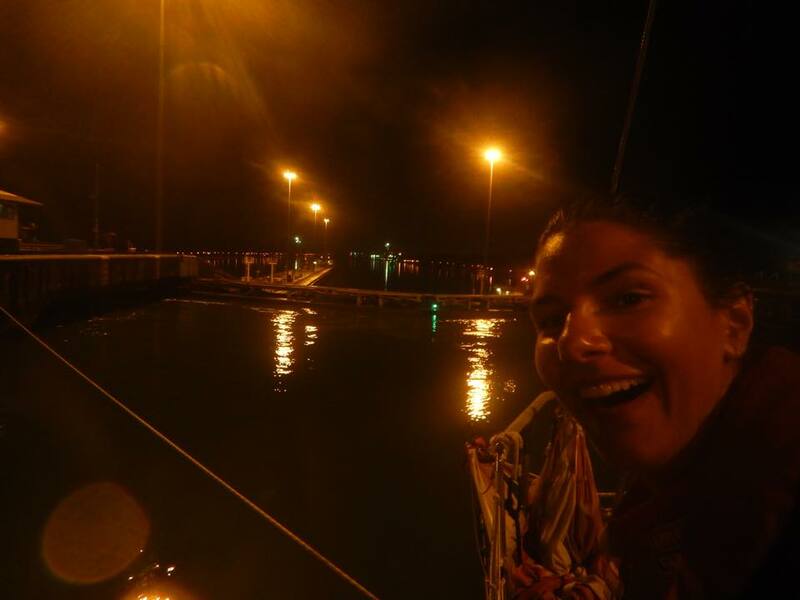 We had to moor up half way through the transit to wait for a second pilot to come and we saw a crocodile! I helmed for part of the second section of the canal which was good fun and another item to tick off the ‘done’ list. 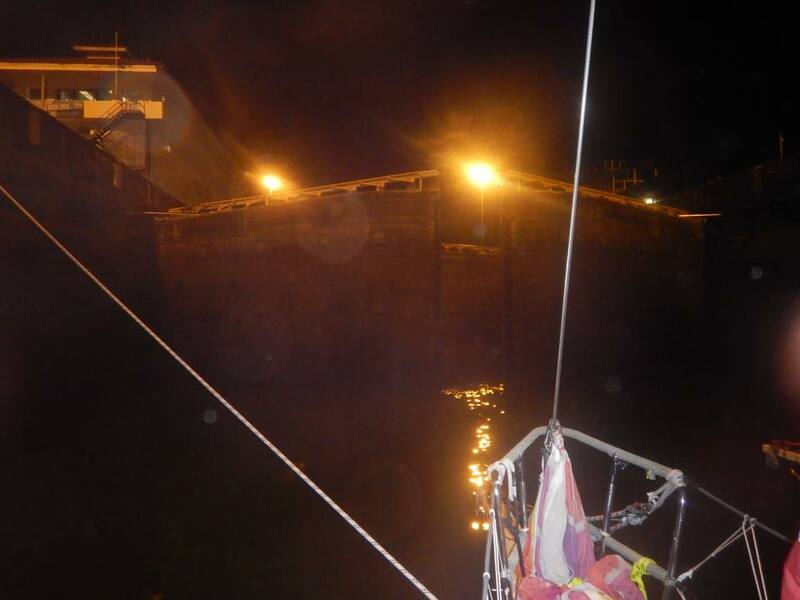 The last set of locks we reached just after sunset and went in with the same large vessel but this time in front of them and as our raft edged past them you could almost touch it. 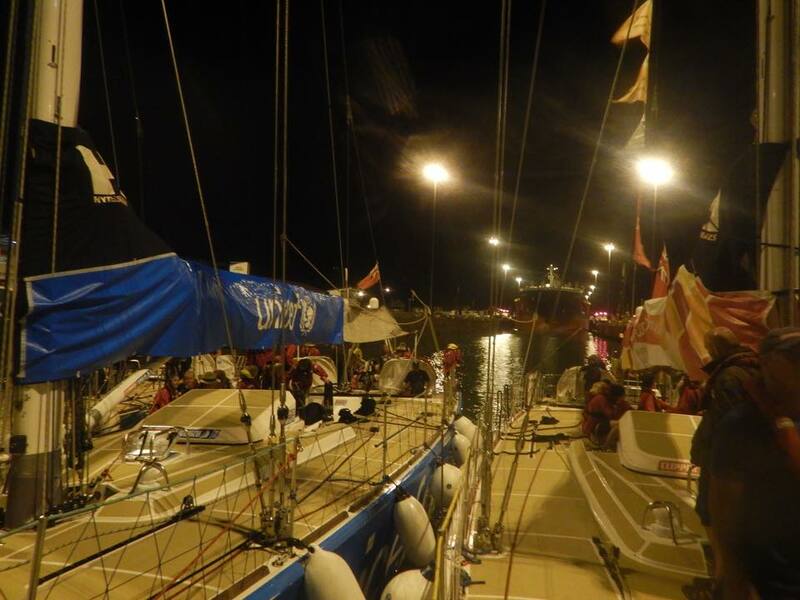 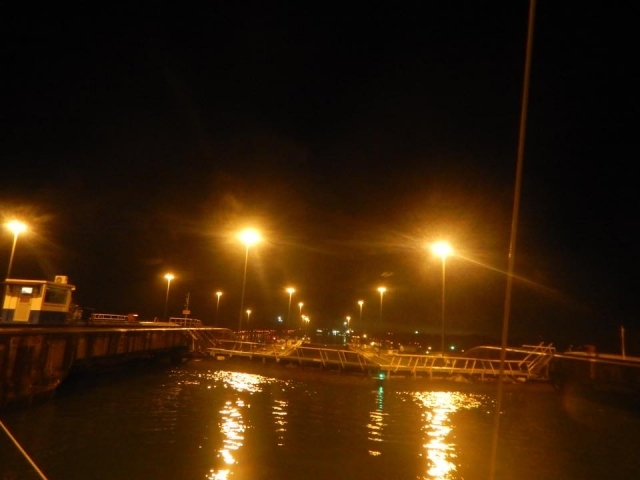 We arrived in Shelter Bay marina at about 10.30pm after a long day on the canal. 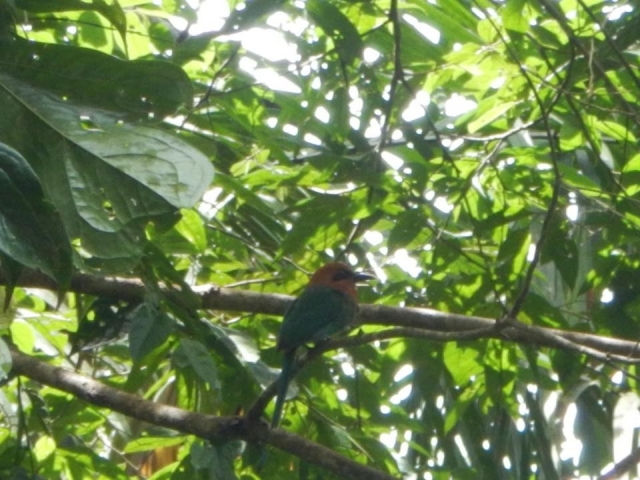 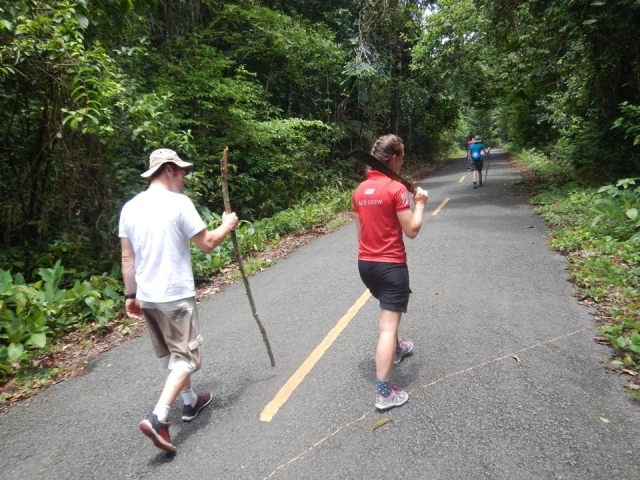 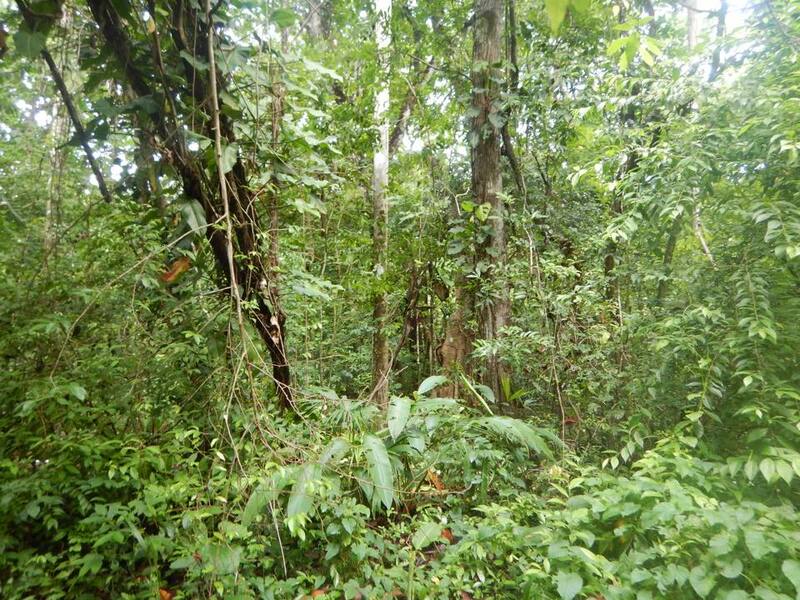 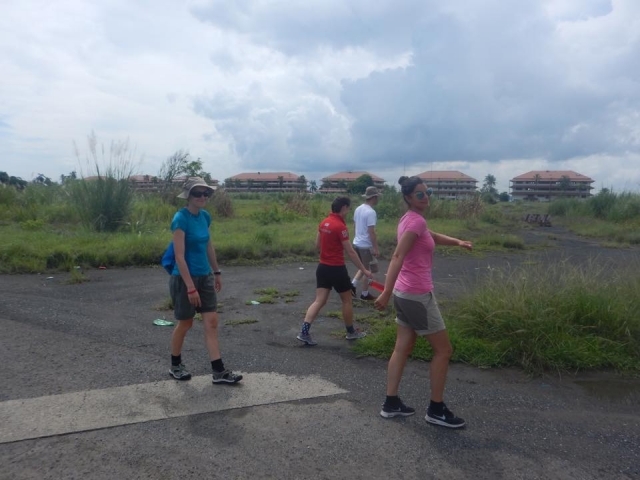 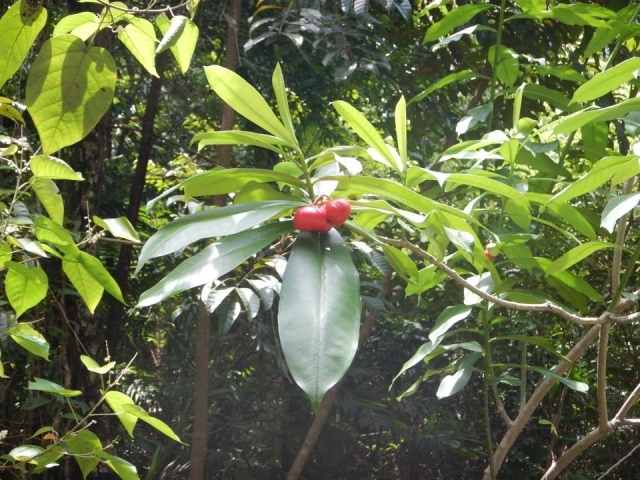 We are here until we depart for the next race in 4 days time – there isn’t a lot here so we have enjoyed an informal relax with outdoor pool and walking in the jungle! I’m ready for the next race and hope we will be able to do better than the last. Fingers crossed we get lucky this time! We are now on the ‘right’ side of the world and nearing home. 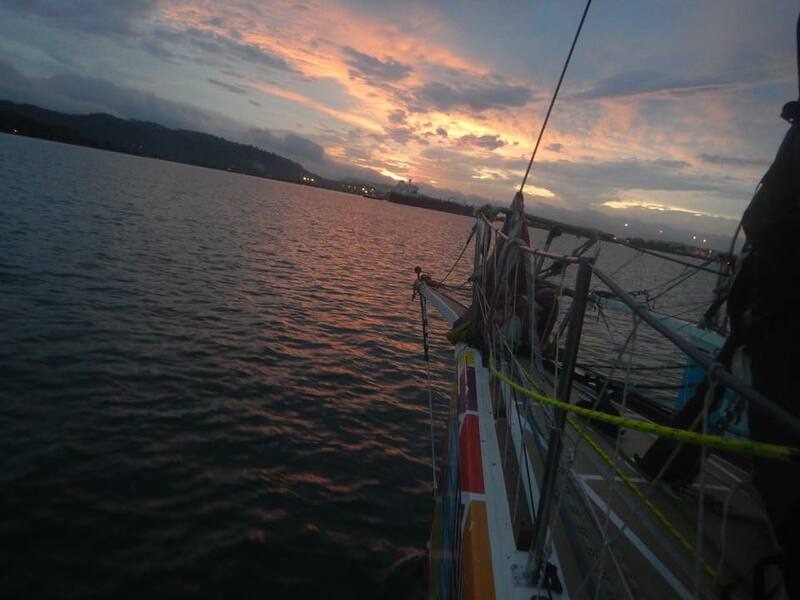 I still, don’t know what life holds when I return or what I want to do but know that I am going to miss the sailing life I’m currently having. 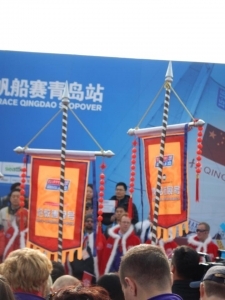 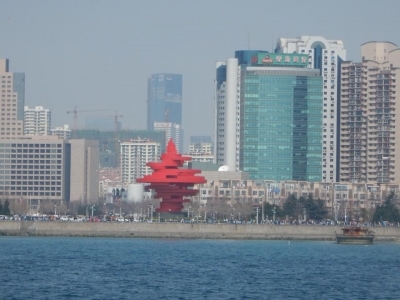 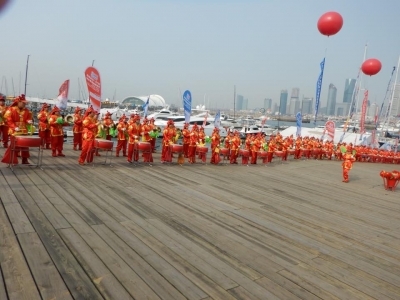 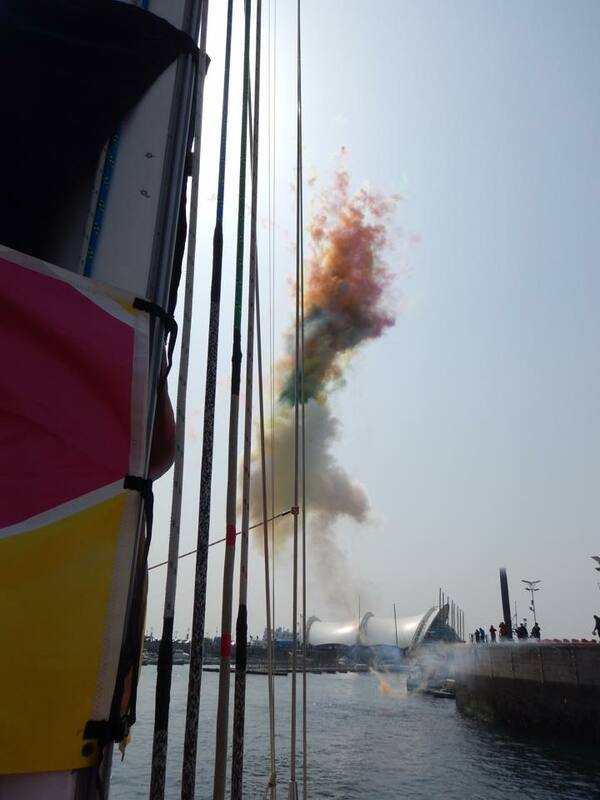 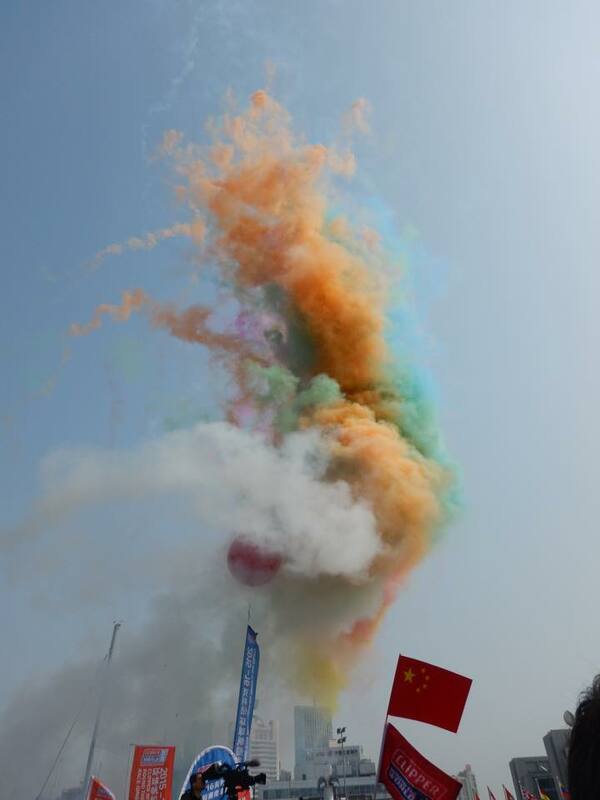 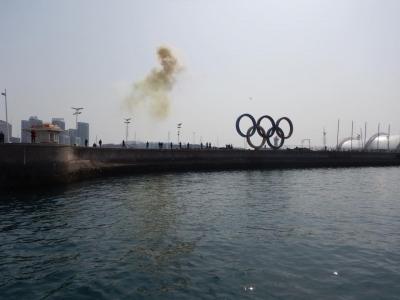 The sun shone for us as we left Qingdao to another cultural departure ceremony. There was a lot of waving to be done too with three laps of the parade of sail loop before race start. We in fact did a fake start for the adoring fans lining the harbour which was then ended as we had an overnight motor before the real Le Mans the following morning. 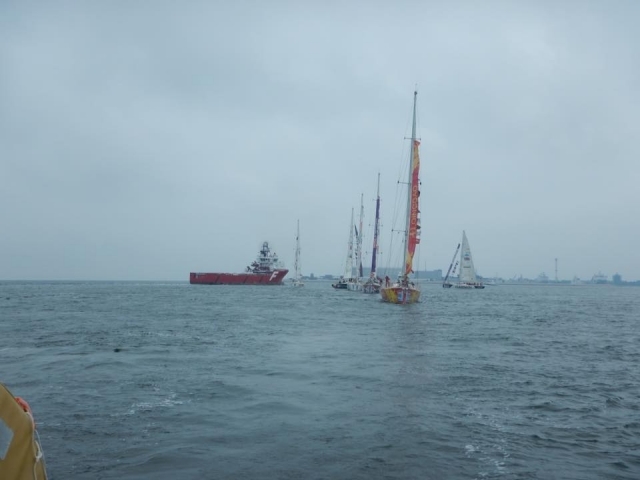 I much prefer the Le Mans start as they feel a much calmer experience to a regular start line as there isn’t the need to fight for the perfect line as the order is pre-drawn. 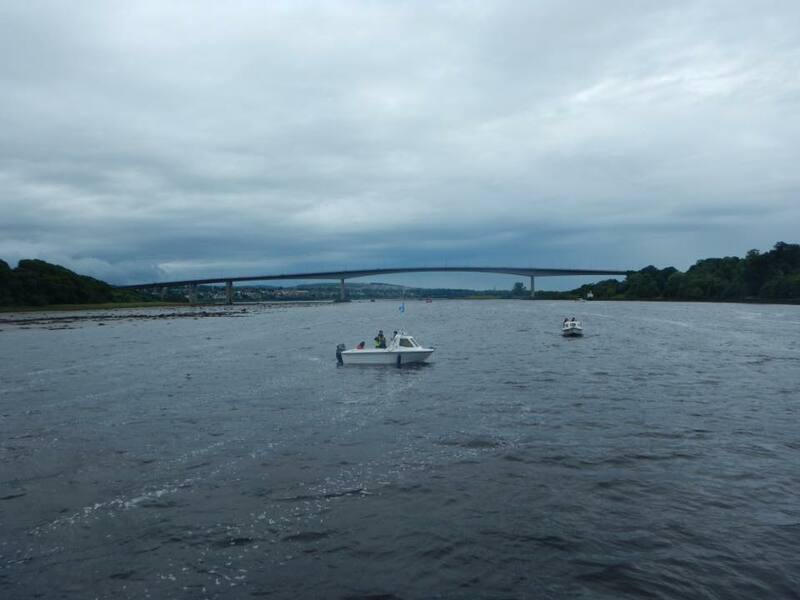 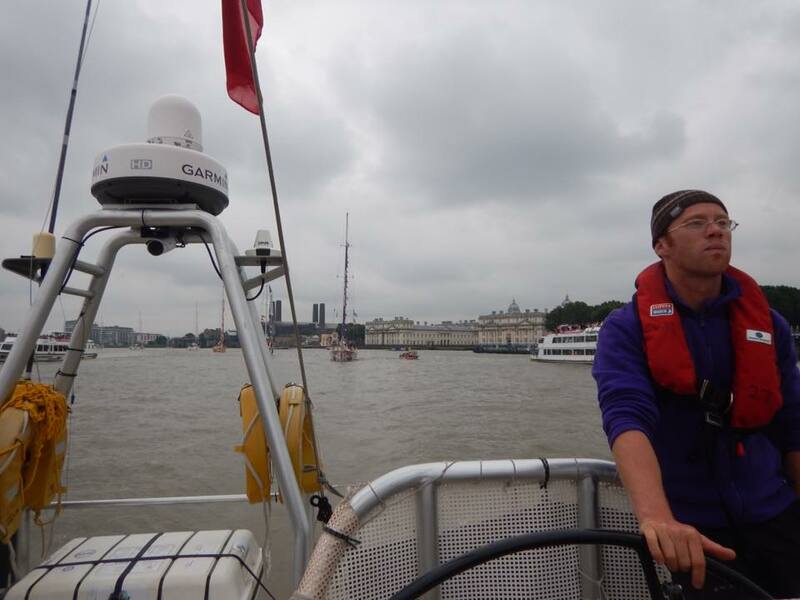 We were lead boat which meant that Dan had to run the start and ensure the fleet stayed within the rules. 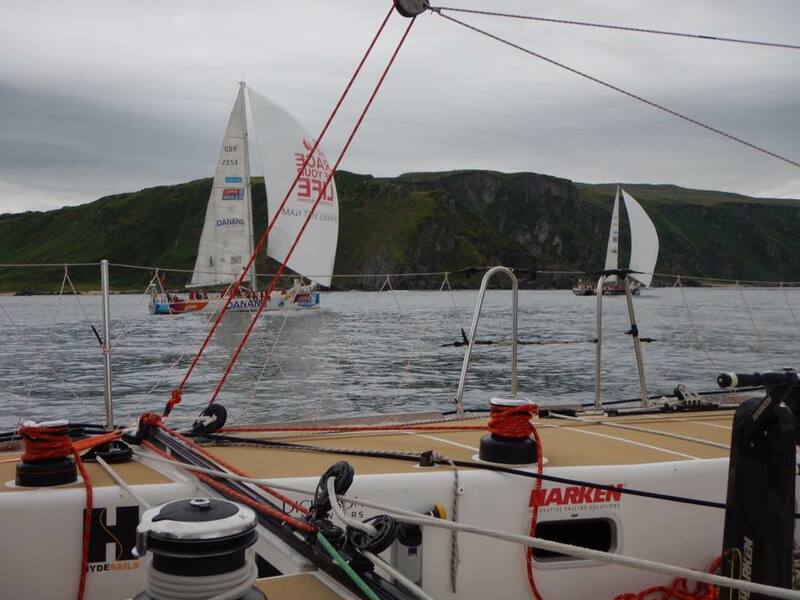 Not long after the start we encountered a fishing fleet who must have wondered what was going on as 12 yachts raced towards them! 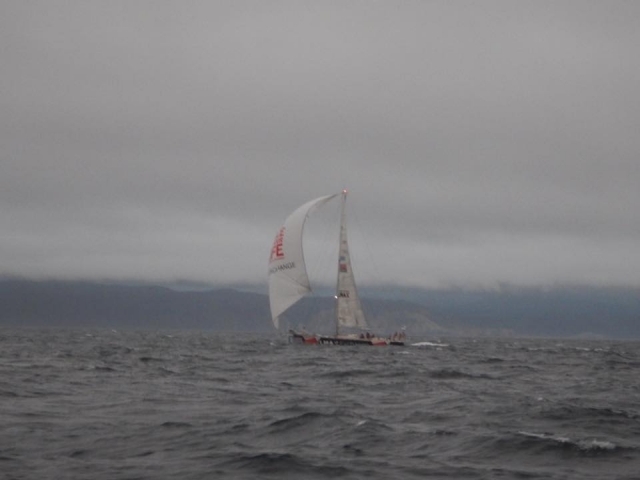 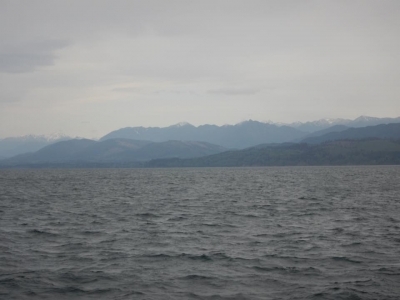 I have to admit I’ve never looked forward to this particular race and crossing the North Pacific. 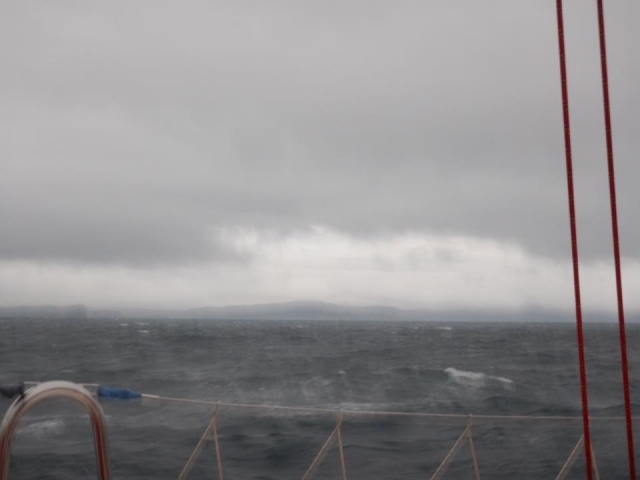 It’s always been something I’ve known needed to be endured to become a circumnavigator and not necessarily an ocean I would have chosen to cross. It certainly didn’t disappoint with the promise of being wet, cold and miserable! We were treated to a few days of ‘warmer’ weather before we passed Japan, which was unexpected. I thought I’d experienced cold on the previous race but that was only a few days. This time we had weeks of being wet and cold not only on deck but below decks also. 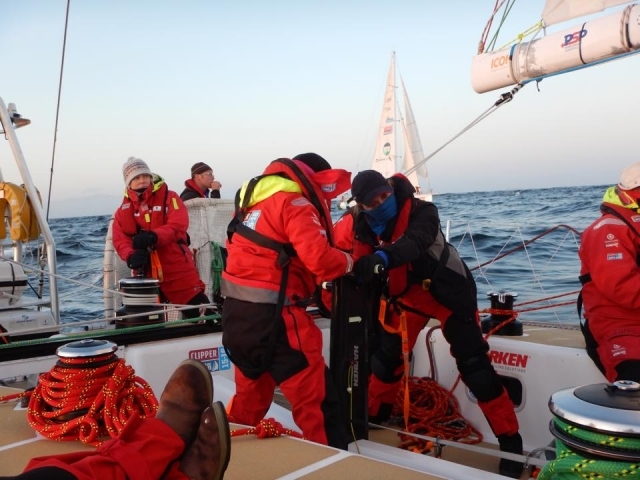 Even our drysuits got renamed damp suits as after a while they gave up as after being pounded by waves on deck they never had the chance to dry out before the next watch. 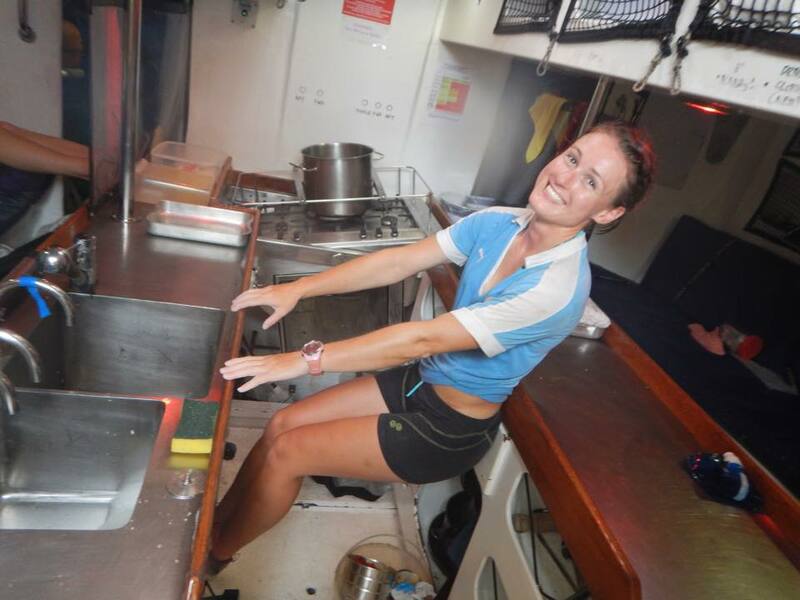 It got to the stage that you’d talk of putting on the damp rather then the very damp items of clothing. 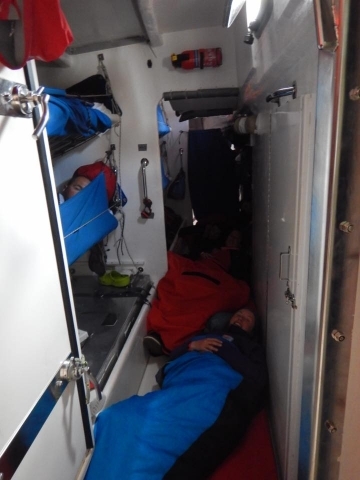 The most treasured item of kit was my sleeping bag, which I managed to keep dry on the inside, which gave my body the chance to thaw out during off watches. 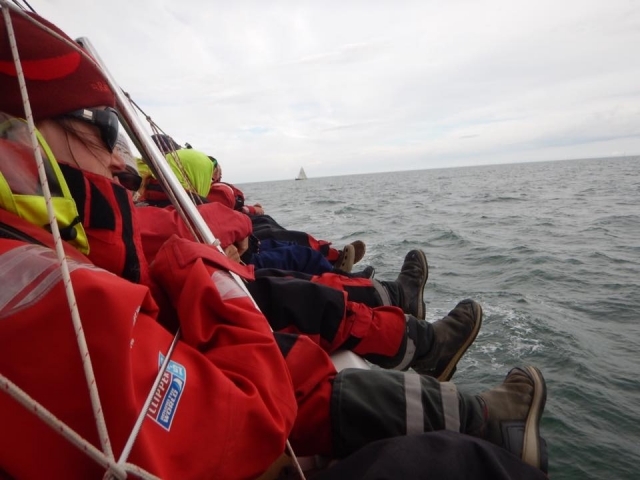 When on watch we would rotate who was on deck and the others would go below to hug hot water bottles and have warm drinks. 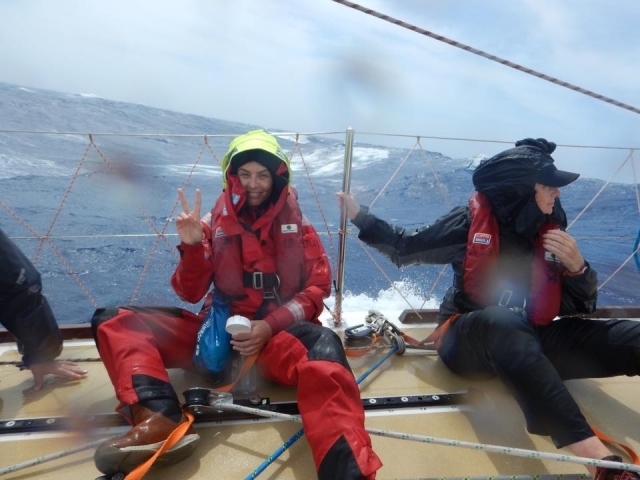 It was so cold that there were sleet showers and hail just to bring more excitement to life on deck. 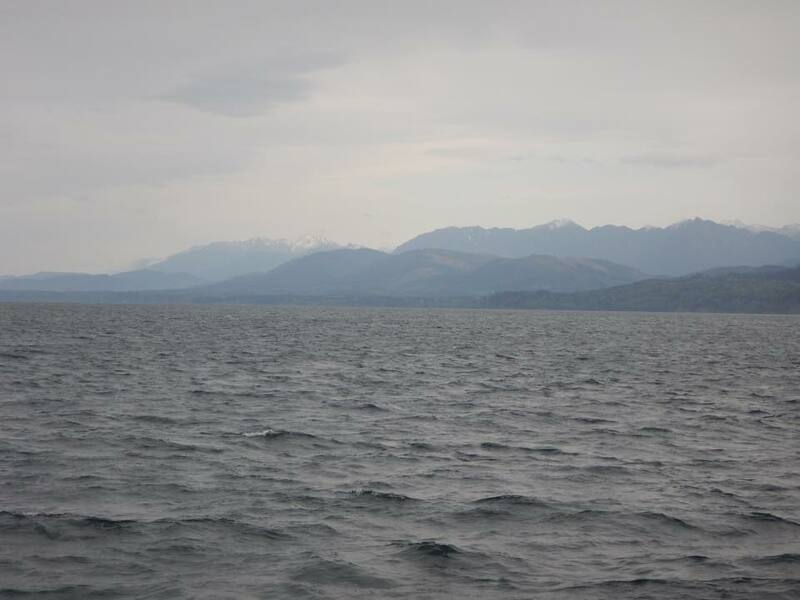 The landscape was pure grey. 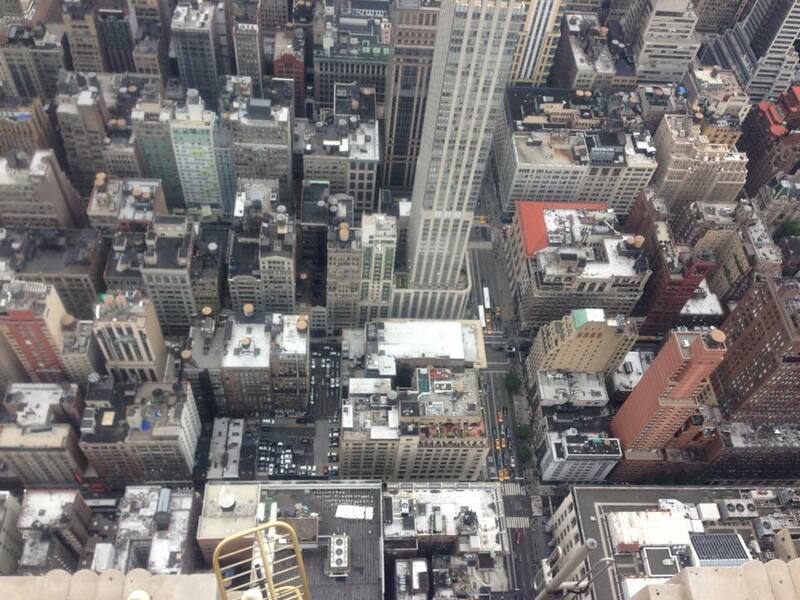 I can only describe it like one of those trendy black and white photos which has some touched up colour added. 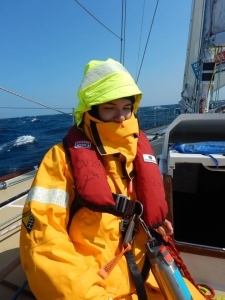 The colour being the yellow drysuits of the crew on deck. This was the longest we have gone also with out seeing anything or anyone. 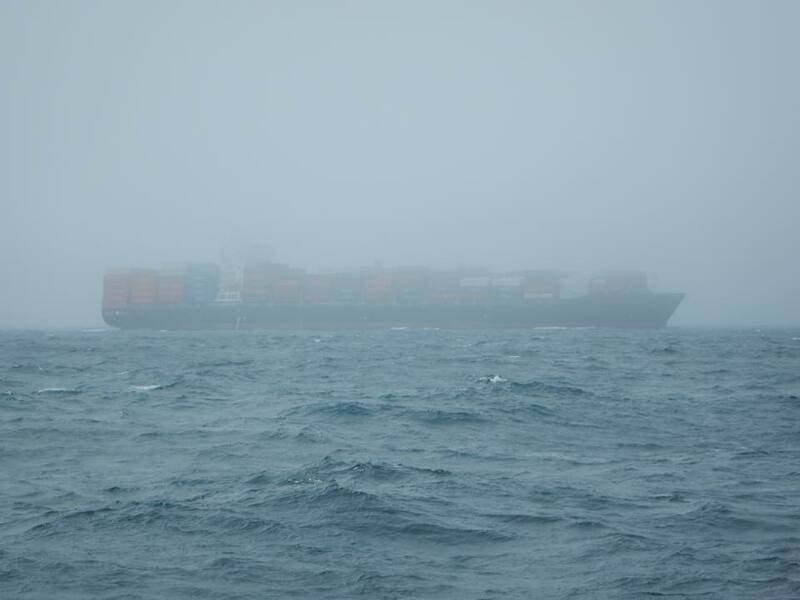 No planes flew over, no other shipping, no land which makes you realise why not many have tried to sail the North Pacific either! 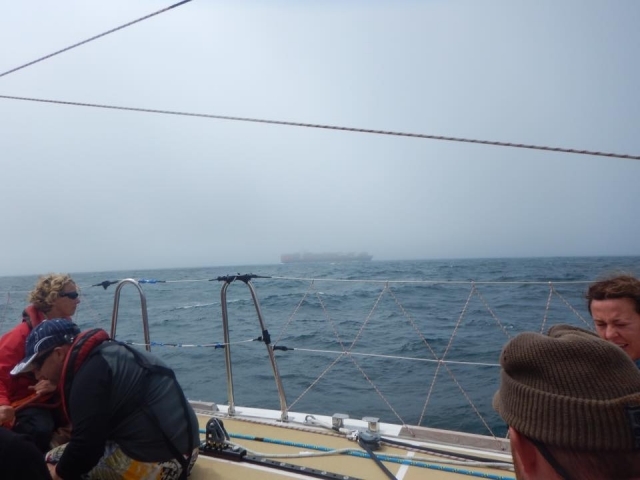 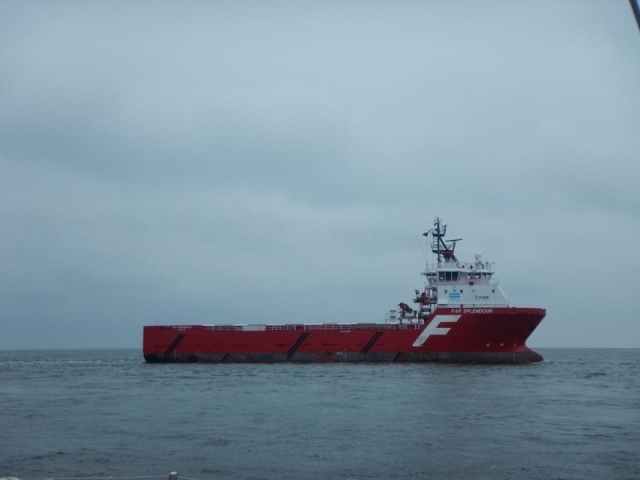 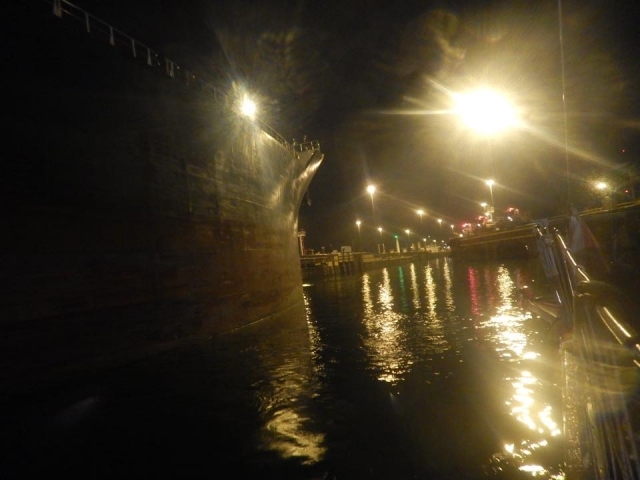 The lack of shipping showed so much that one day we got called up by a tanker – we were in no danger of collision it was more the guy on the tanker wanted to say hi! 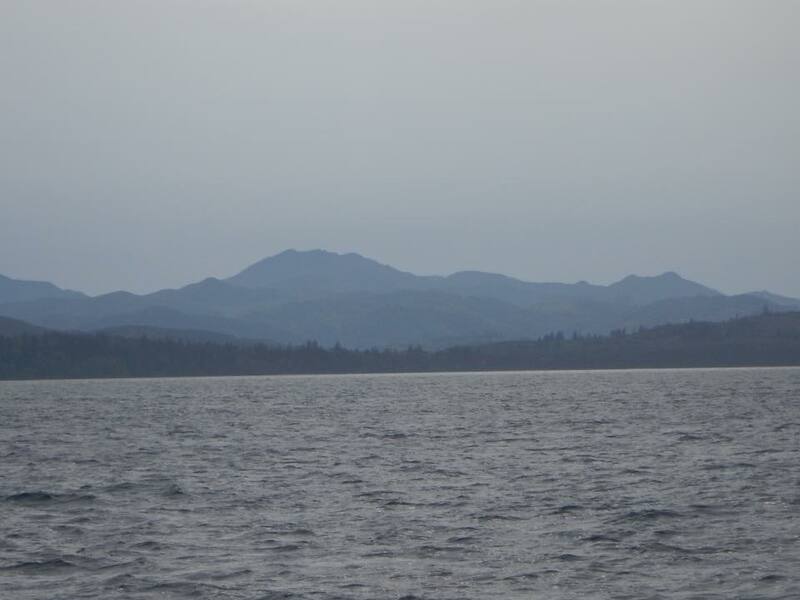 There wasn’t a lot of wildlife out there either, we saw Dolphins, a couple of whales and birds but not everyday or even week. 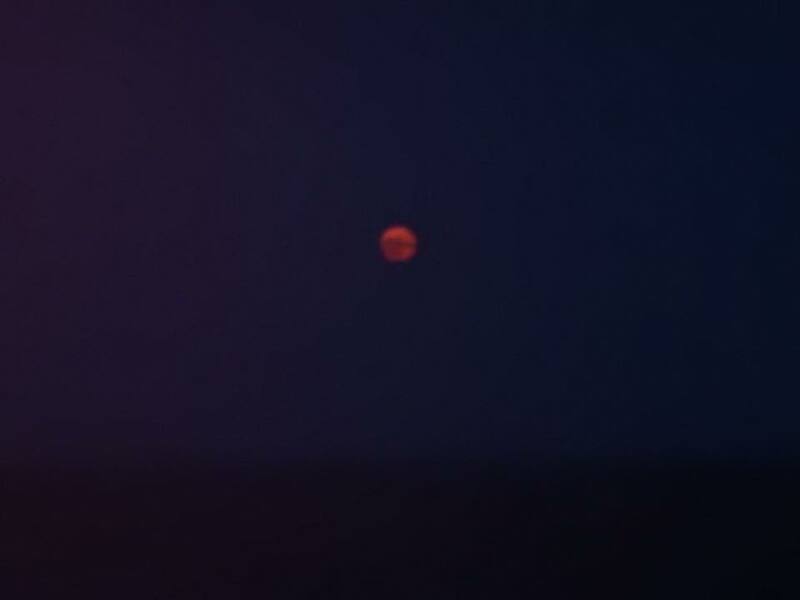 We really were at times the only thing out there! 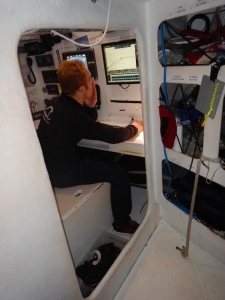 We crossed the international date line which meant going back in time and re living 24 hours again. 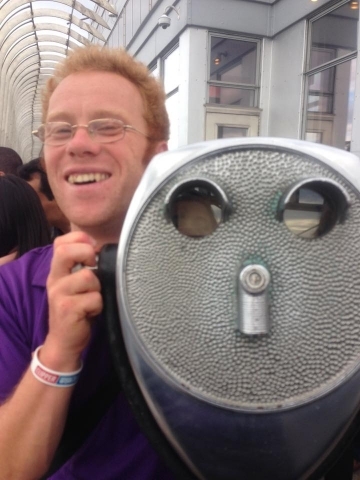 This means with the leap year that I will have had 367 days between birthdays! 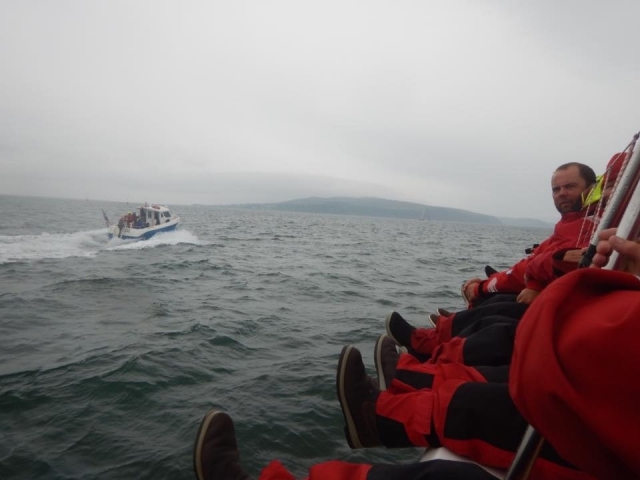 And yes it was an extra day of wet and coldness! 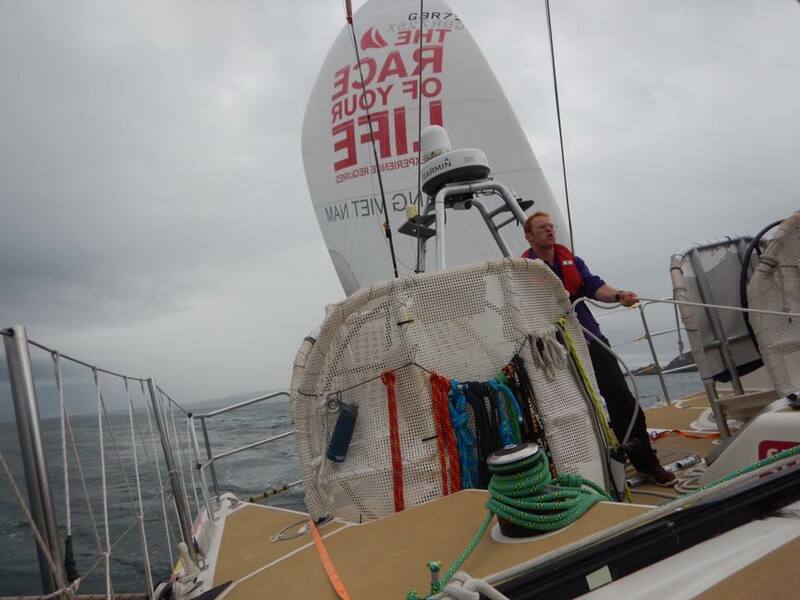 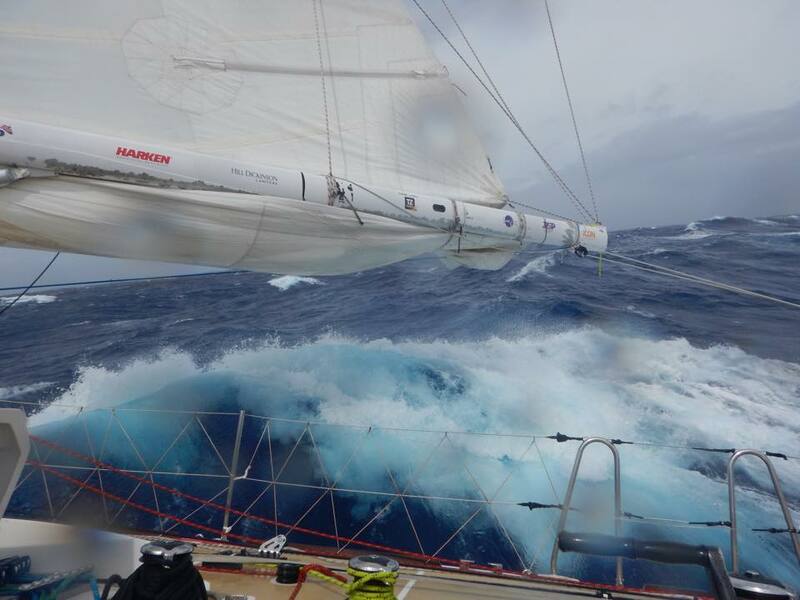 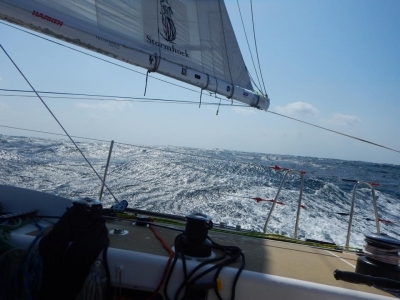 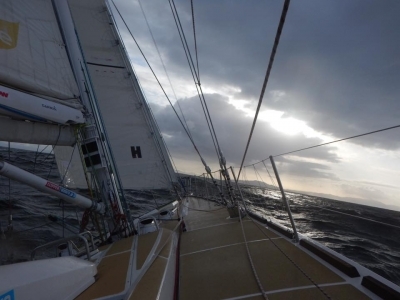 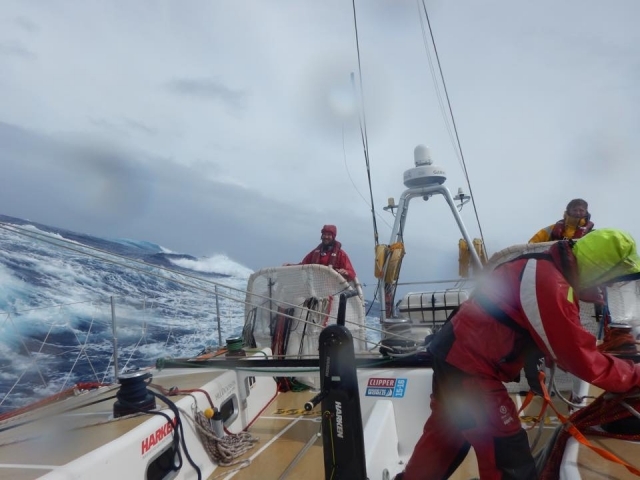 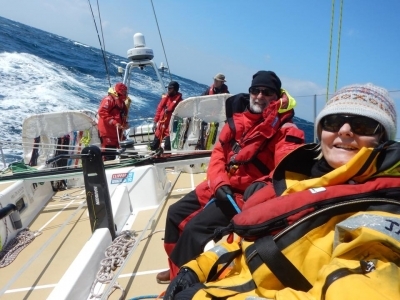 Despite being warned of massive seas we have yet again had a race with every weather going. Who would have thought we’d be flying a wind seeker in this race?! 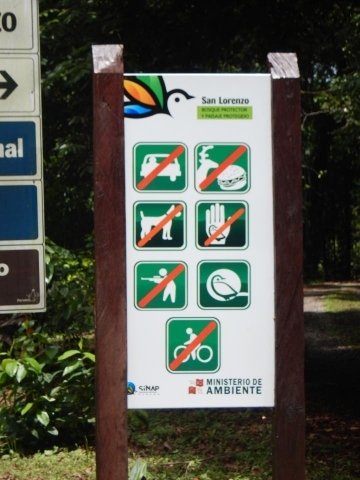 But we did! We also had the other extreme of 60kt winds so we were very much kept on our toes throughout! 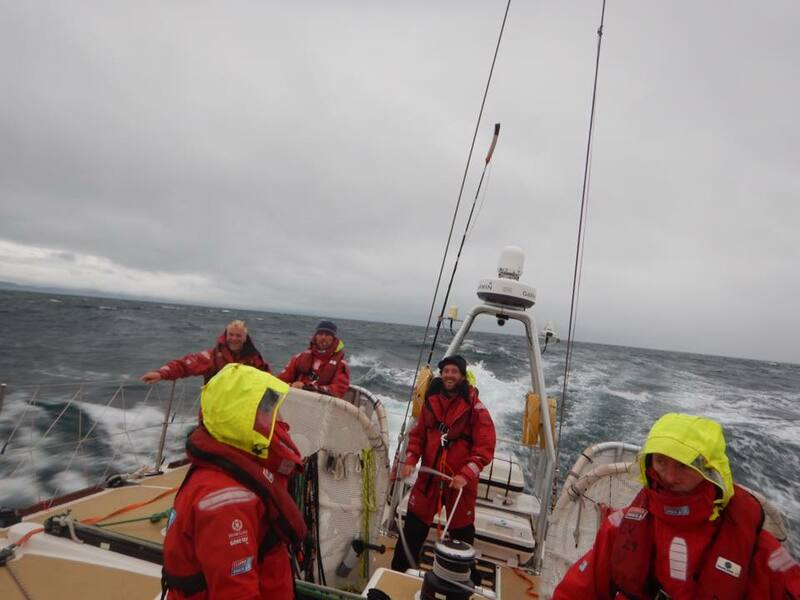 When the waves came they were mighty and powerful and we were lucky as a crew not to be damaged by them like many others in the fleet were. 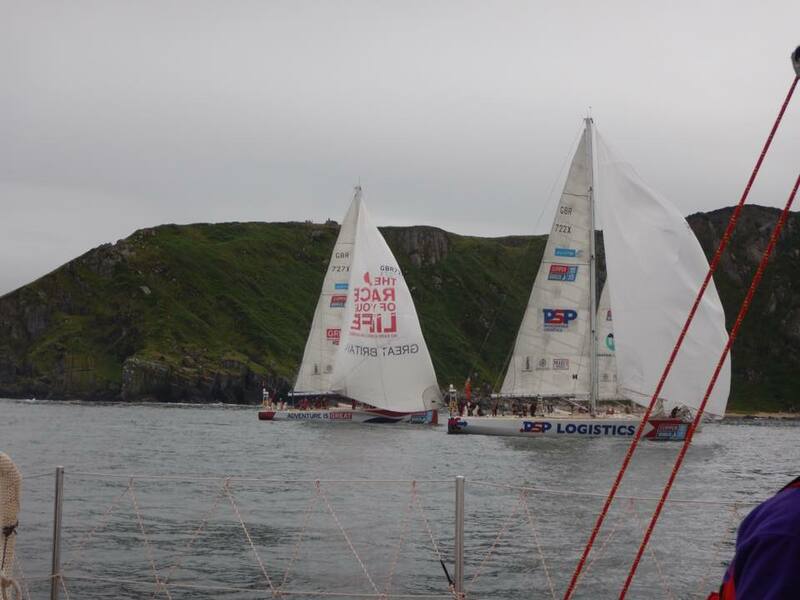 This race has sadly brought another tragic death to the fleet which was hard news to get. 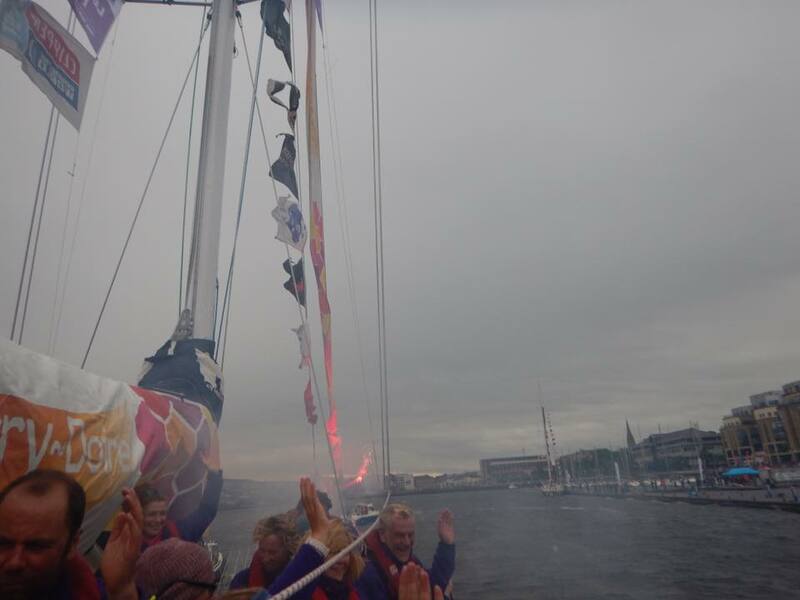 The news of Sarah’s death following falling overboard IchorCoal shook us all. 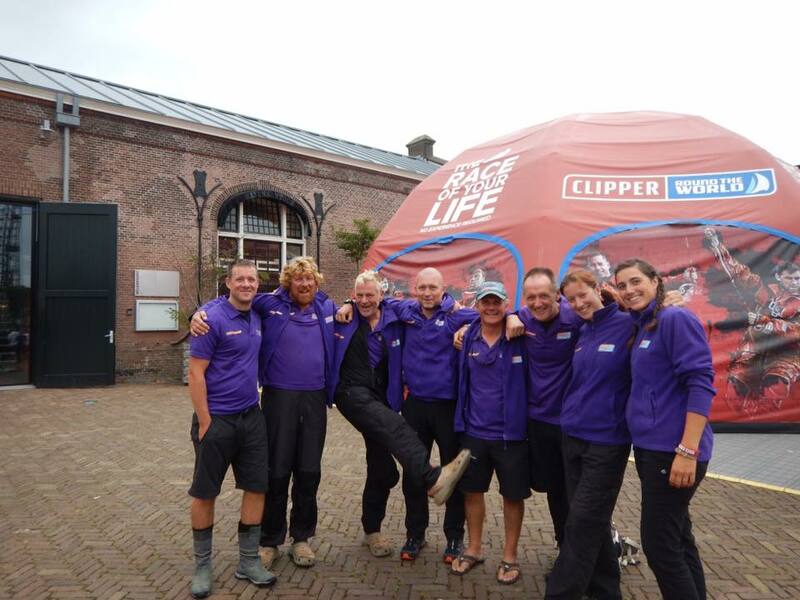 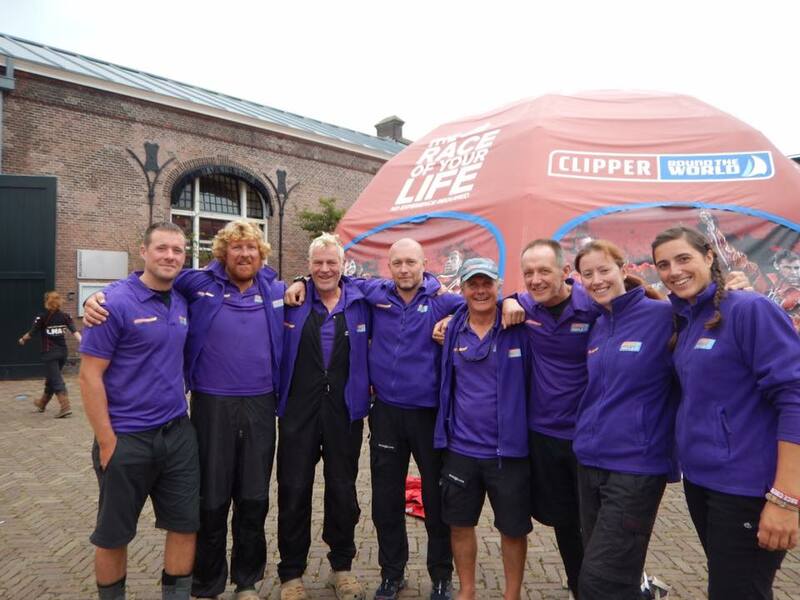 Clipper is one big family and a loss of a crew member affects everyone and the further round the world we go the harder this news is to digest. I had the pleasure of knowing Sarah. 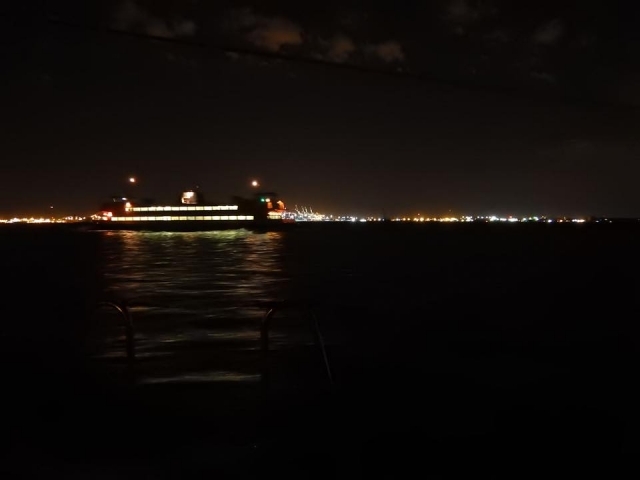 Her smile could be seen across any port we were in. 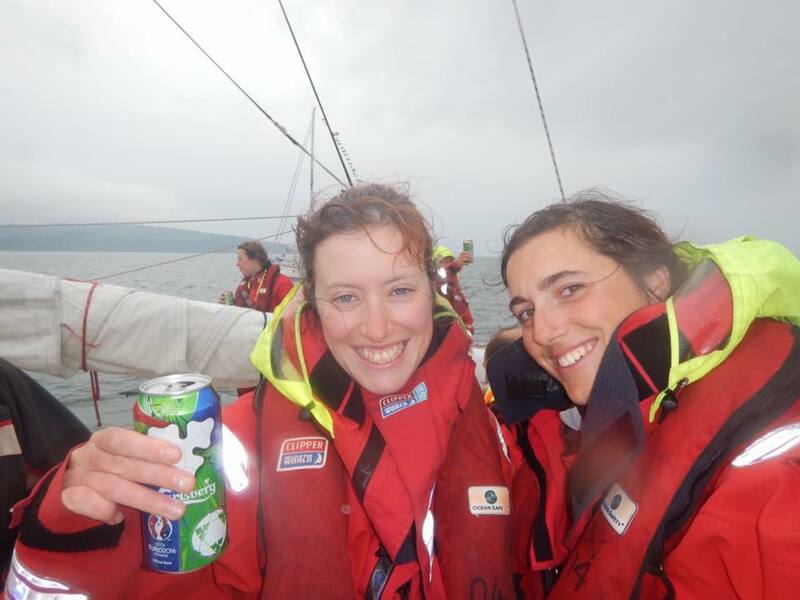 I will never forget the drinks on New Year’s Eve in Hobart which I shared with Sarah where we spoke of our hopes for 2016 and what post-Clipper life might hold. 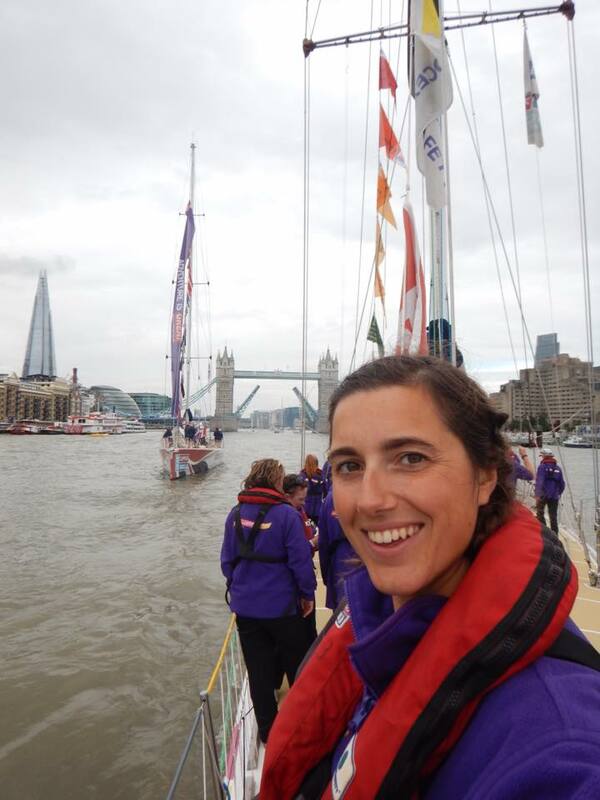 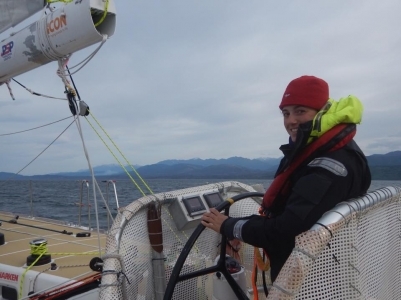 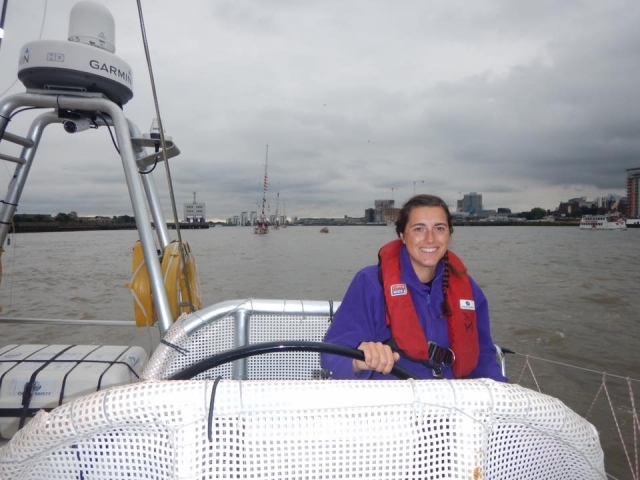 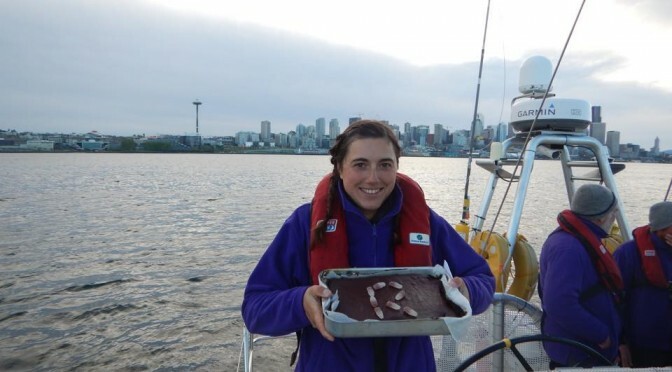 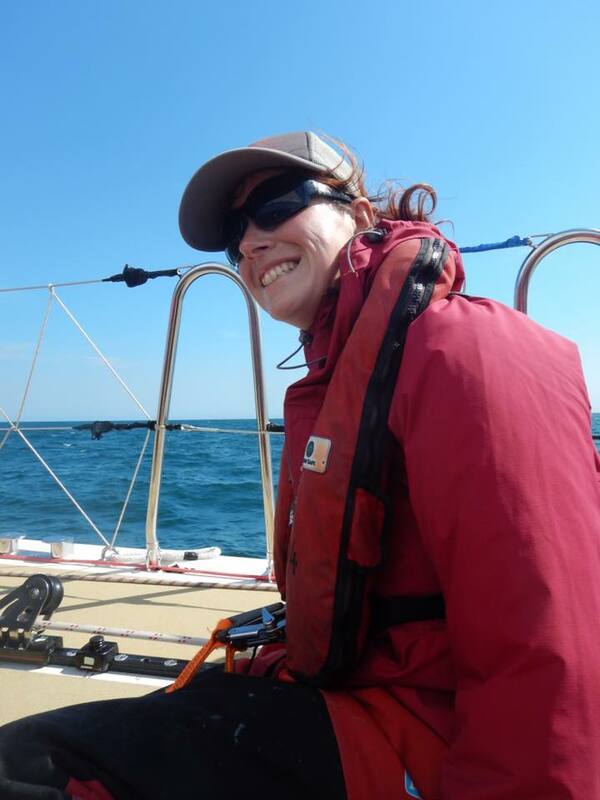 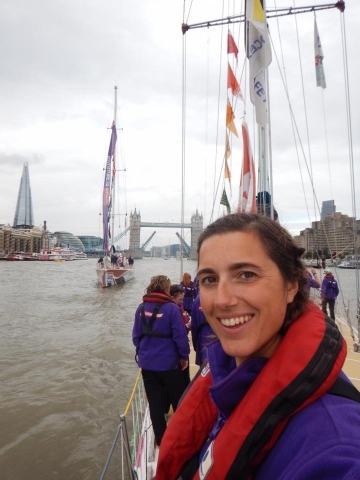 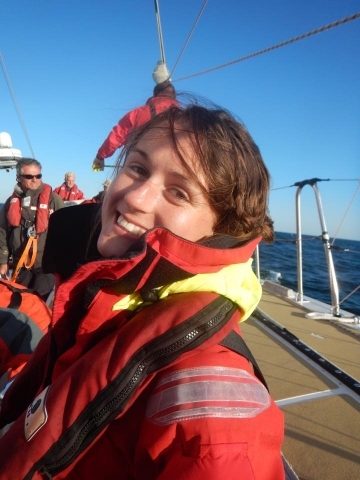 I know that now Sarah has gone, she will be with all of the Clipper fleet for the rest of this journey shining brightly, like her smile, in the stars that guide us. 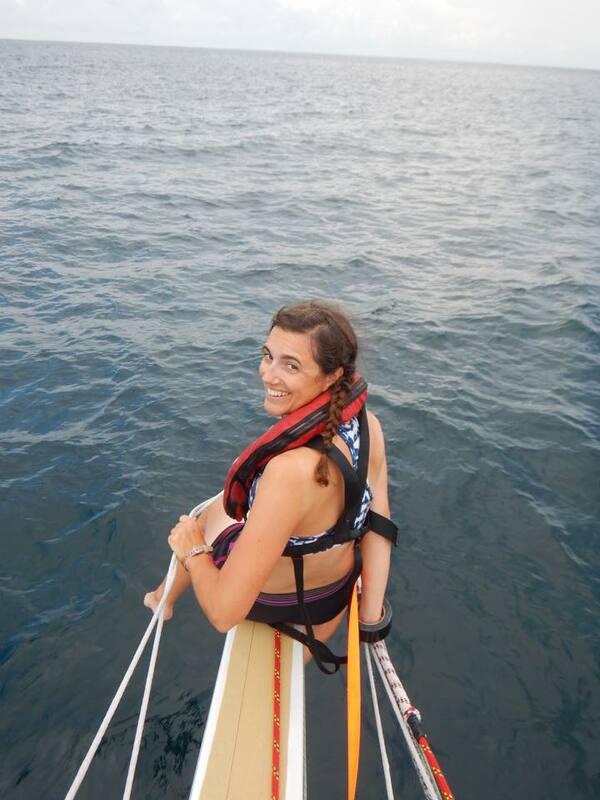 We will never forget you, rest in peace Sarah. 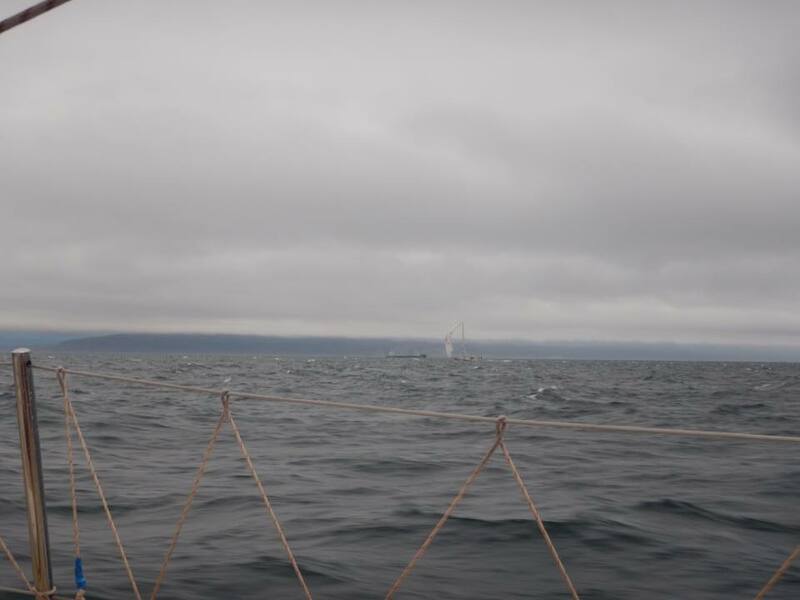 The greyness of this race meant that you had to find ways to carry on when all you wanted to do was hide in the warmth of your sleeping bag. 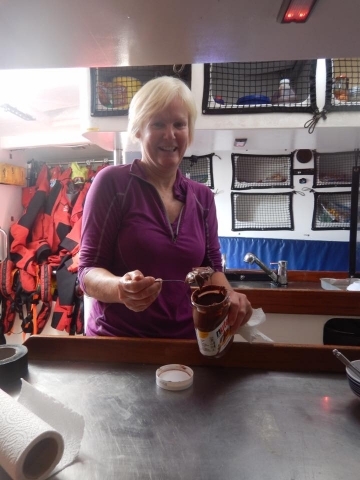 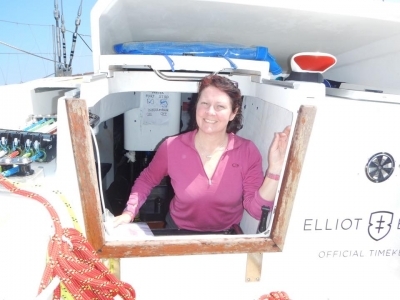 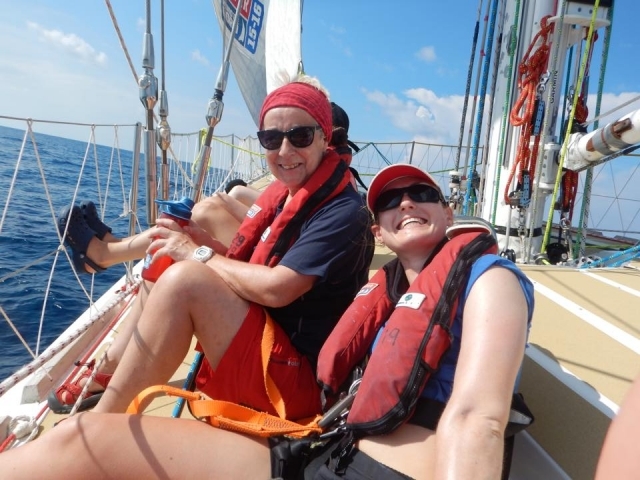 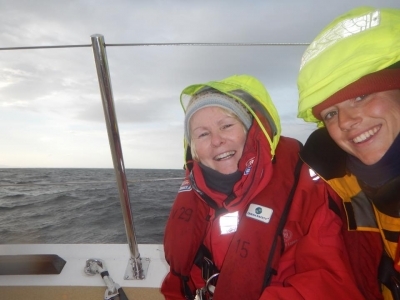 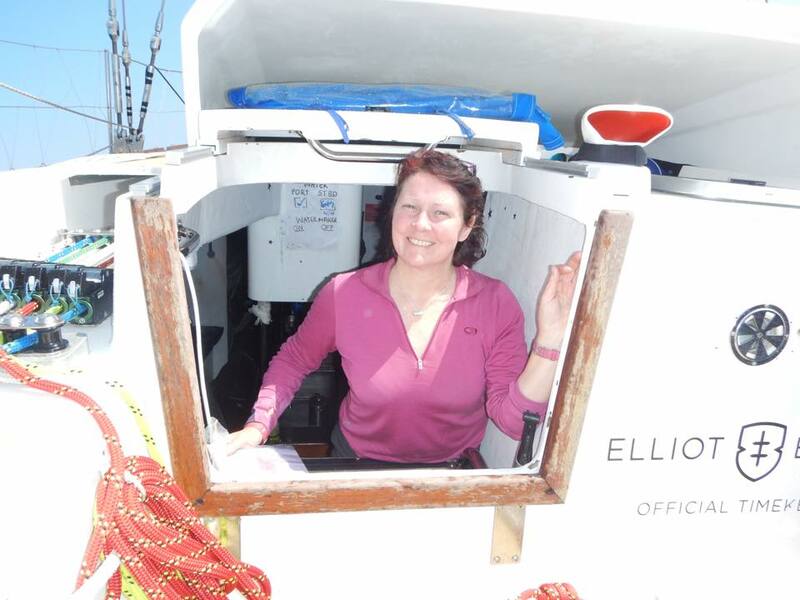 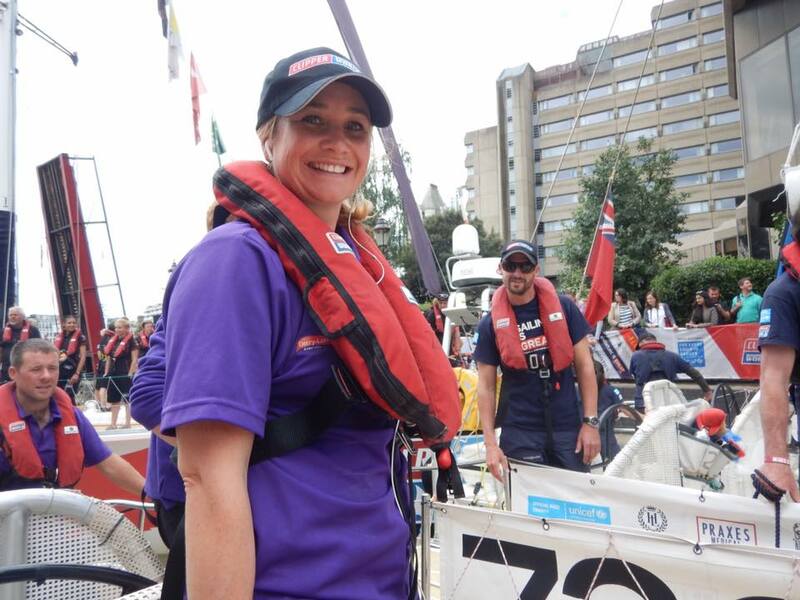 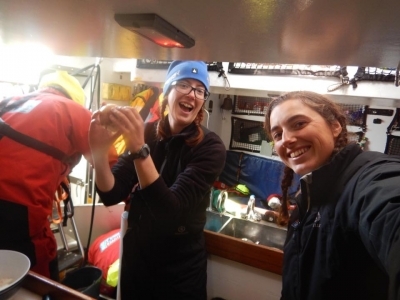 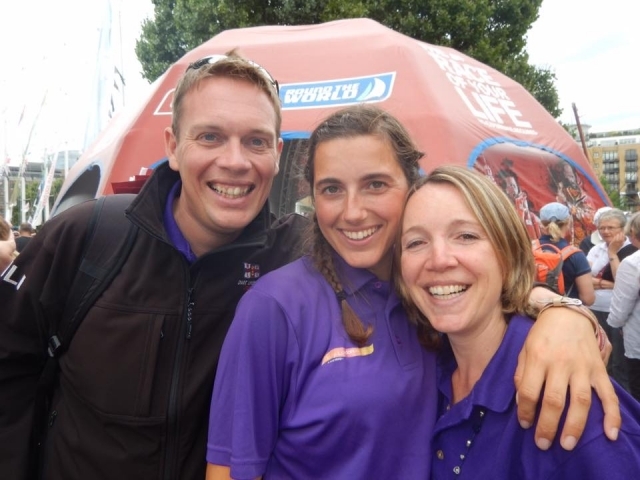 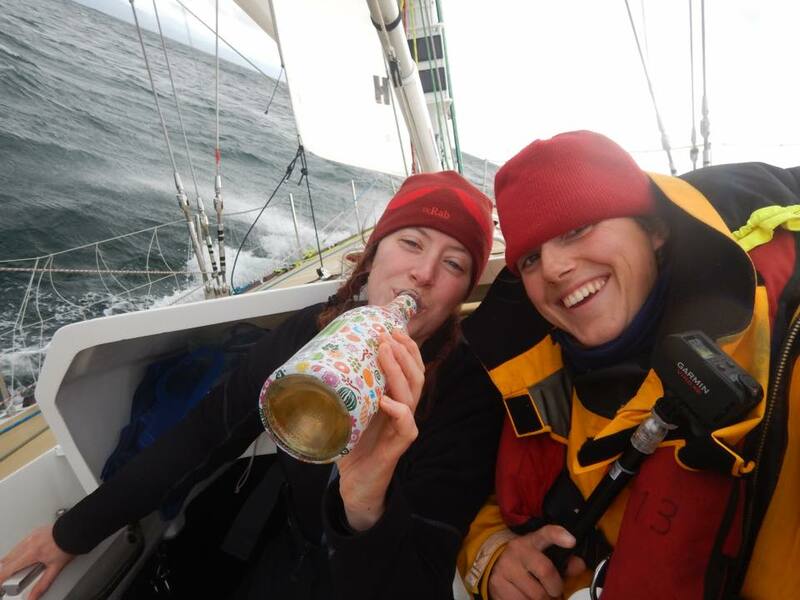 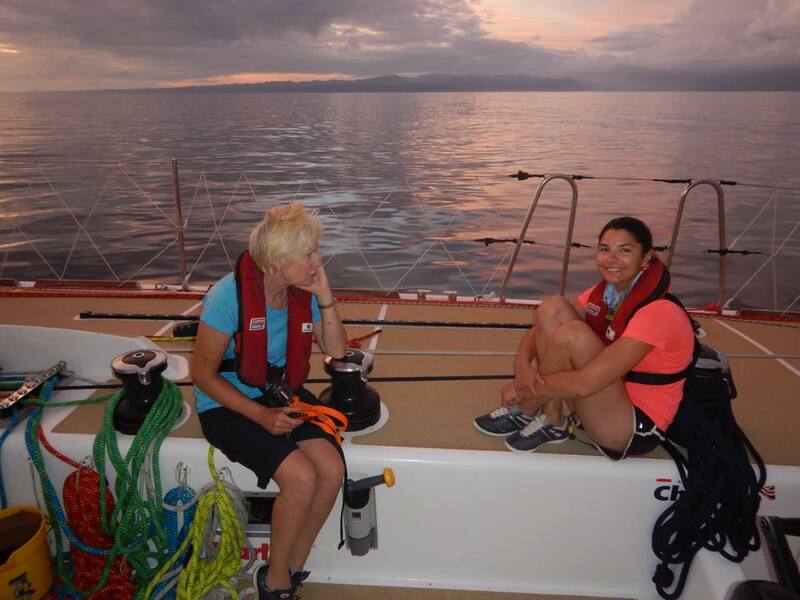 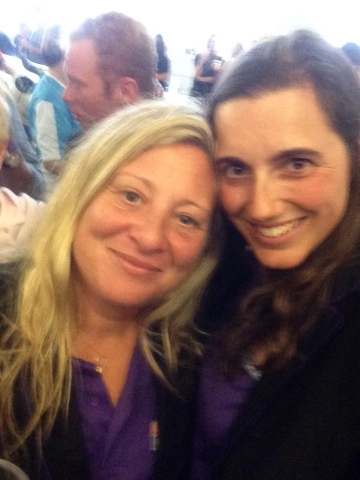 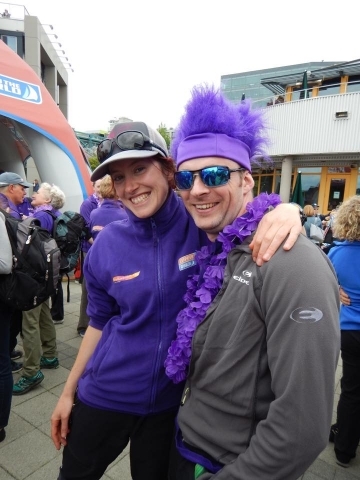 I’ve been fortunate to be in a fabulous watch and there has always been someone there to cheer you along on the hard days (I also had tonsillitis which didn’t help the body get up on deck!). We have had chats about everything while on deck and shared in laughter and tears together. 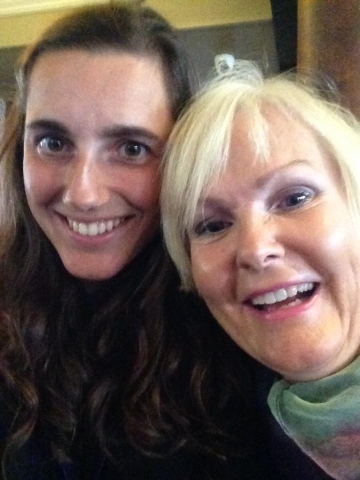 I’ve also been mother with Ellie this leg which has been awesome as again we get the chance to catch up and more importantly we have been catching up on Downton Abbey (still not at the end so no spoilers please!) 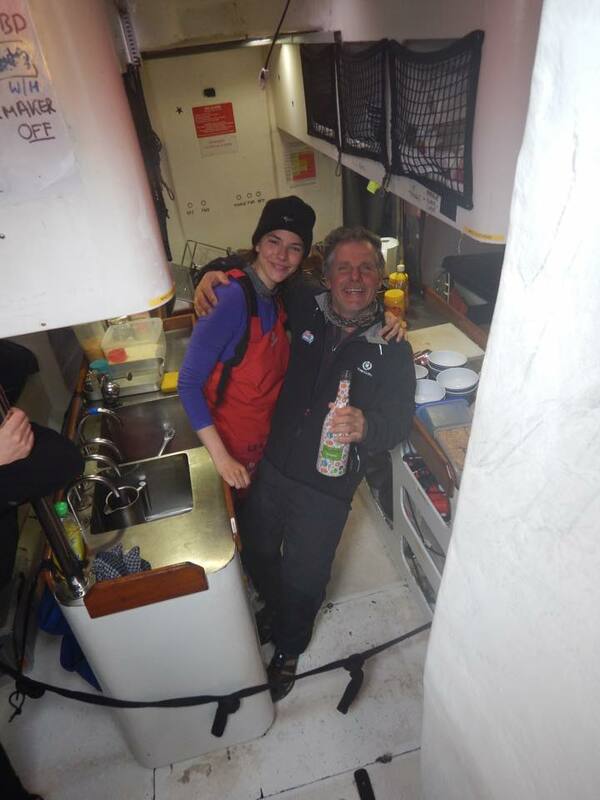 and officially shut the galley for an hour each afternoon we were mothers and created our own cinema to watch in! 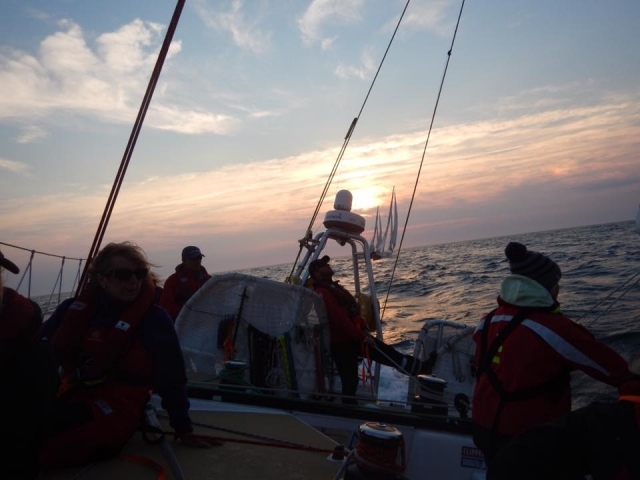 Once again we have worked hard and sailed ourselves to another victory. 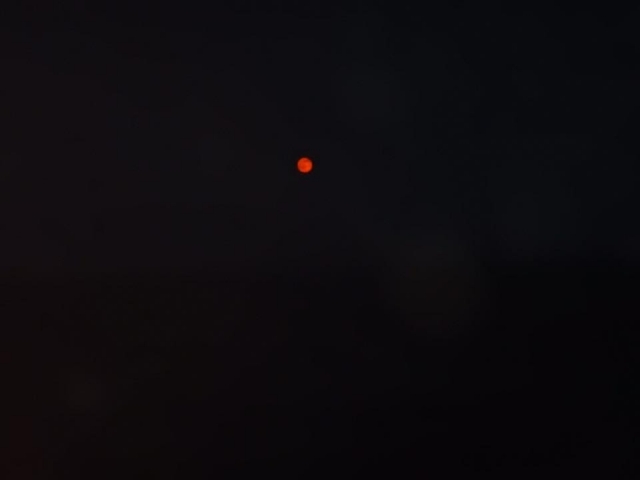 People keep asking what’s the secret and I honestly don’t know! 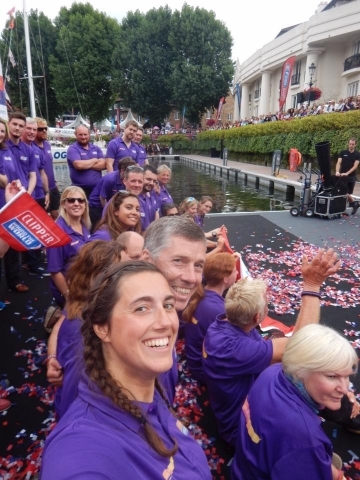 It’s great to be on the podium again and each member of the team has given something to the effort so it truly is a team effort. Before the start of each race we have a team meeting and one of the questions Dan asks us is what we are hoping for from the race. 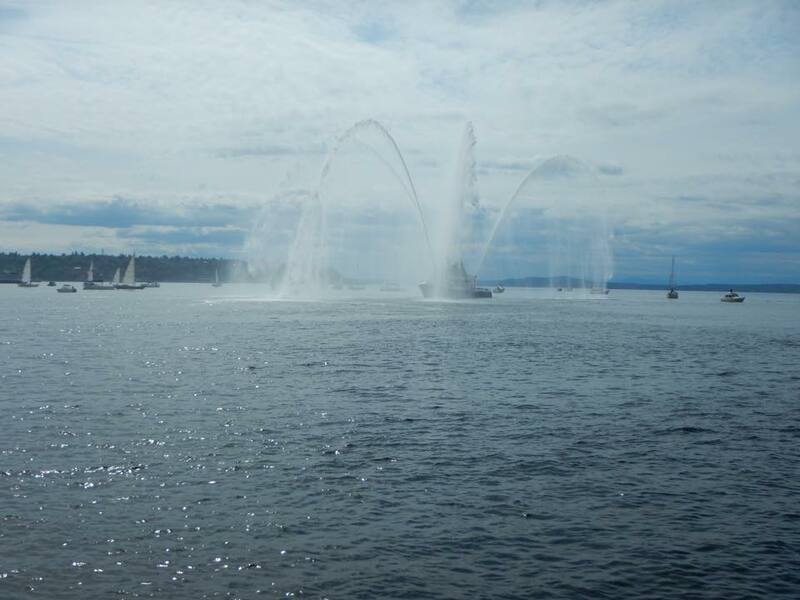 This time I said I wanted to be in Seattle for my birthday and lo and behold the team delivered! 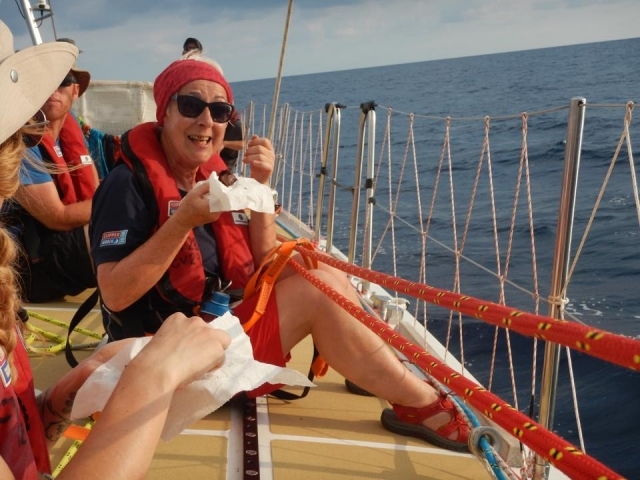 It was a birthday to remember as we arrived first thing on my birthday to rousing happy birthday singing from the race team and DLD supporters and arriving meant I could have celebratory pizza and drinks too! 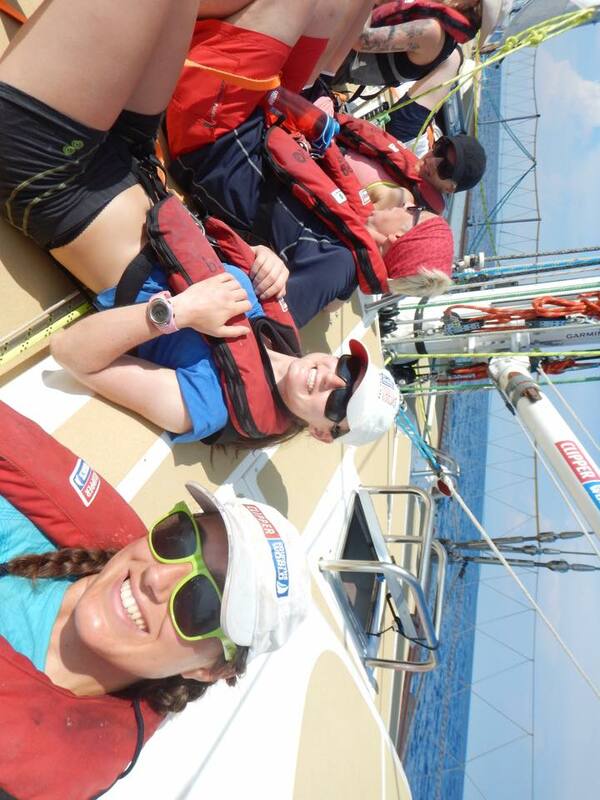 I’m so grateful to be part of this team and have some amazing friends to sail with. 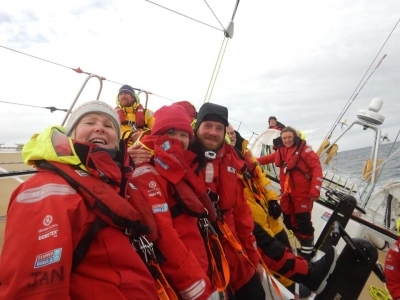 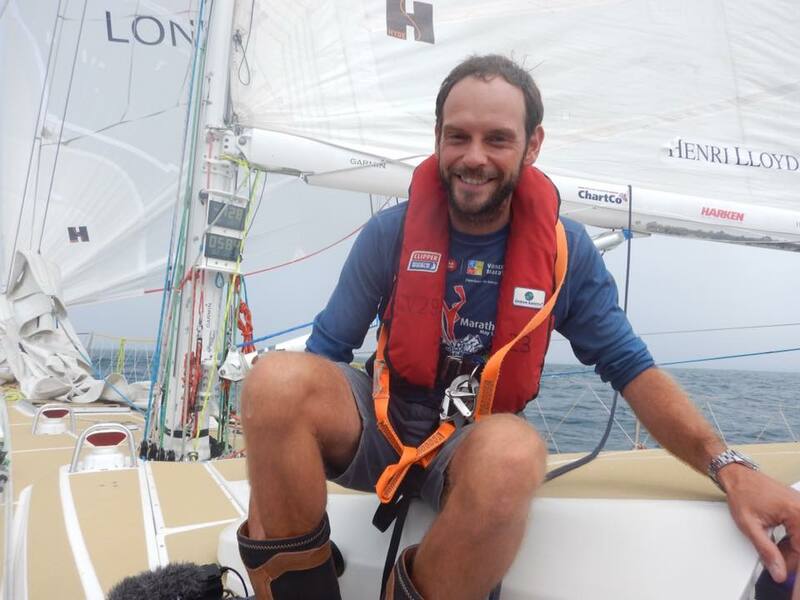 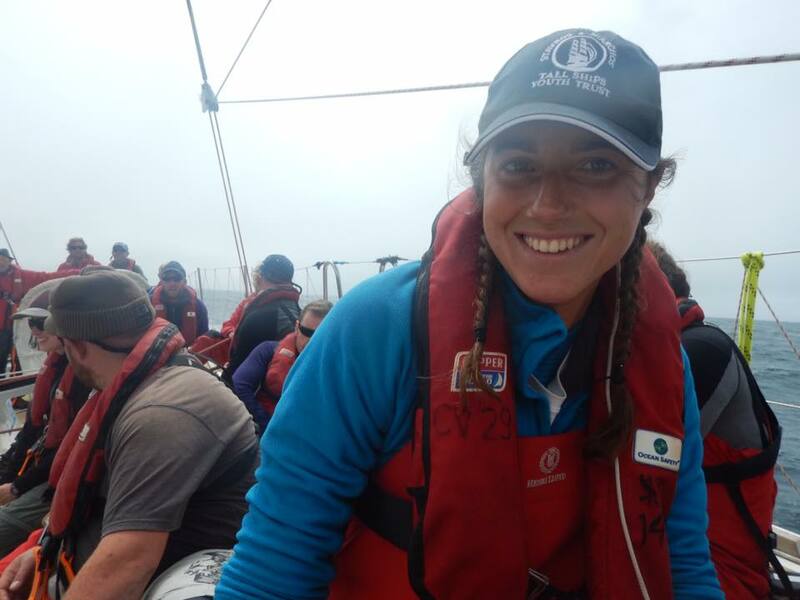 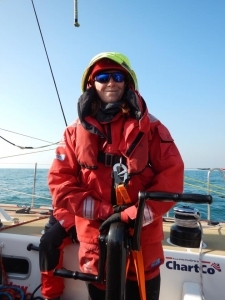 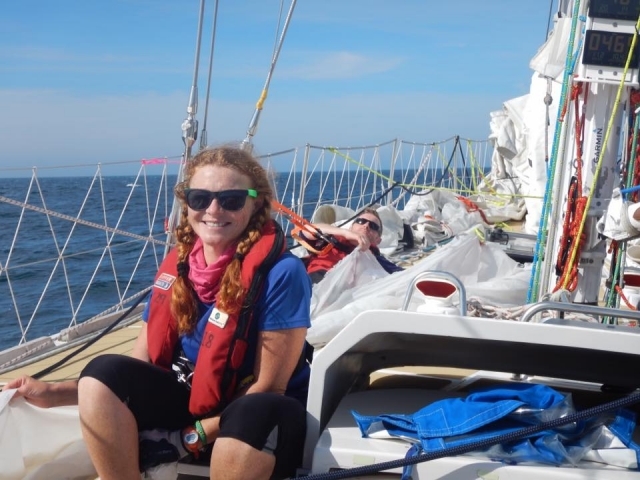 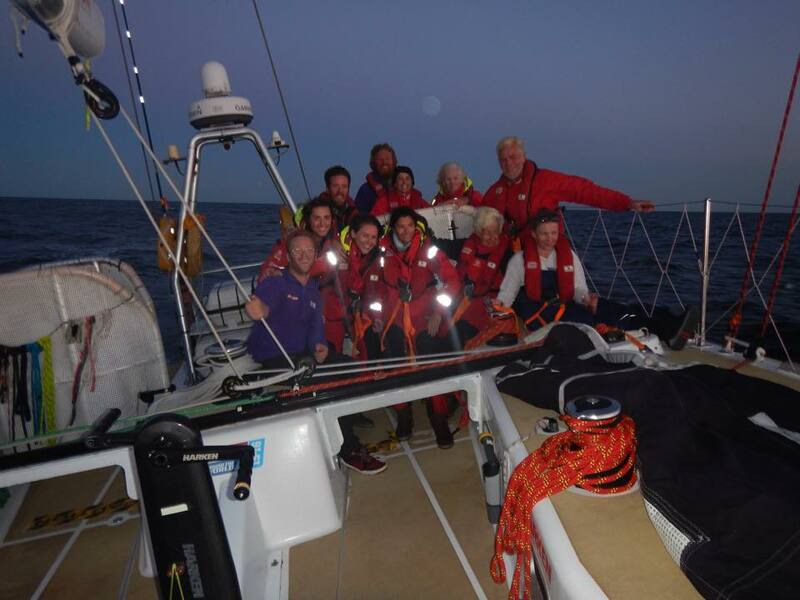 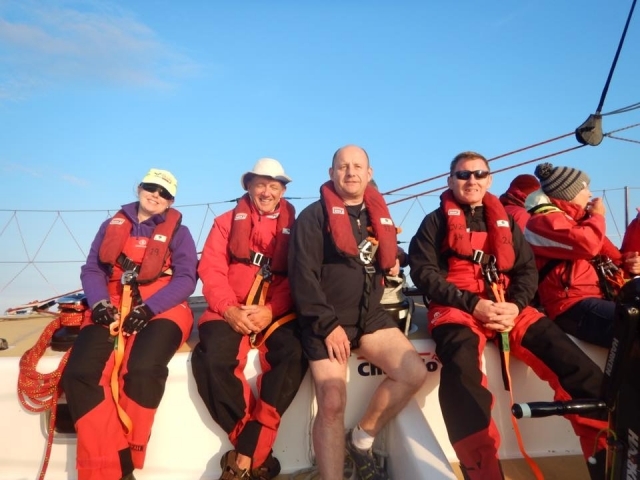 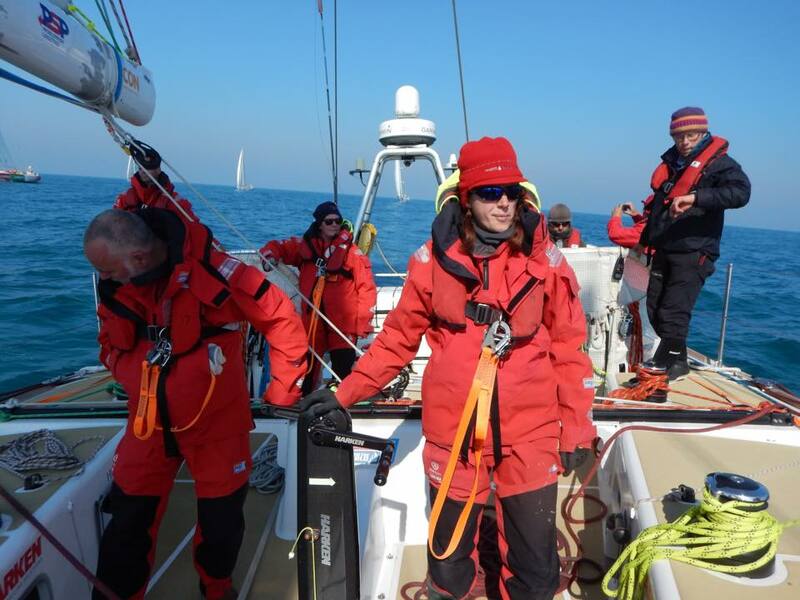 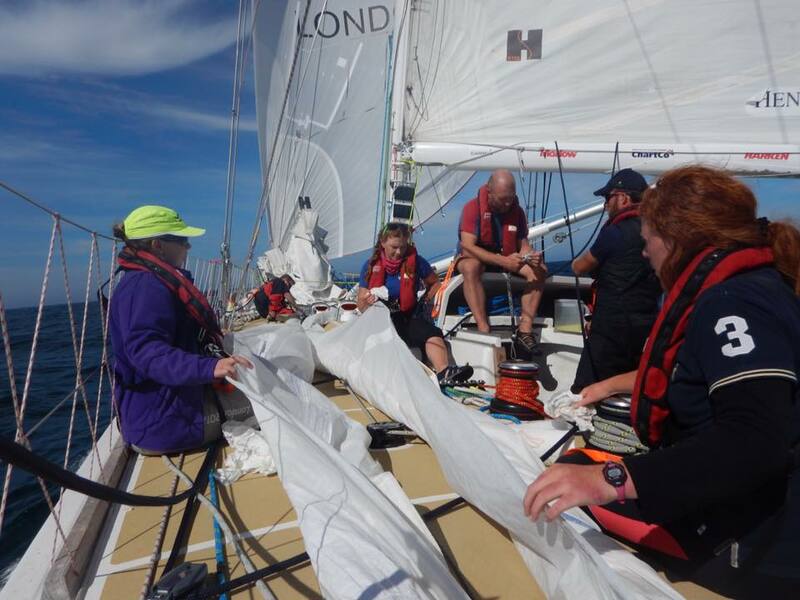 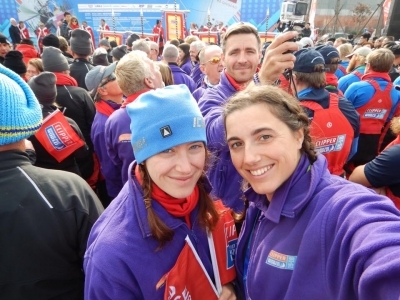 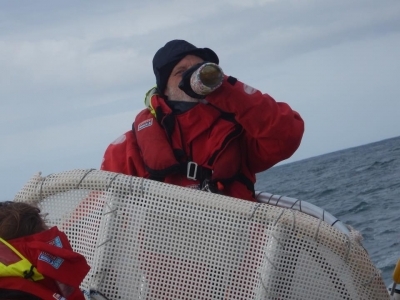 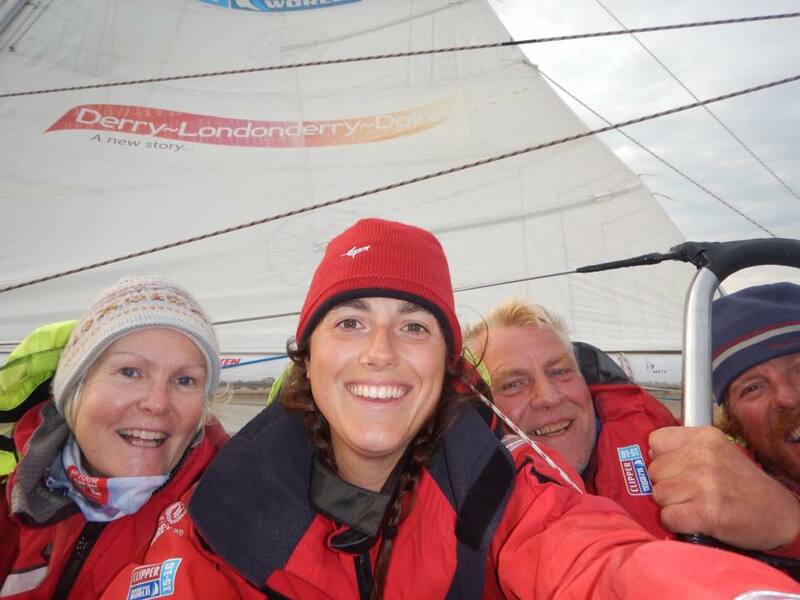 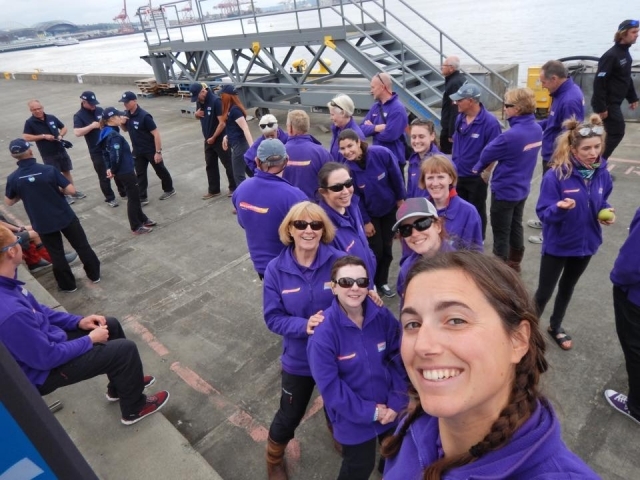 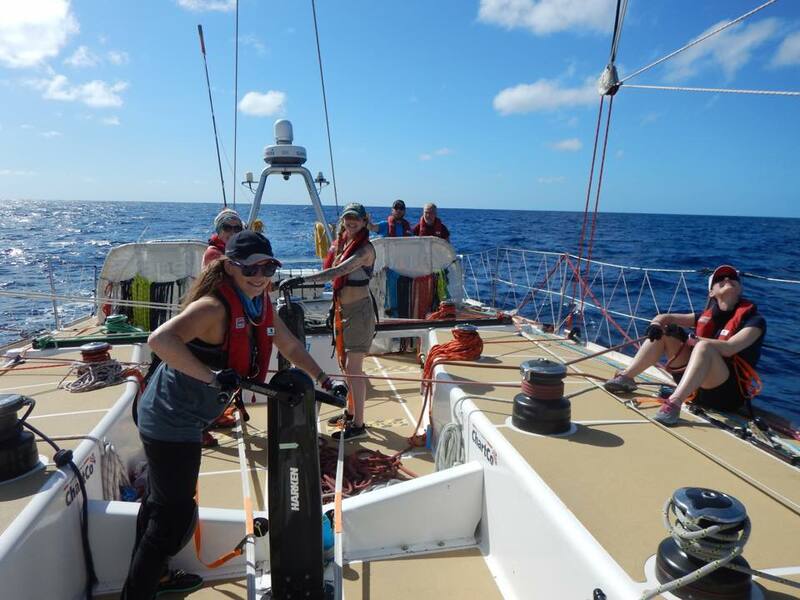 This was the toughest leg yet, not just for the sailing conditions, and I know I couldn’t have got through it without various members of our team. 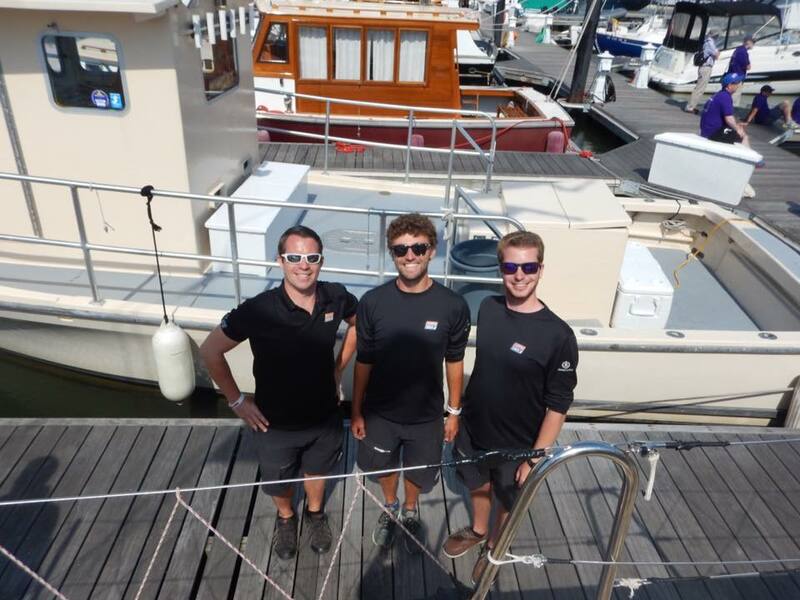 I’d like to thank them for everything and to the race team who have been so supportive of everyone since we have arrived in port too. We are losing some great leggers here too and I will miss them on the next race. 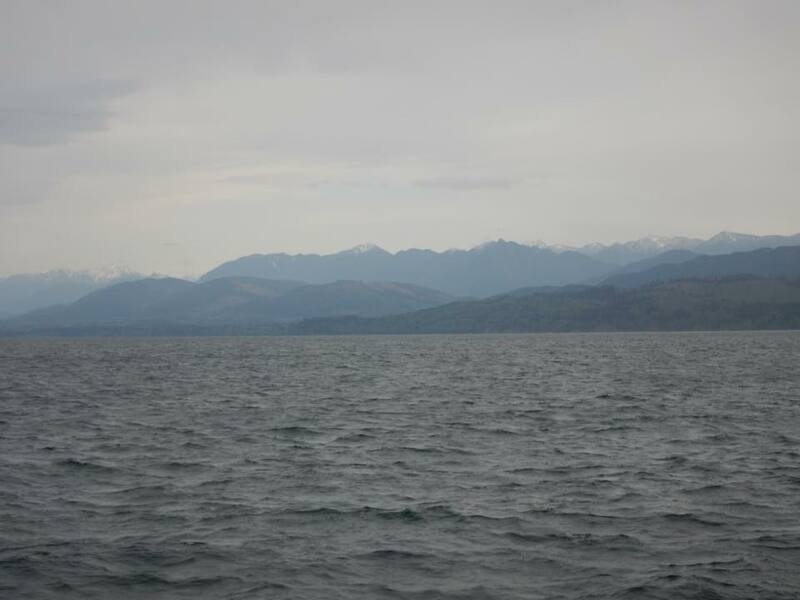 We may be nearing home, but it still feels worlds away. I don’t want to wish this adventure away but I can’t wait to have real hugs from my family and friends as sadly virtual ones aren’t quite the same. 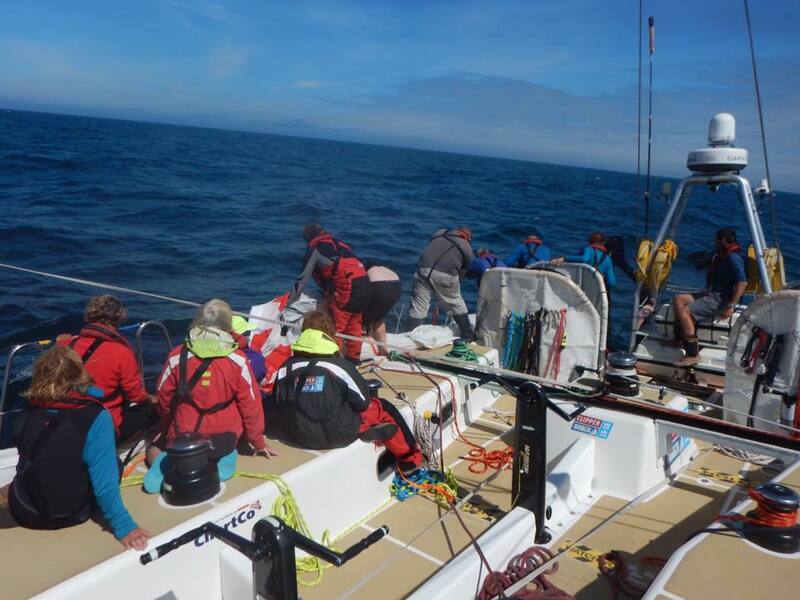 I can’t believe I’ve done the Pacific and 6 of 8 legs of this race. I am digging deep, putting the smile on and am ready to get through this no matter what. It’s tough physically, mentally and emotionally and the further we go the more shattered I’m becoming. 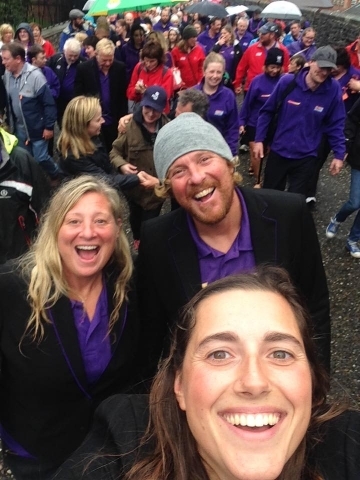 Thanks for all the positive messages from home, they mean a lot and I’m lucky to have such a support team around me and I know how tough this leg has been for you all back home too. 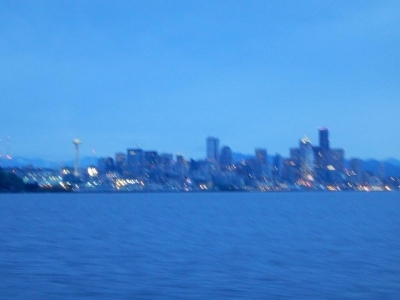 Right, now to go and explore Seattle and eat my body weight in pizza, coffee and ice cream!